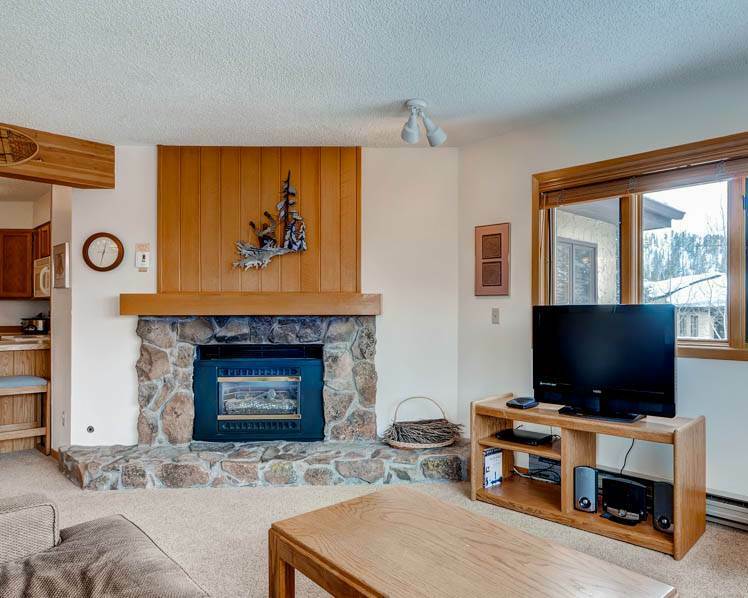 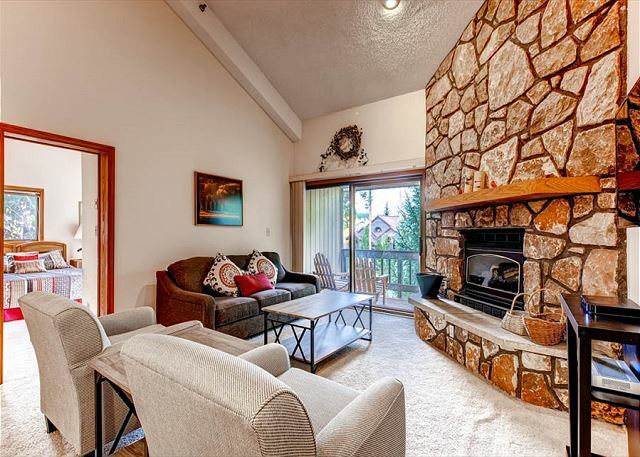 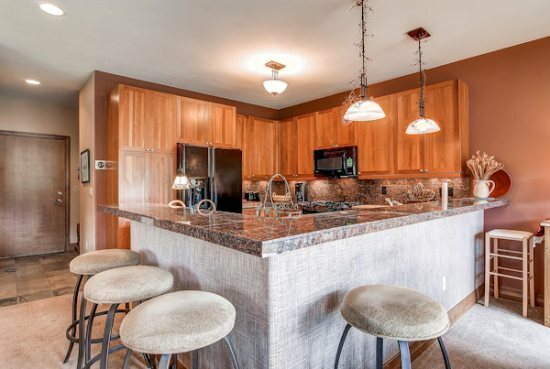 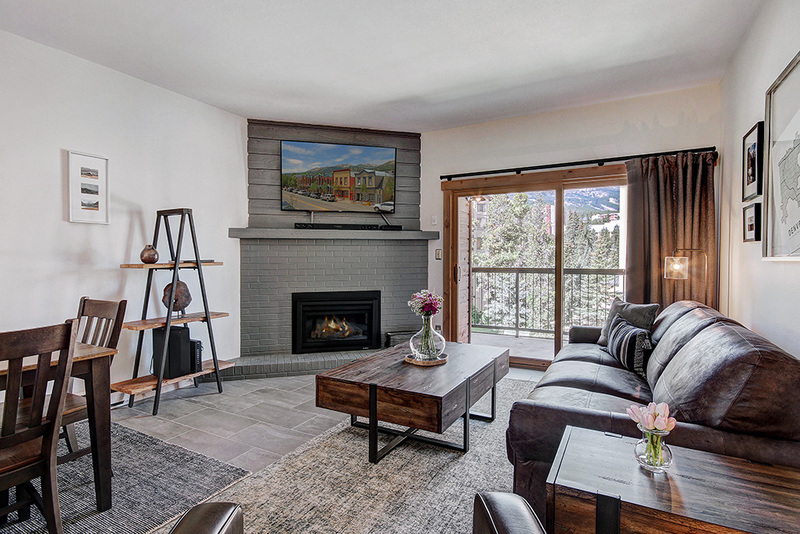 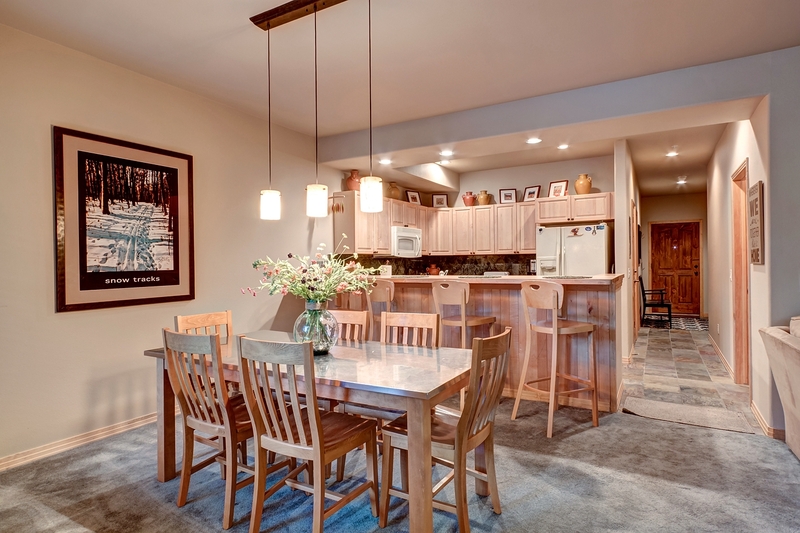 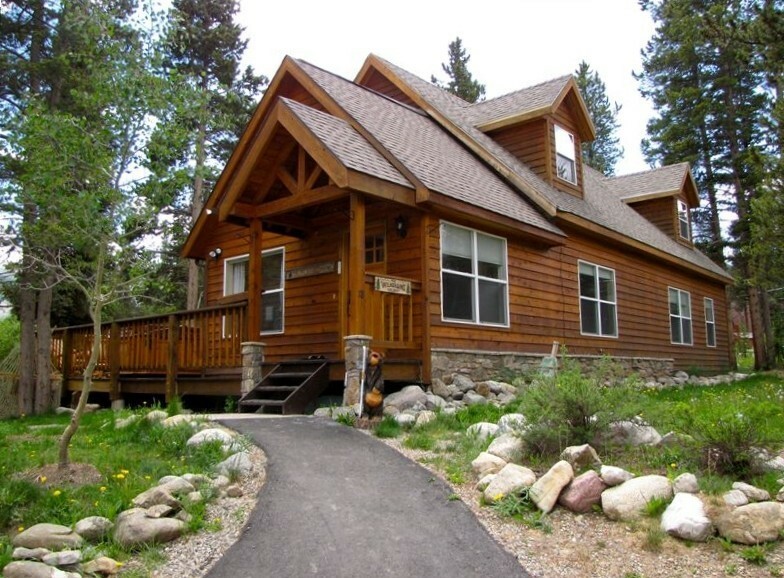 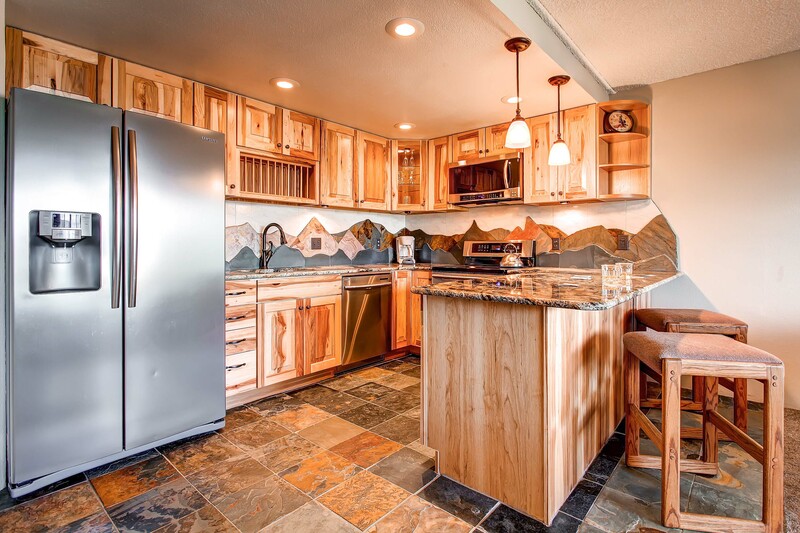 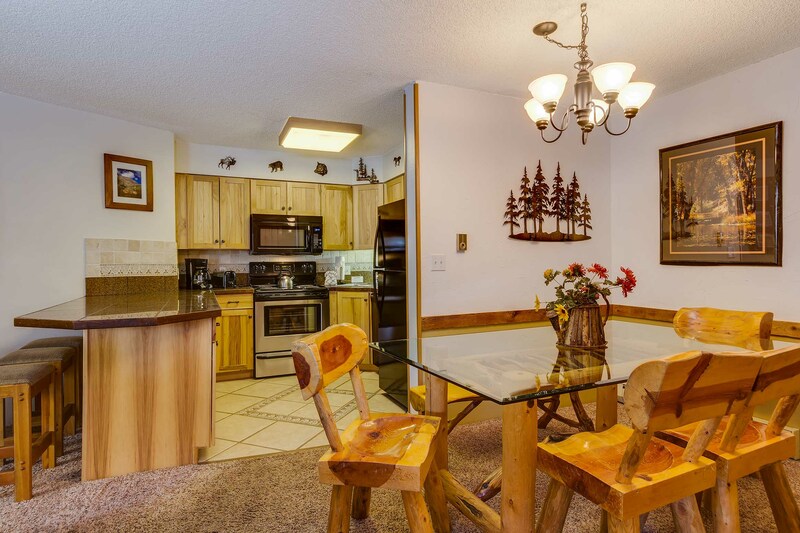 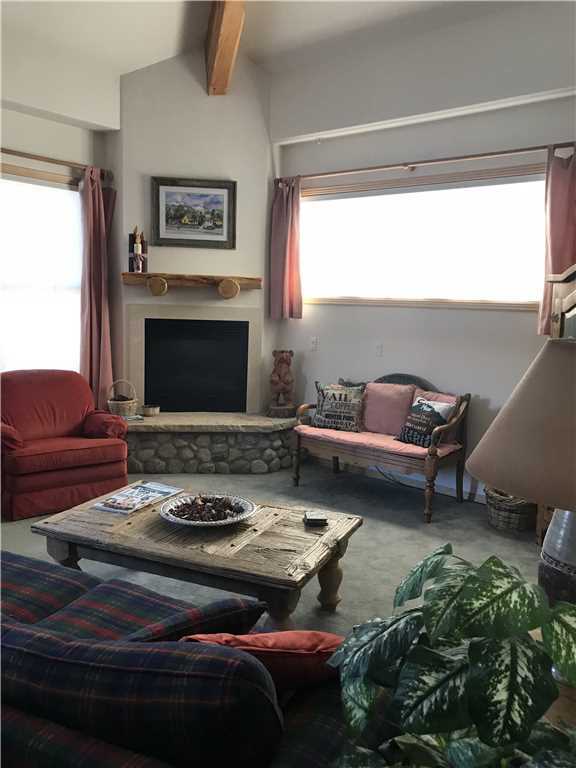 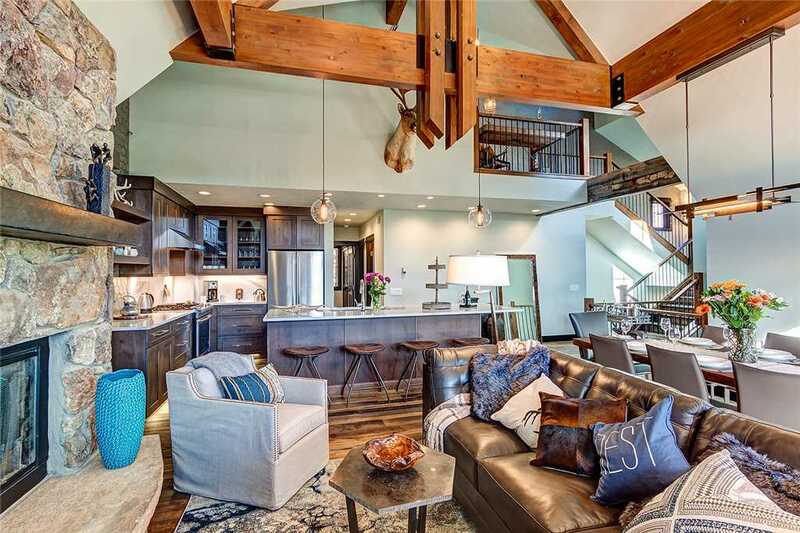 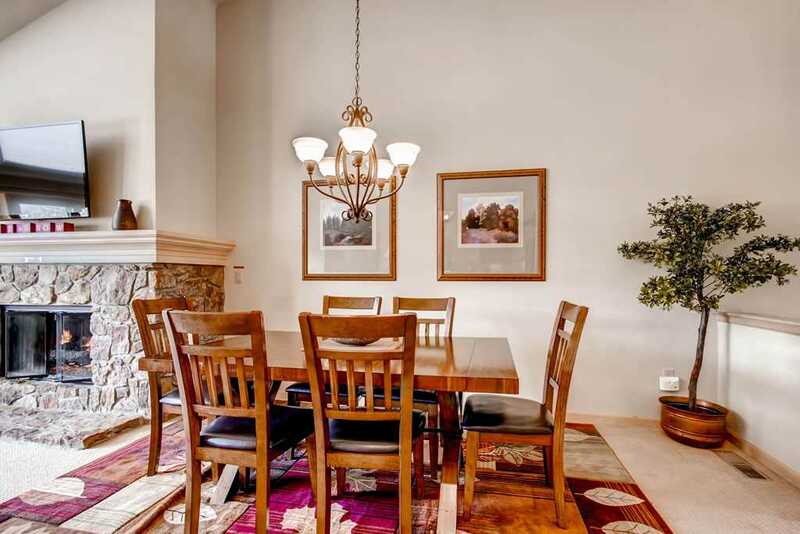 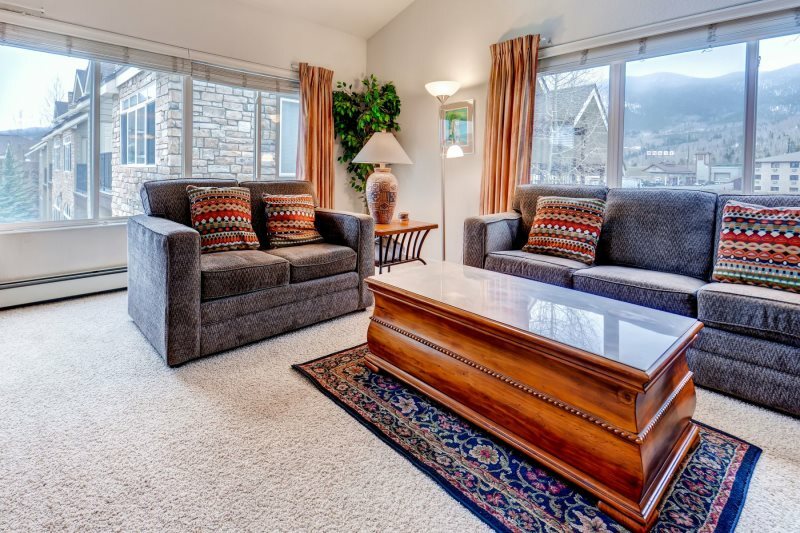 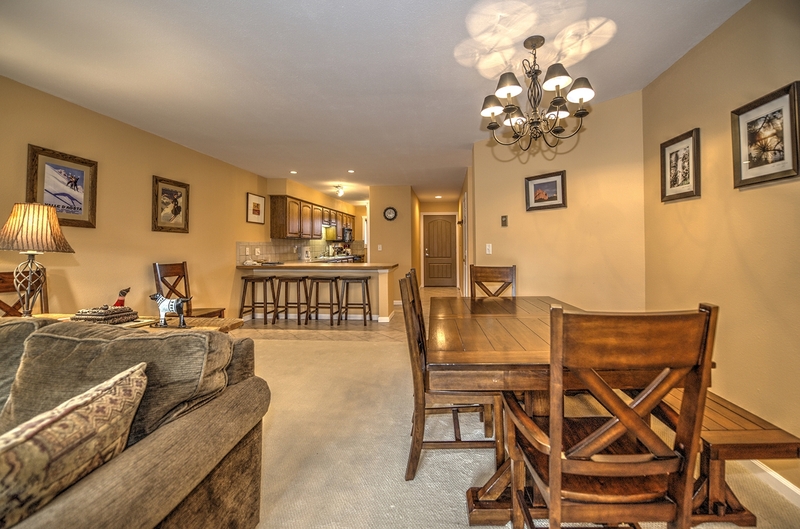 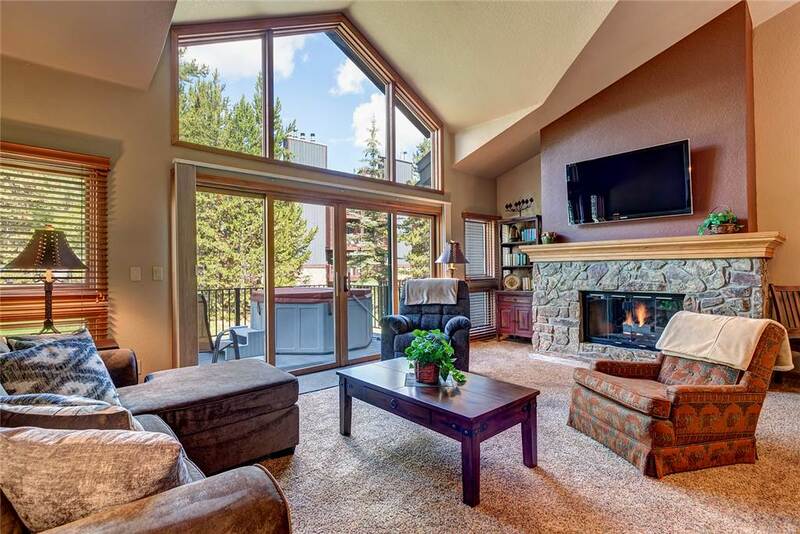 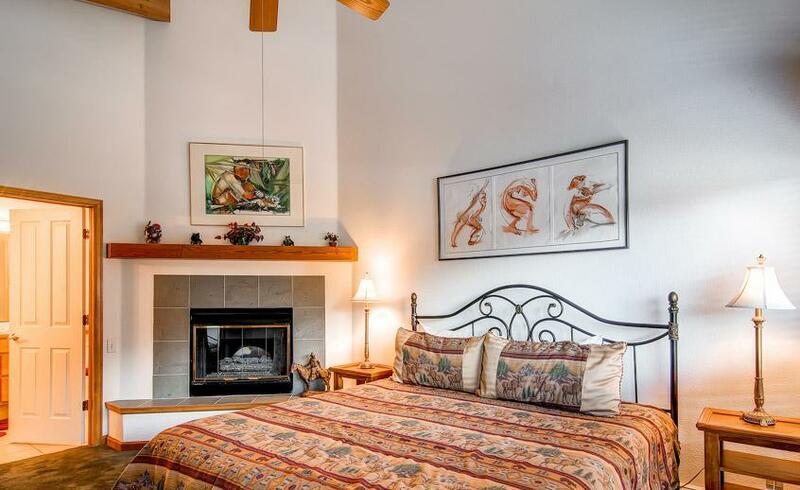 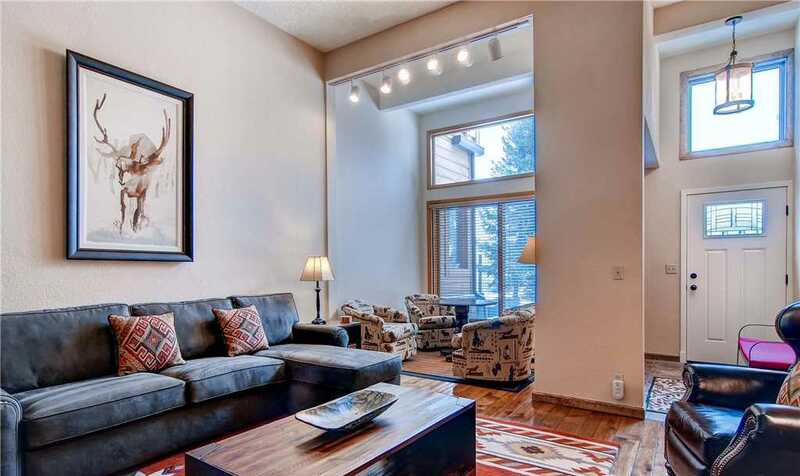 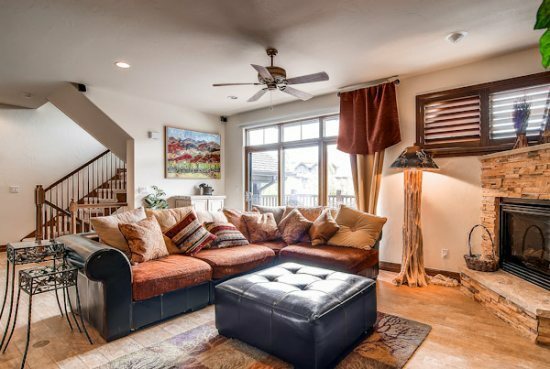 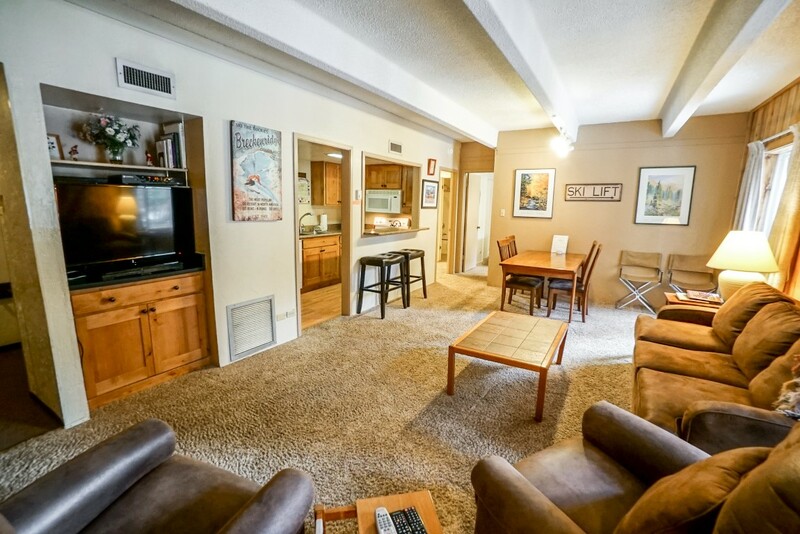 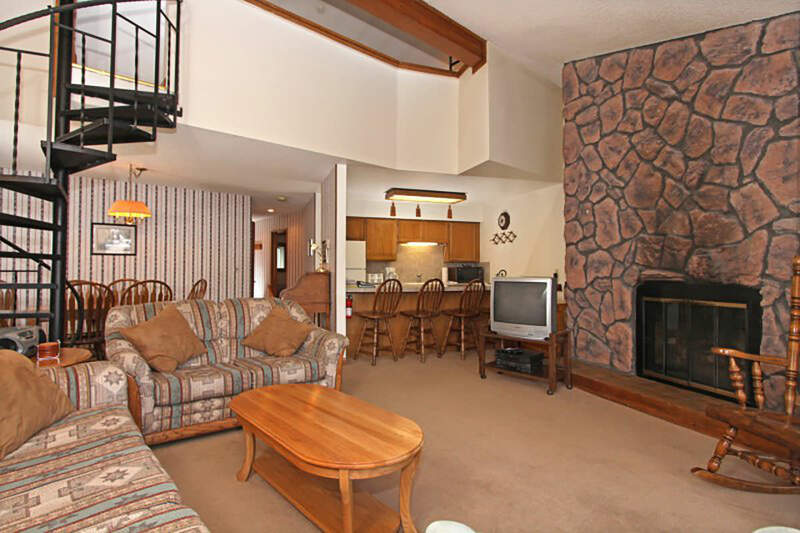 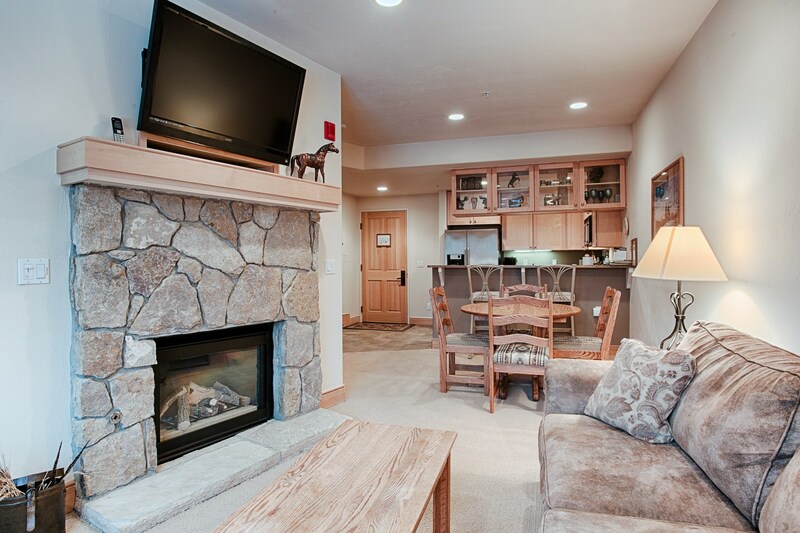 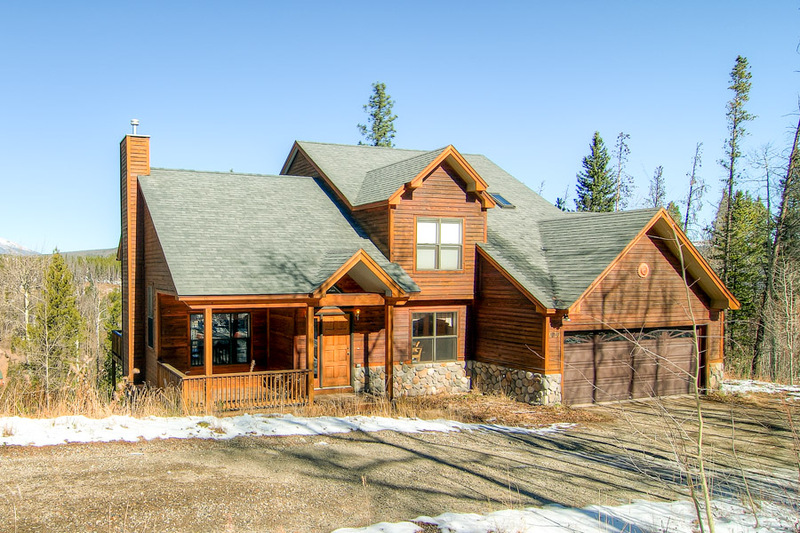 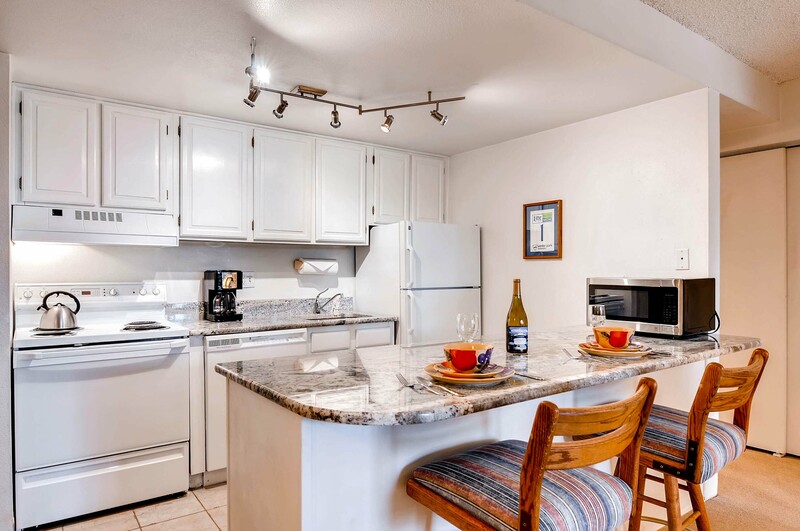 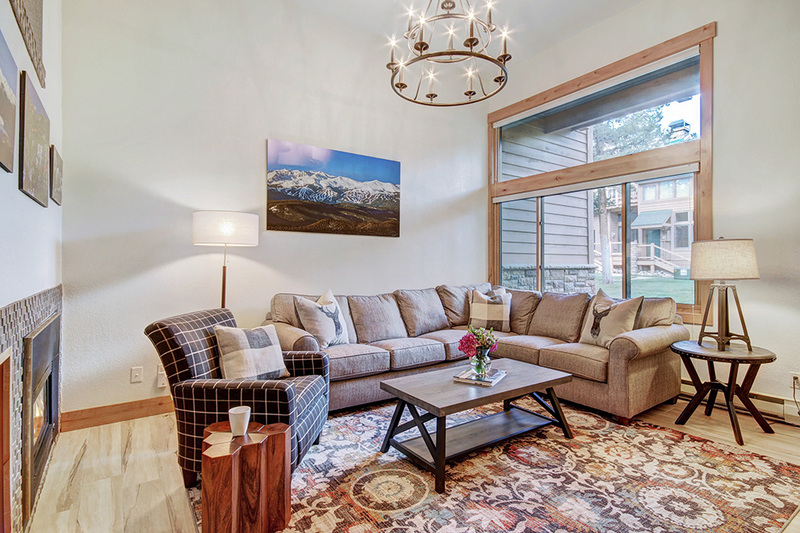 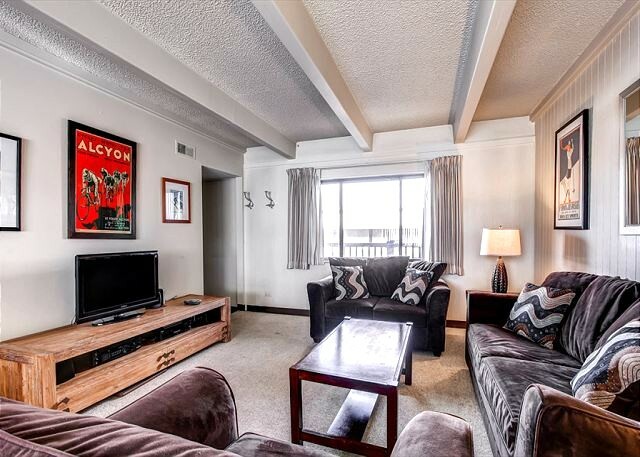 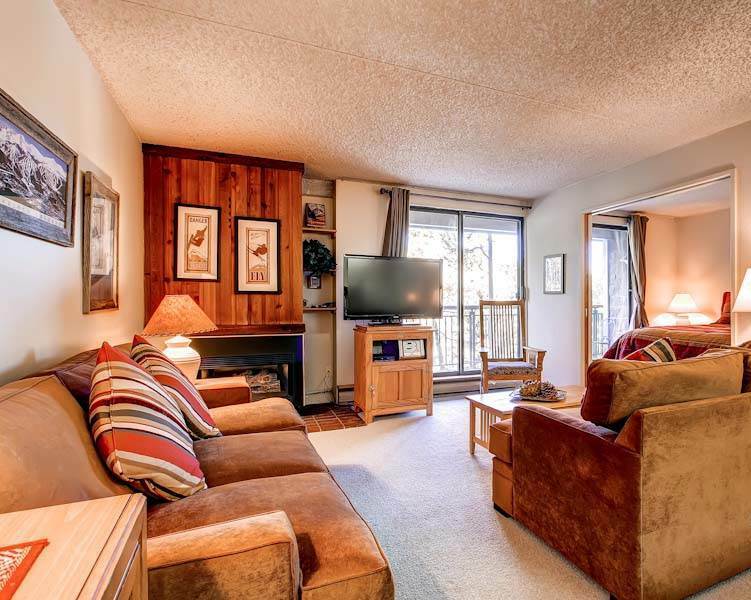 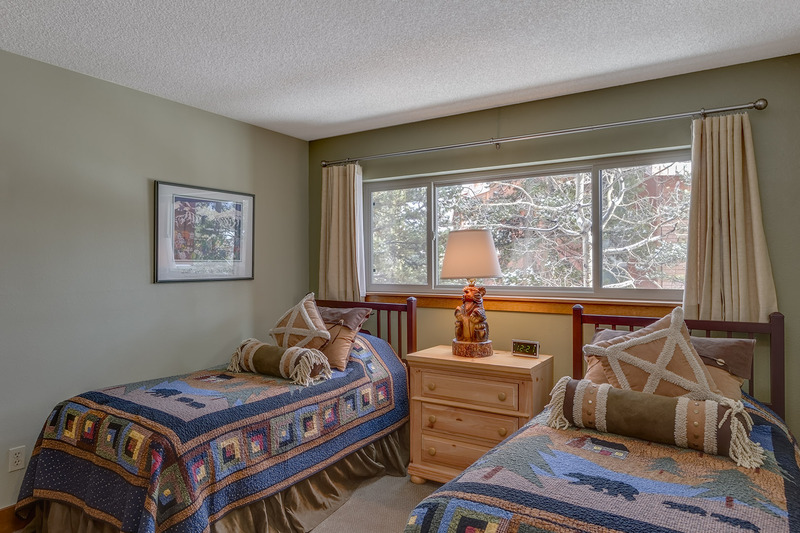 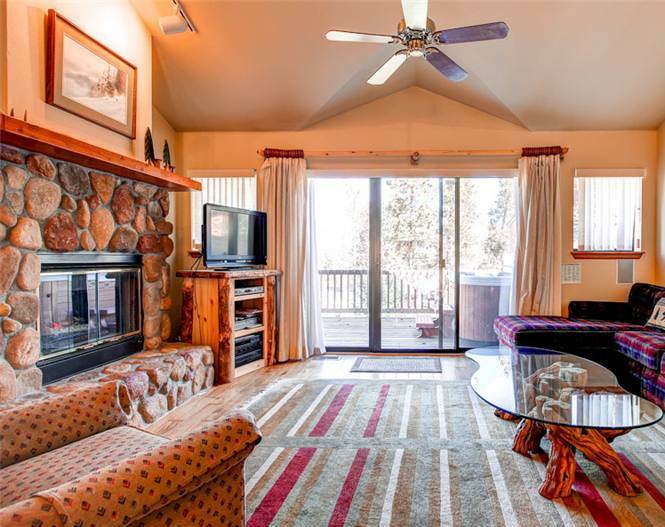 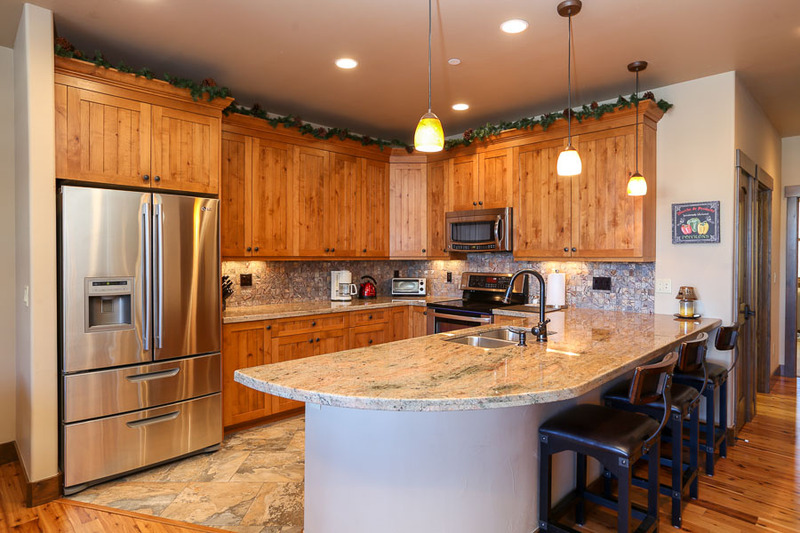 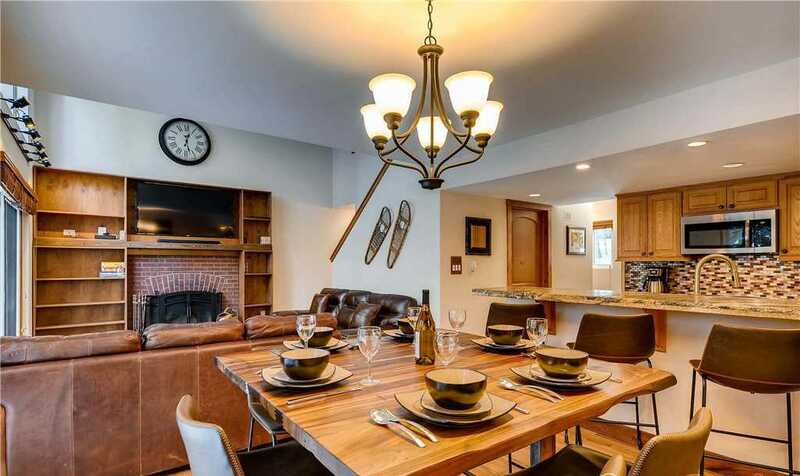 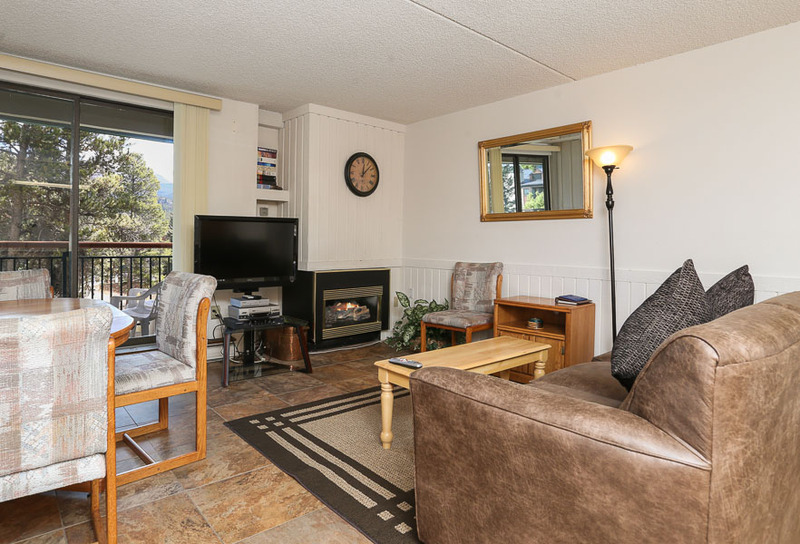 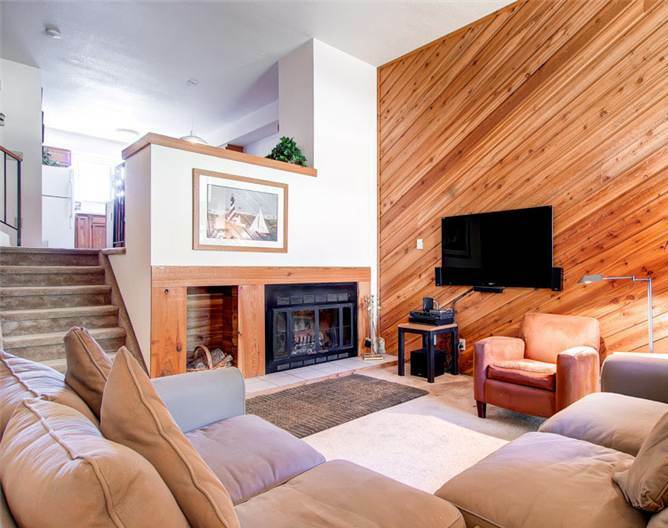 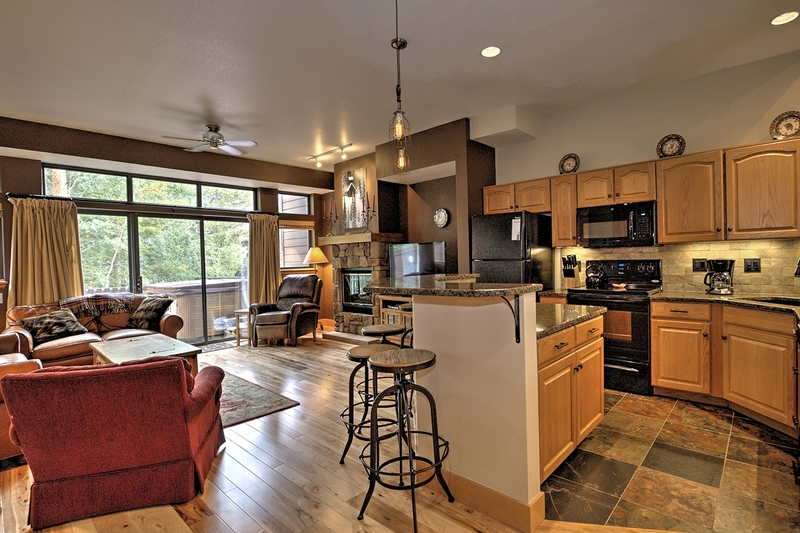 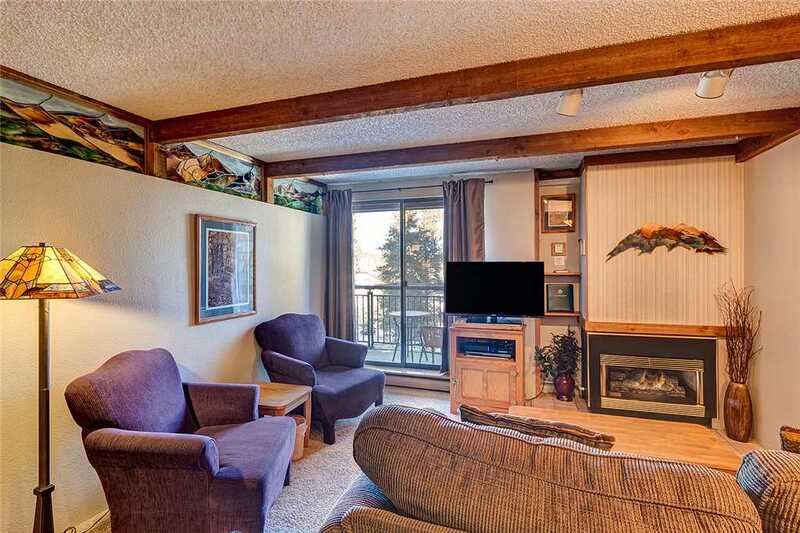 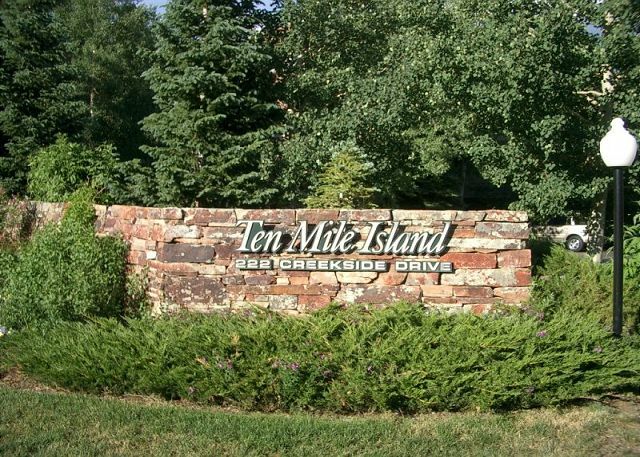 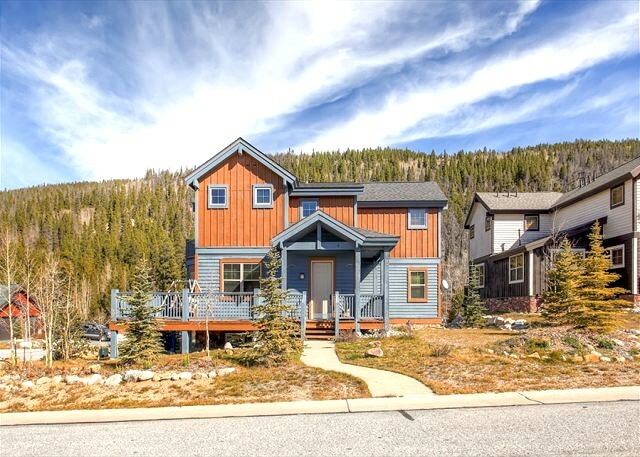 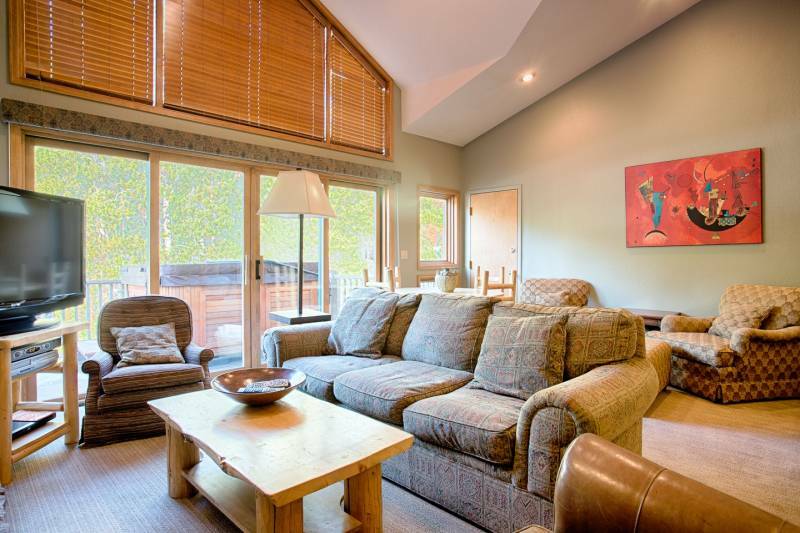 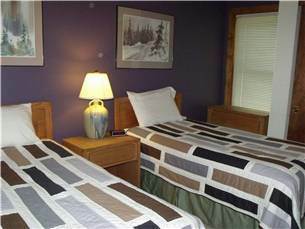 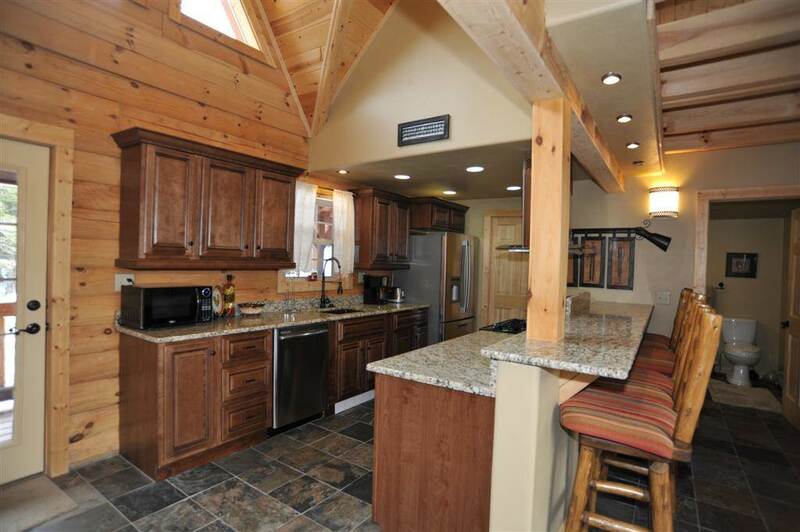 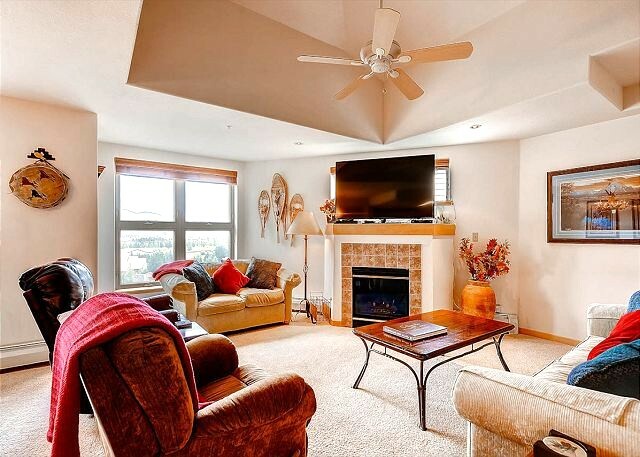 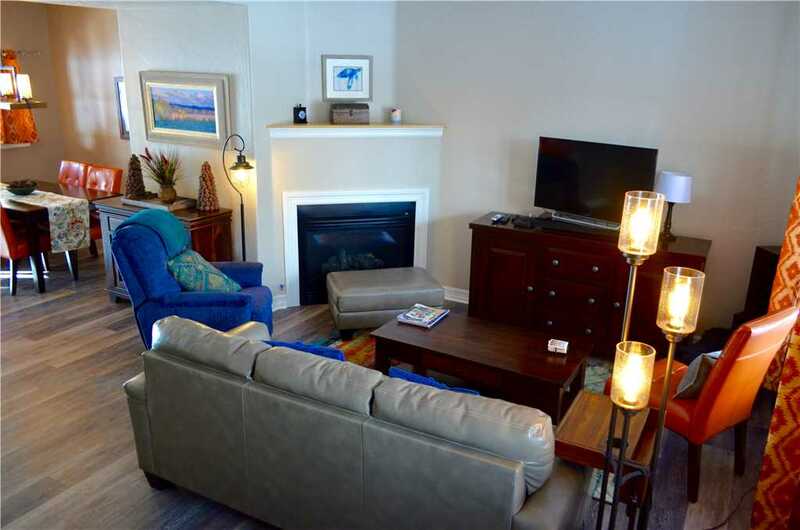 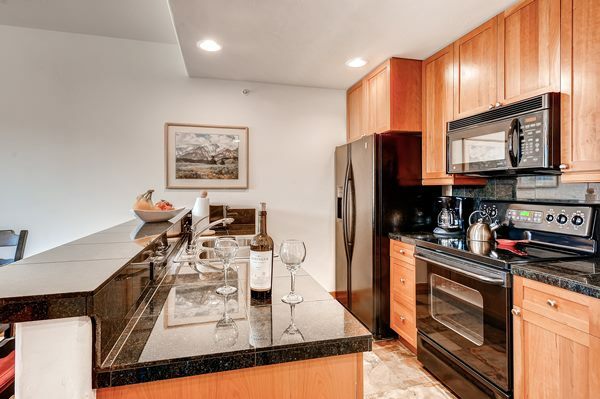 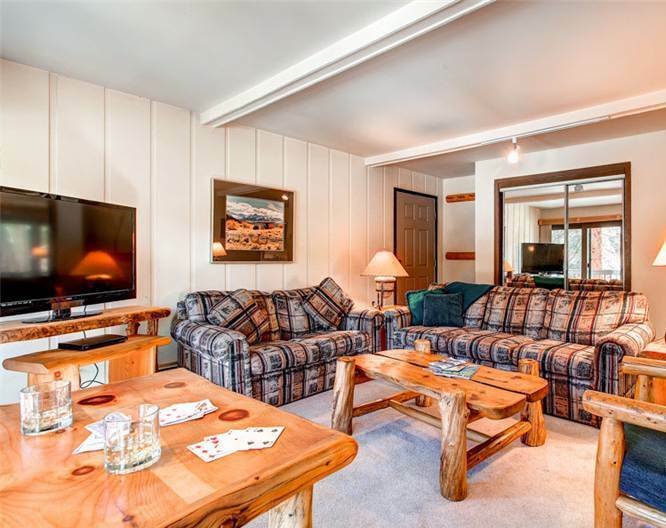 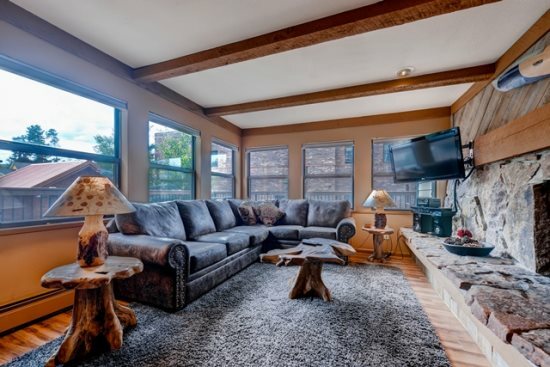 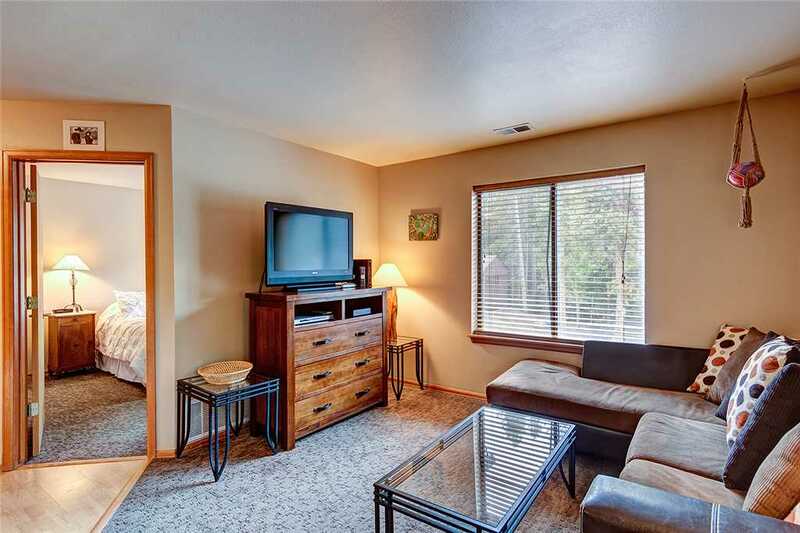 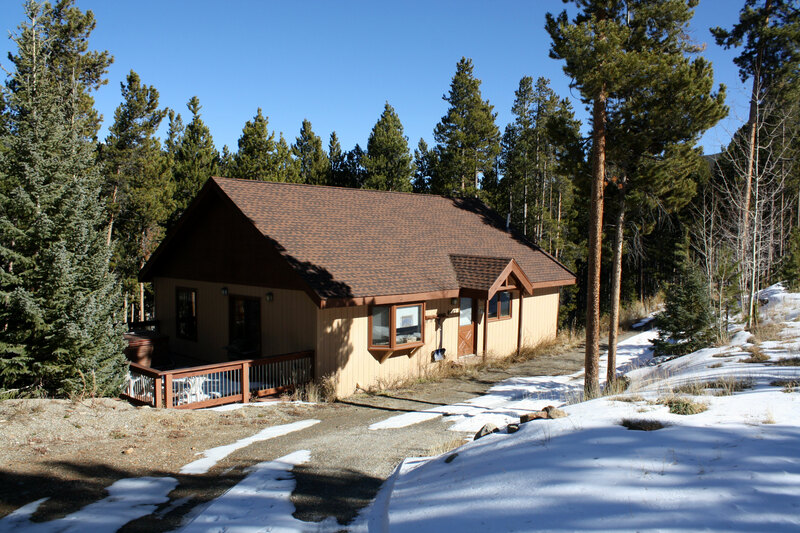 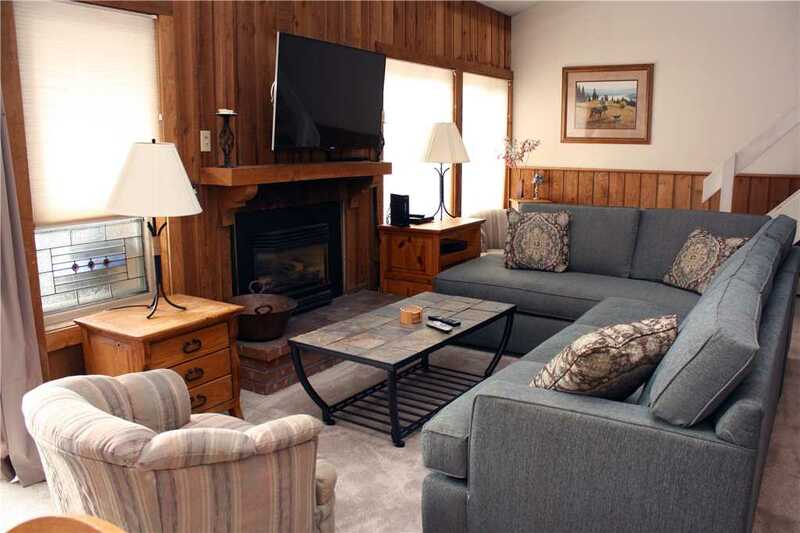 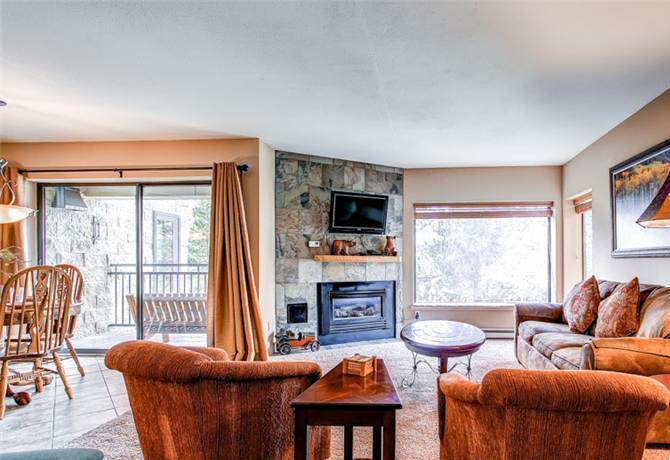 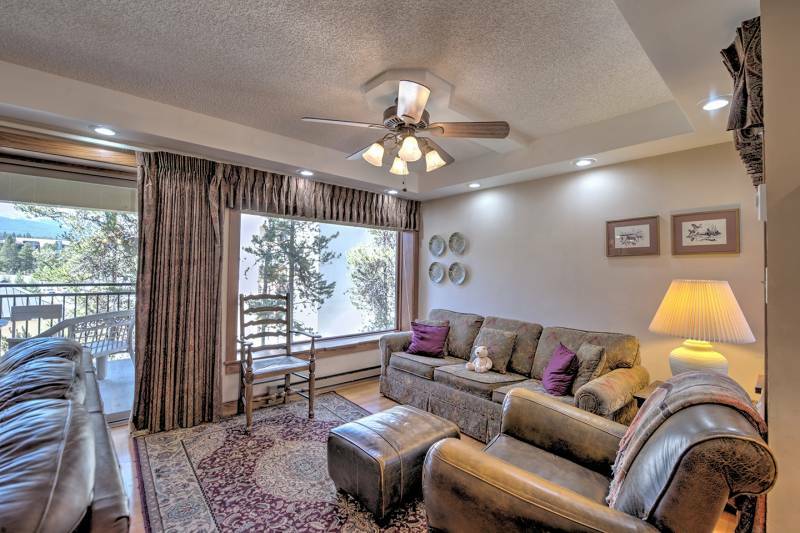 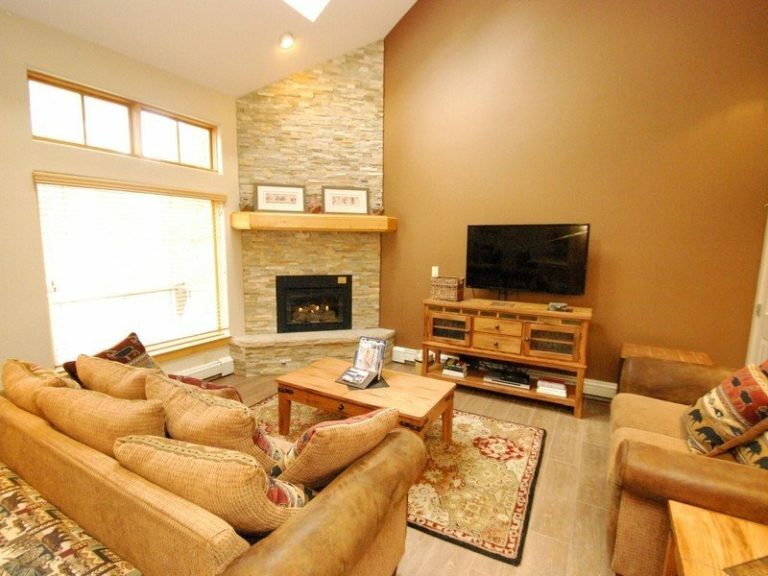 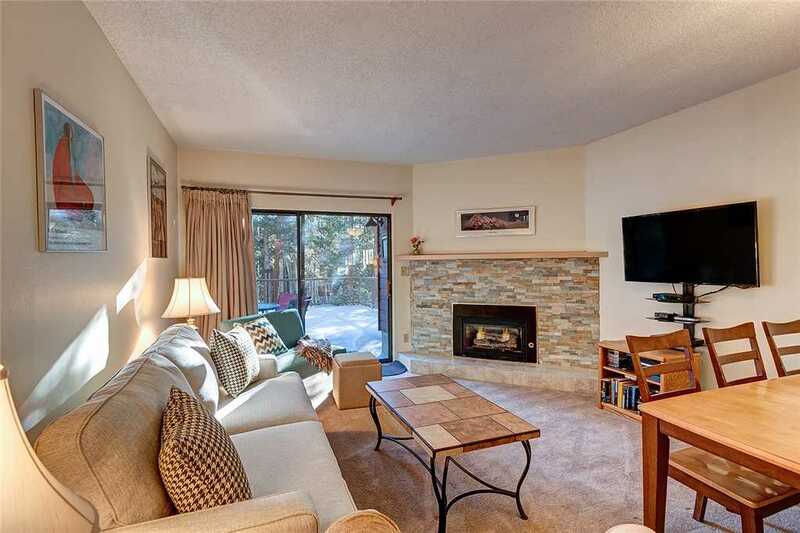 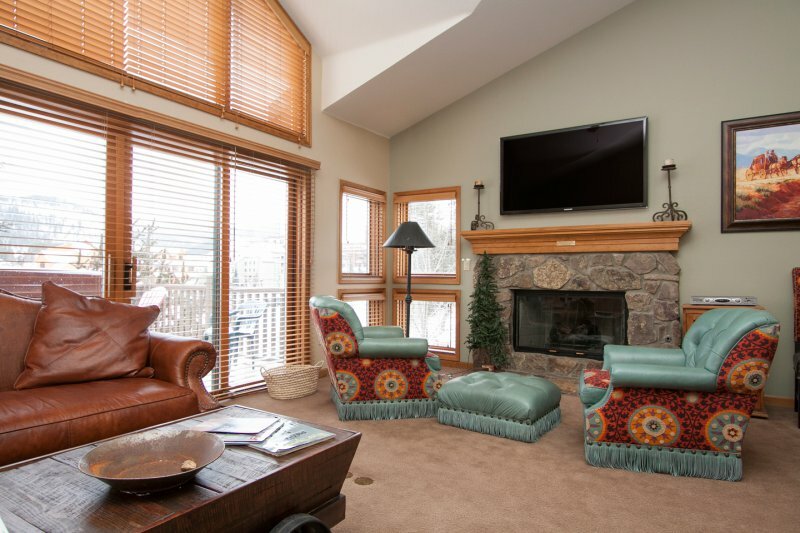 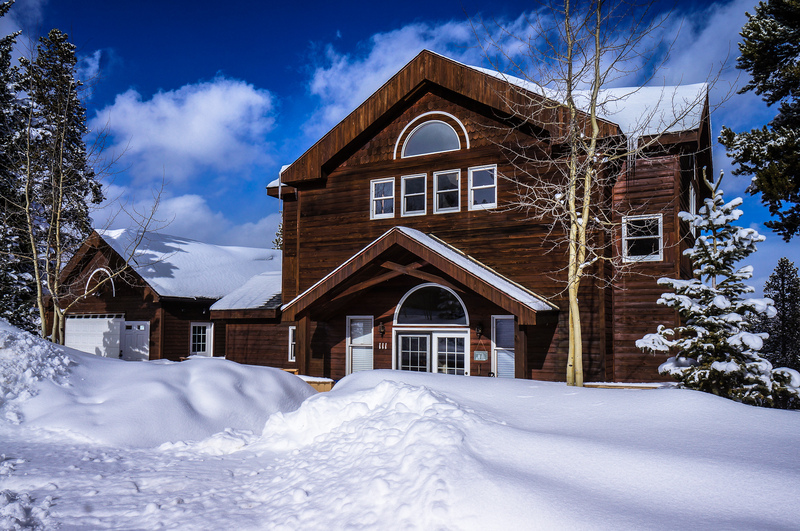 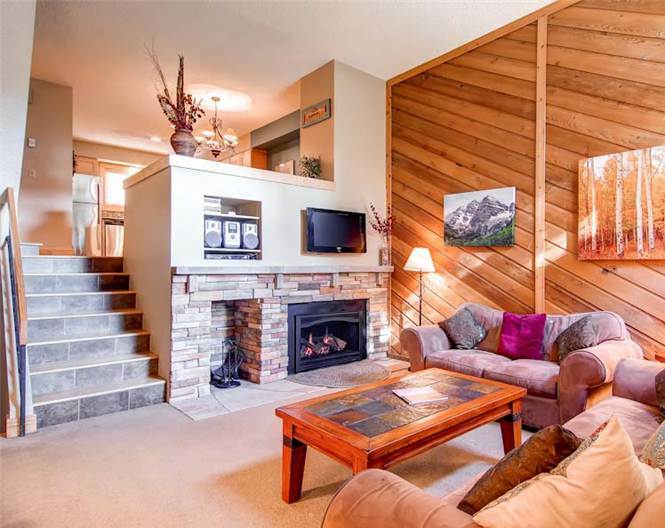 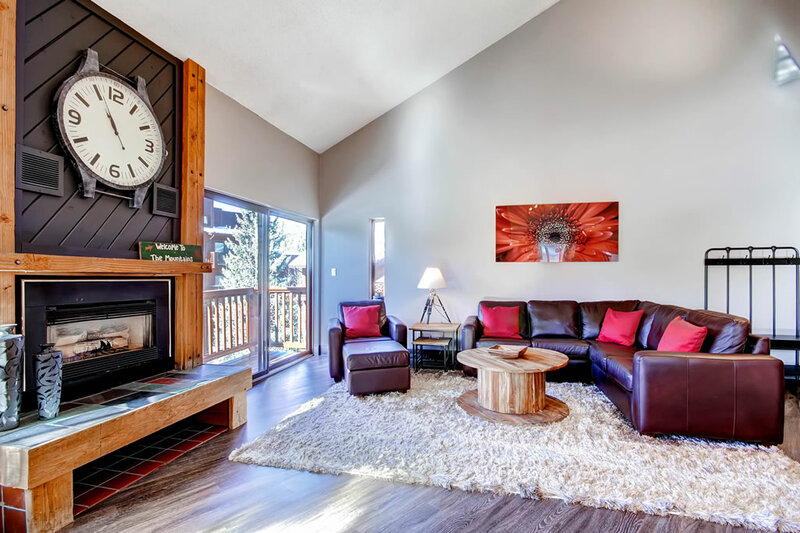 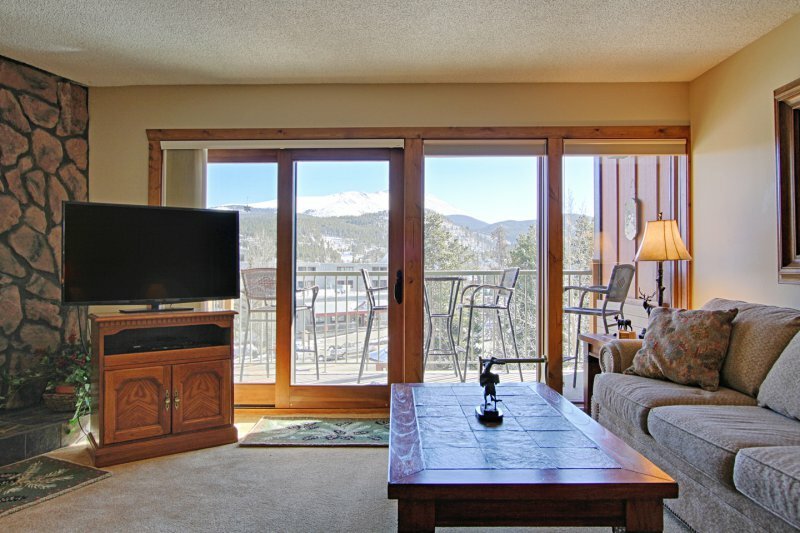 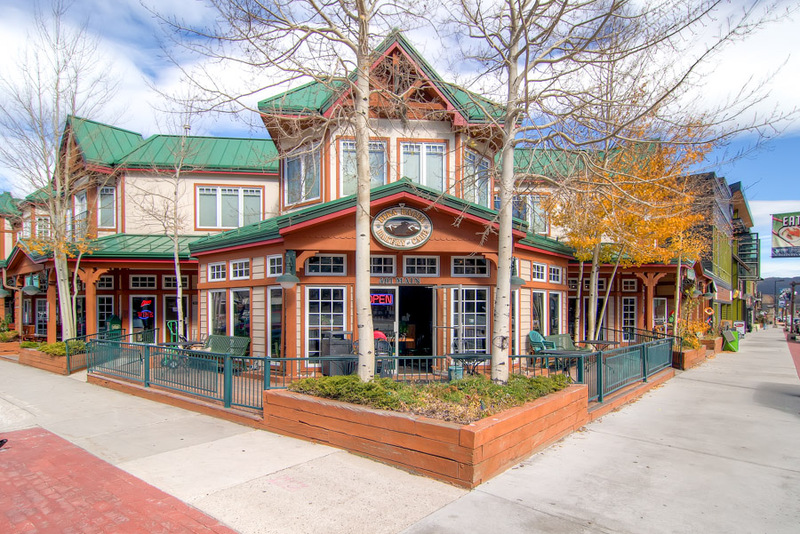 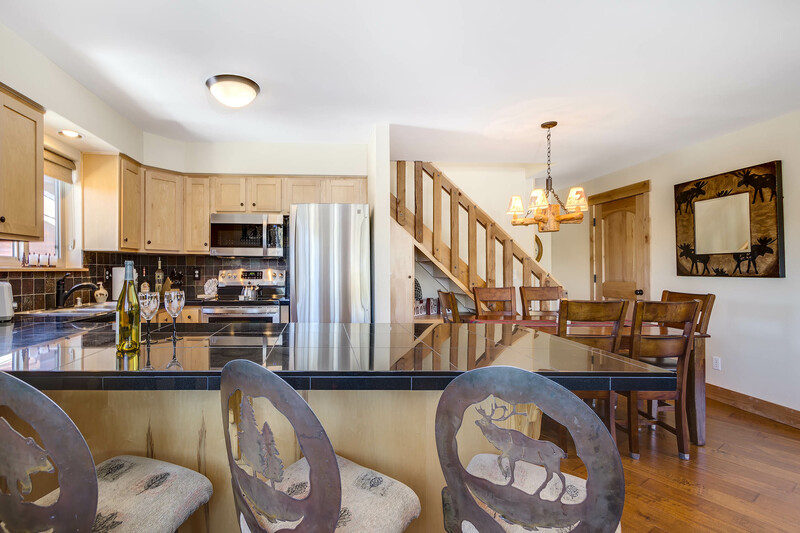 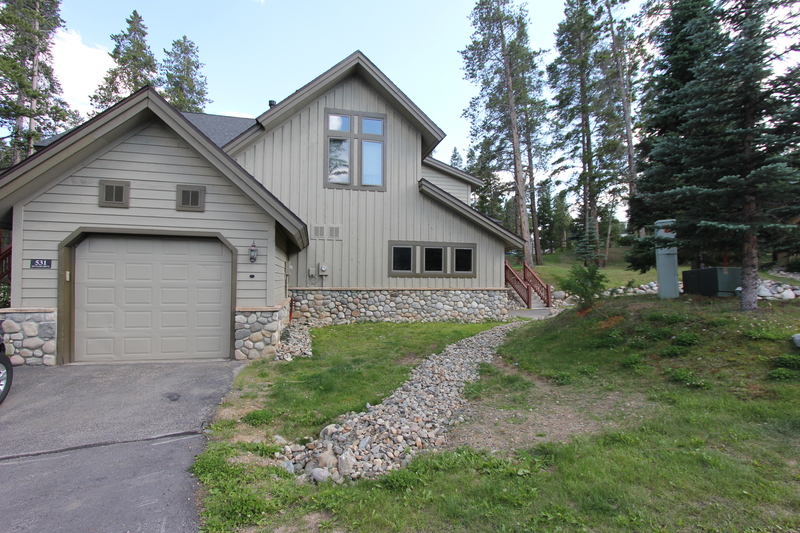 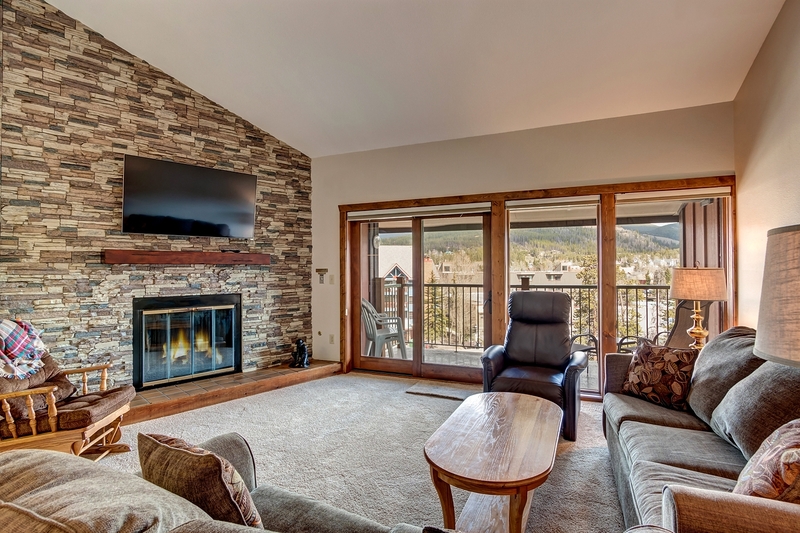 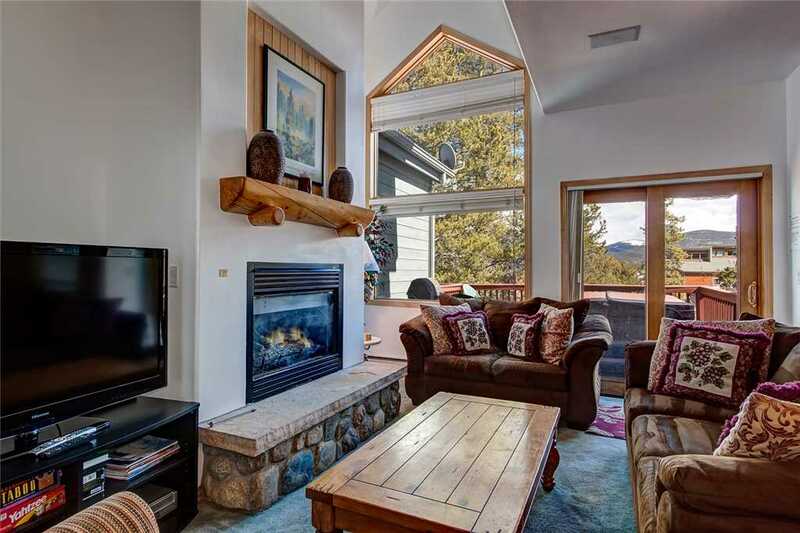 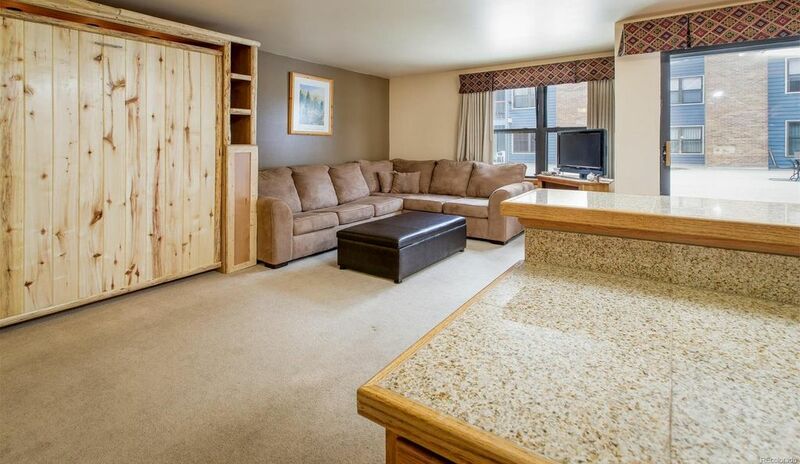 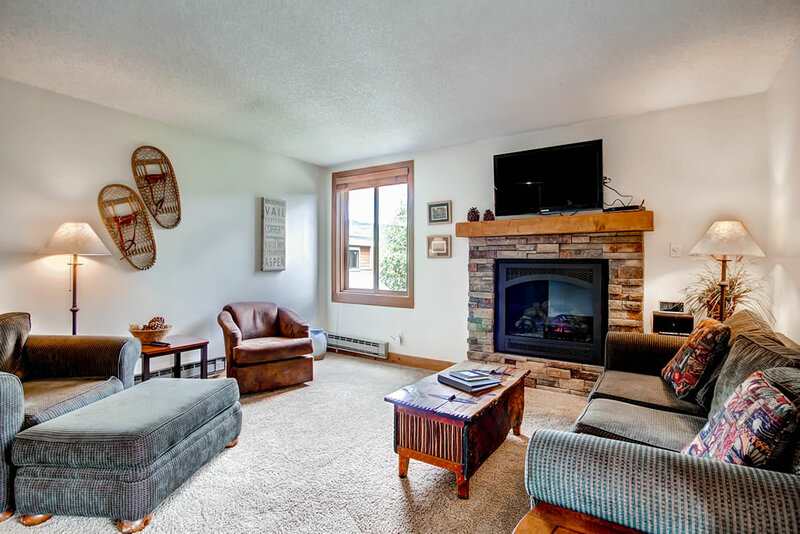 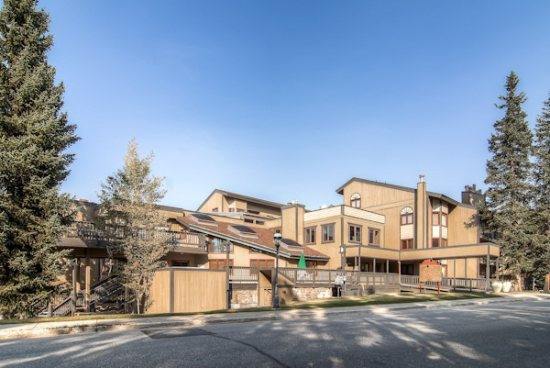 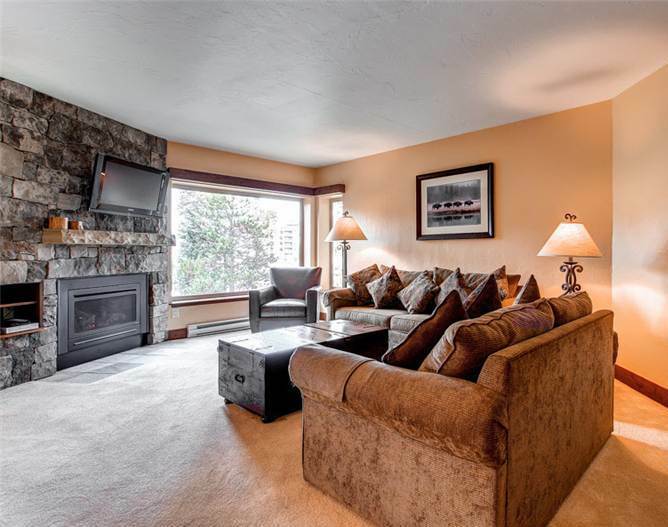 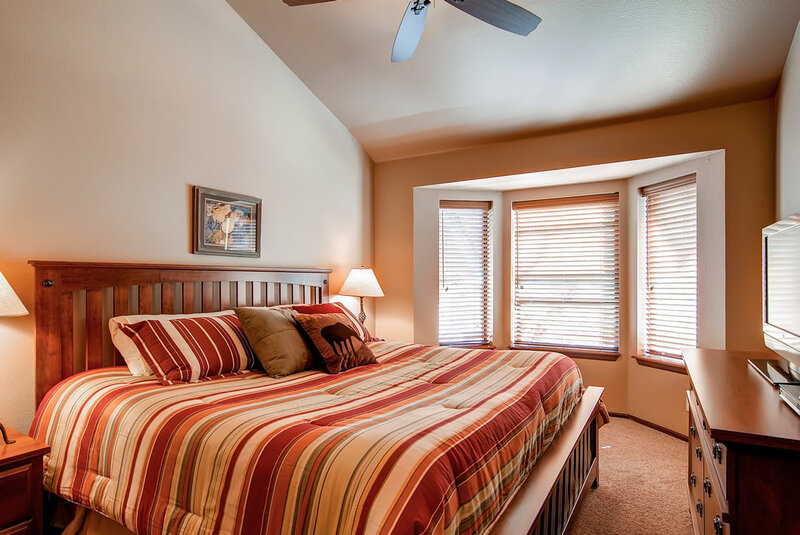 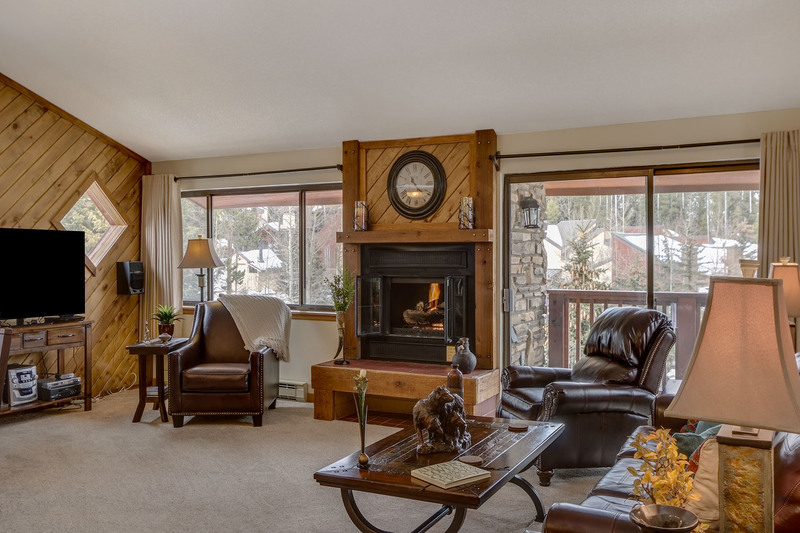 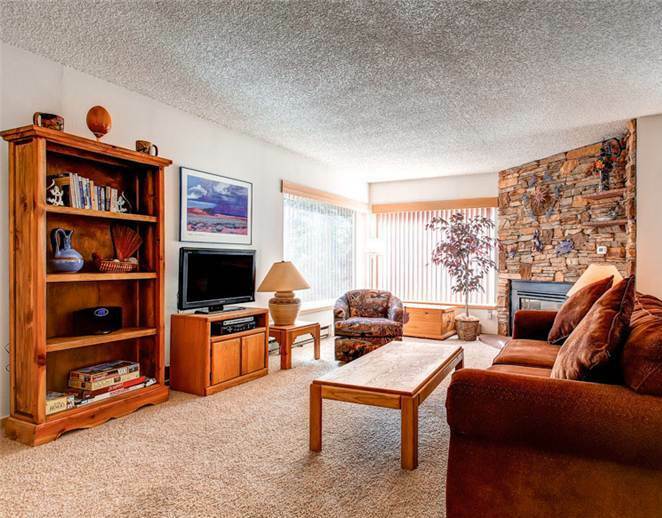 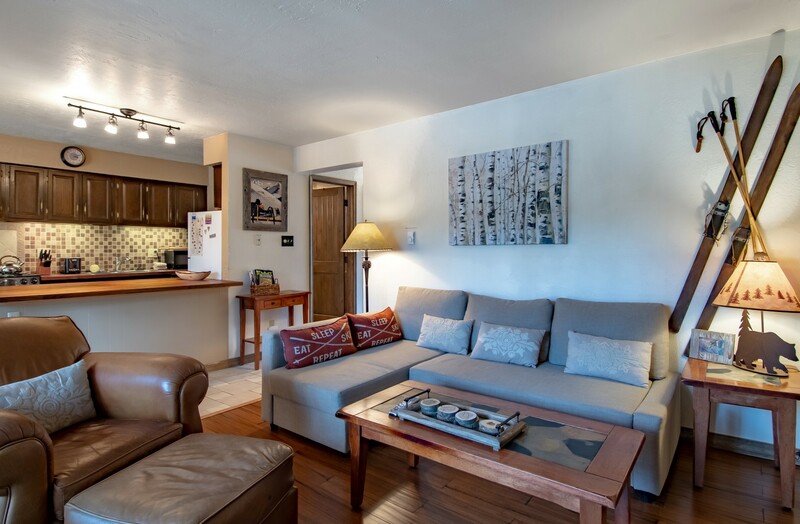 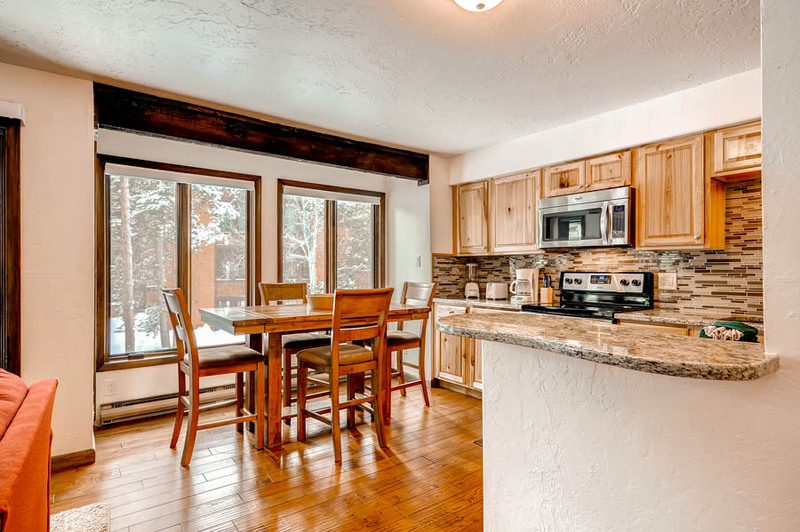 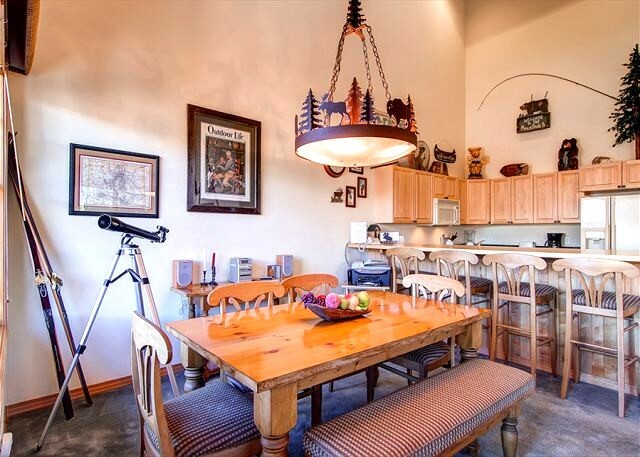 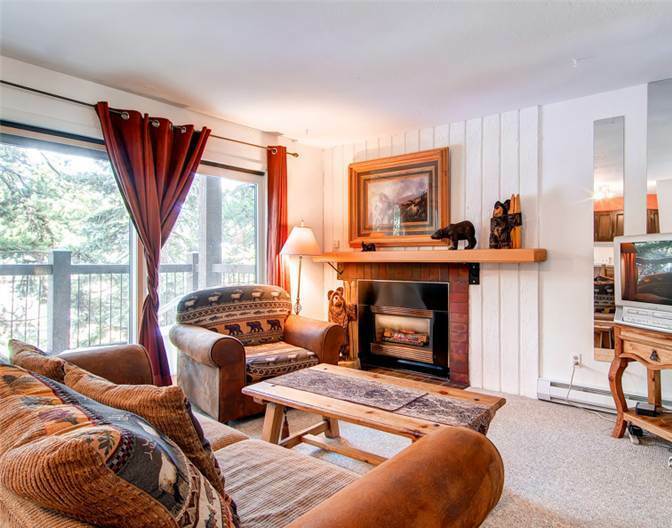 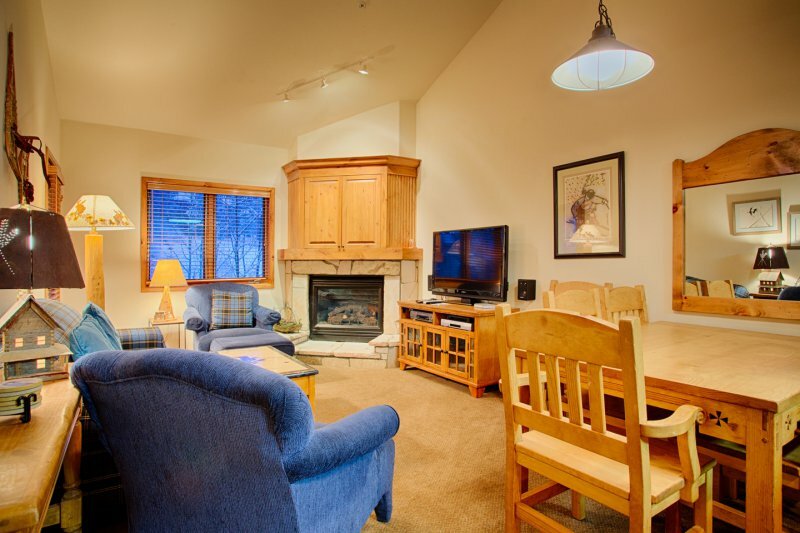 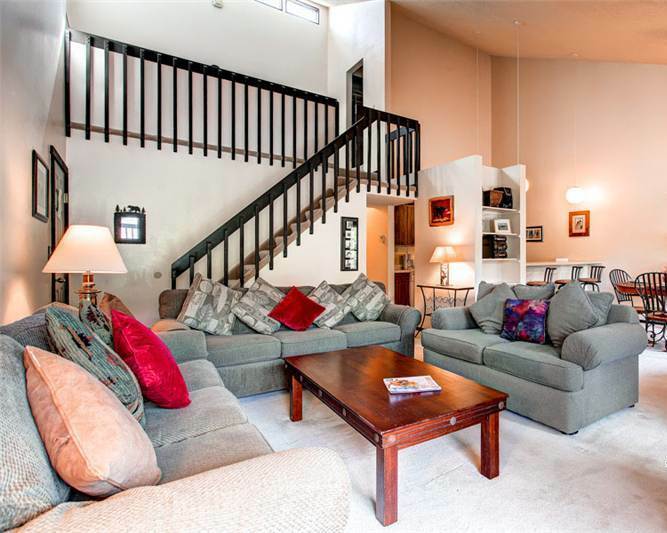 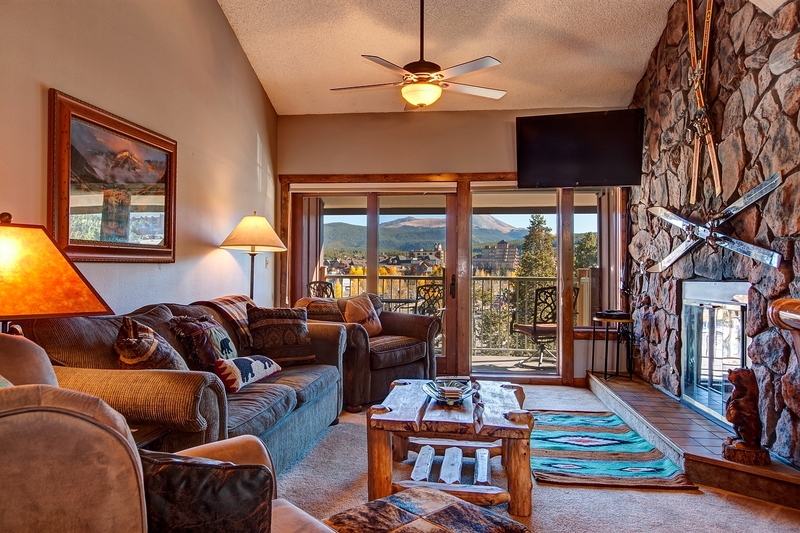 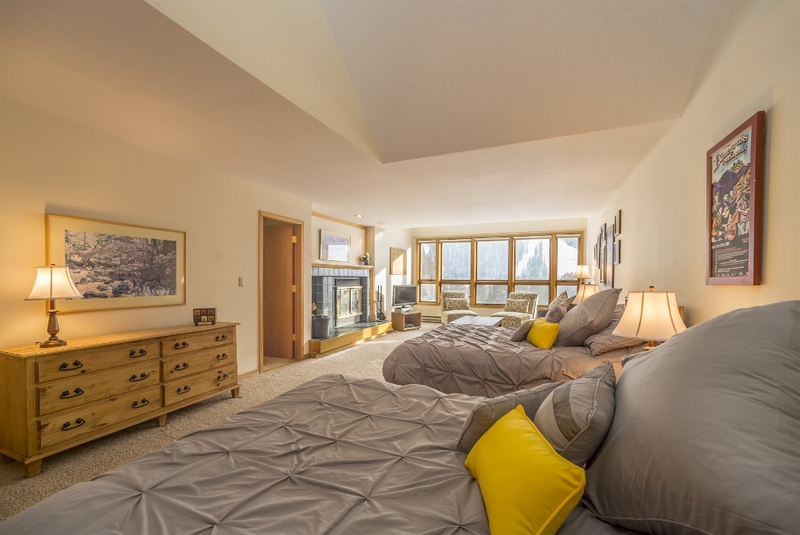 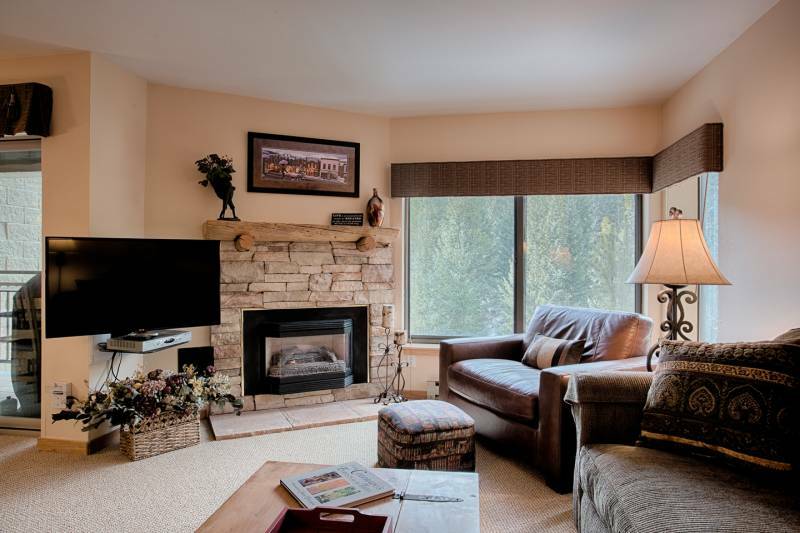 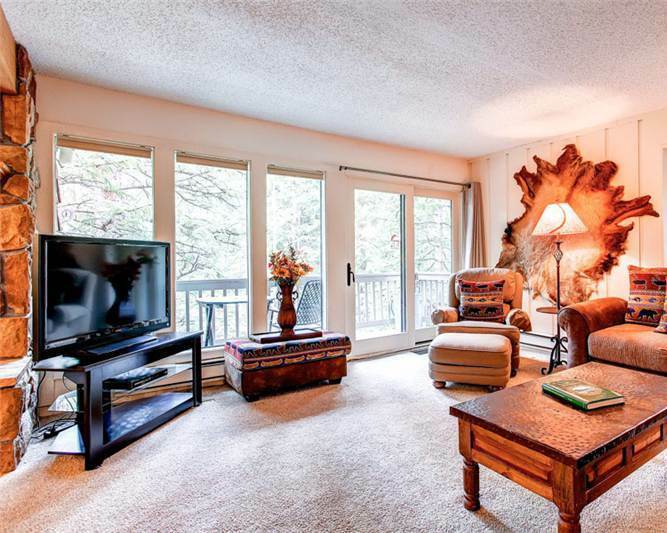 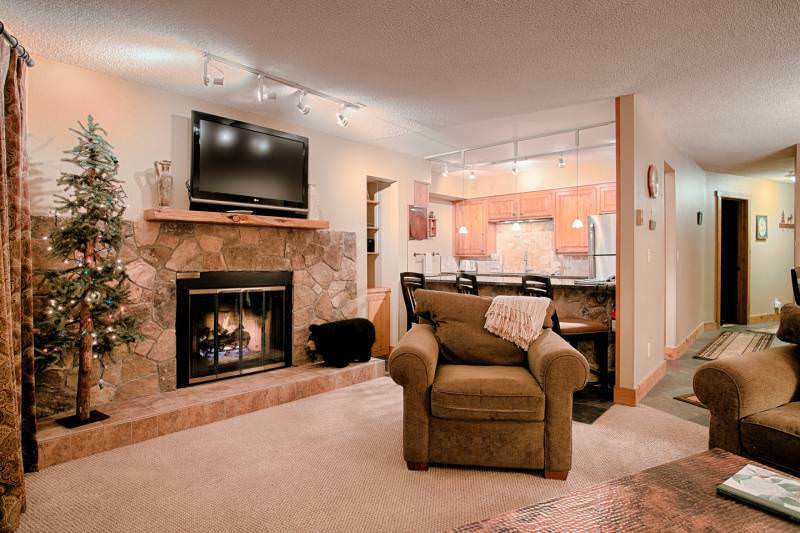 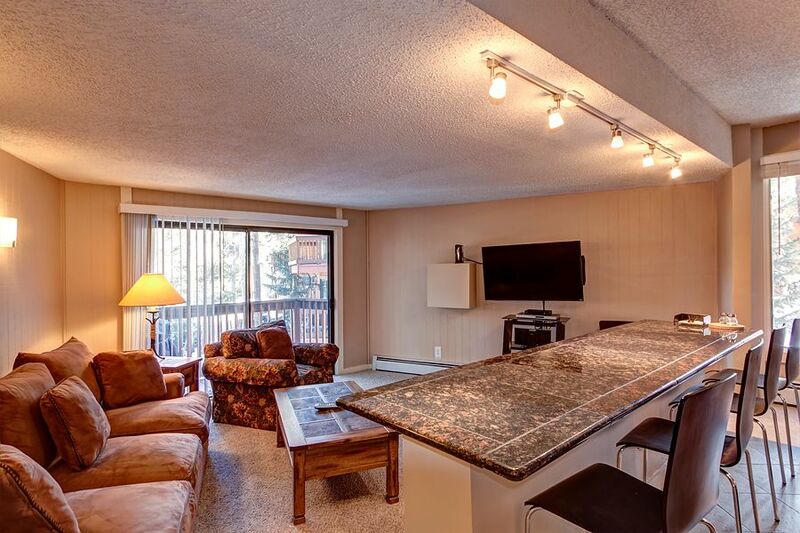 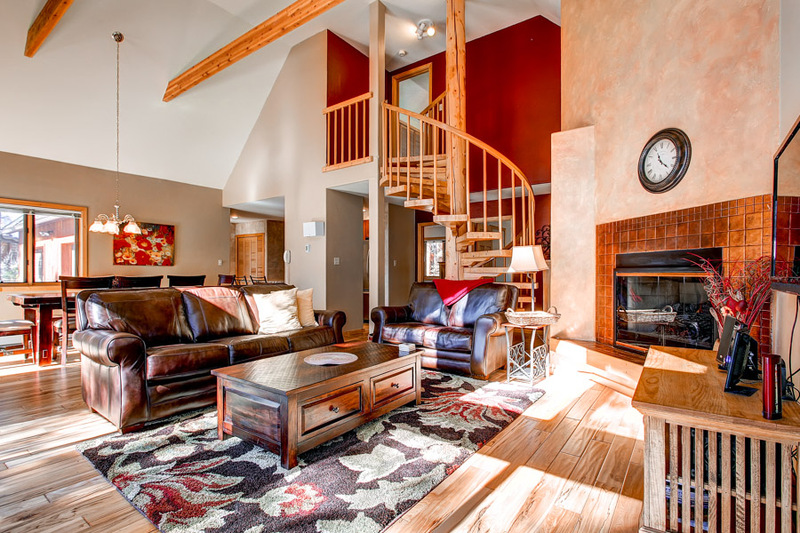 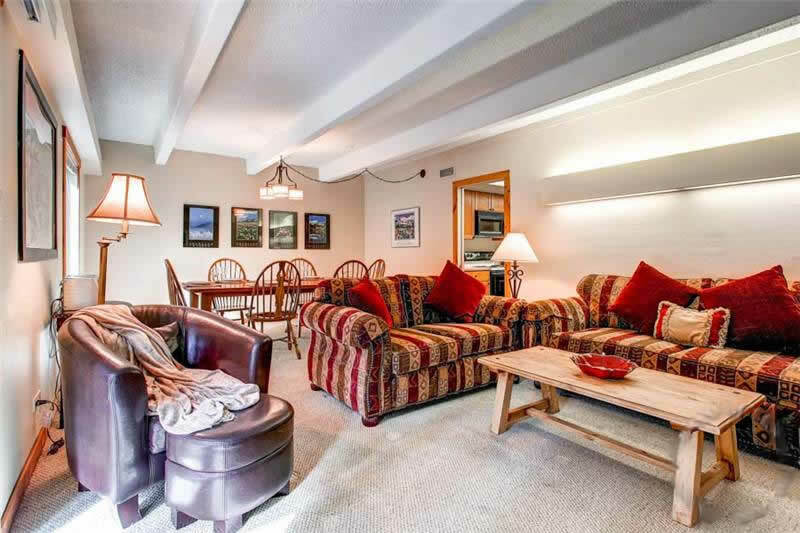 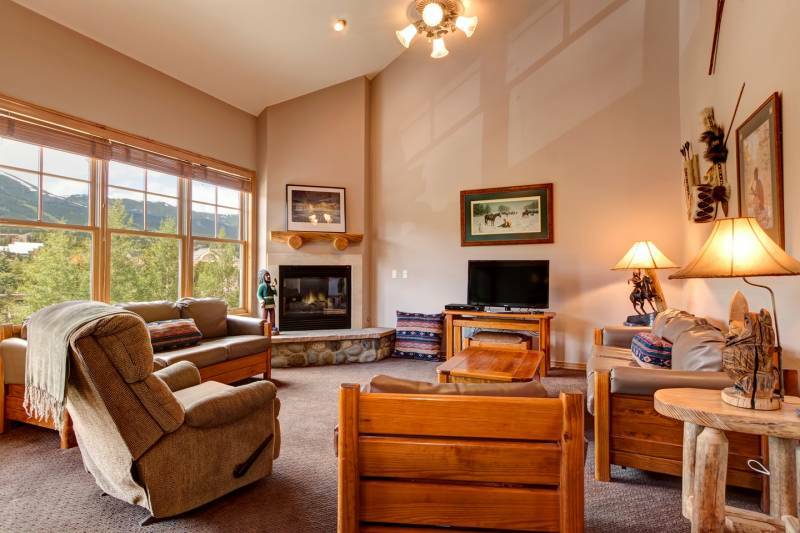 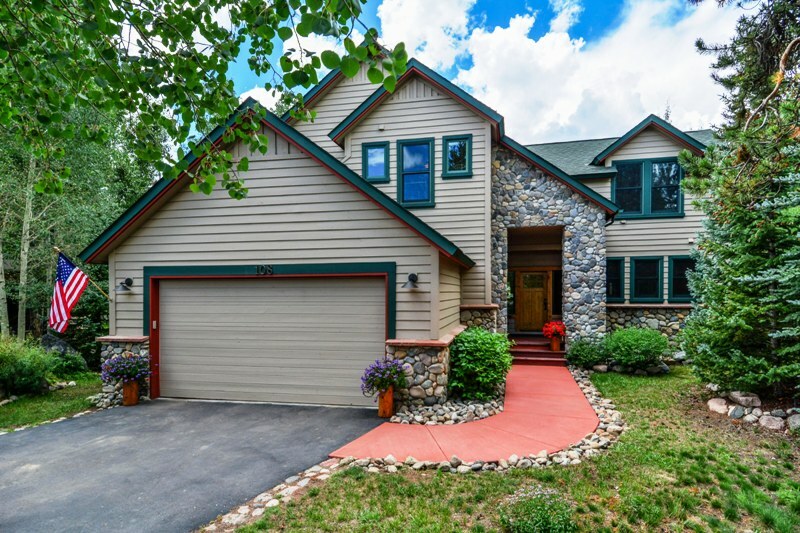 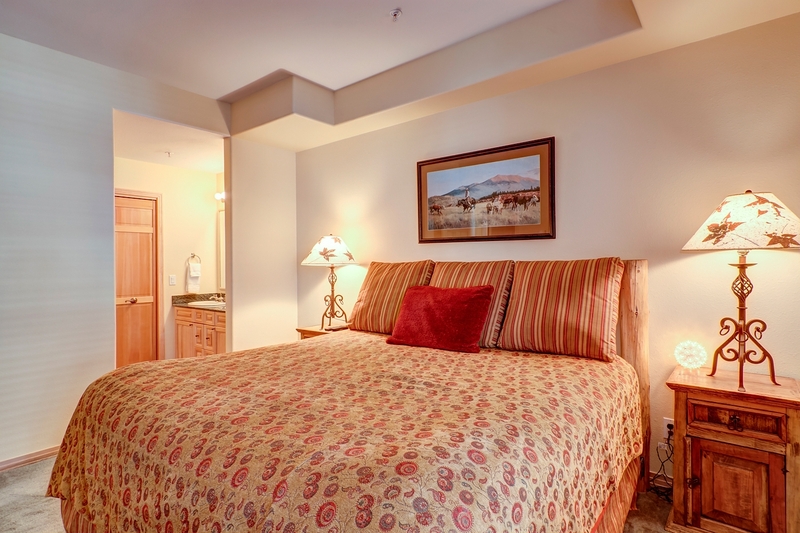 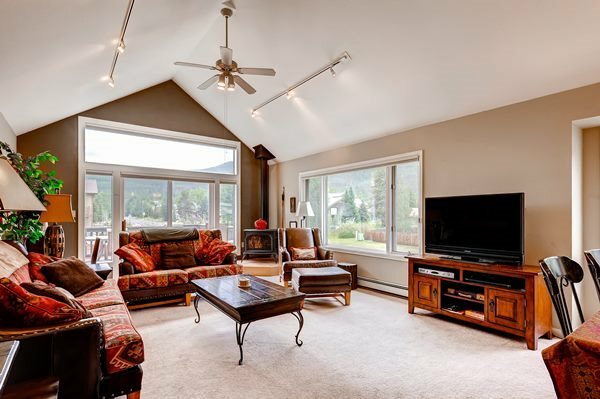 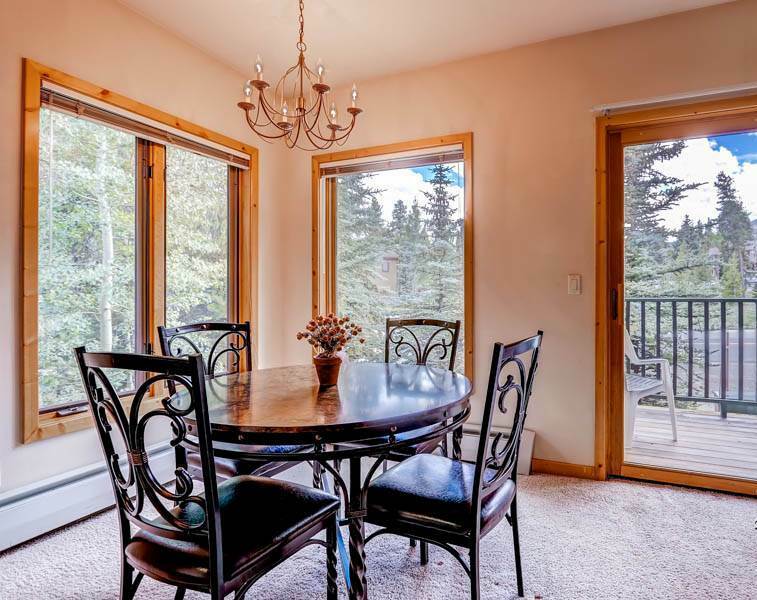 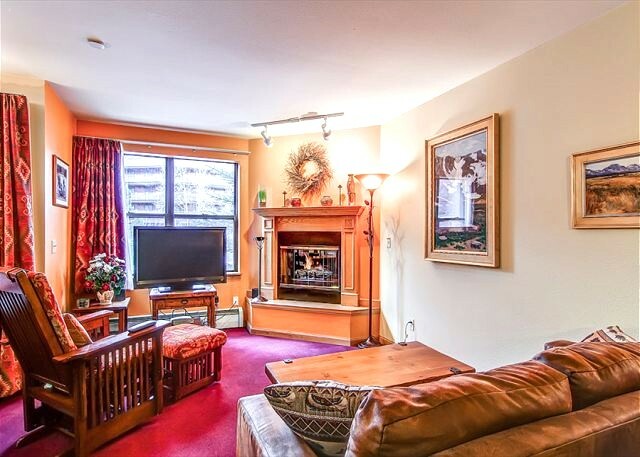 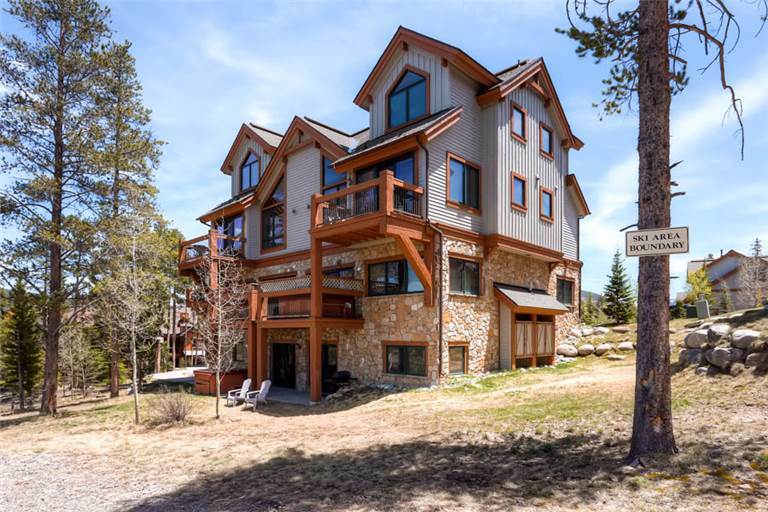 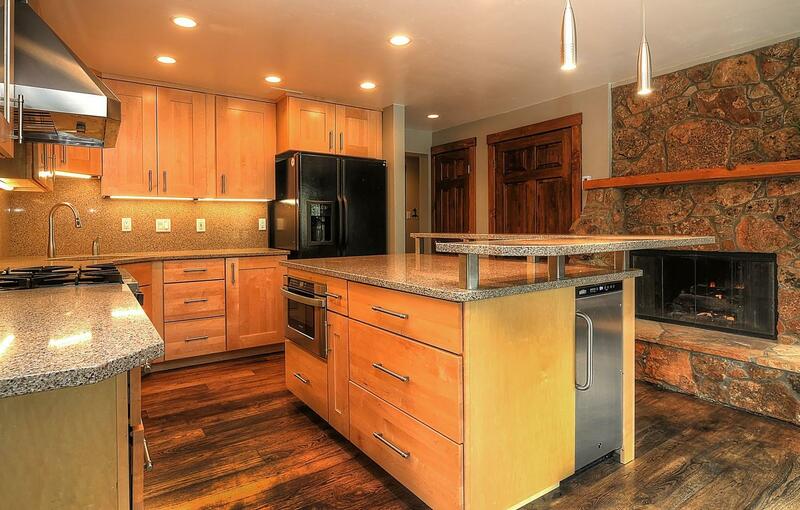 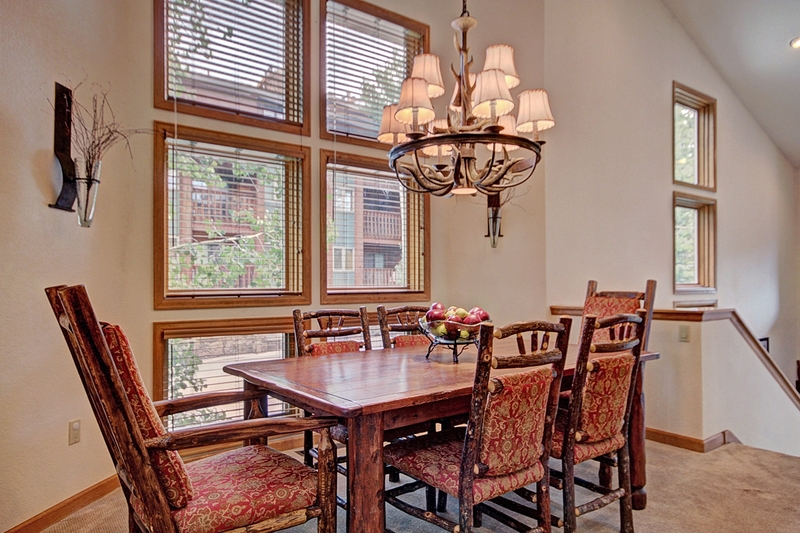 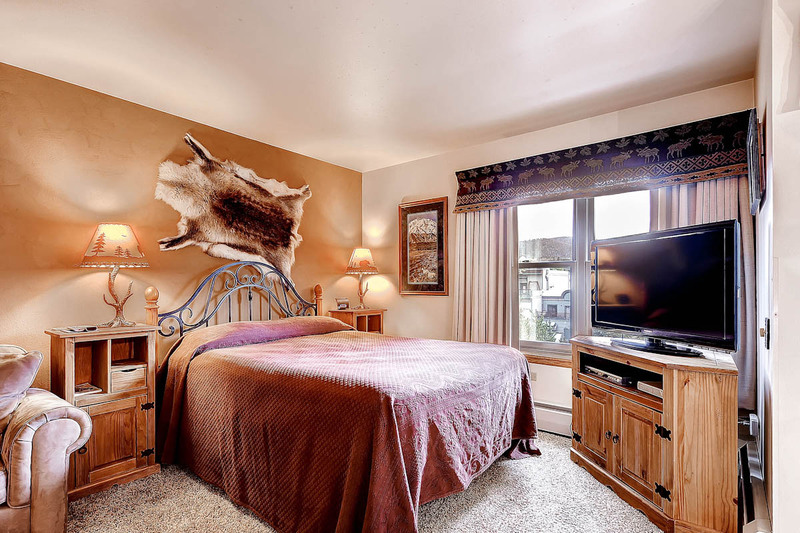 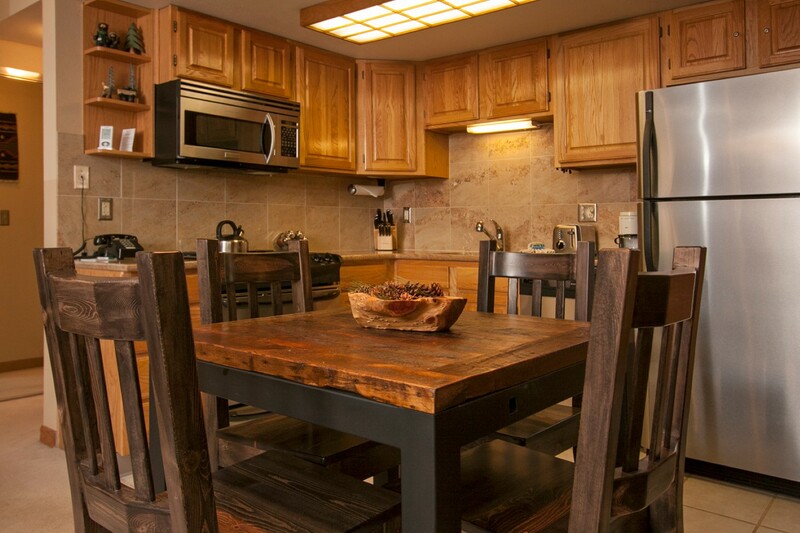 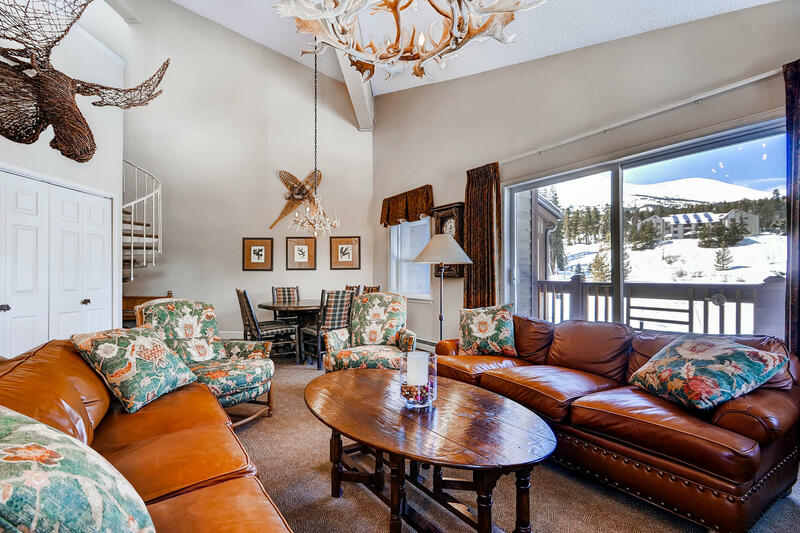 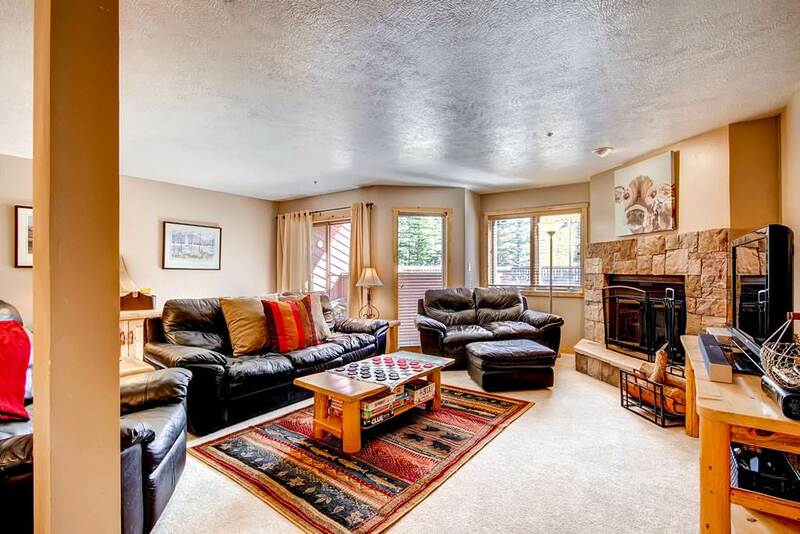 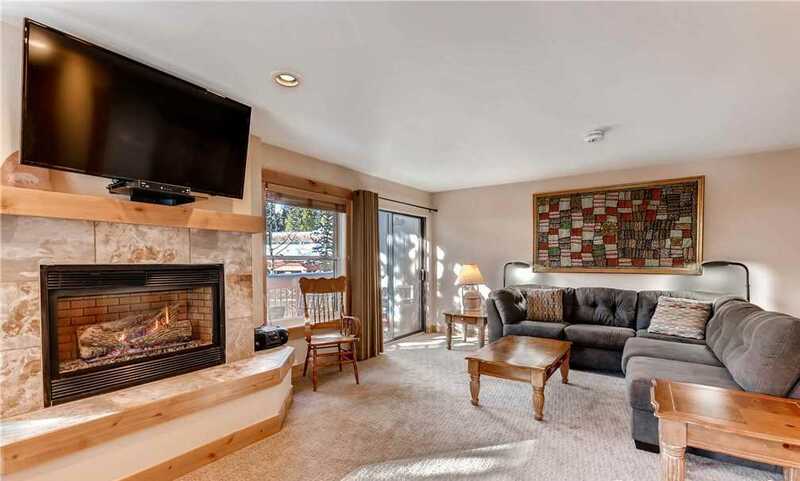 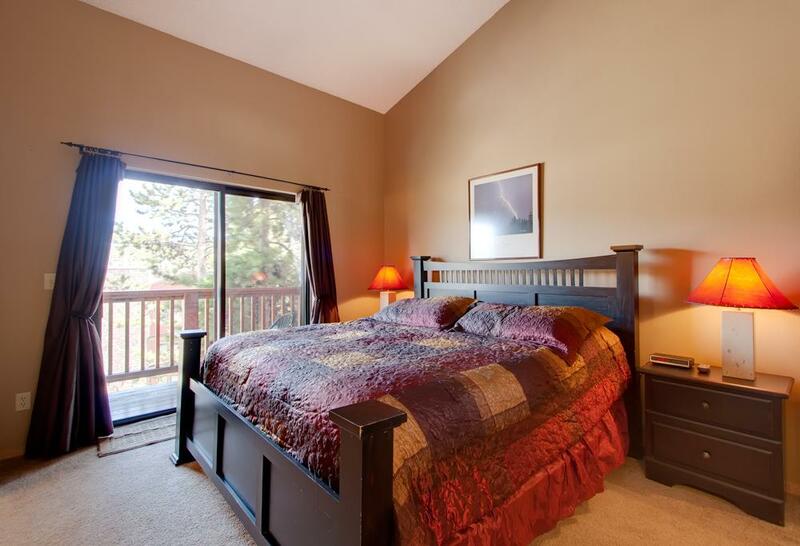 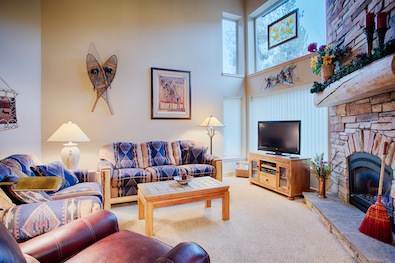 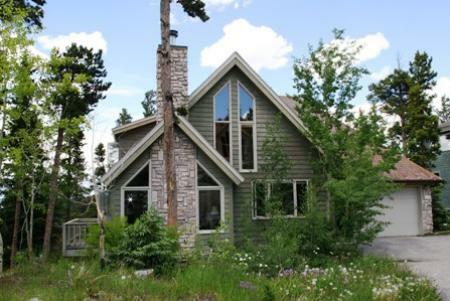 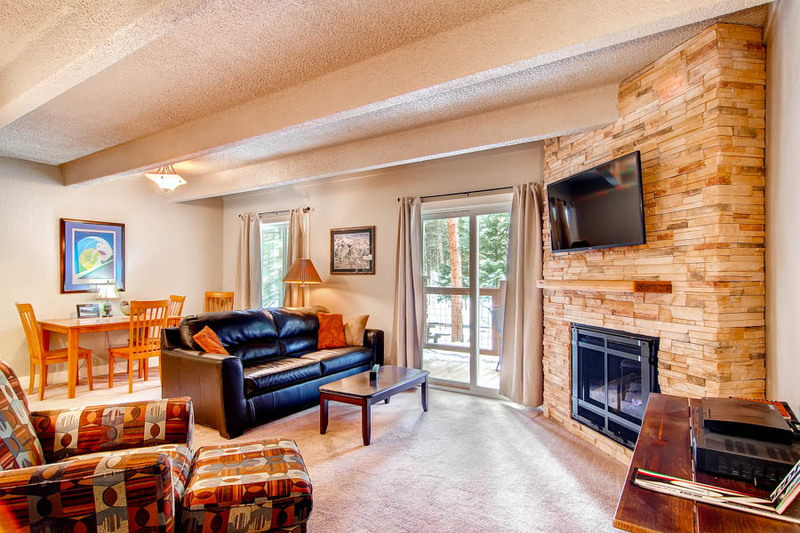 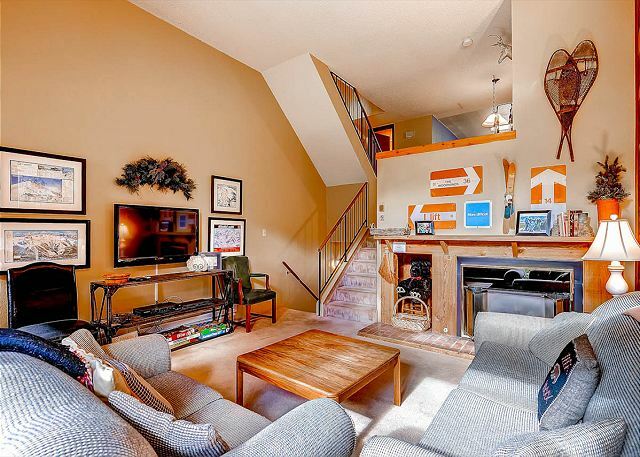 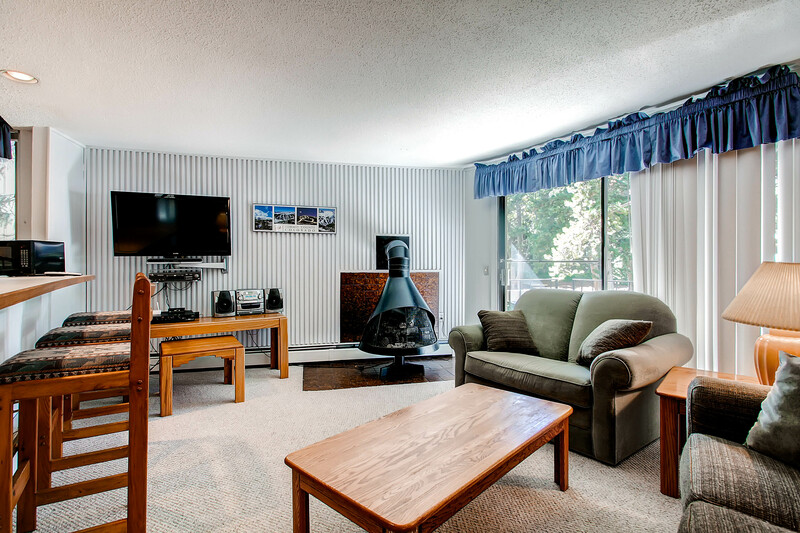 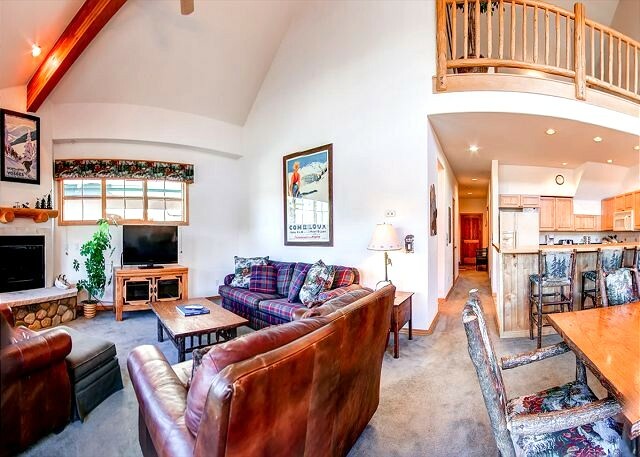 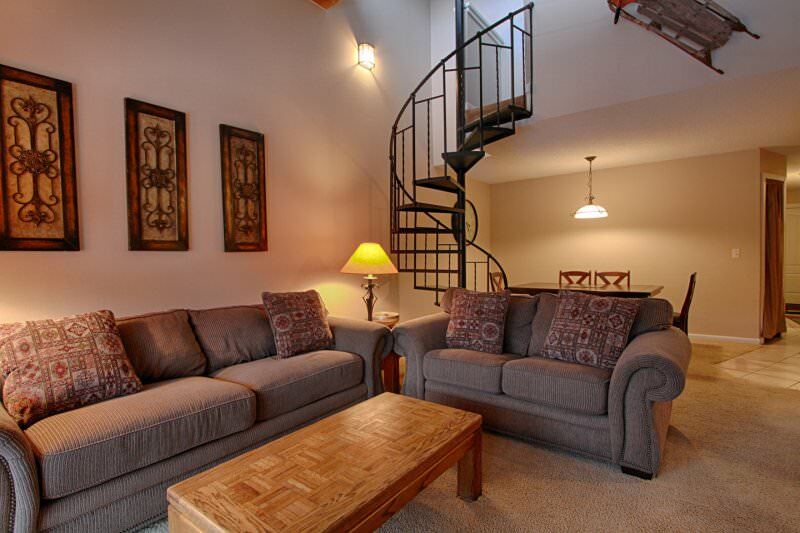 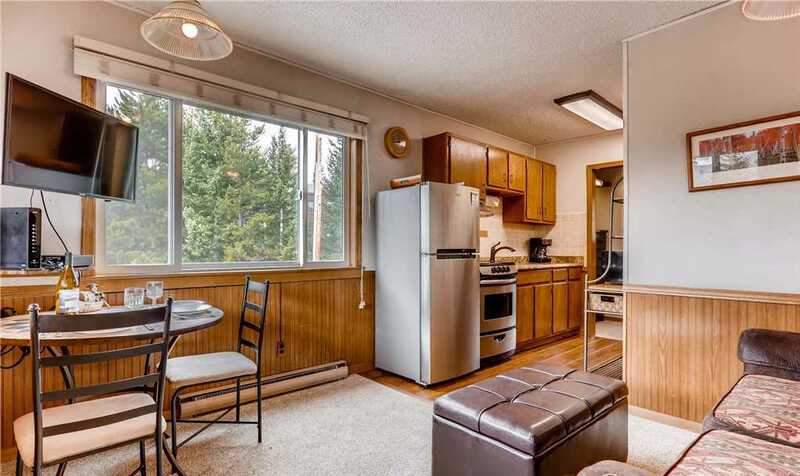 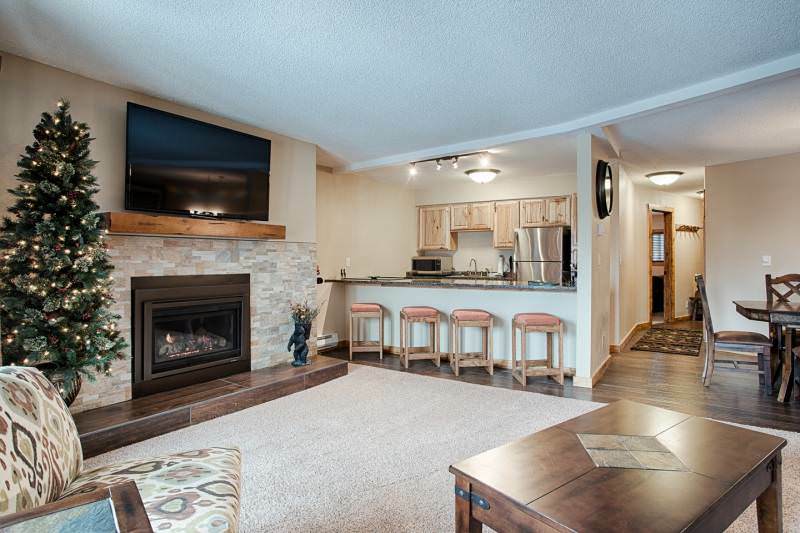 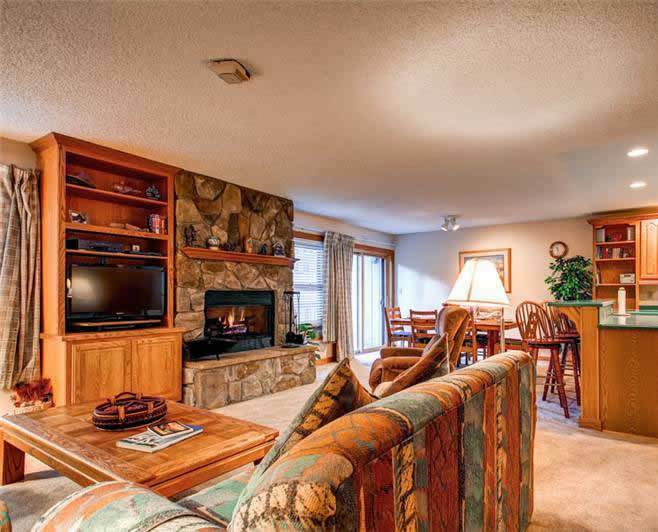 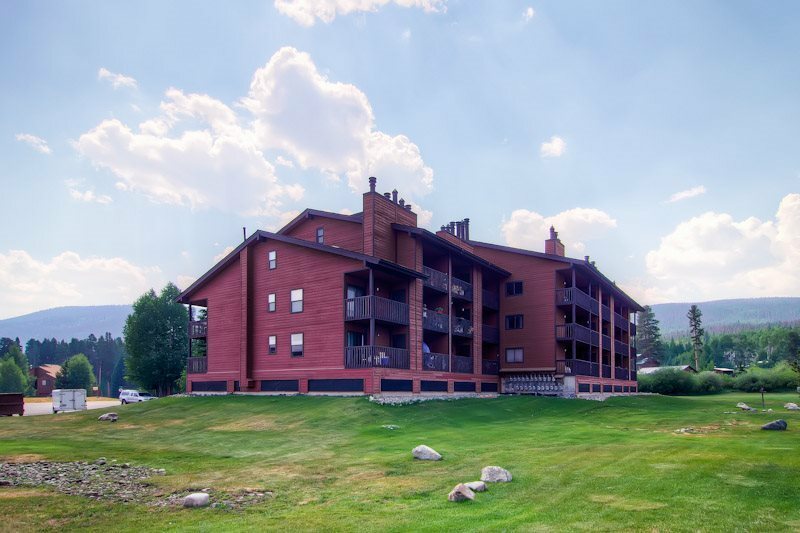 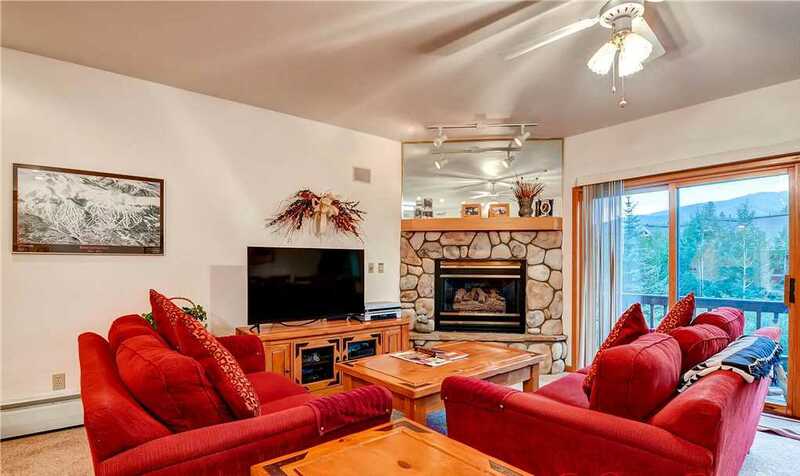 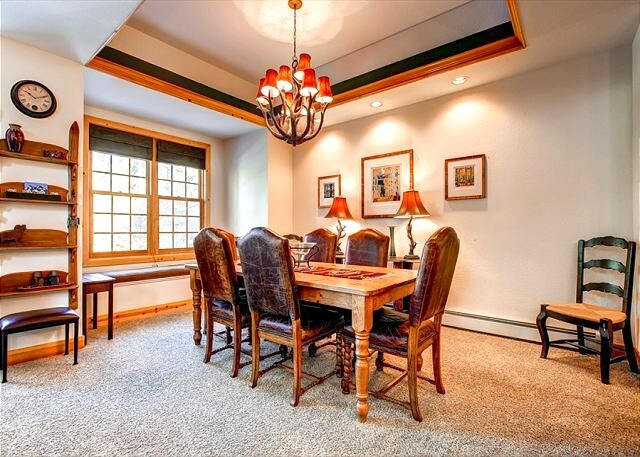 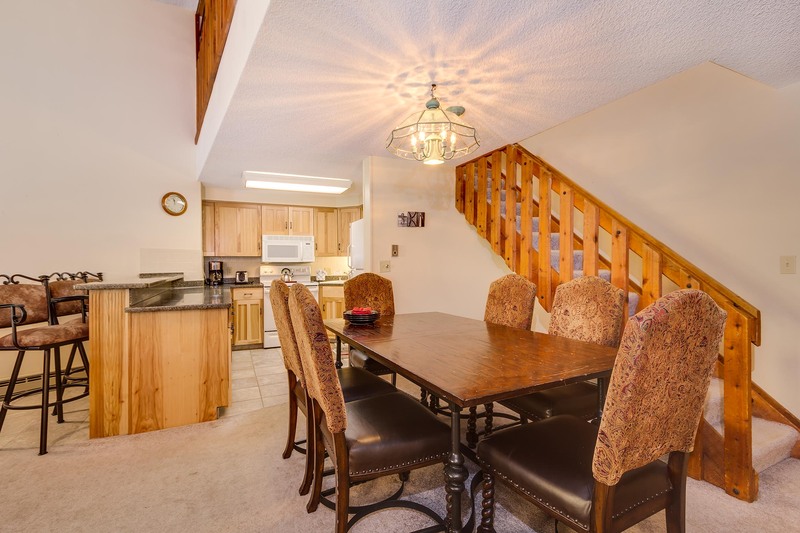 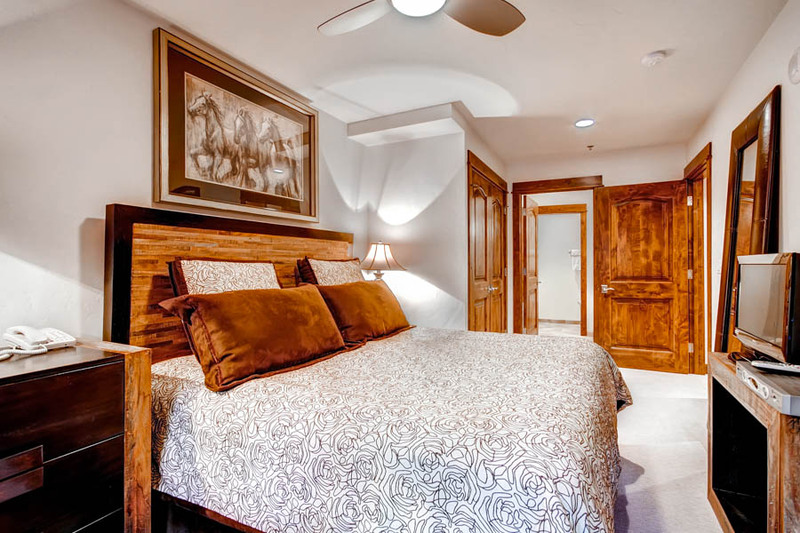 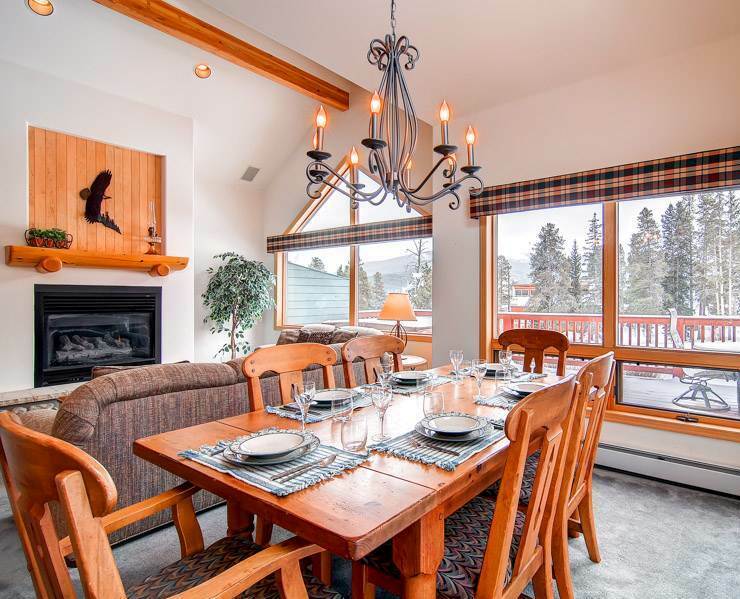 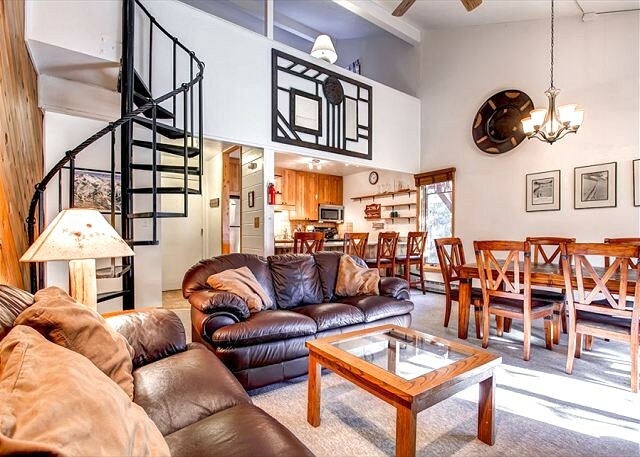 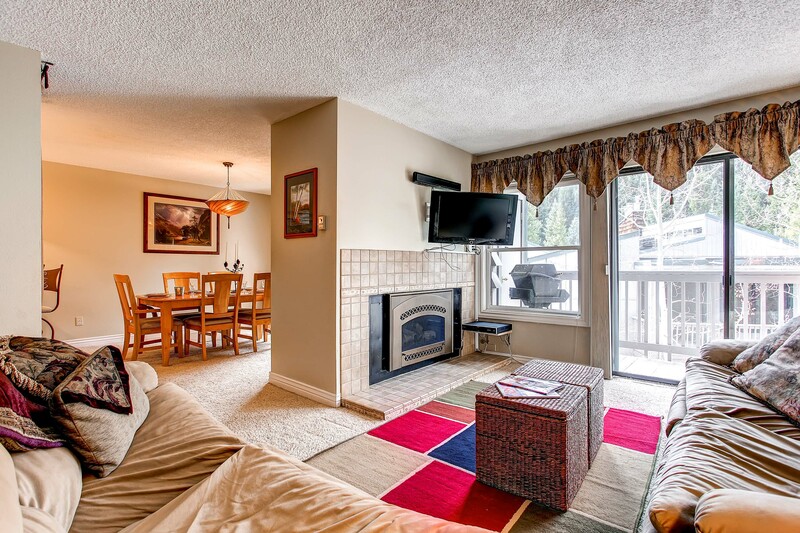 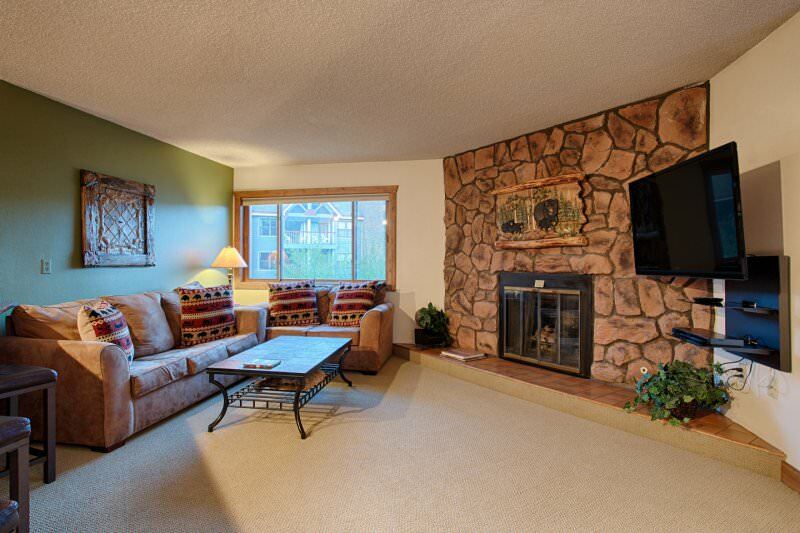 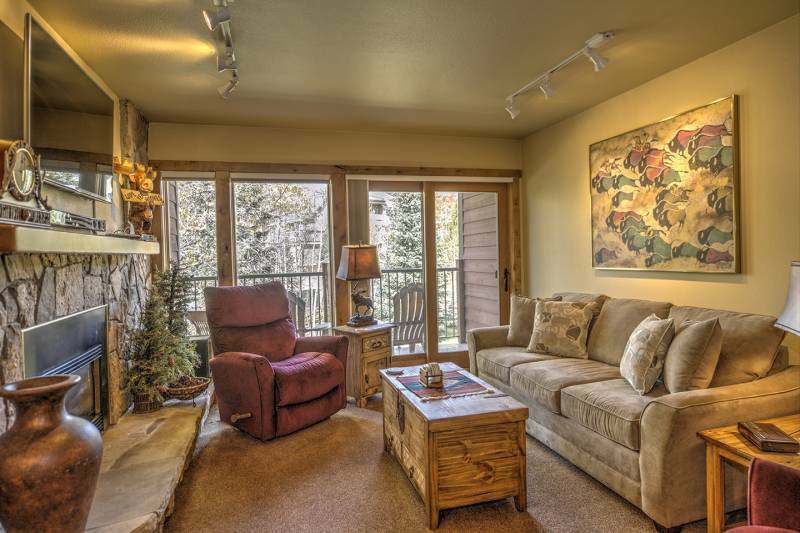 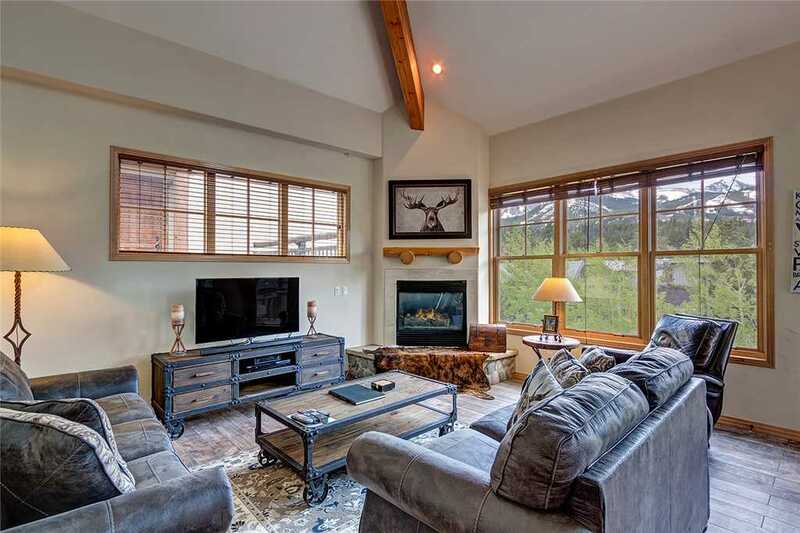 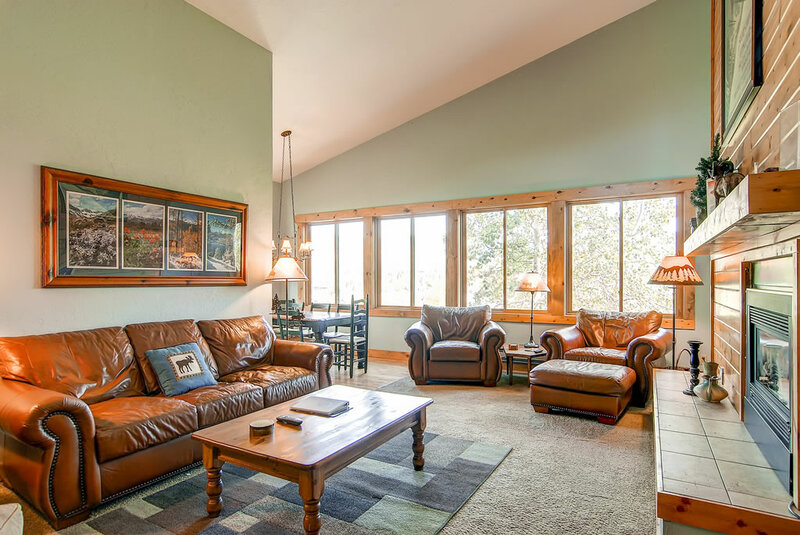 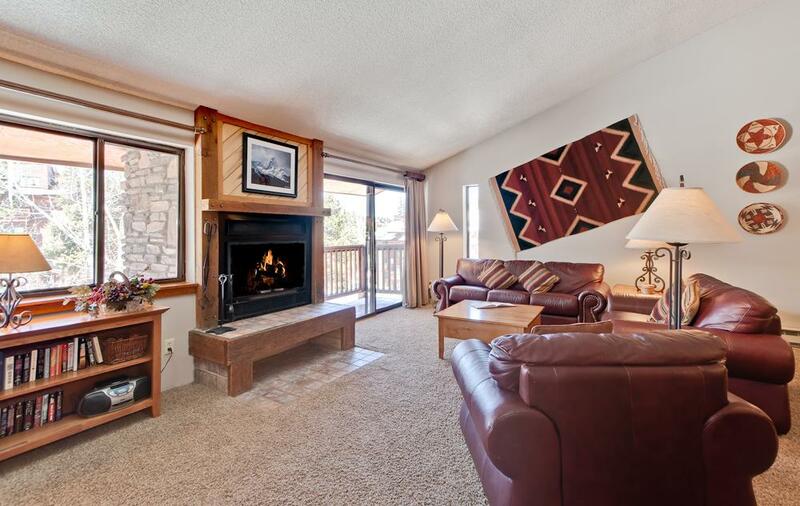 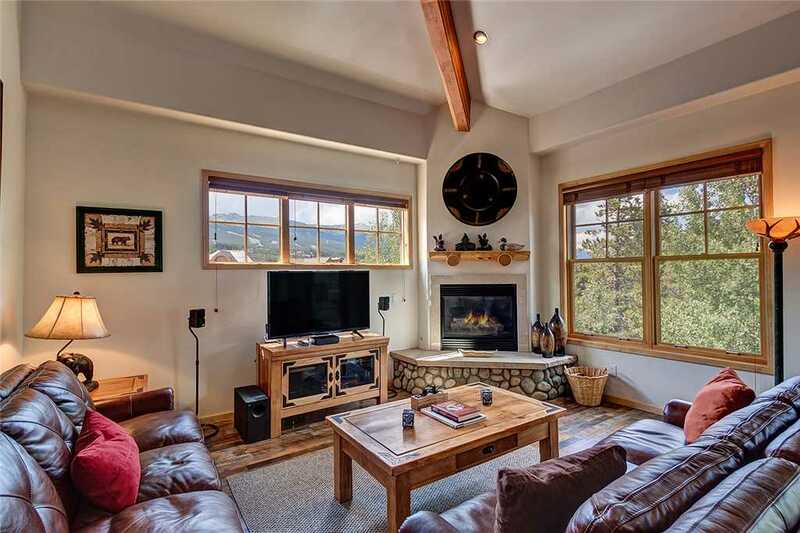 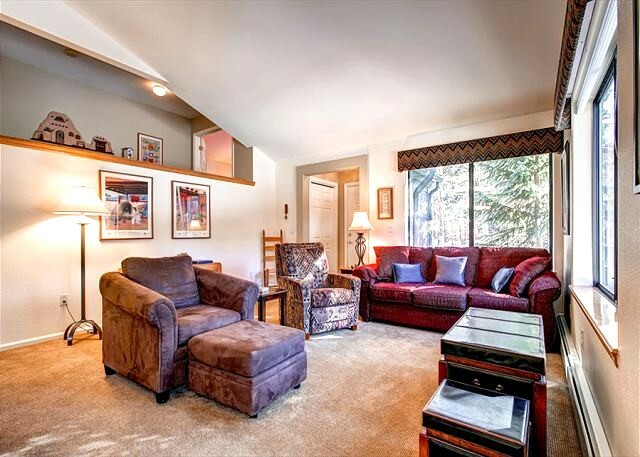 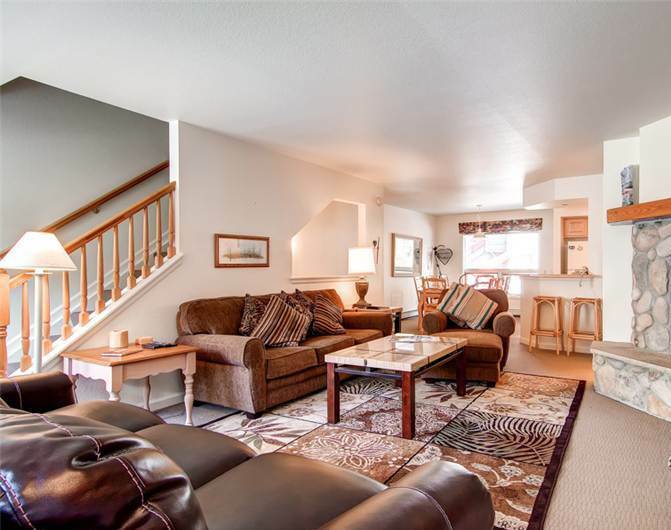 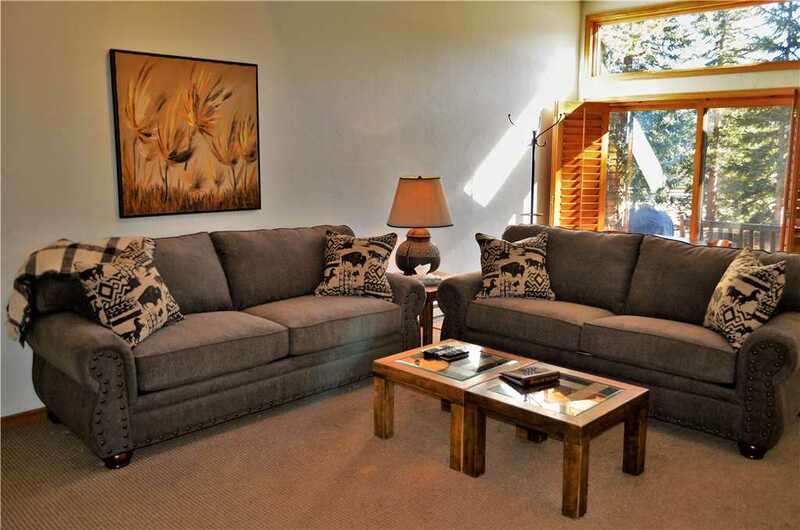 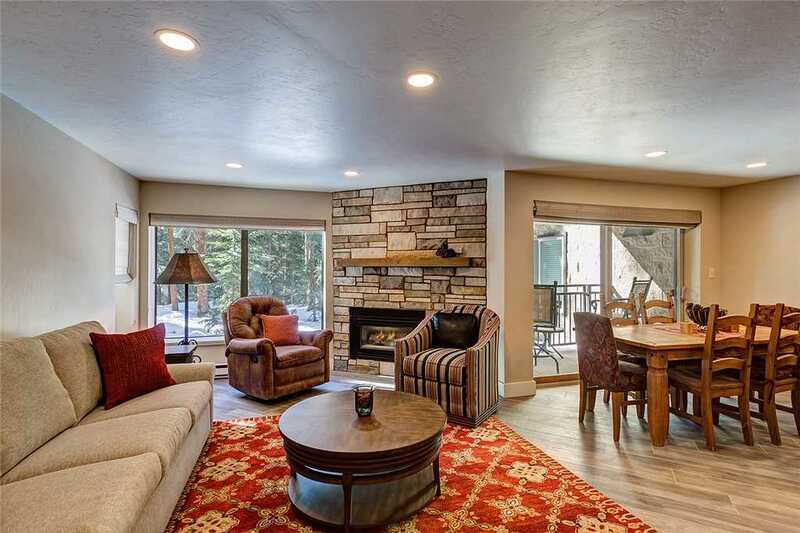 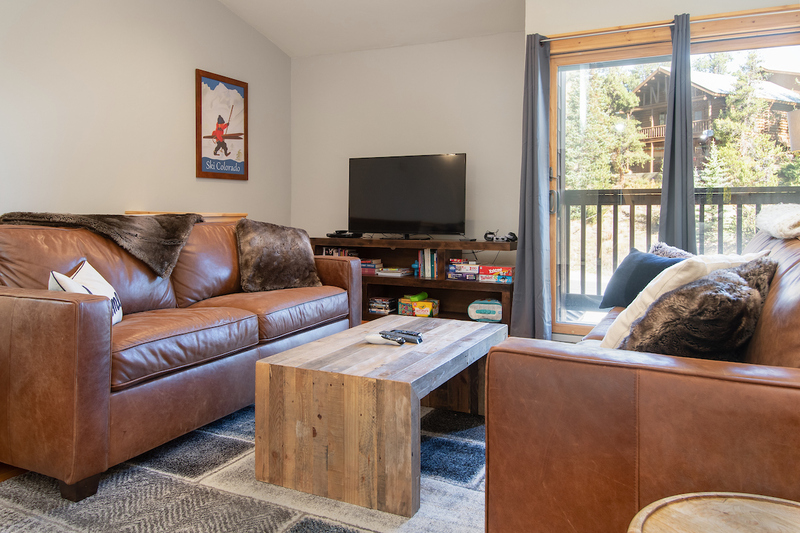 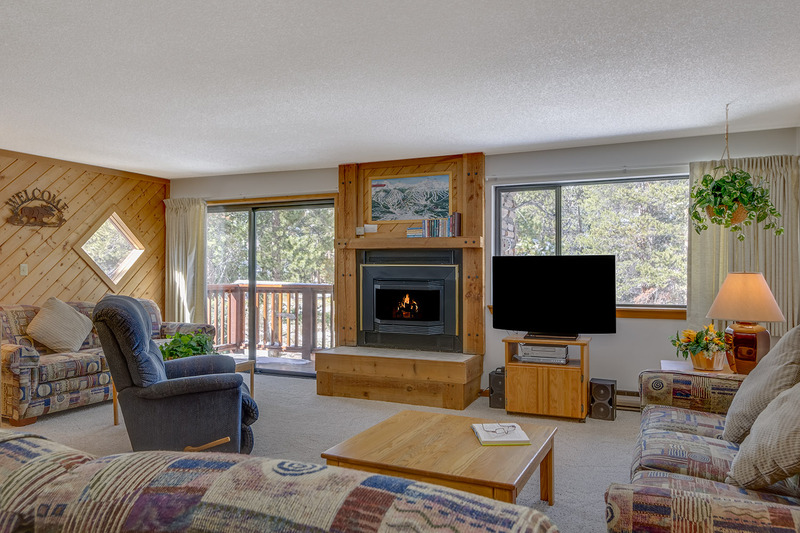 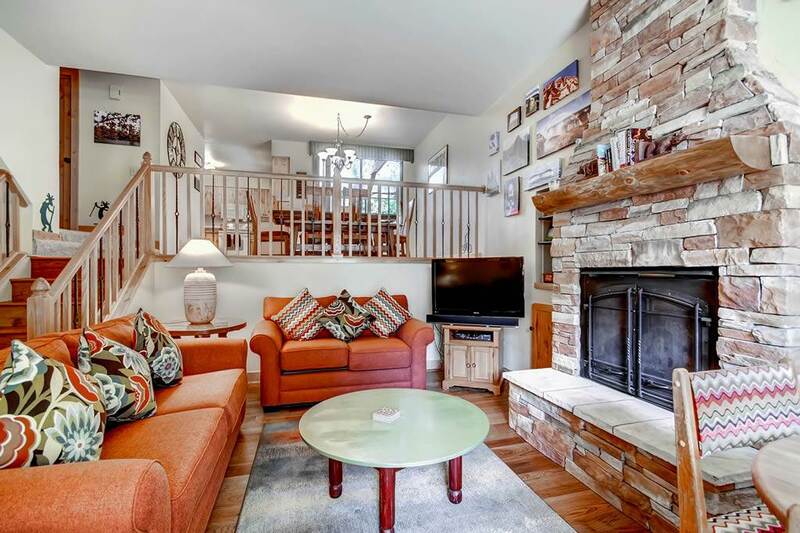 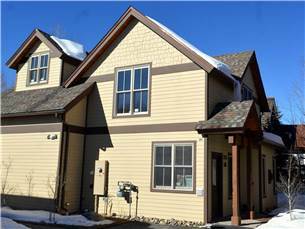 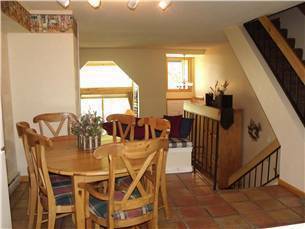 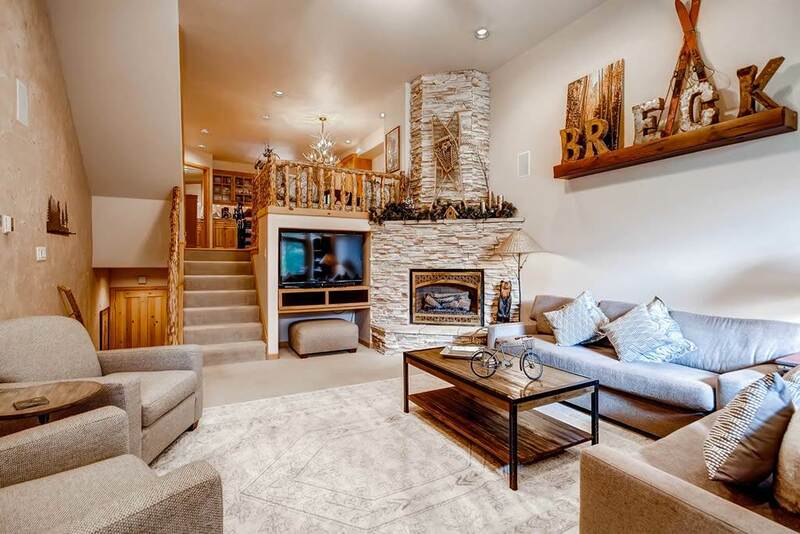 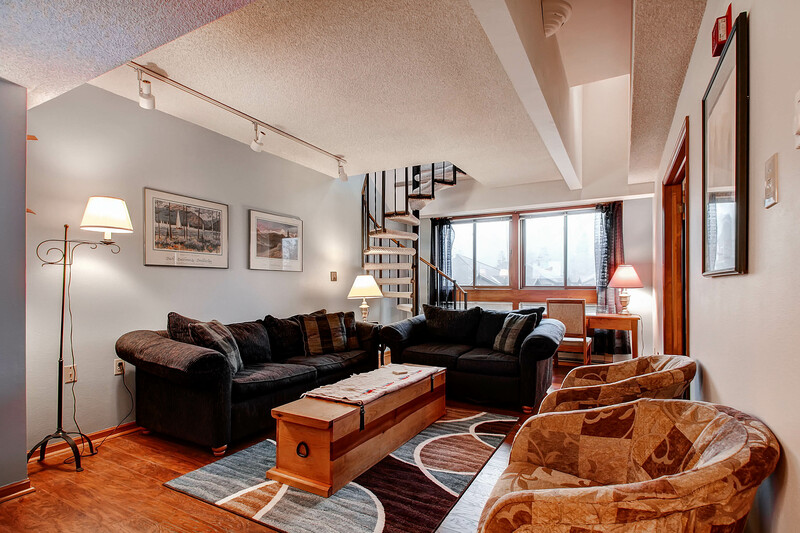 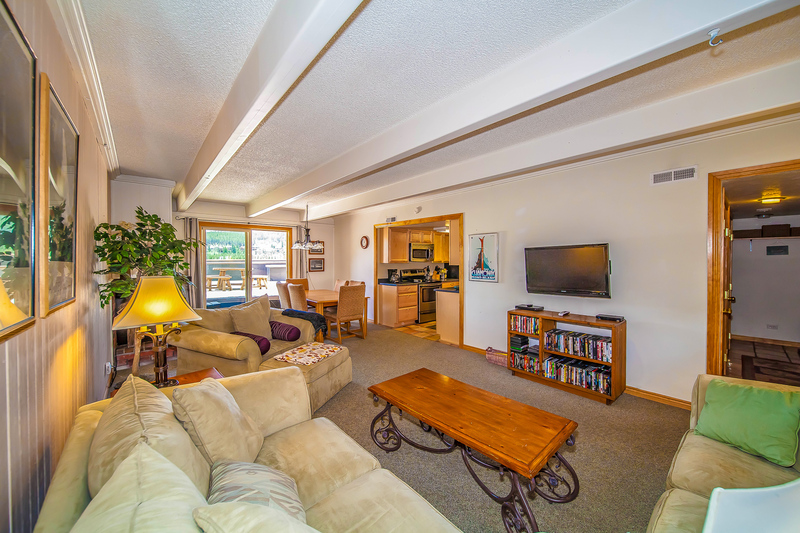 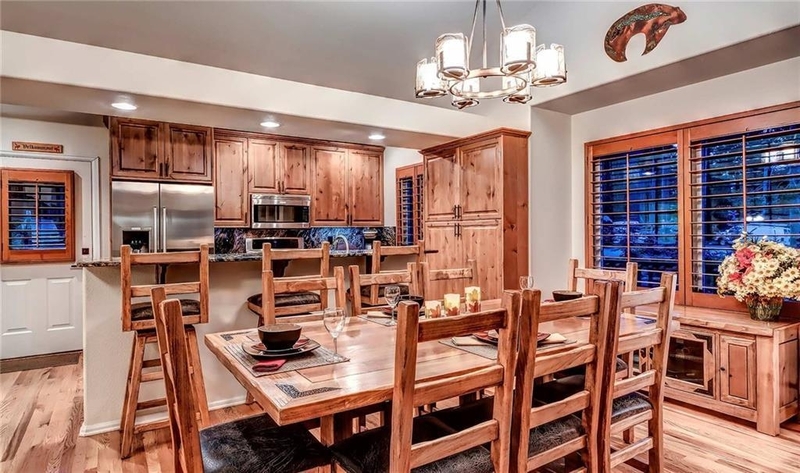 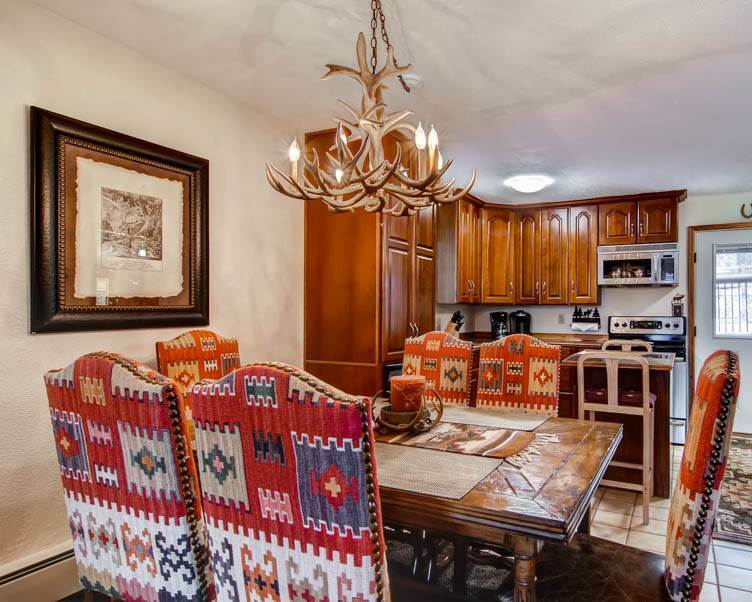 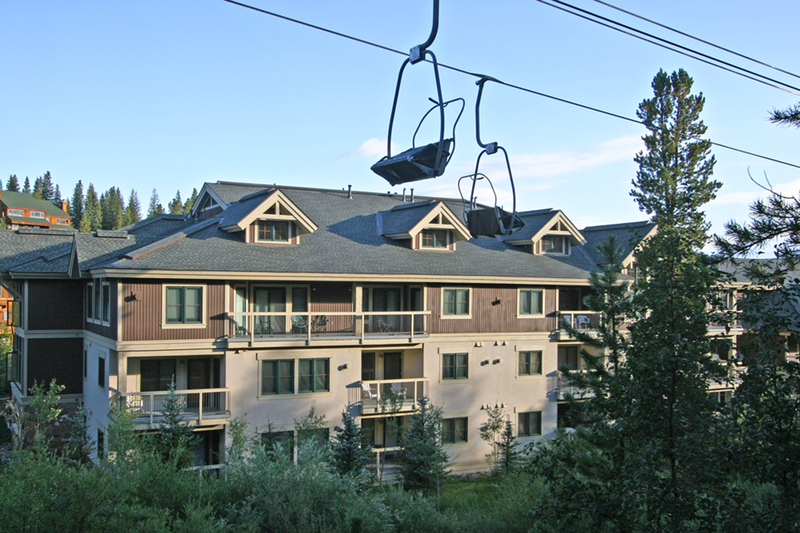 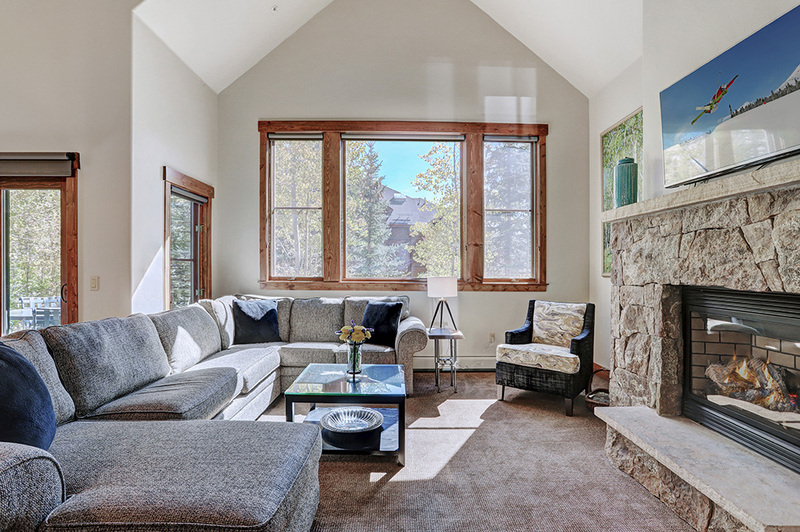 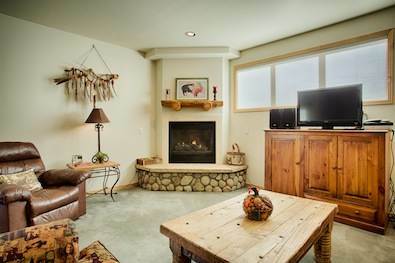 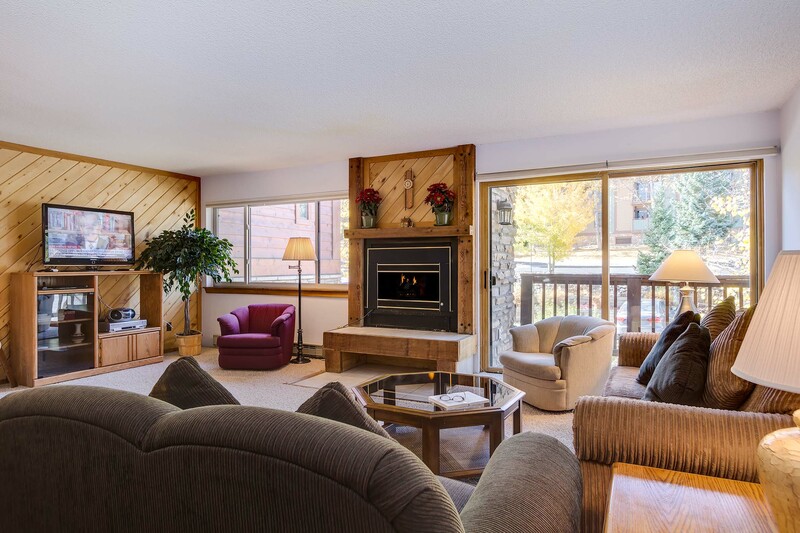 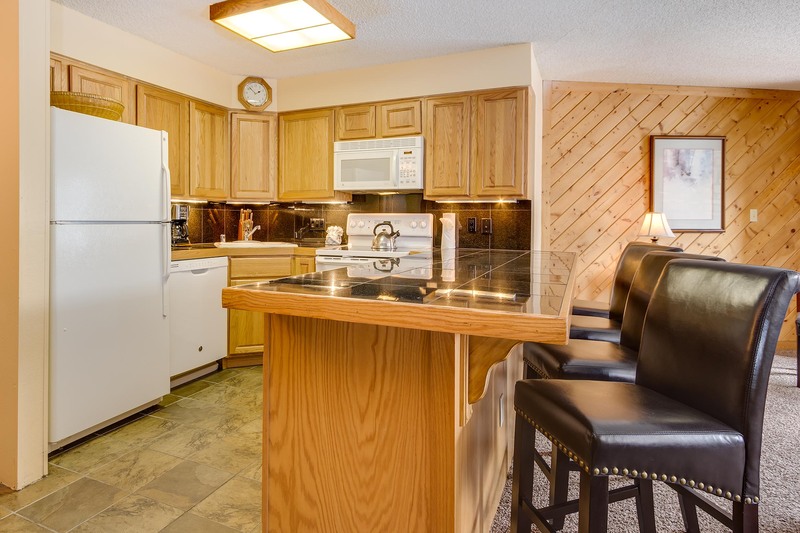 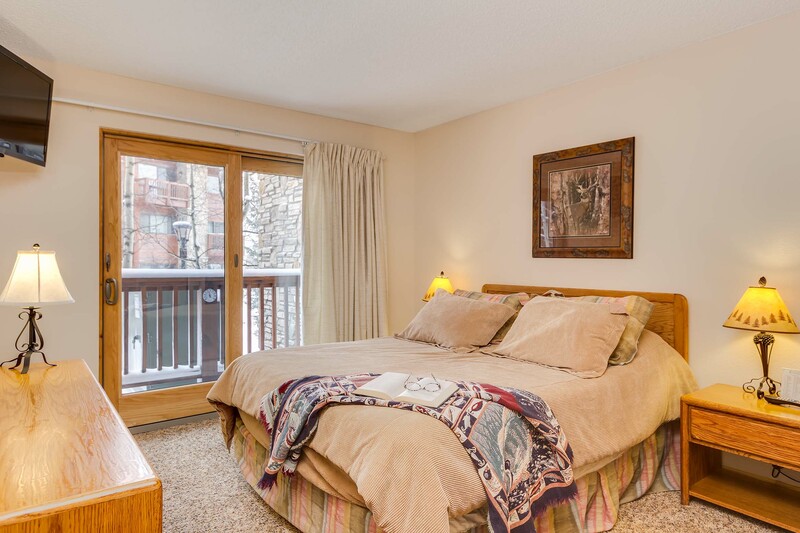 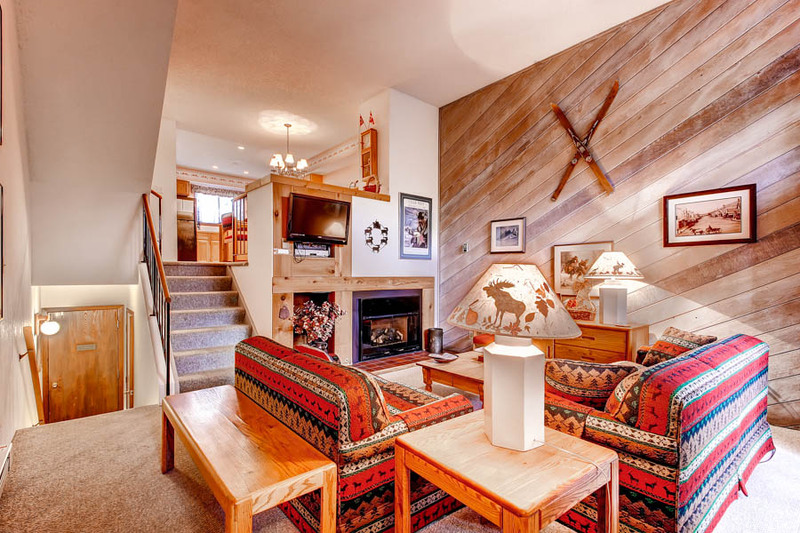 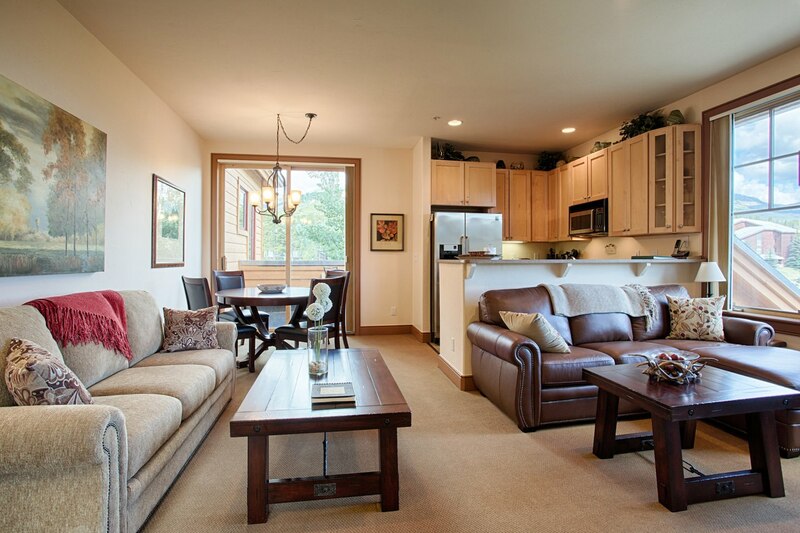 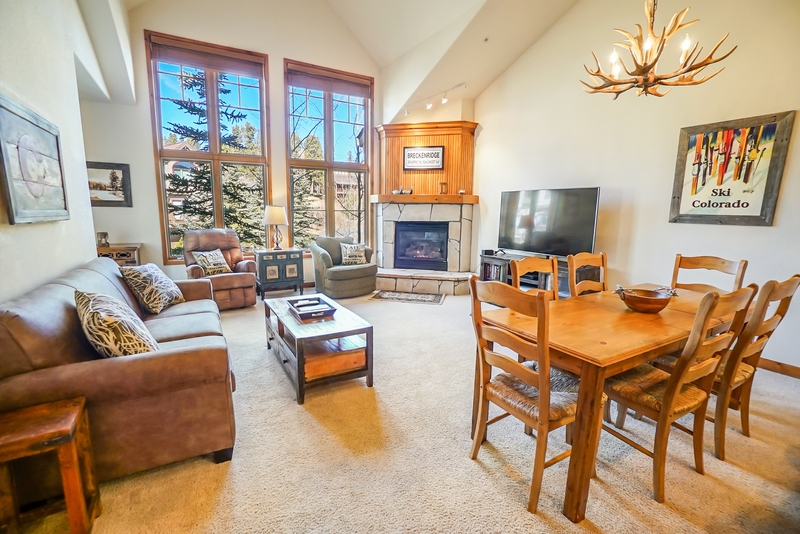 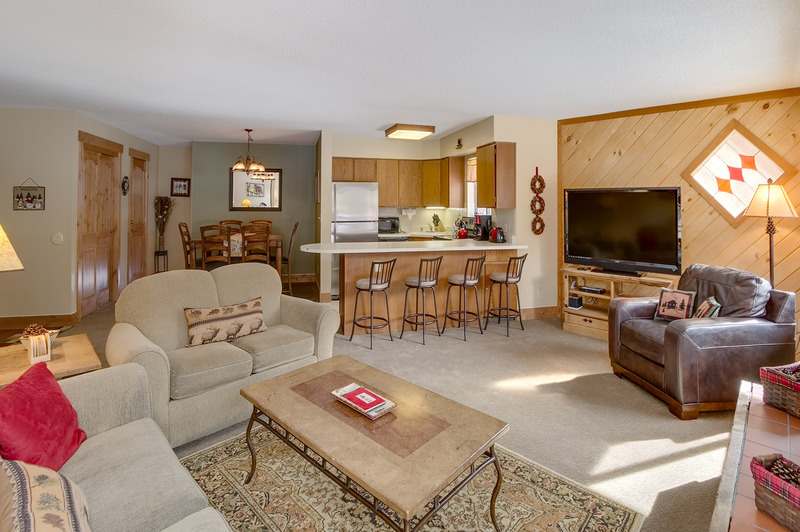 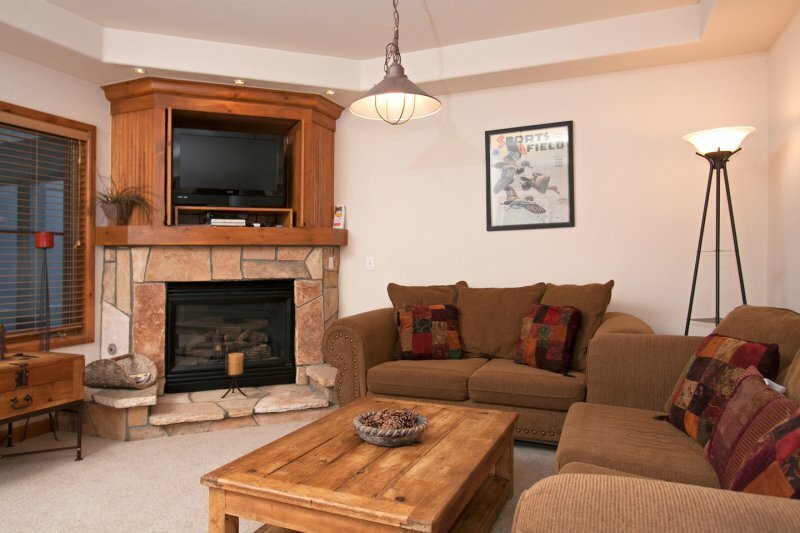 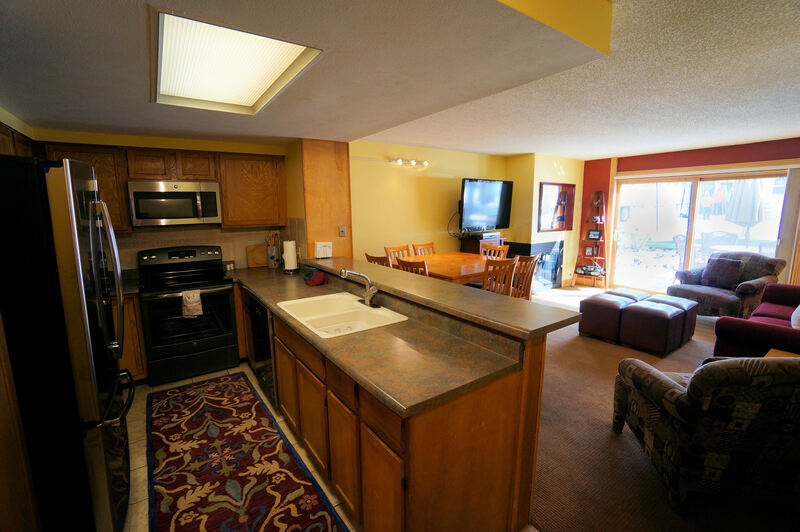 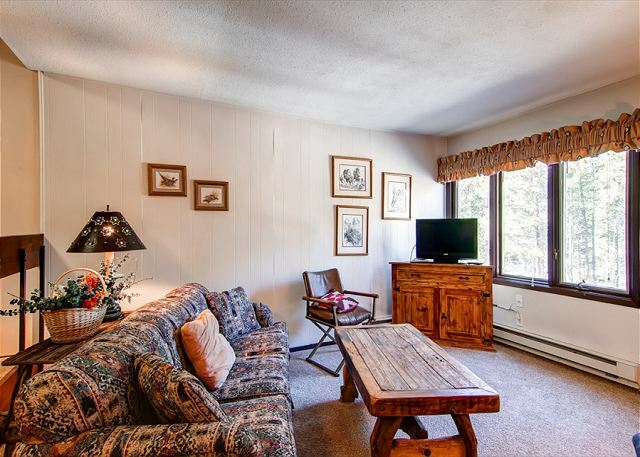 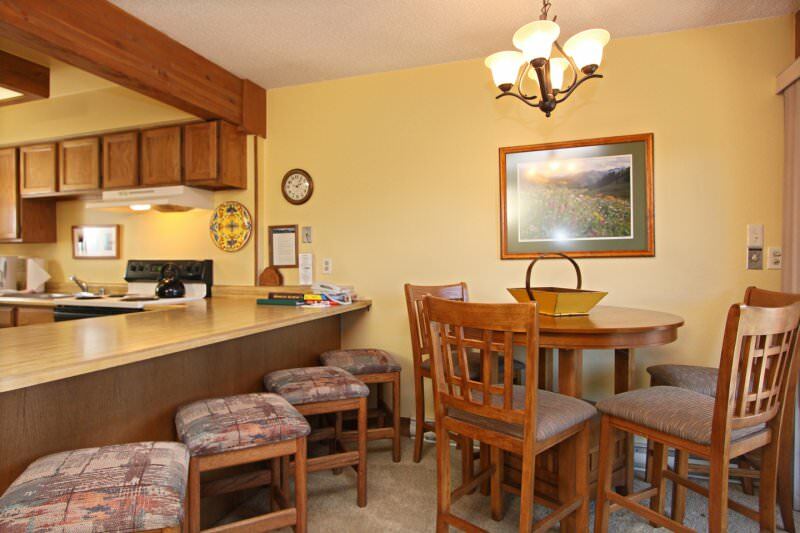 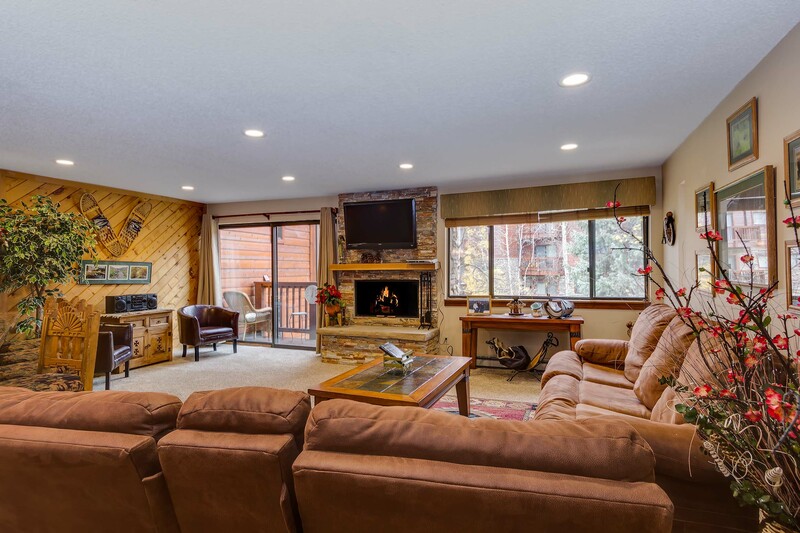 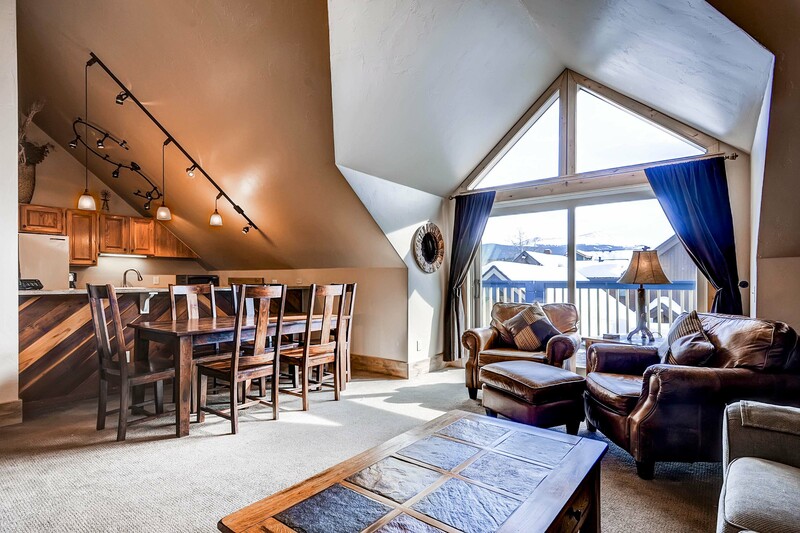 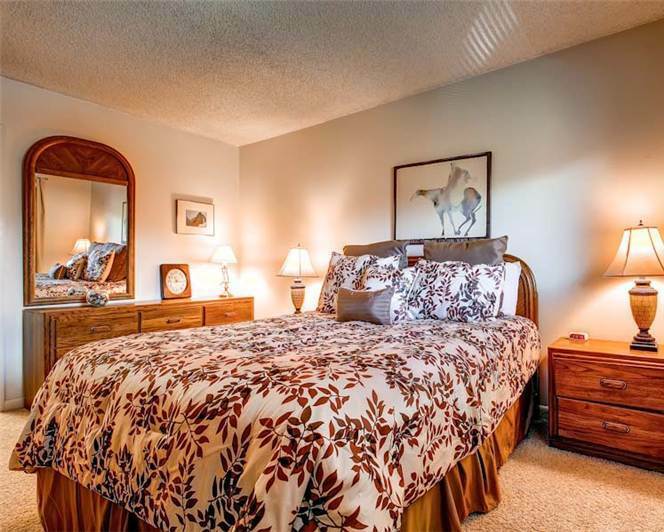 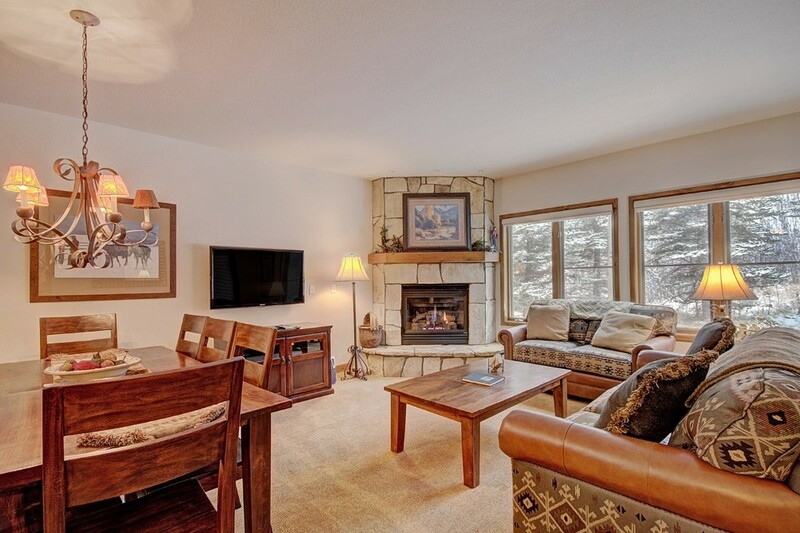 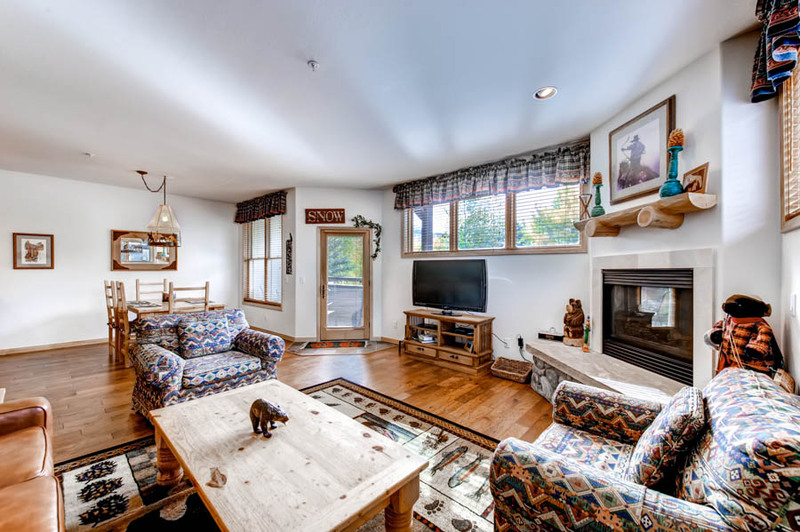 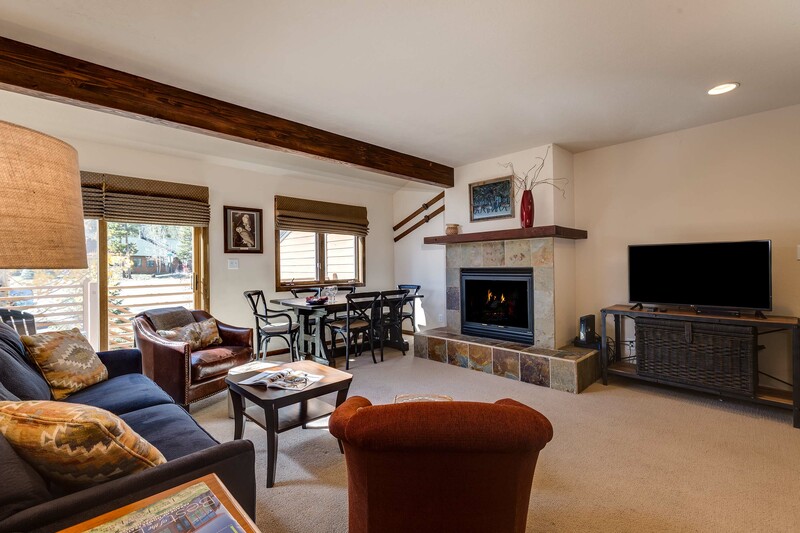 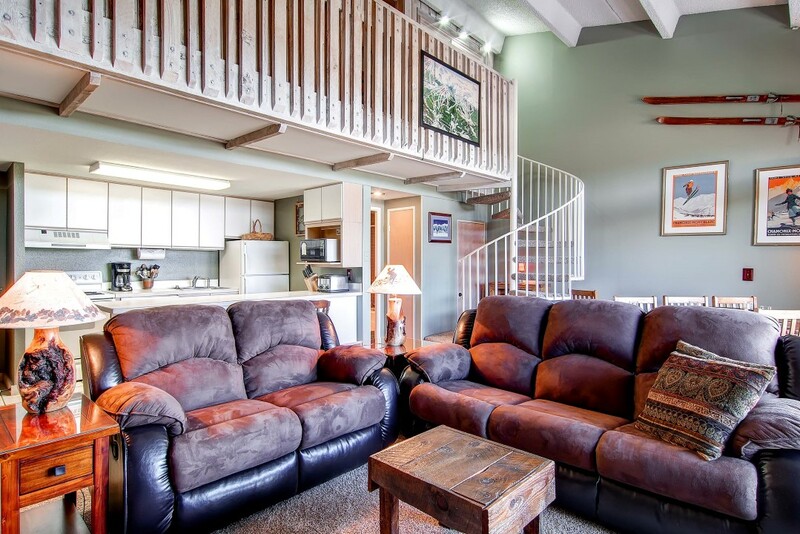 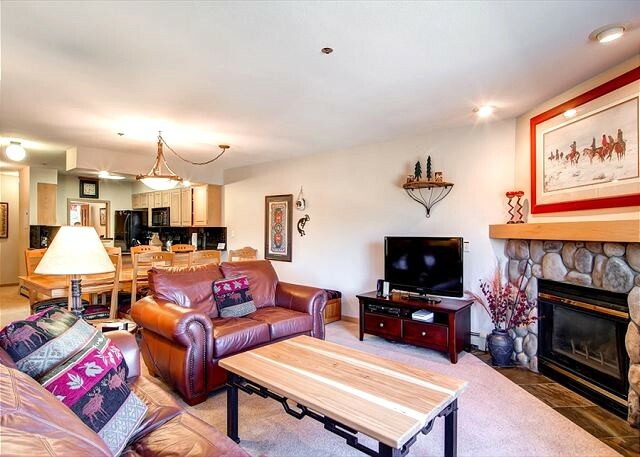 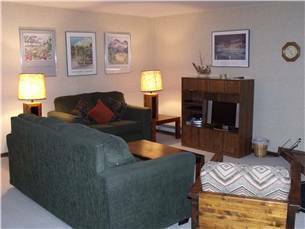 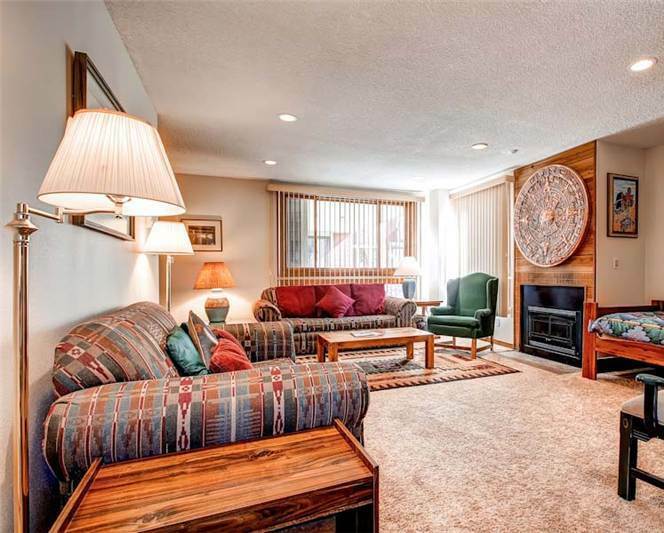 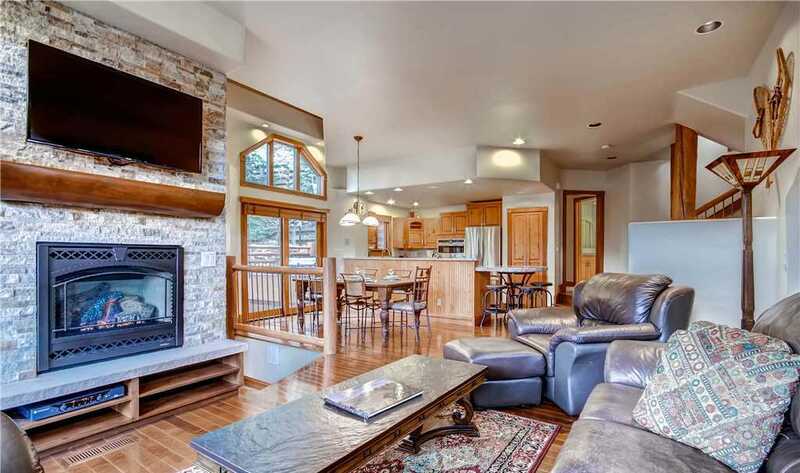 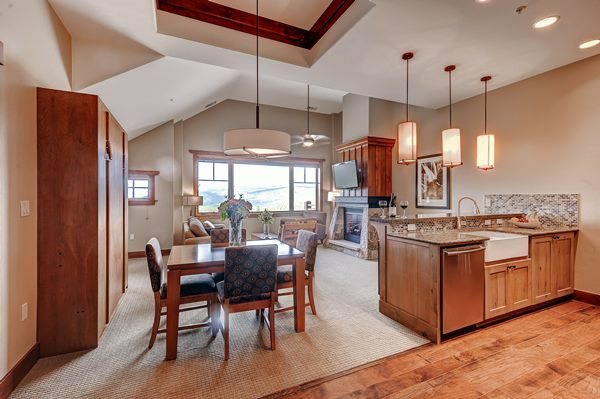 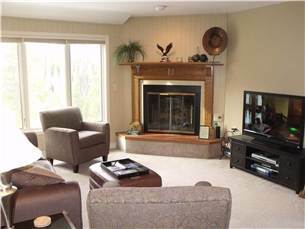 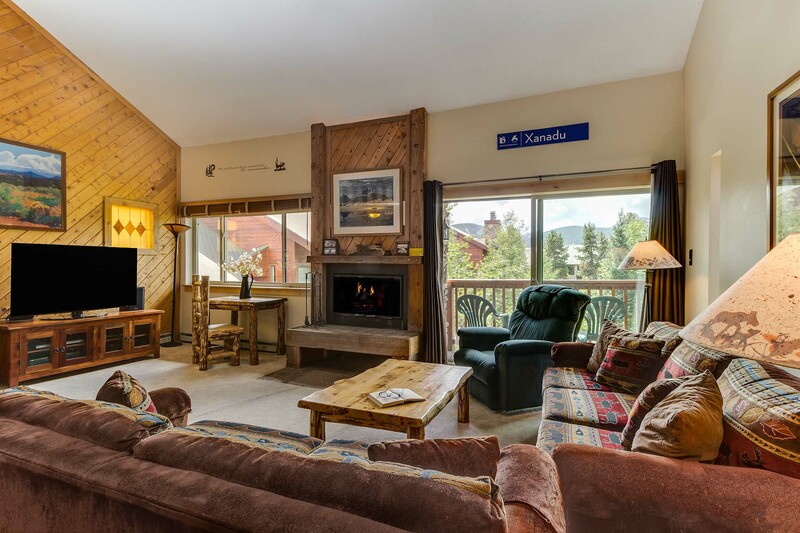 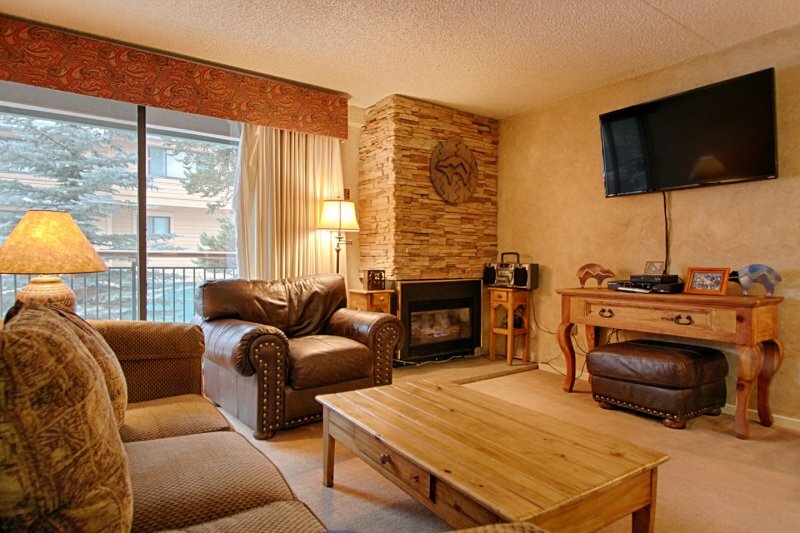 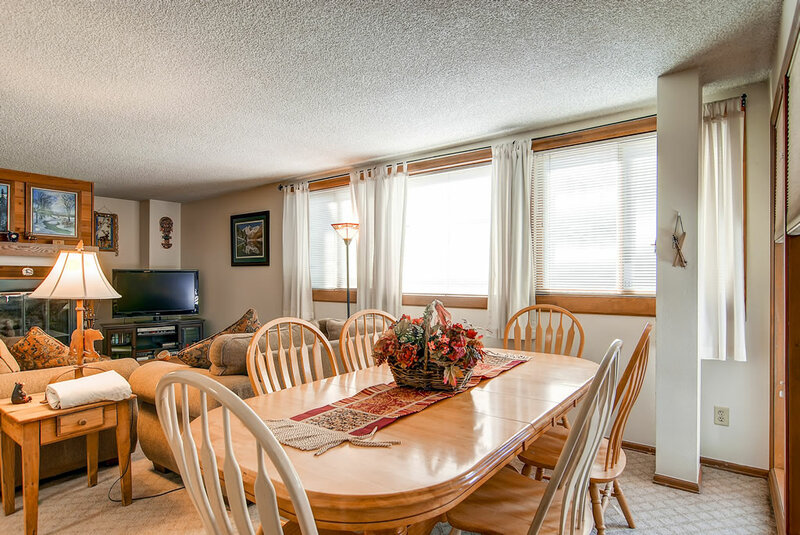 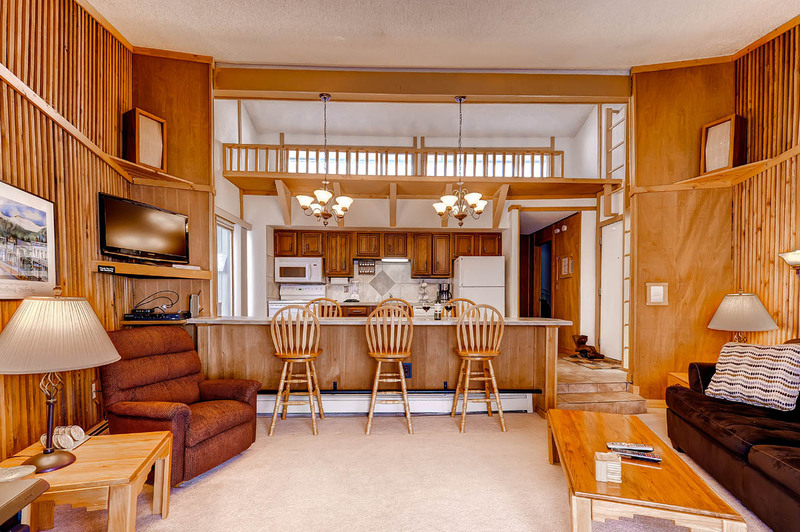 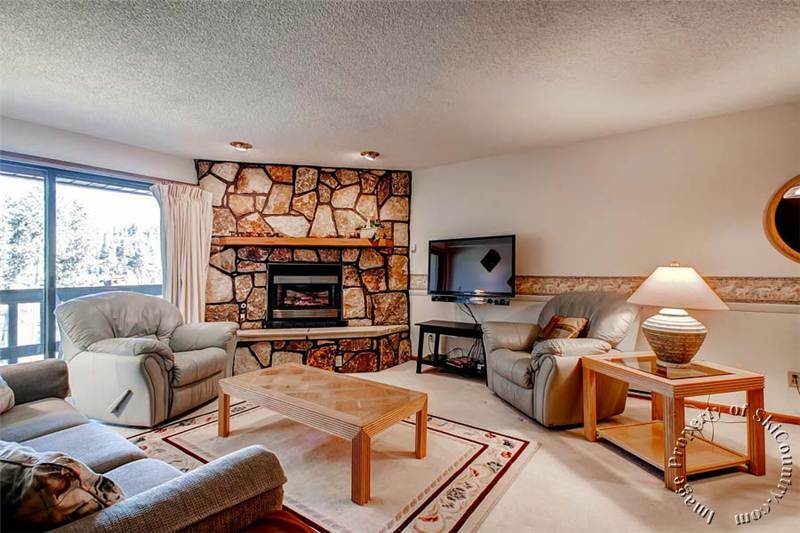 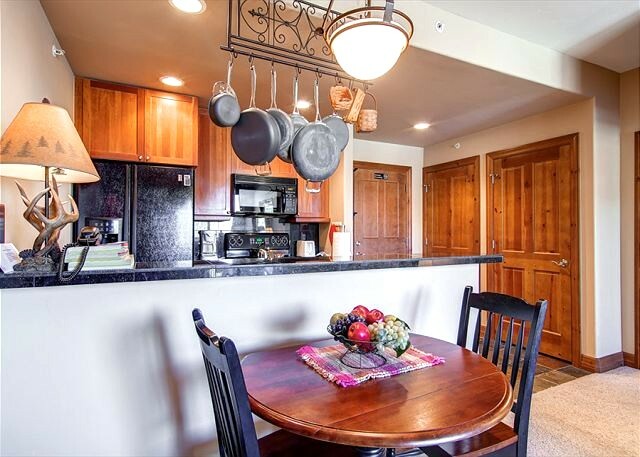 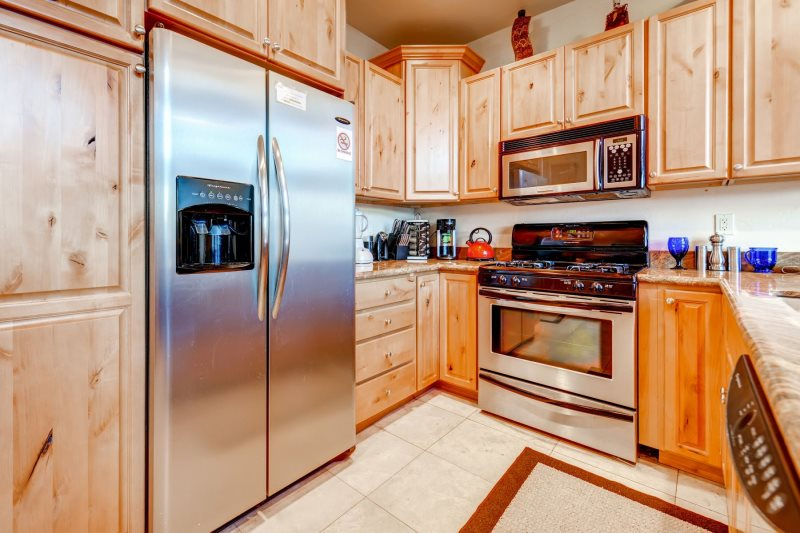 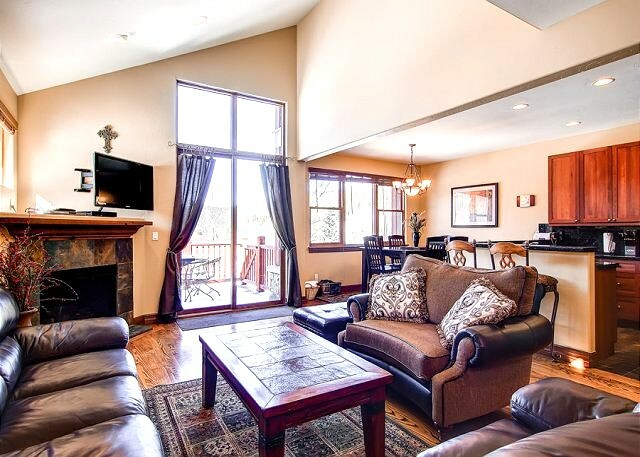 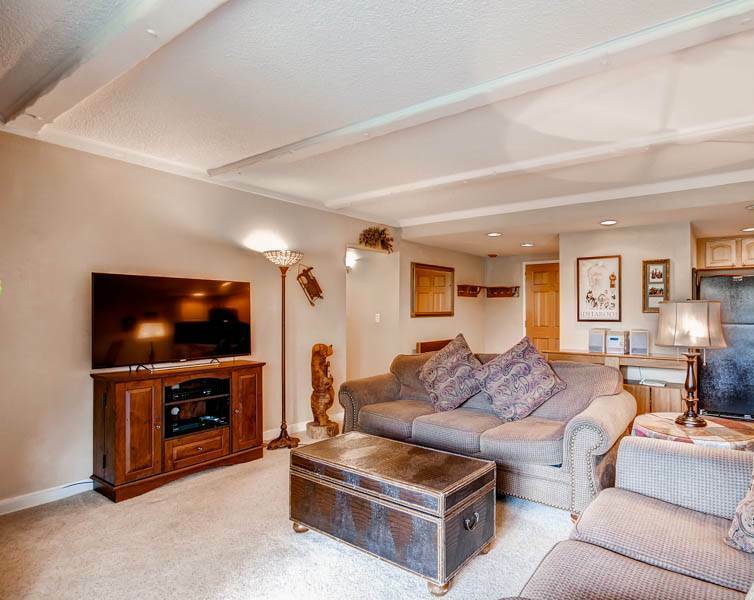 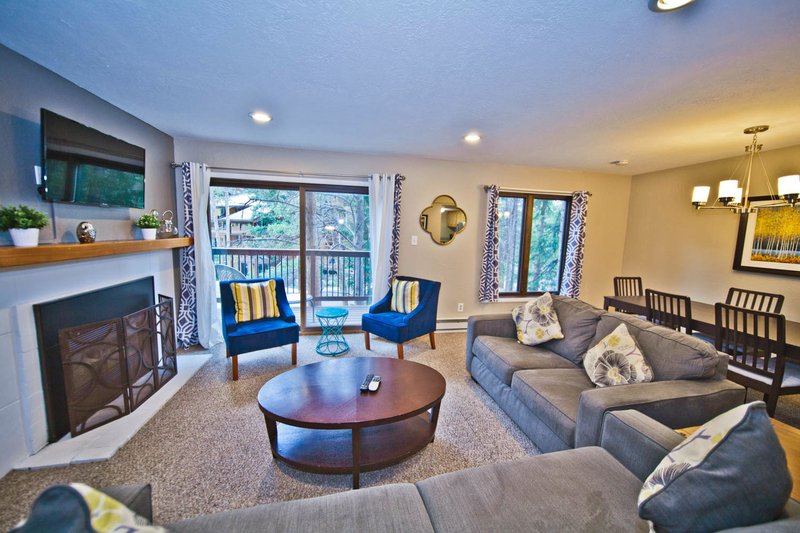 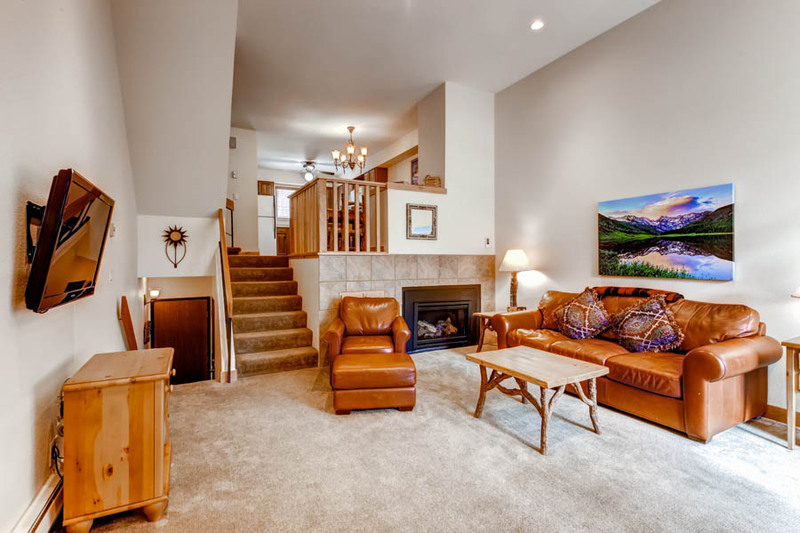 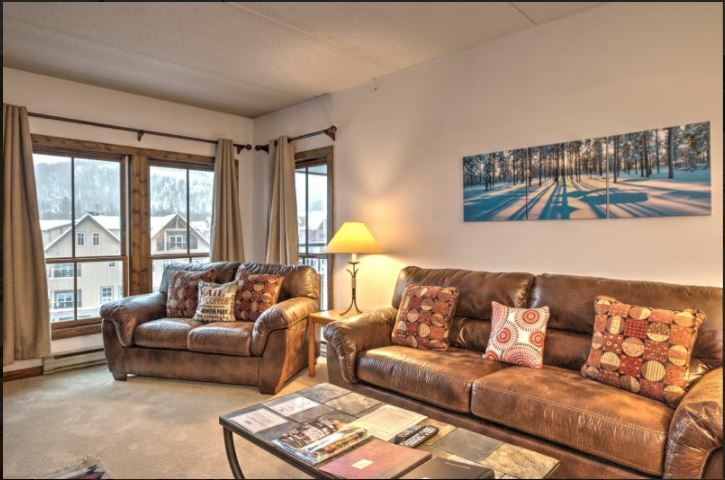 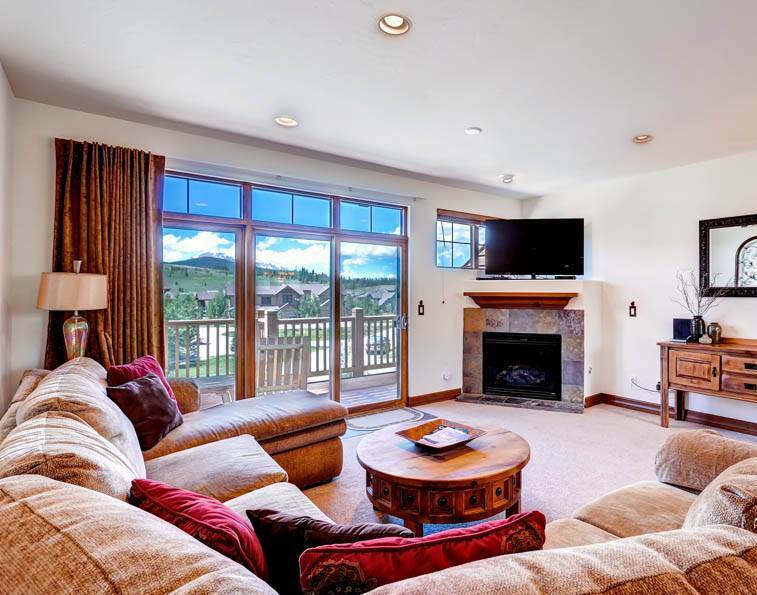 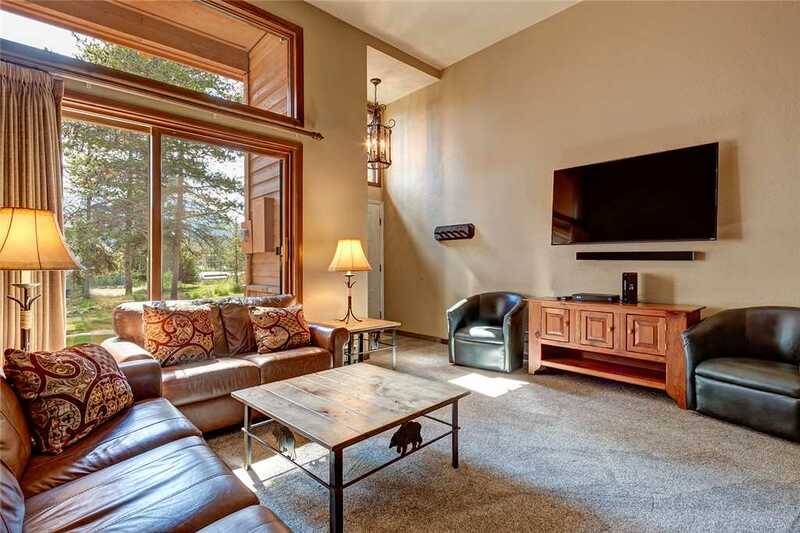 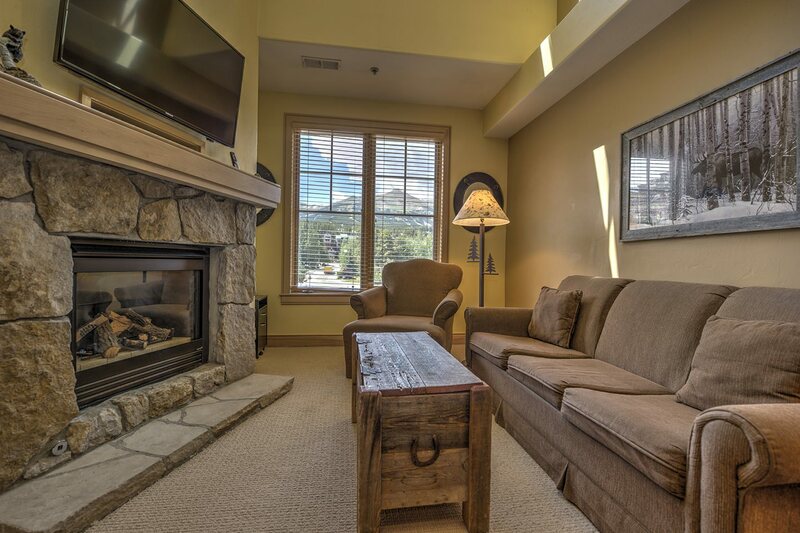 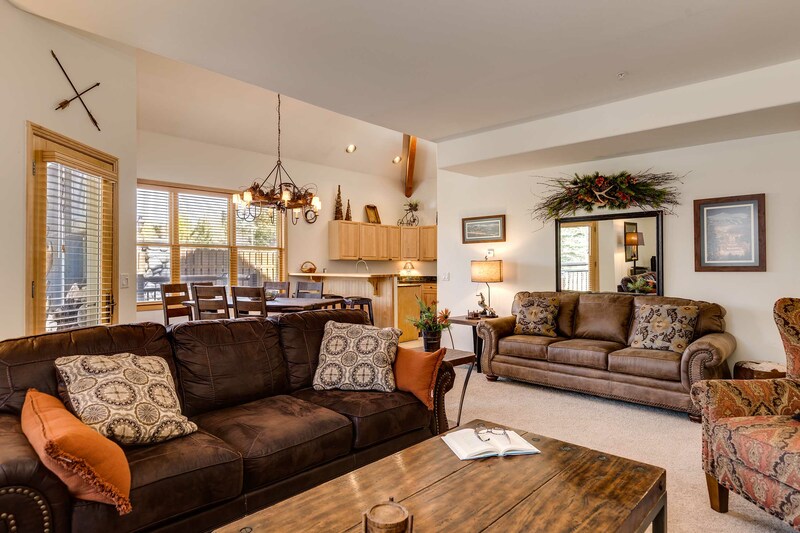 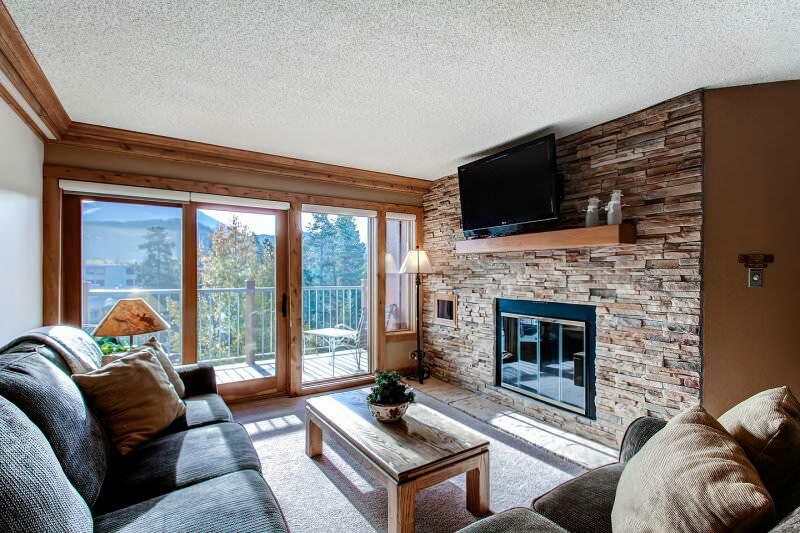 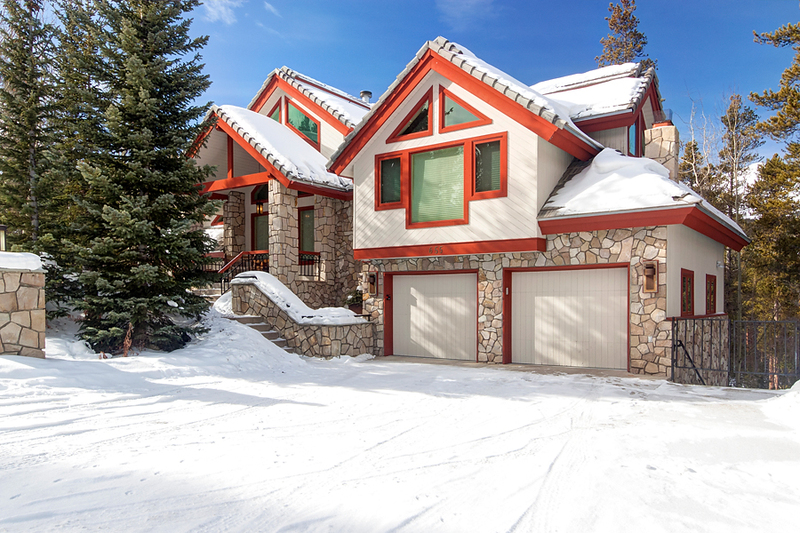 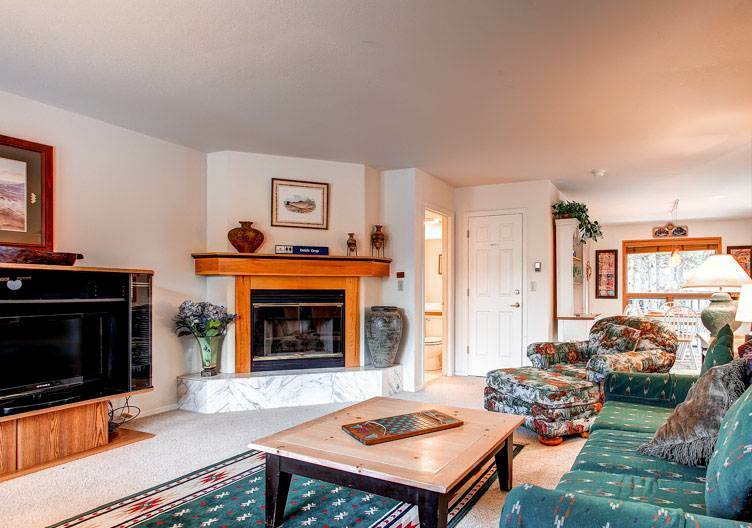 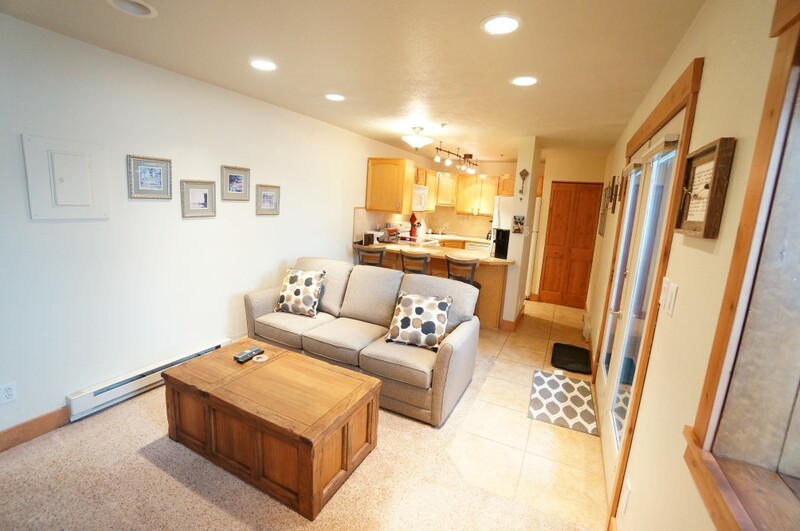 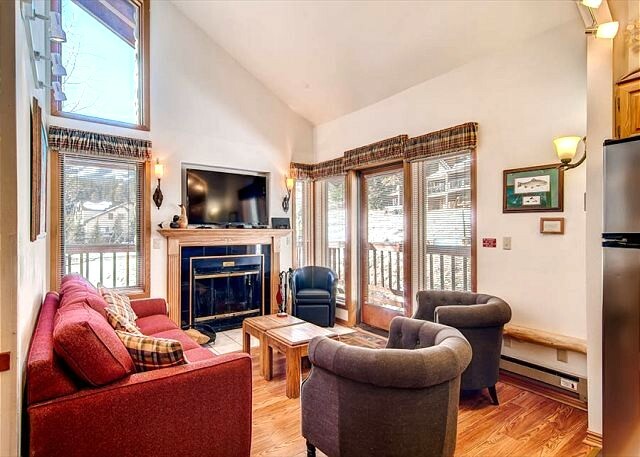 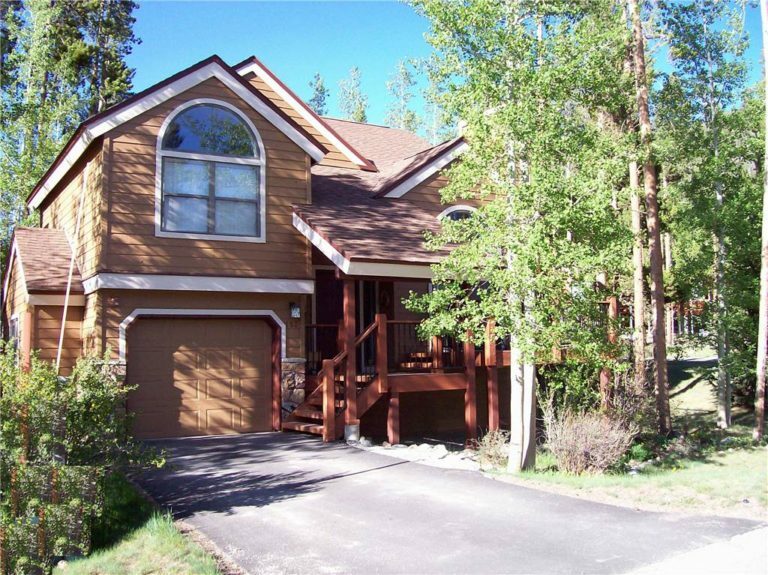 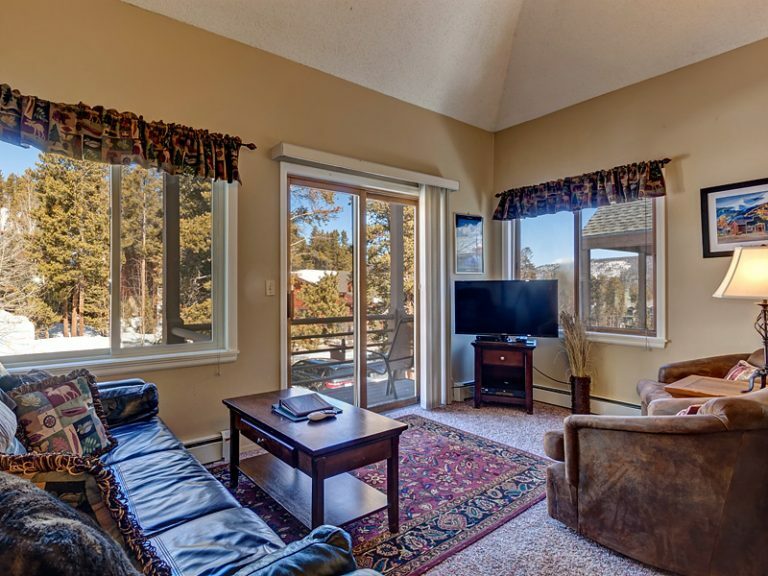 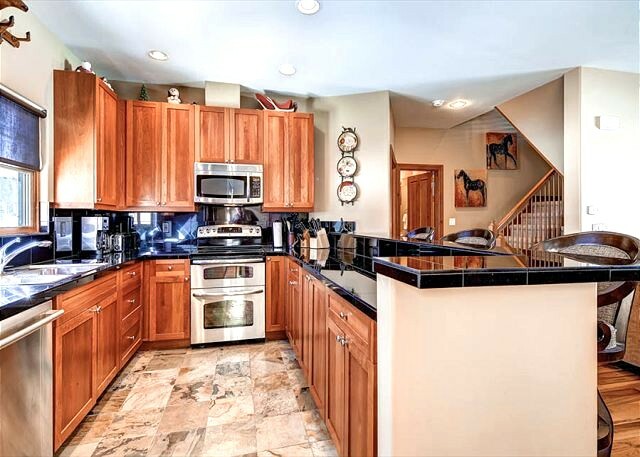 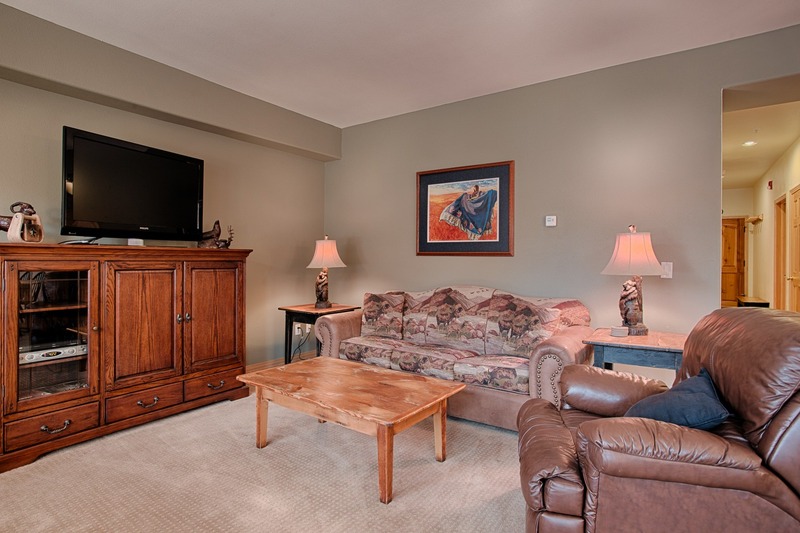 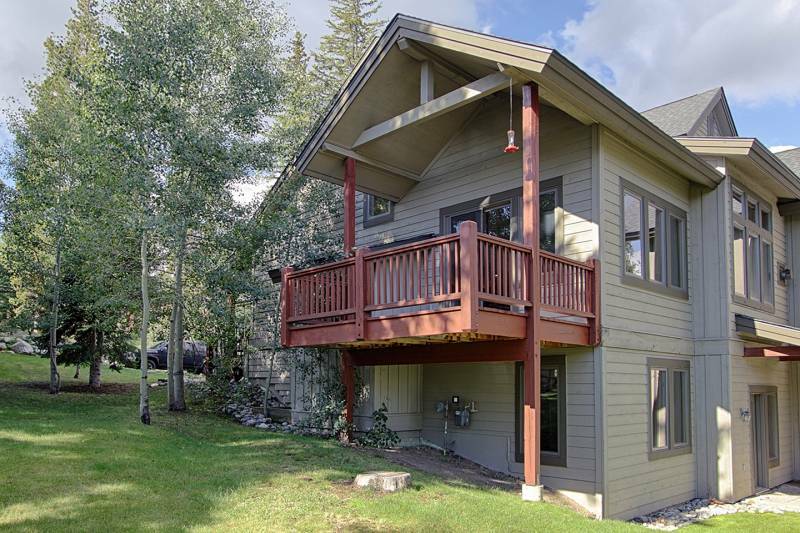 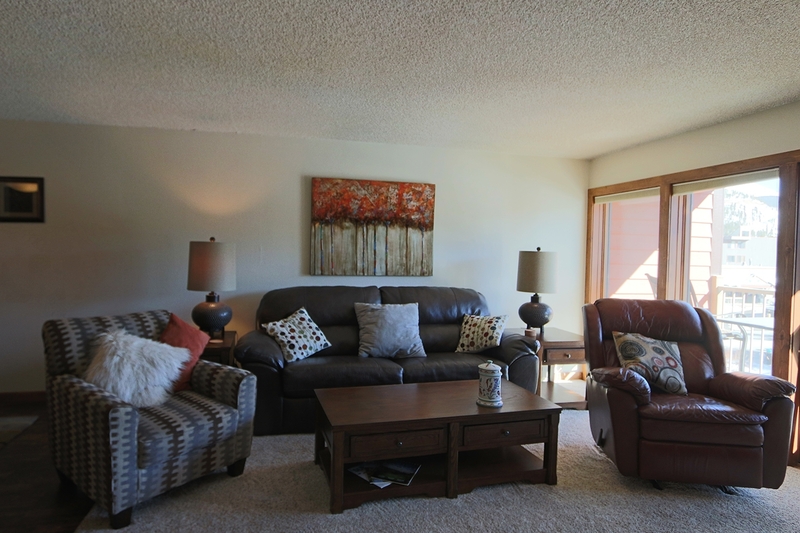 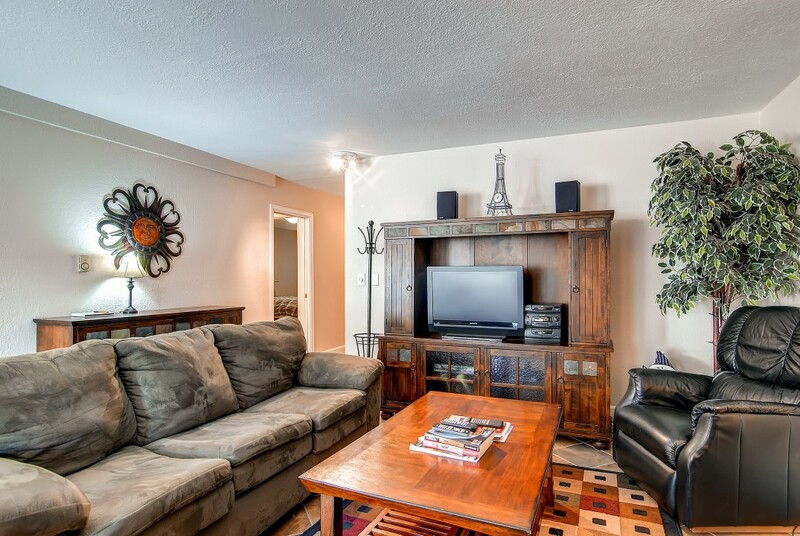 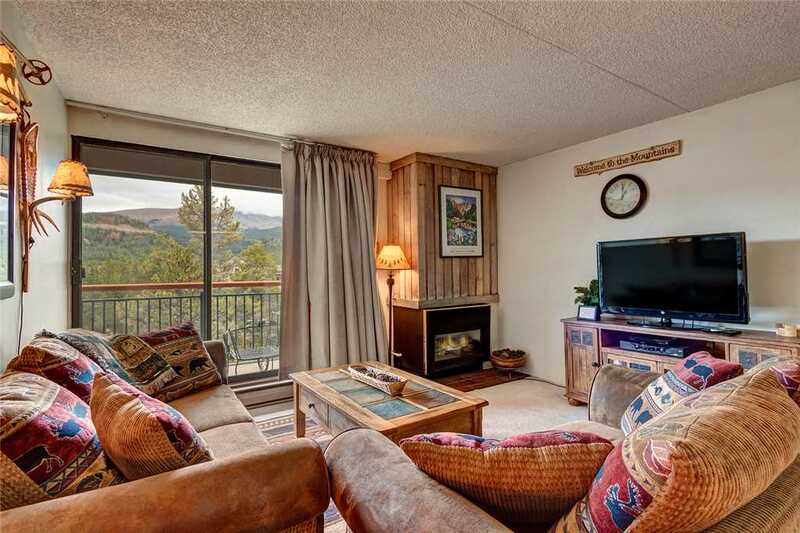 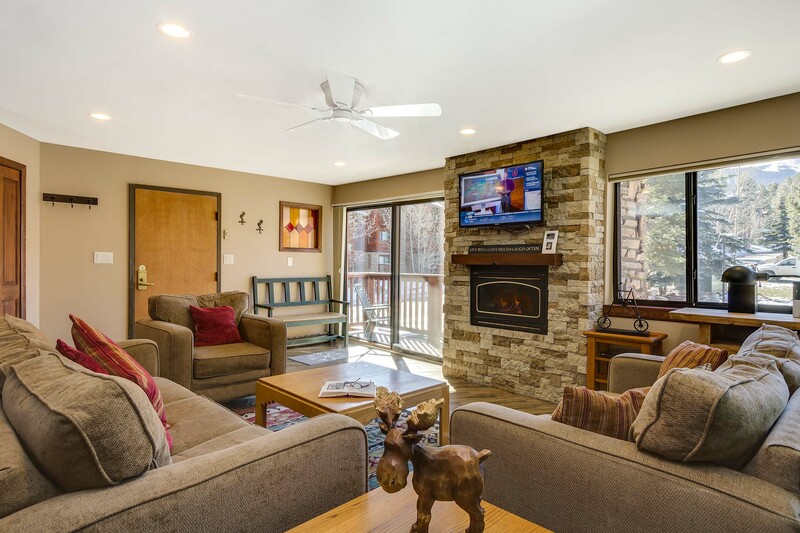 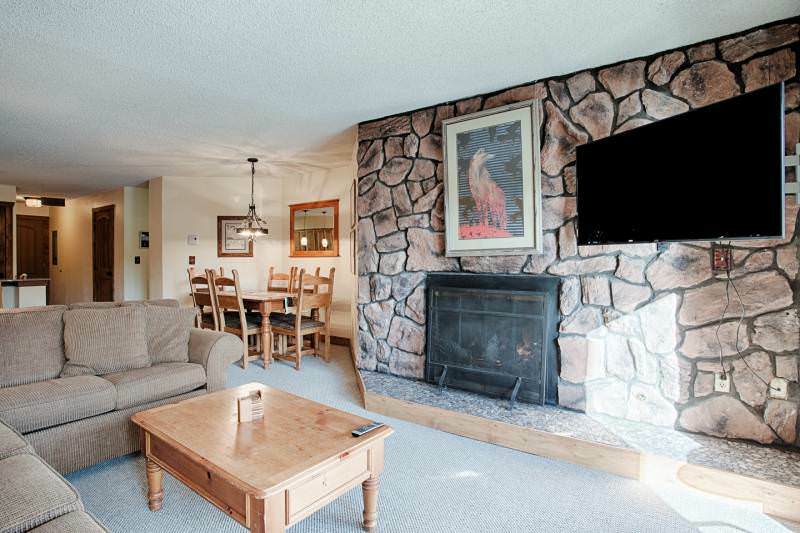 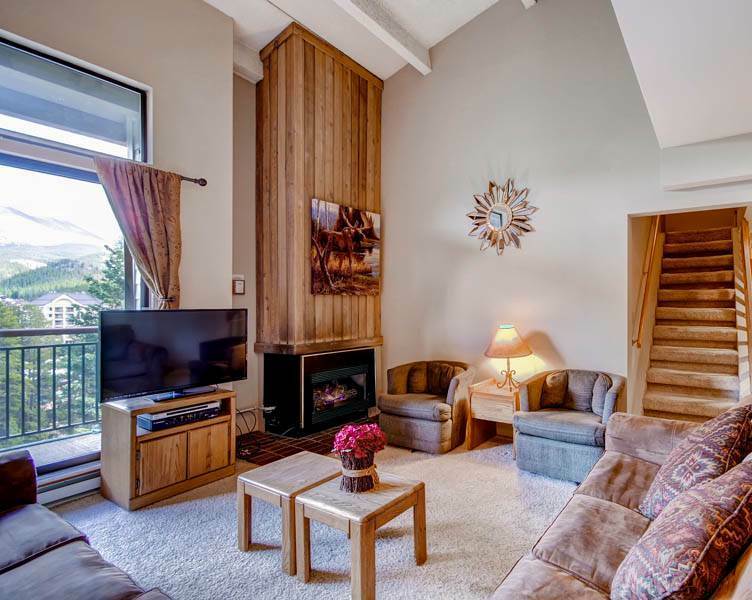 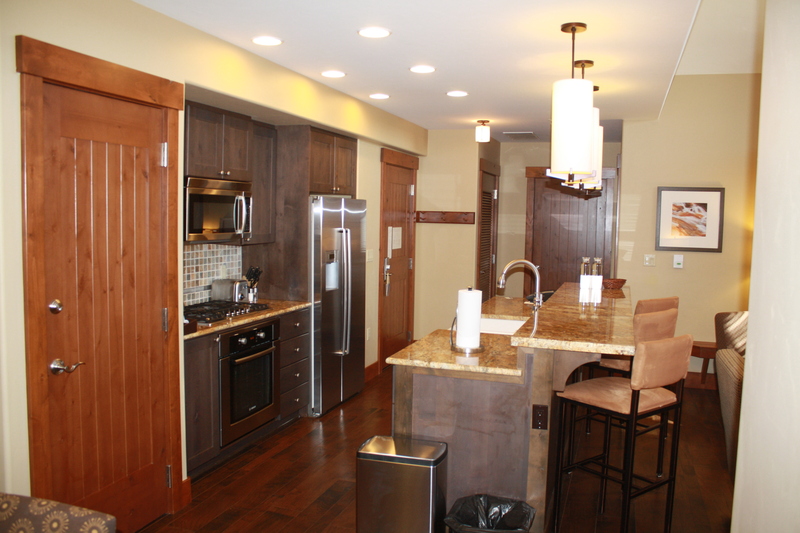 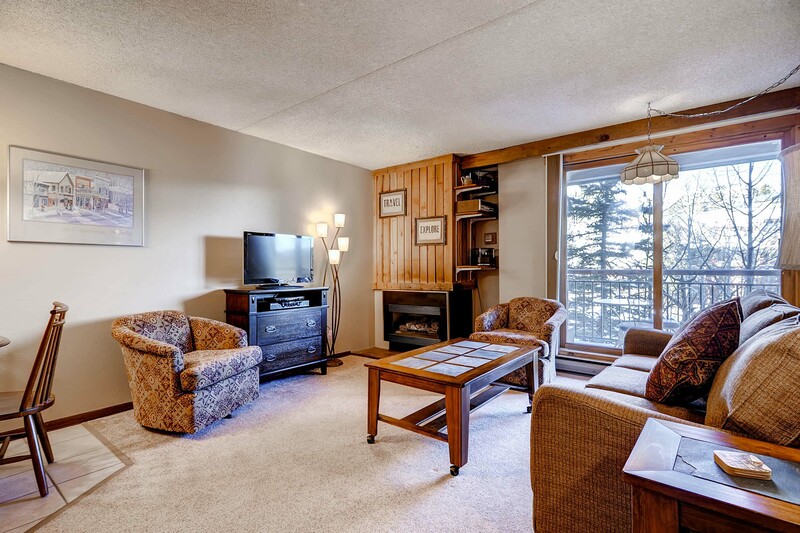 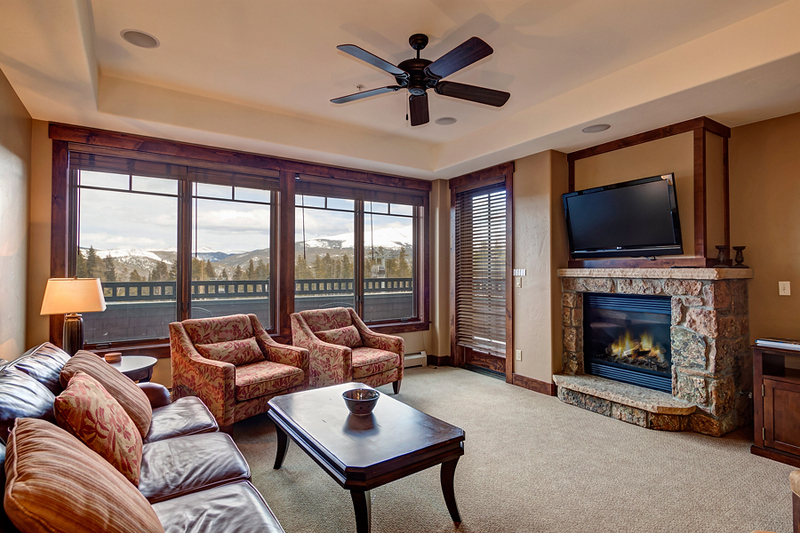 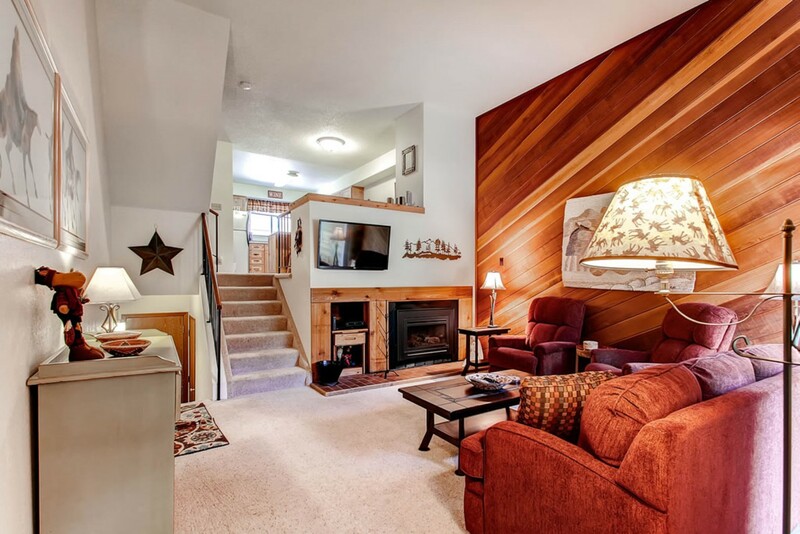 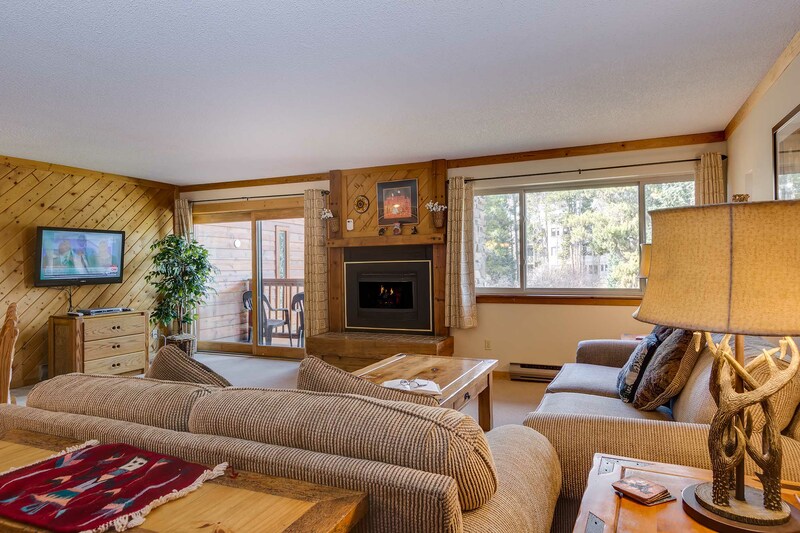 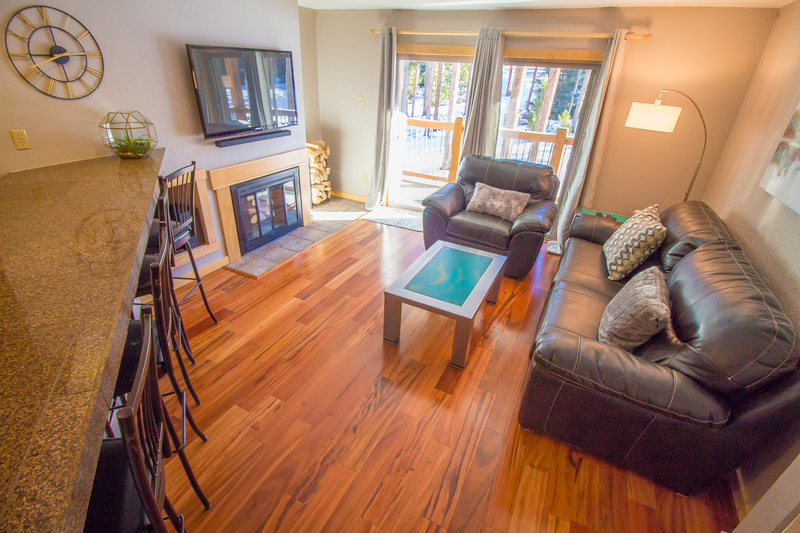 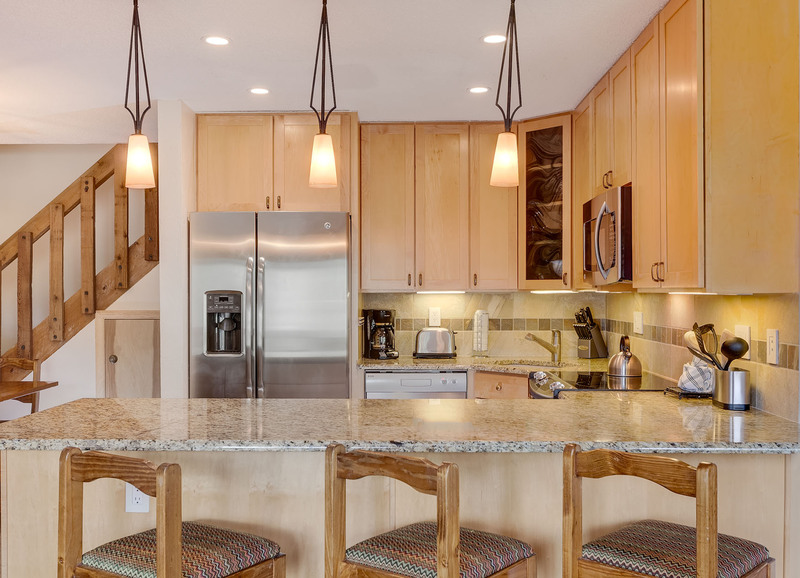 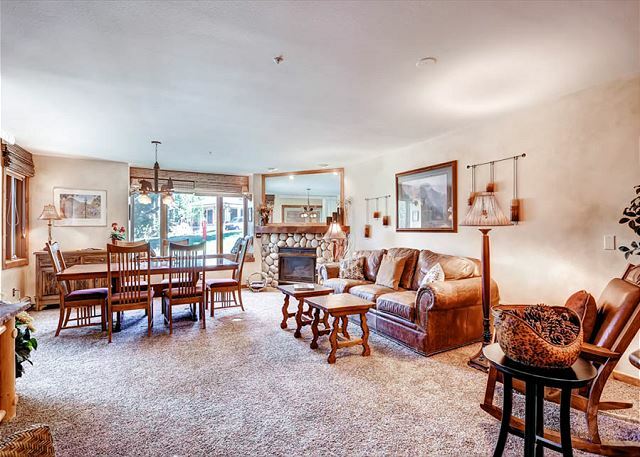 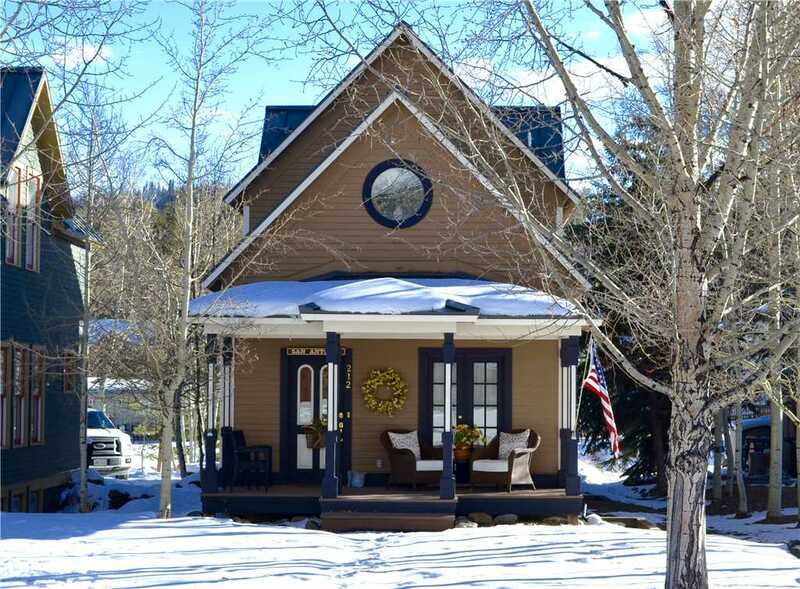 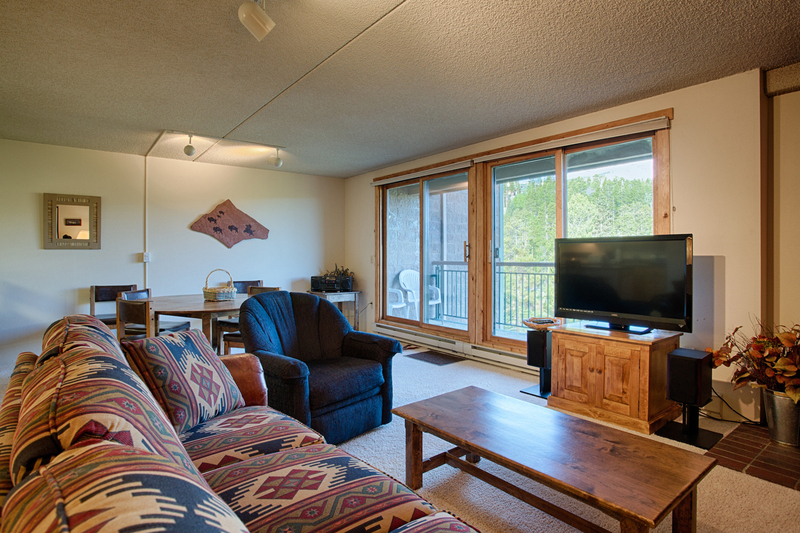 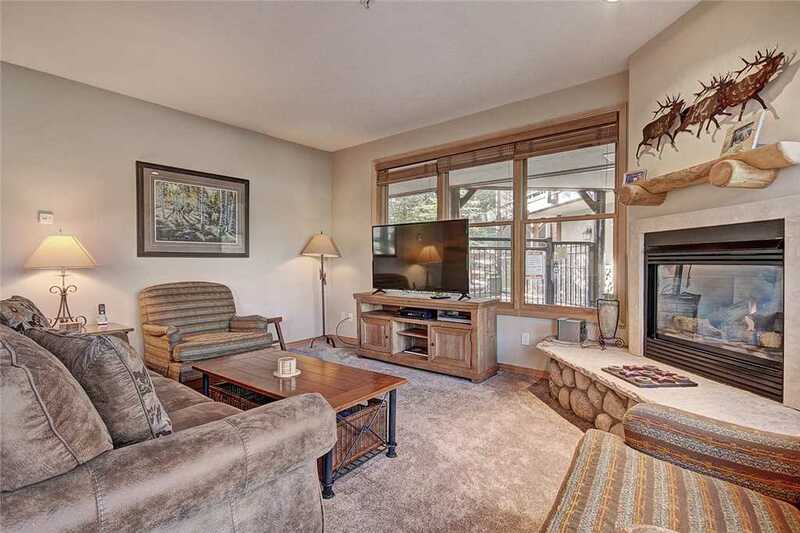 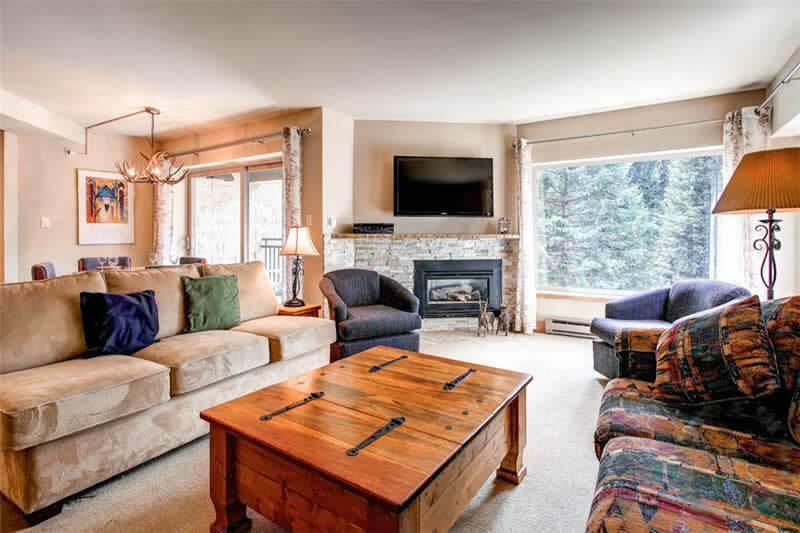 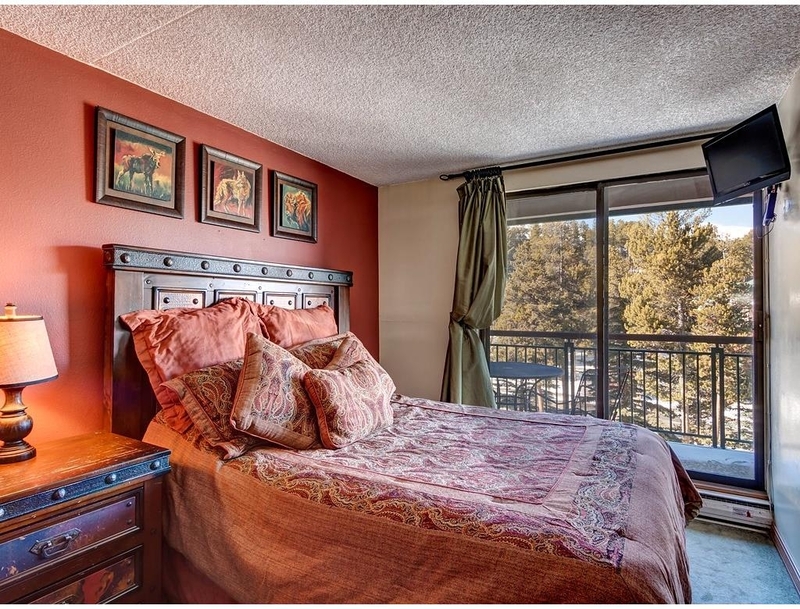 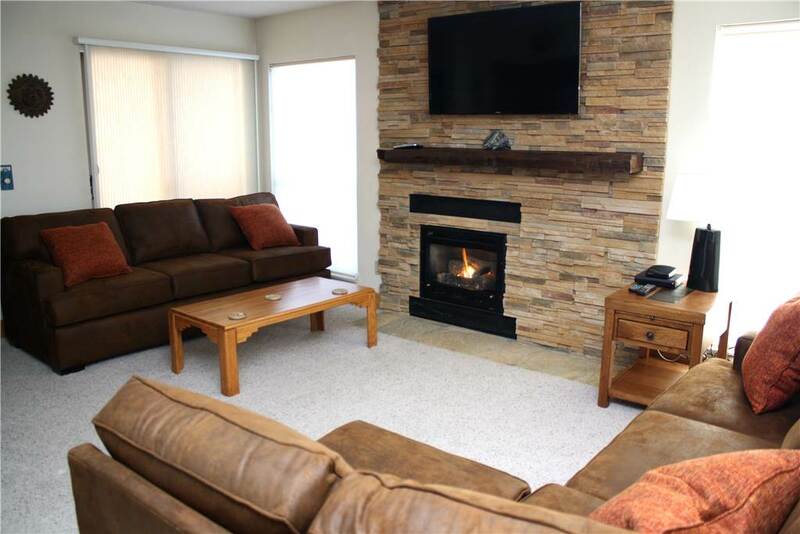 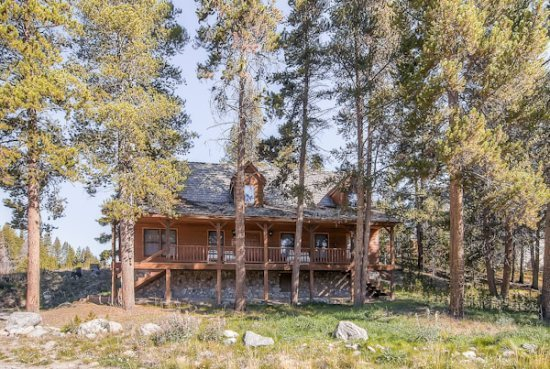 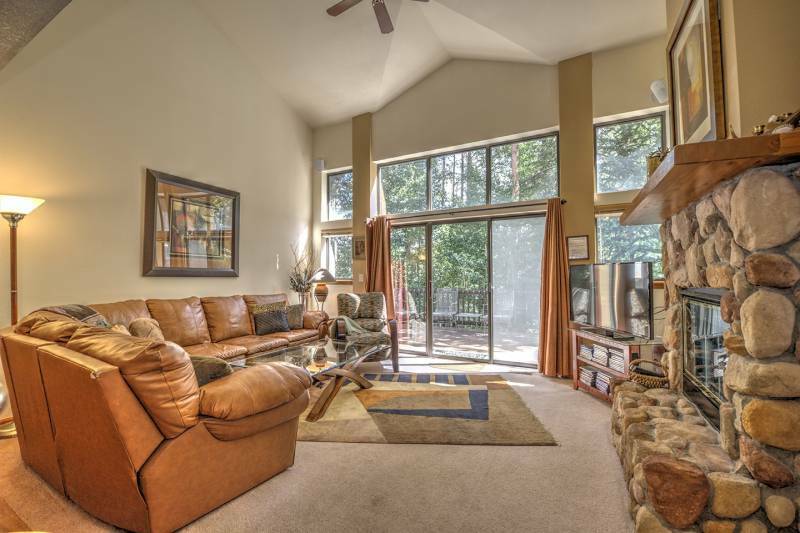 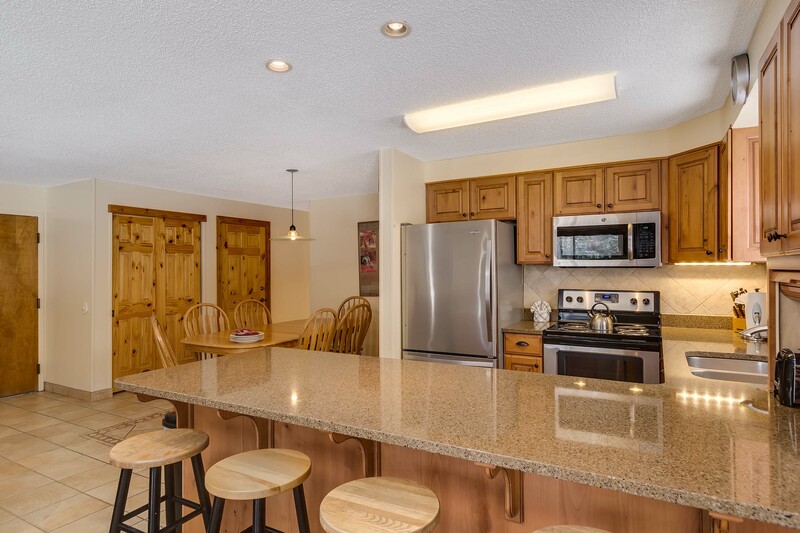 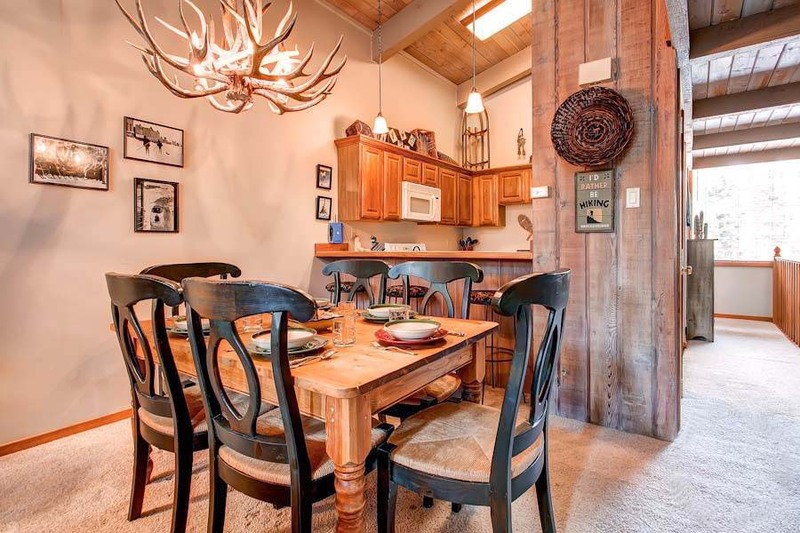 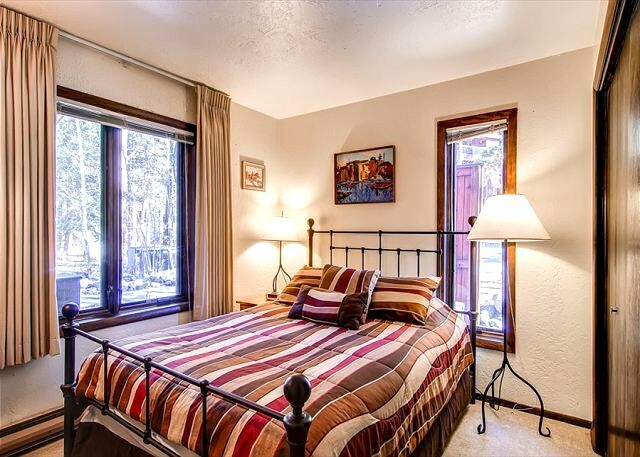 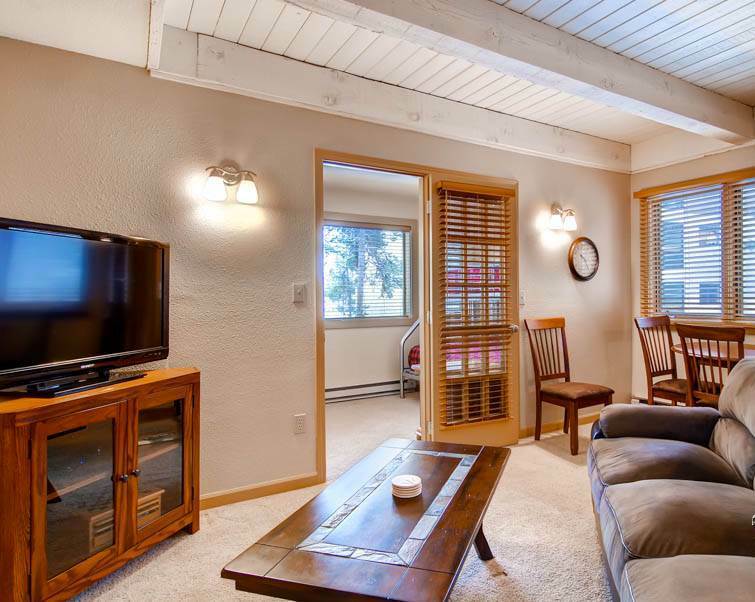 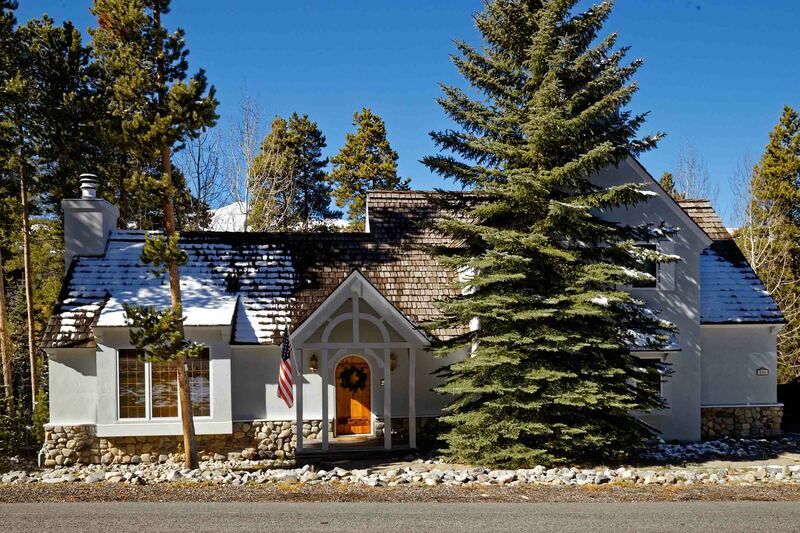 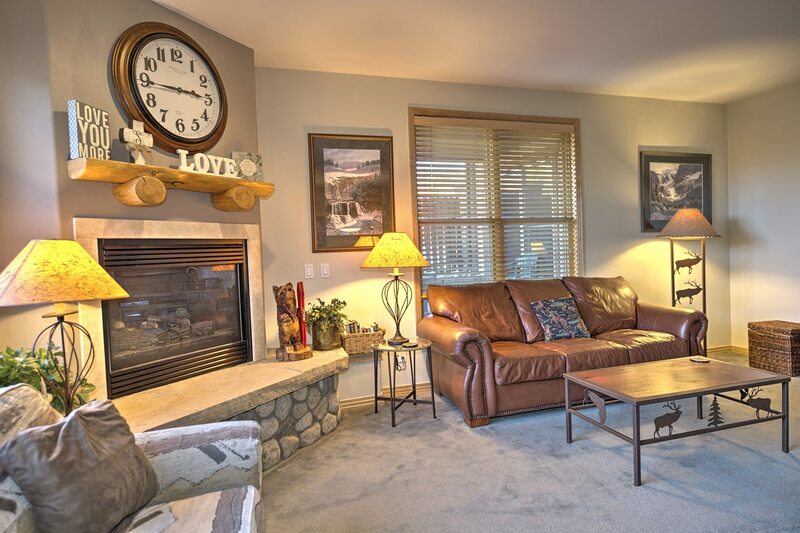 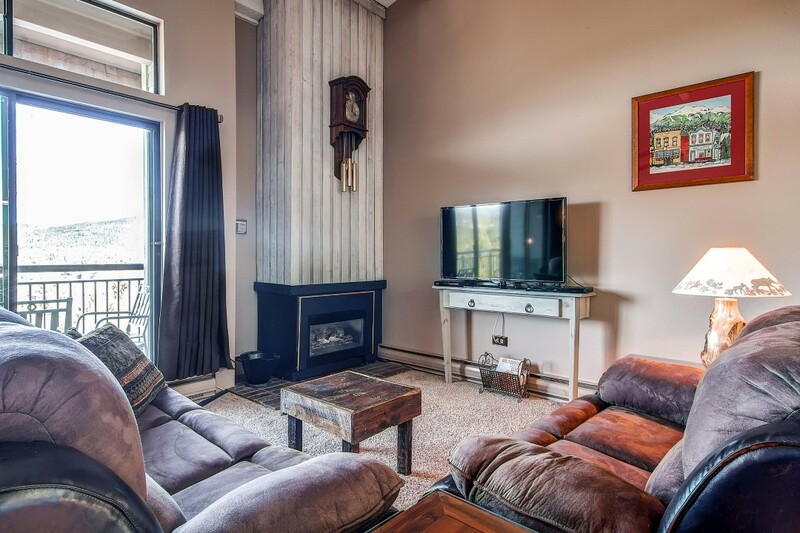 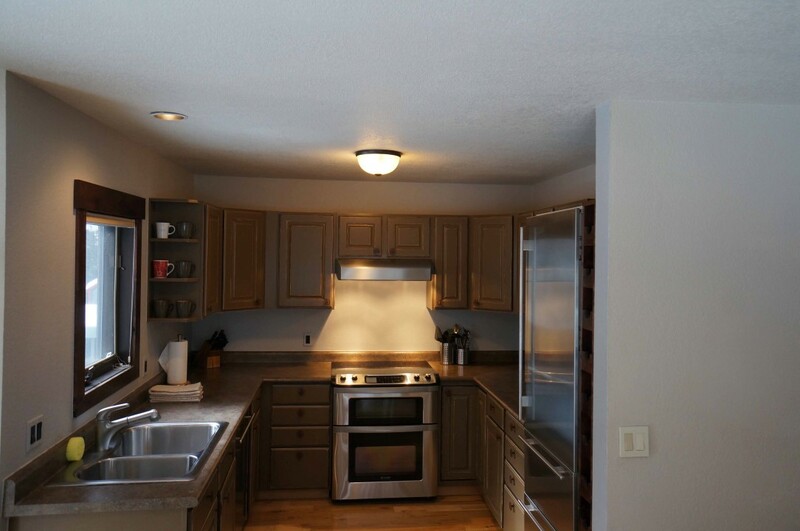 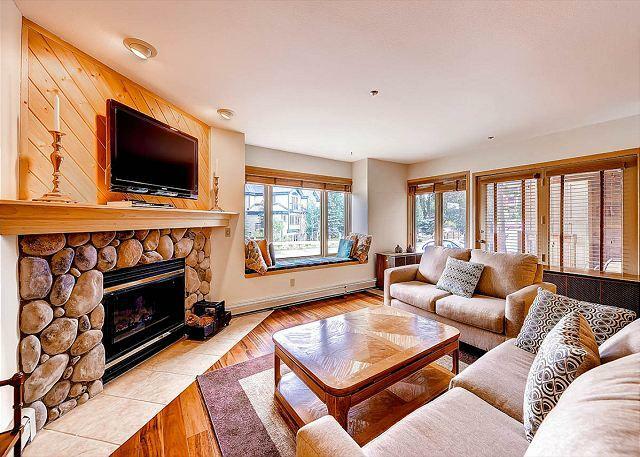 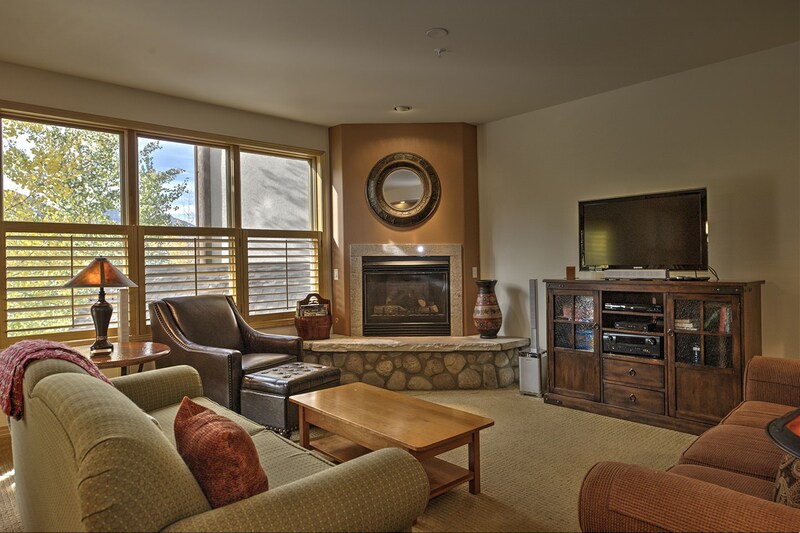 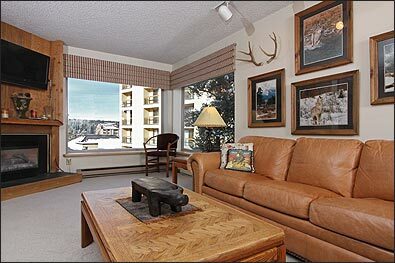 This condo features a gas fireplace, private balcony, granite counters, multiple modern TVs, gas BBQ grill, private washer/dryer, ski locker, onsite hot tubs and fire pit as well as access to the Upper Village Clubhouse with an indoor/outdoor pool and hot tubs. 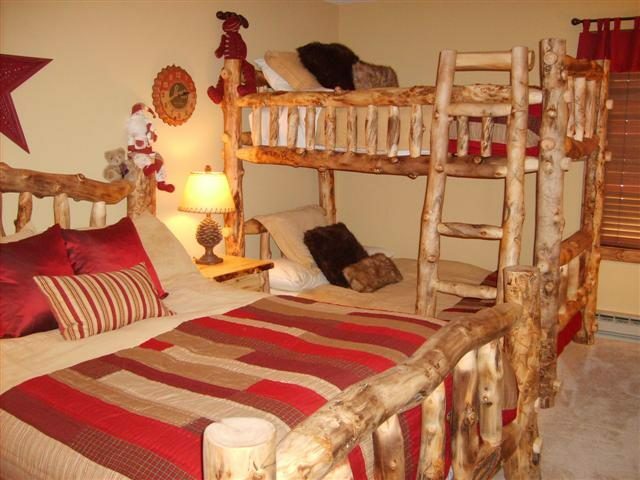 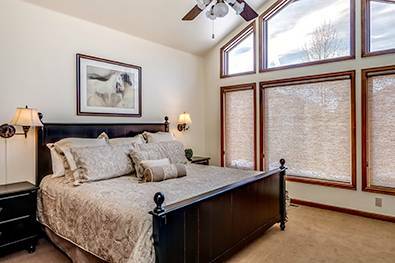 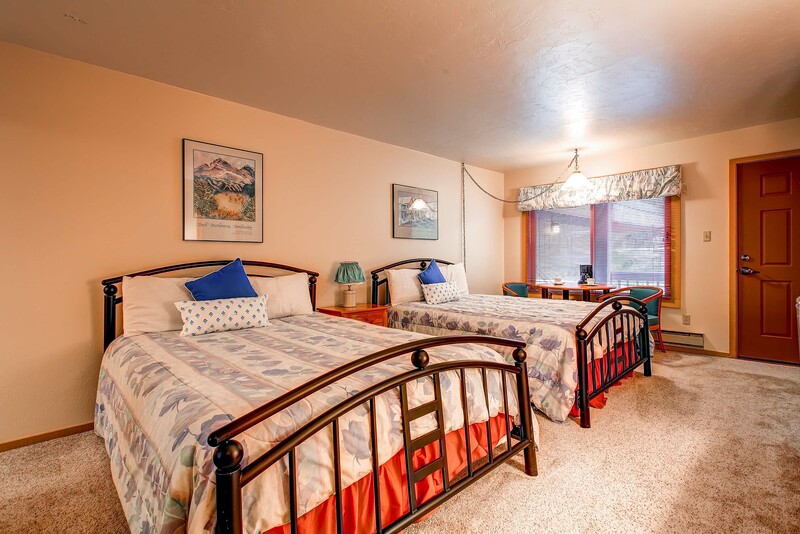 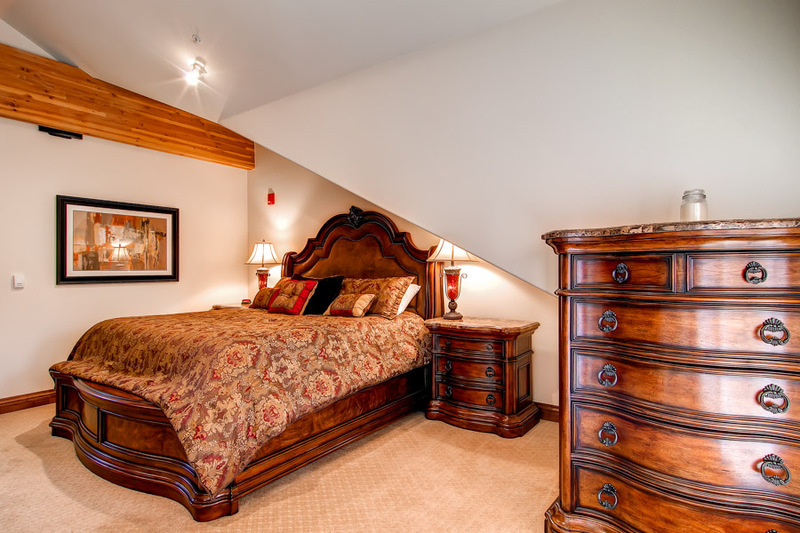 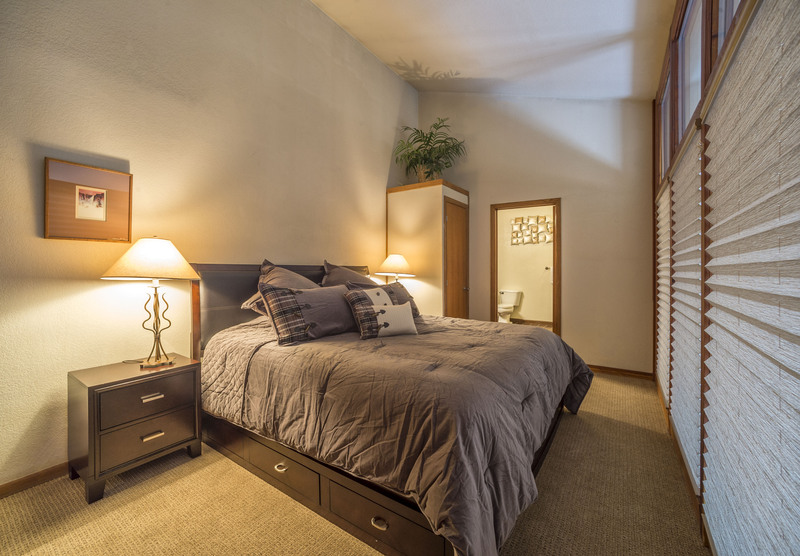 There are two bedrooms including a king bedroom and a bunk bedroom with a sleeper sofa in the living room for additional sleeping space. 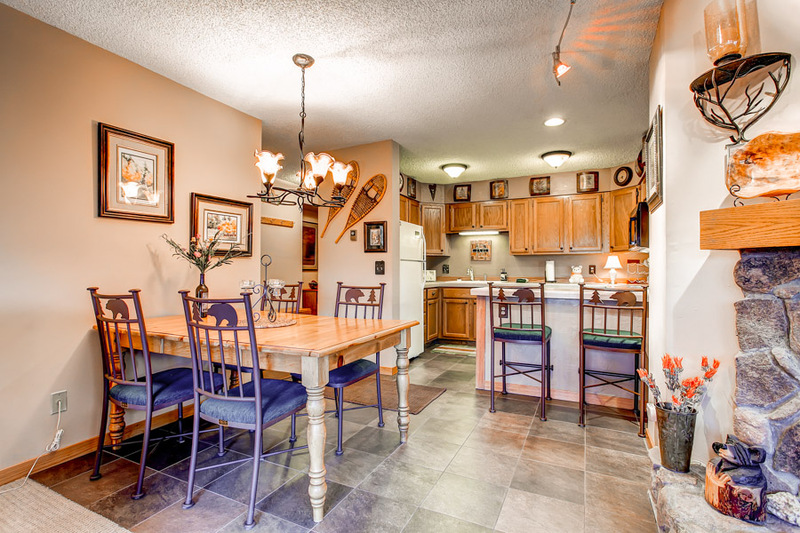 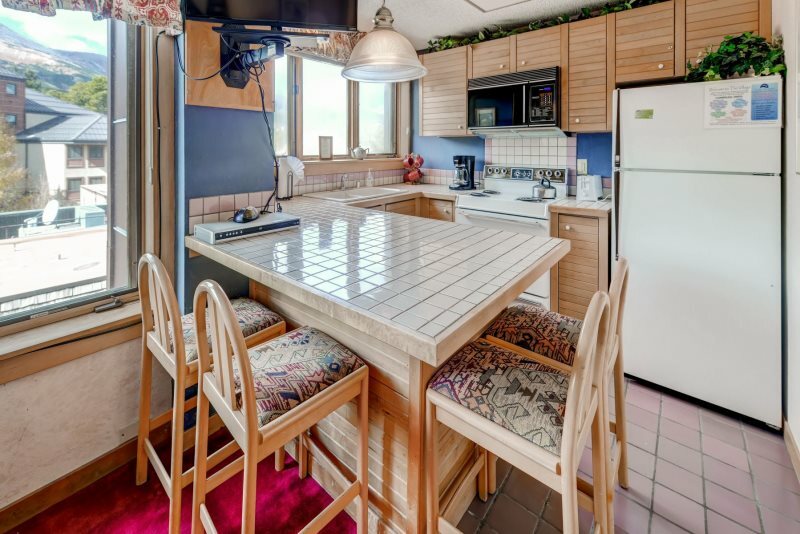 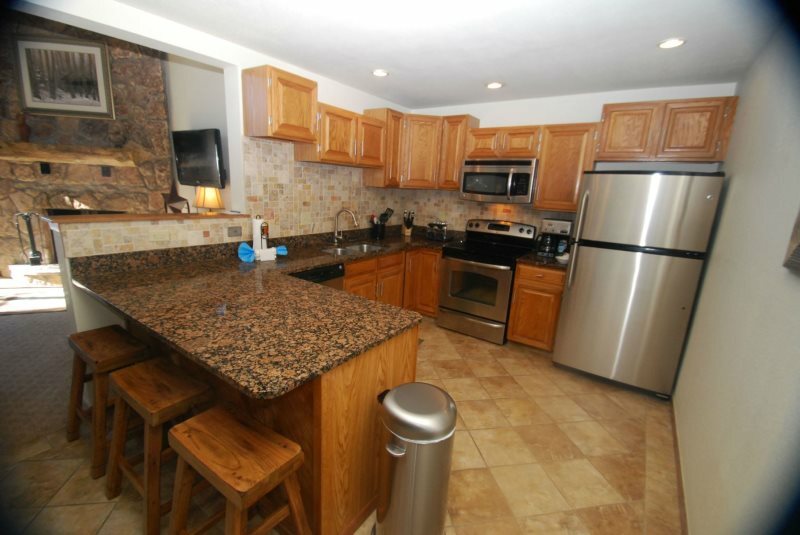 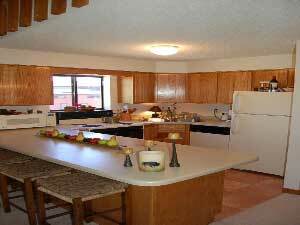 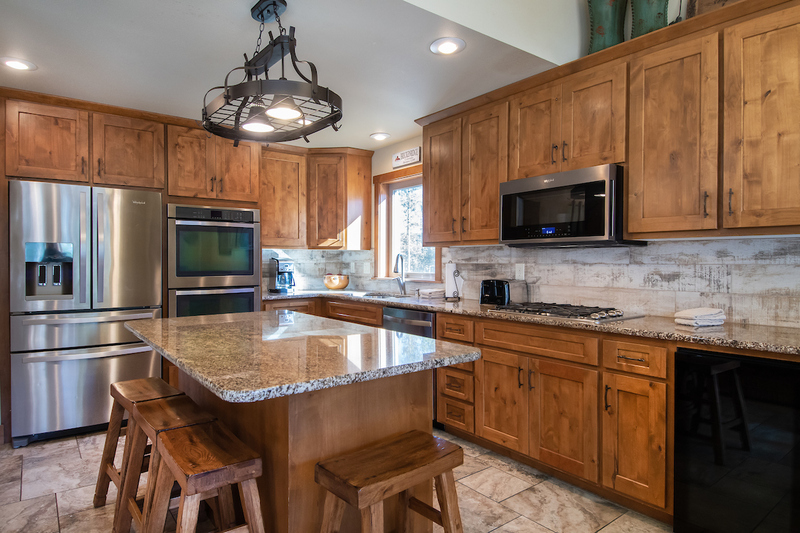 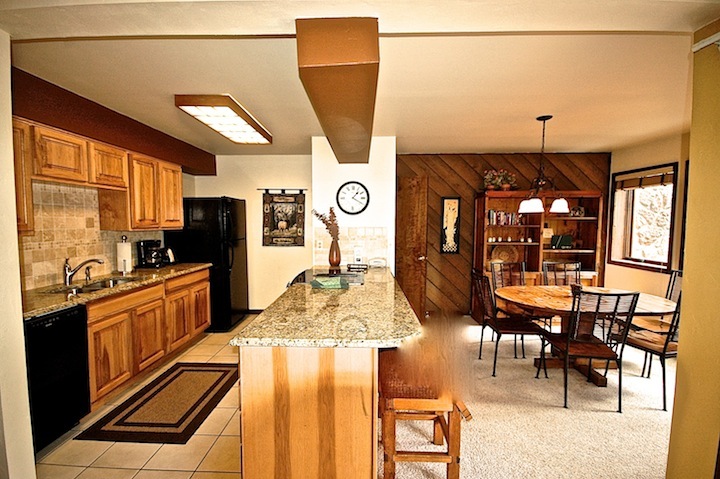 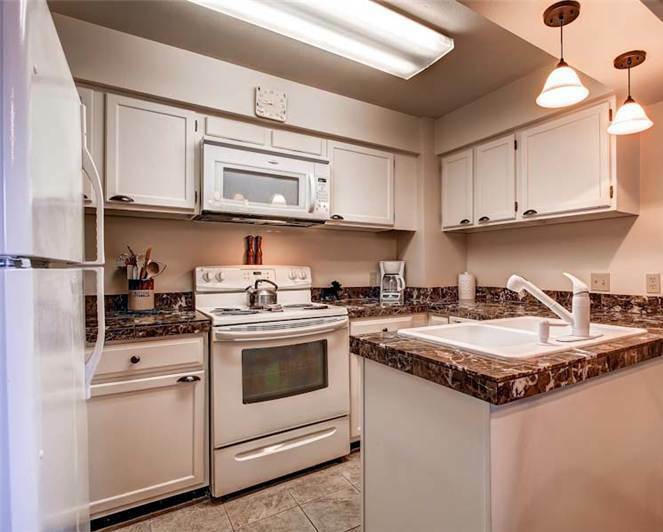 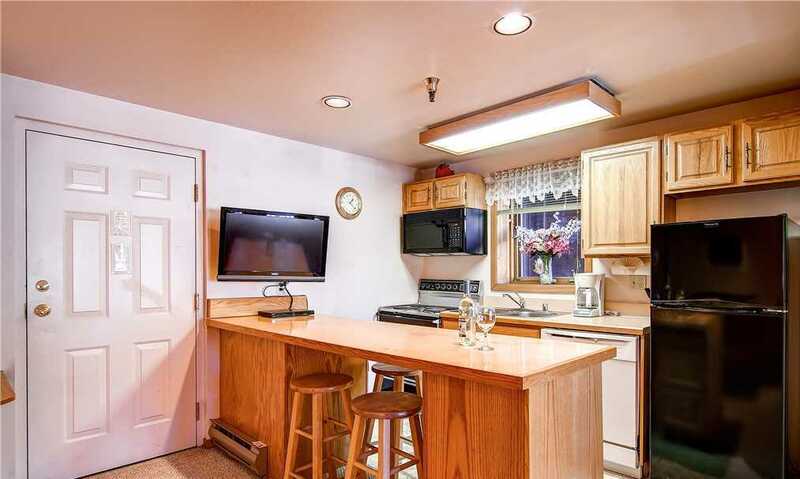 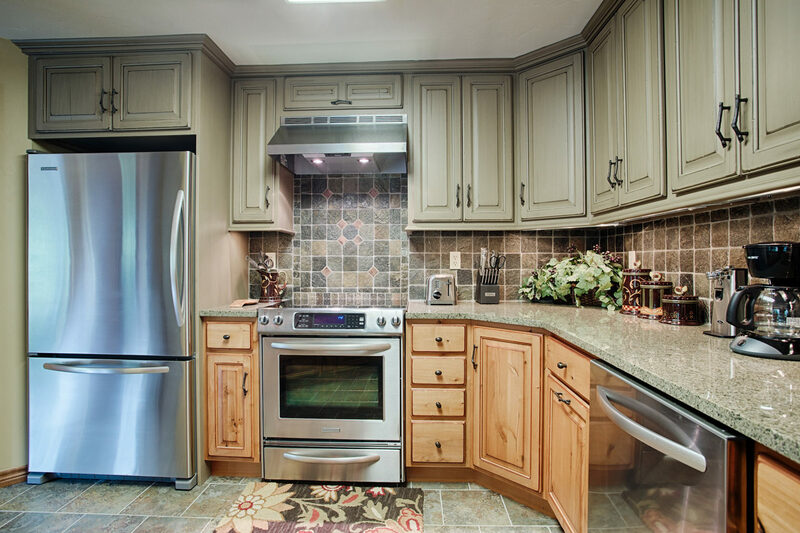 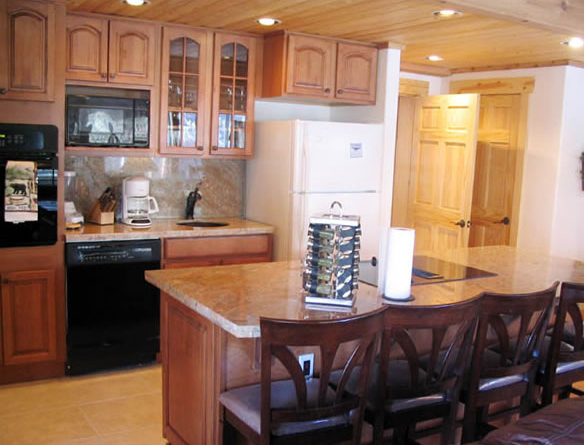 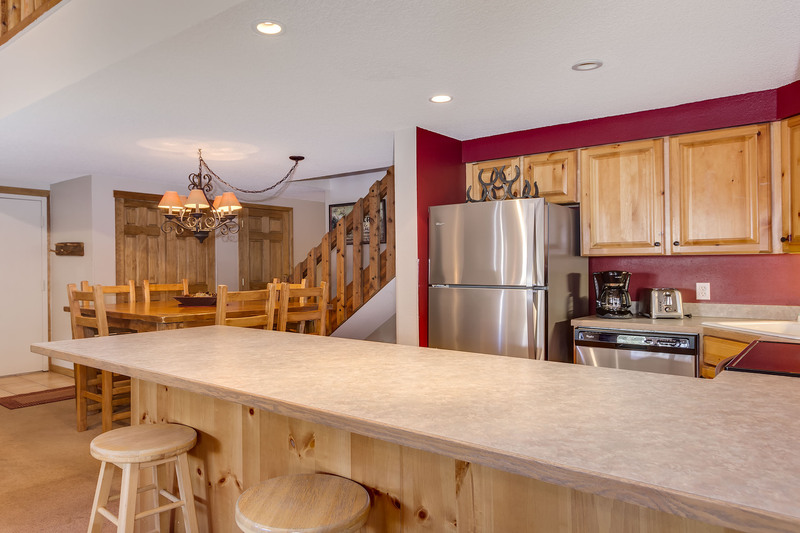 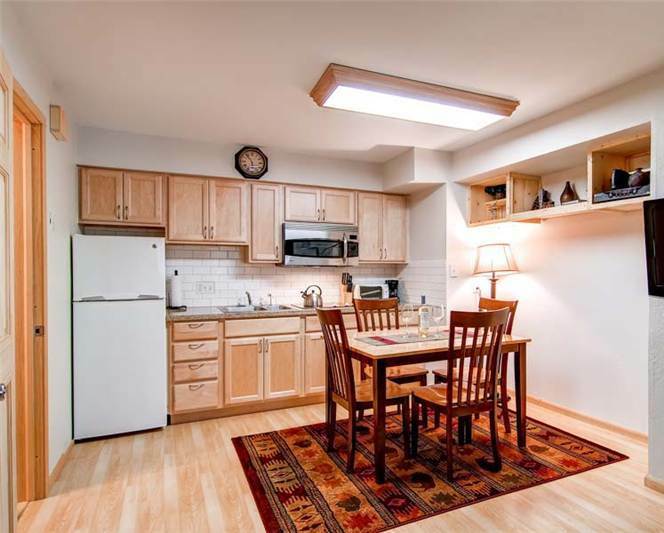 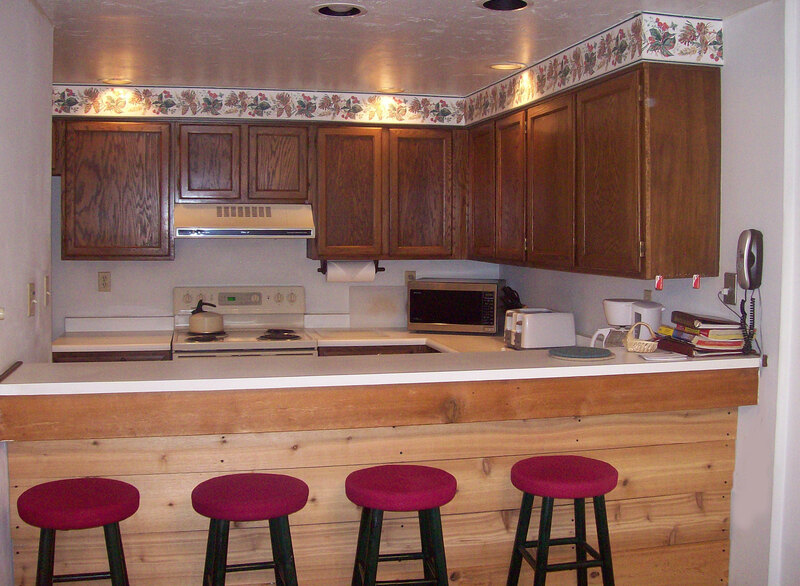 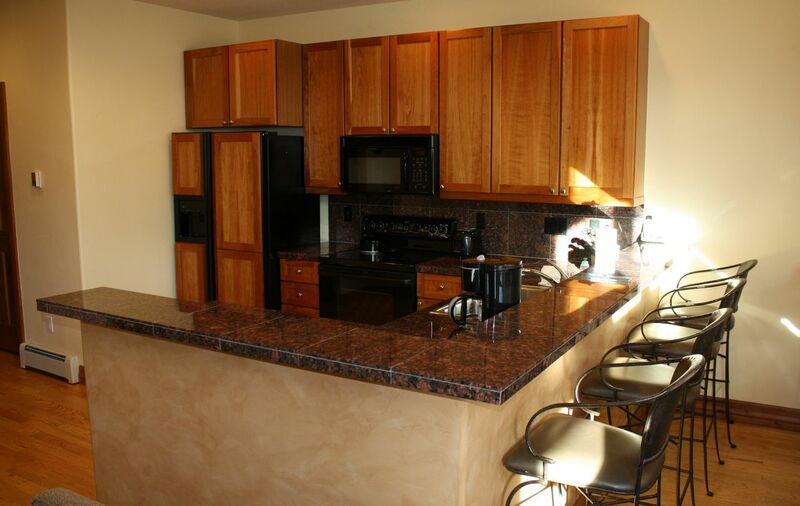 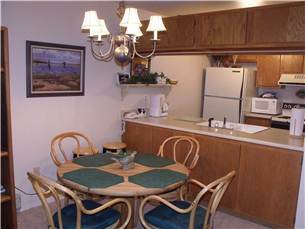 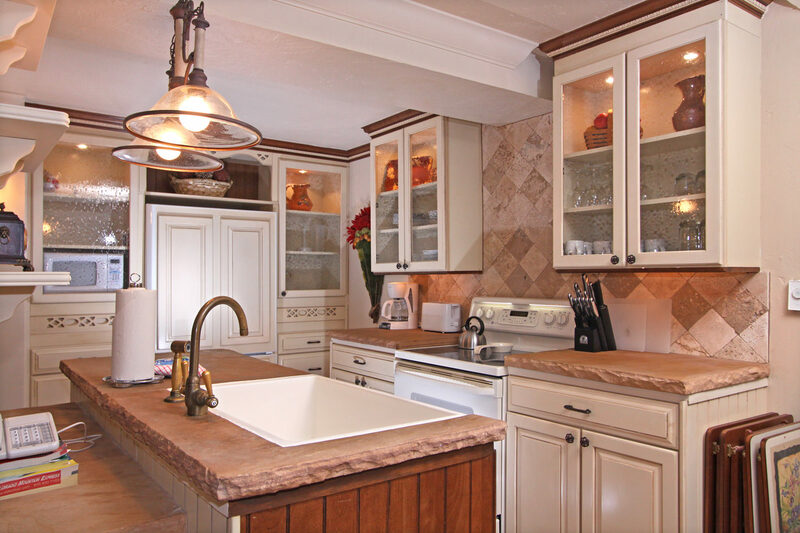 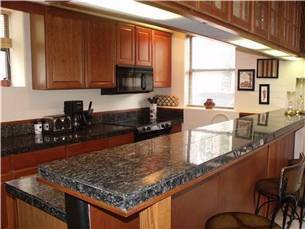 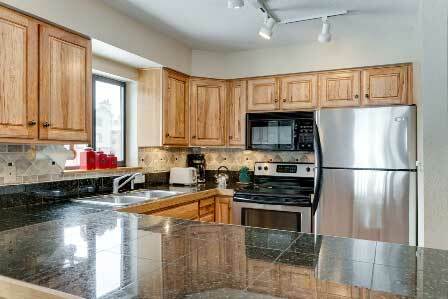 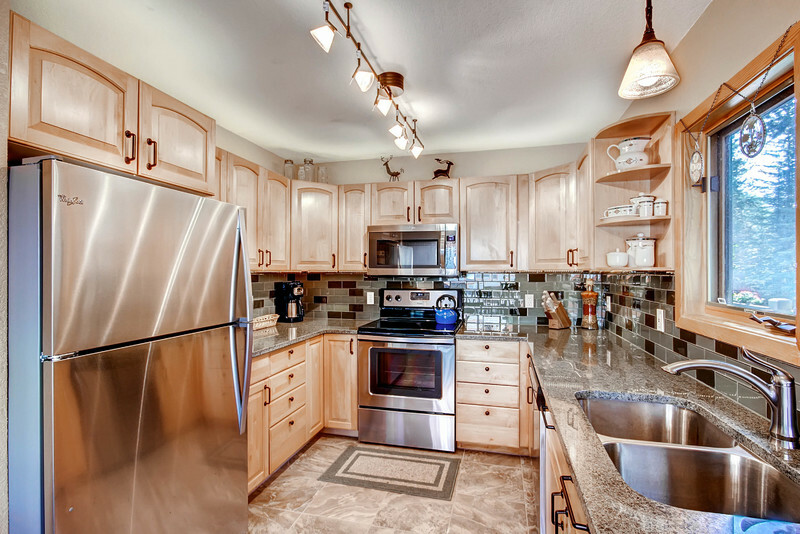 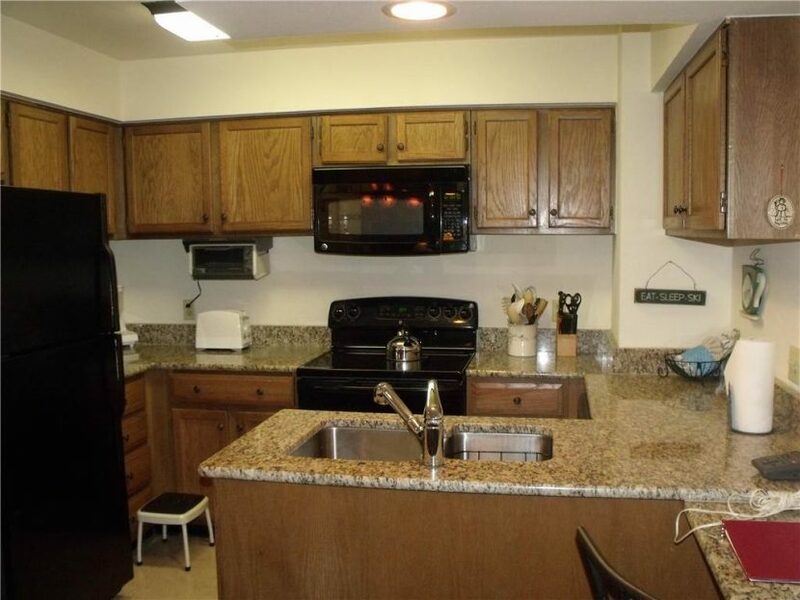 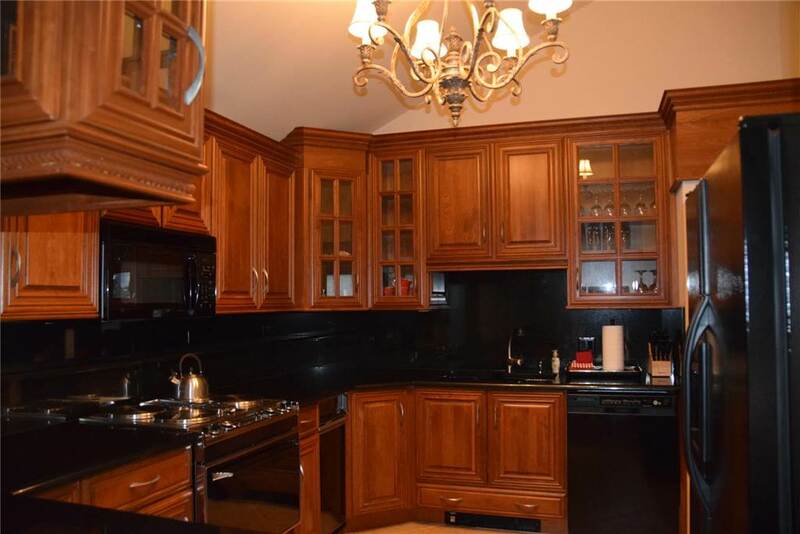 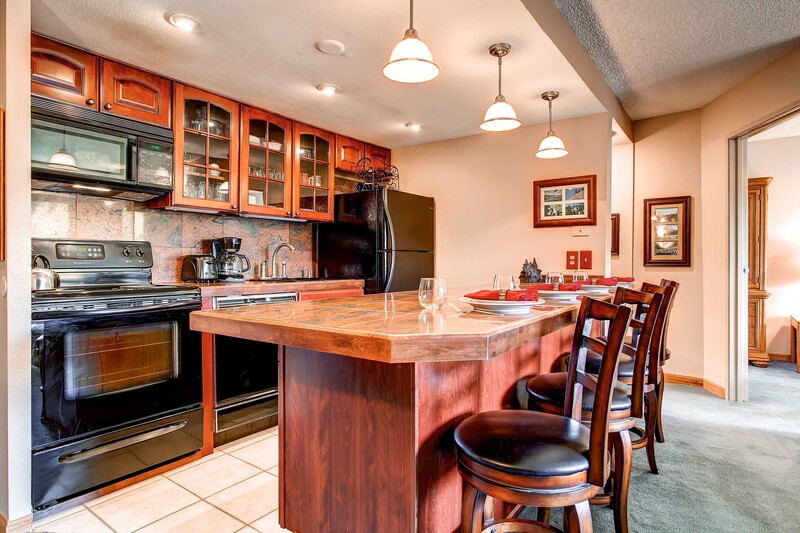 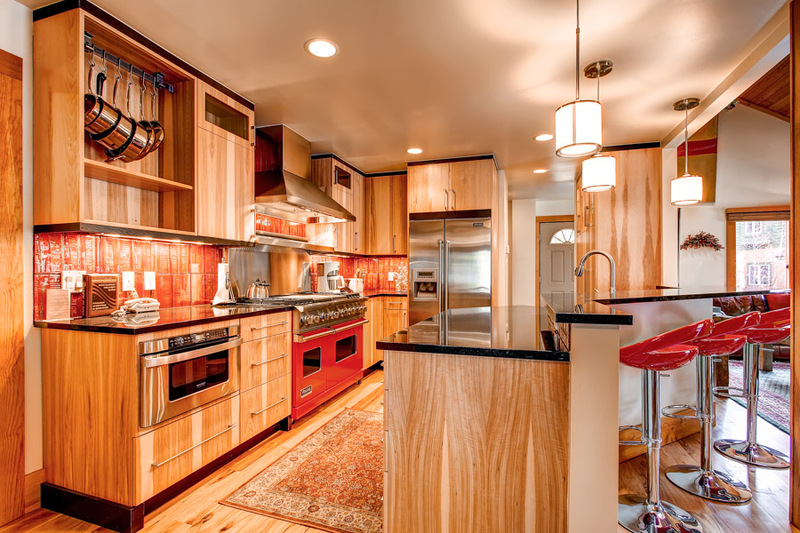 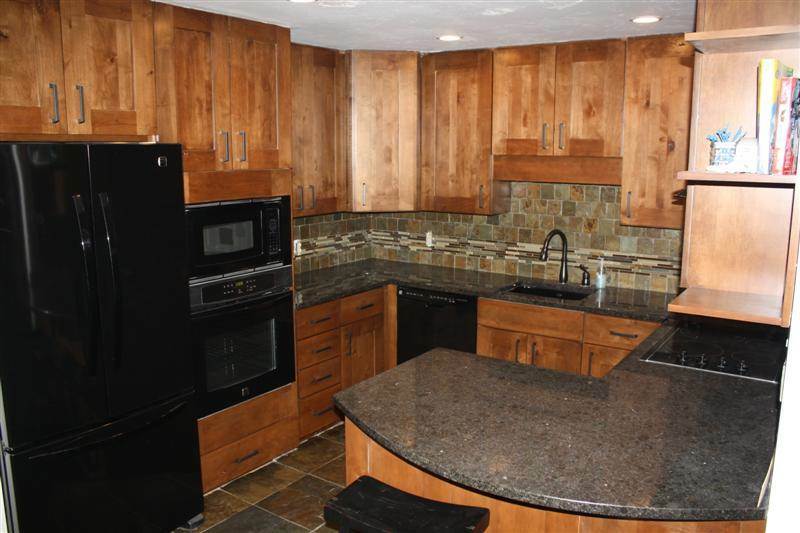 Meals are easy with a fully-stocked kitchen for a big dinner or just making a quick snack on the go. 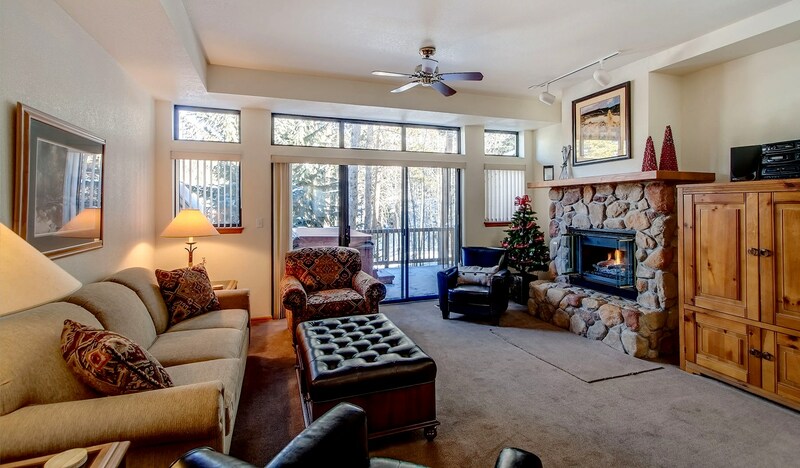 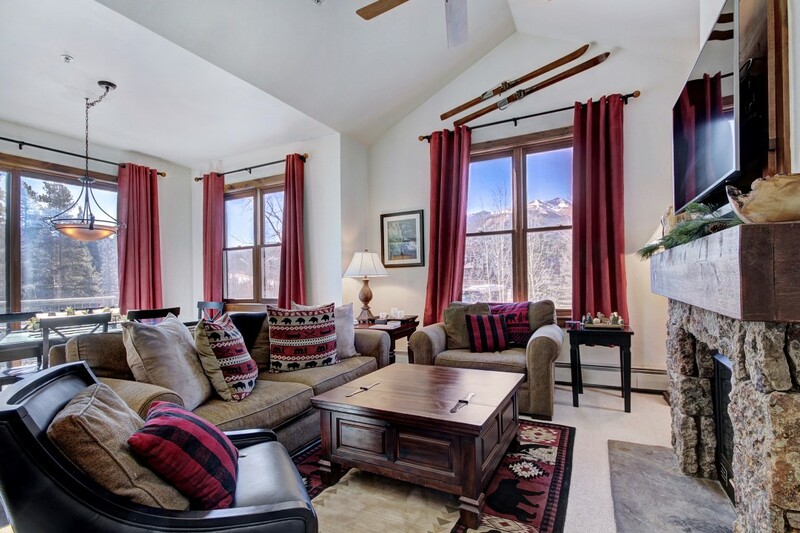 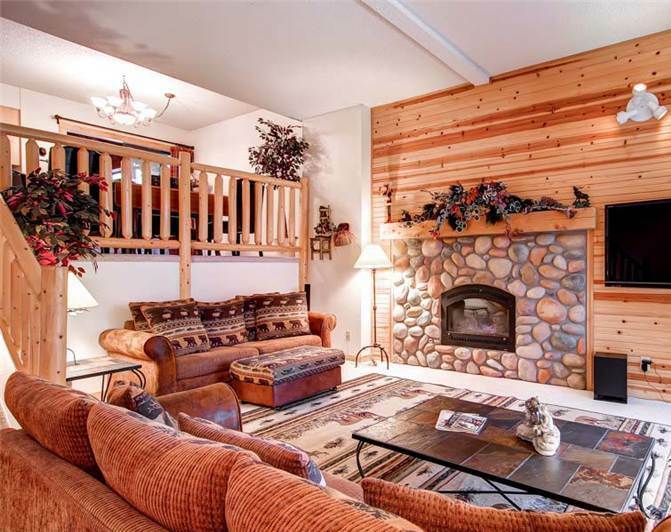 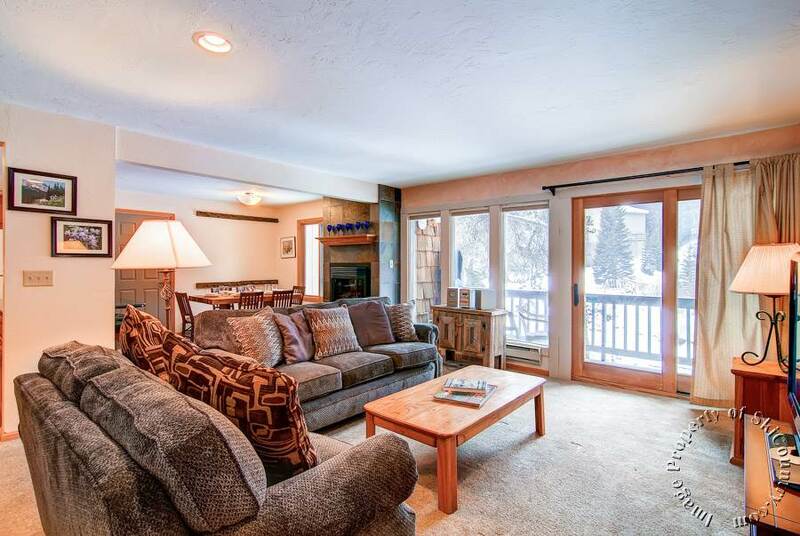 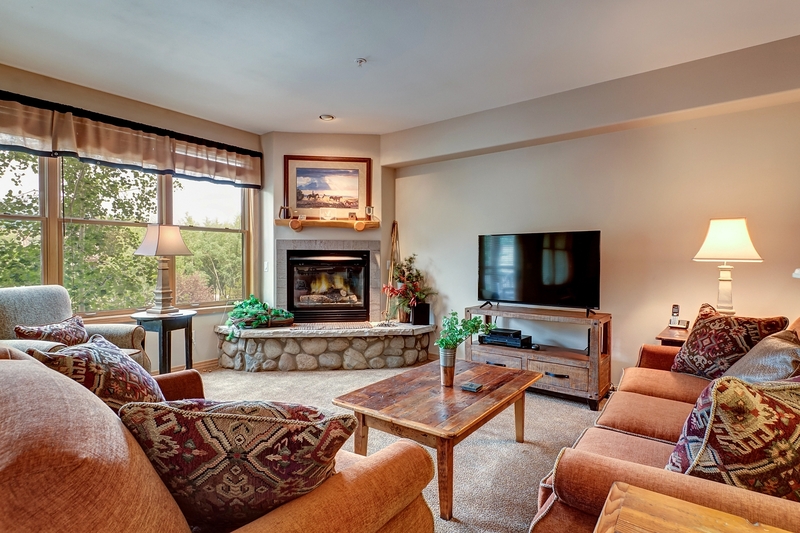 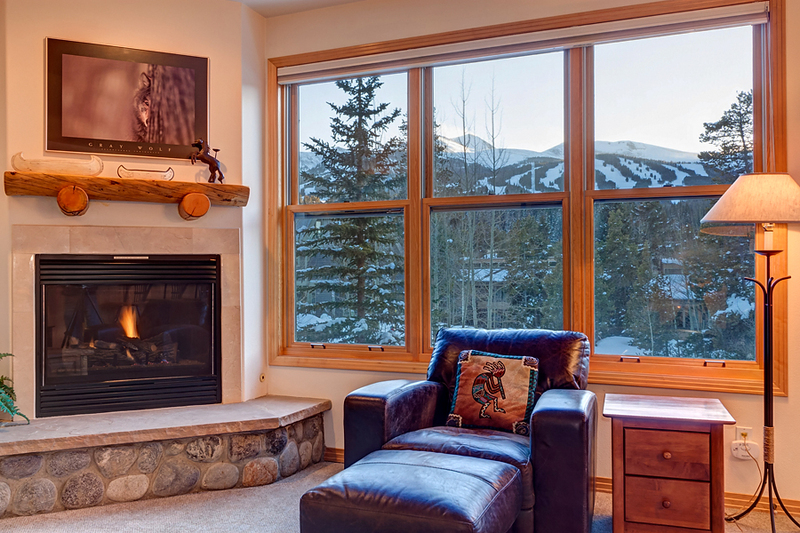 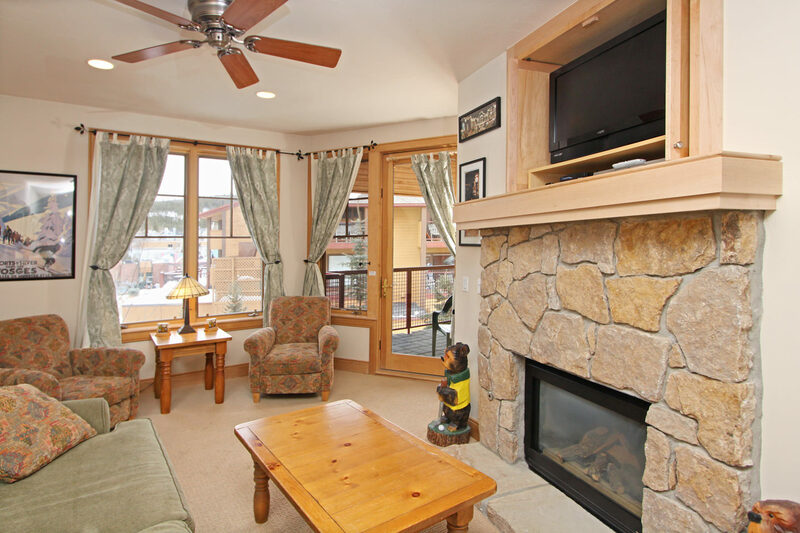 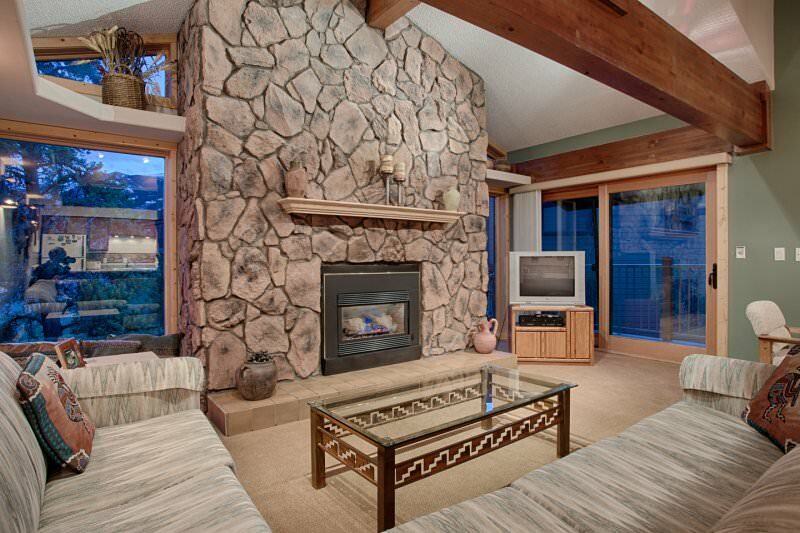 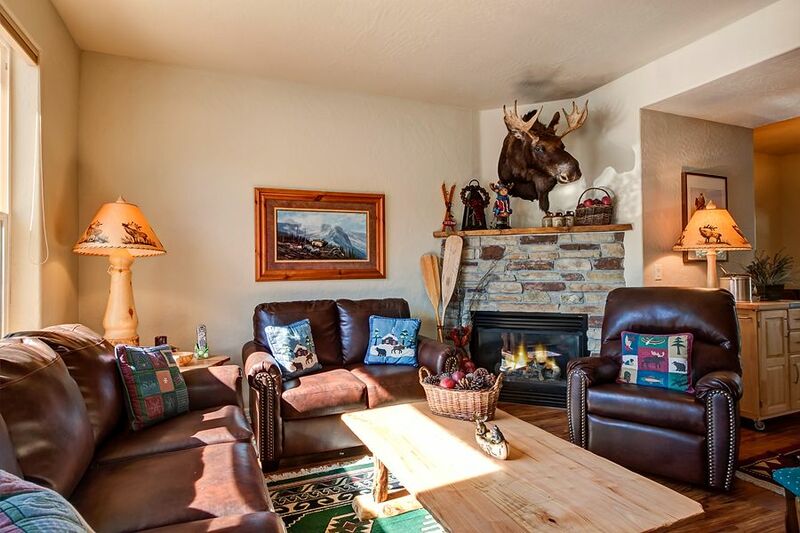 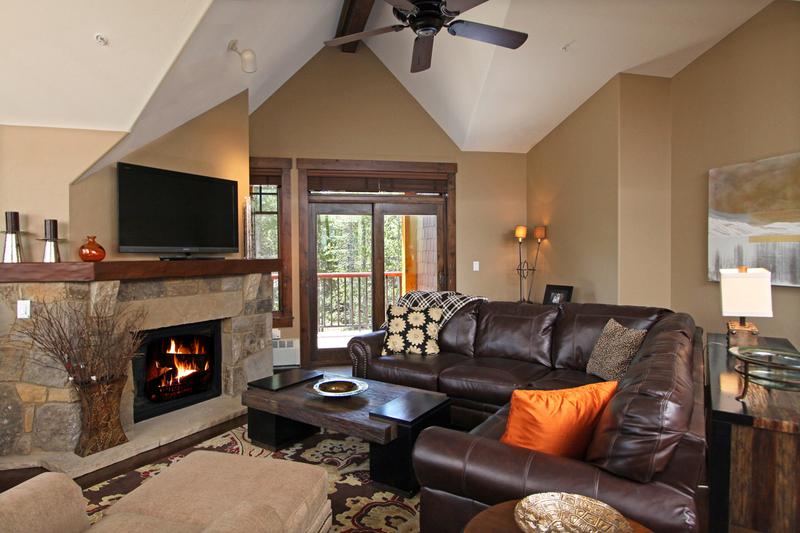 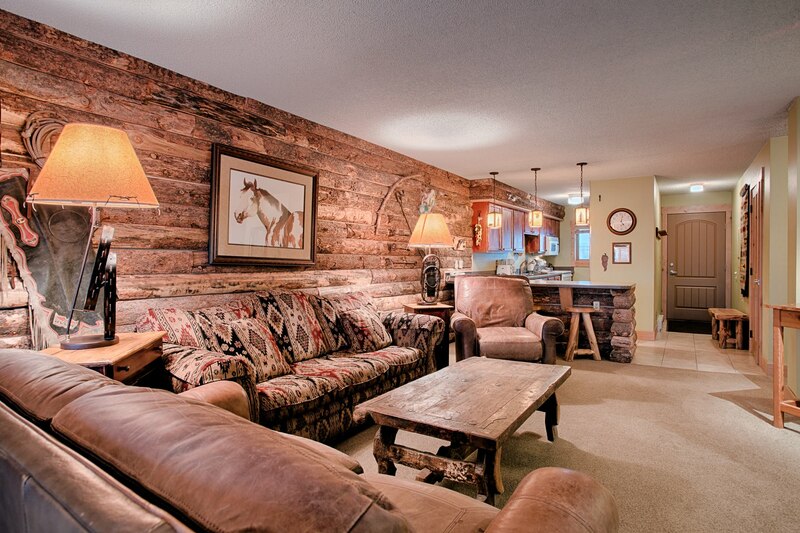 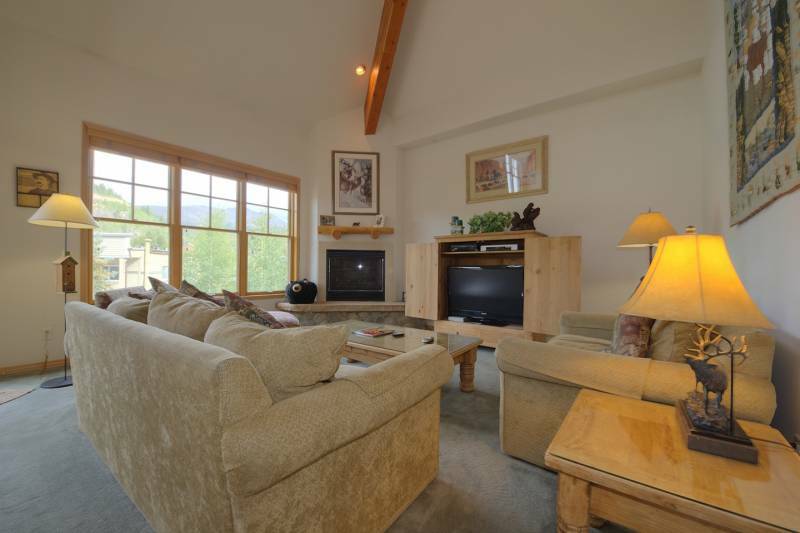 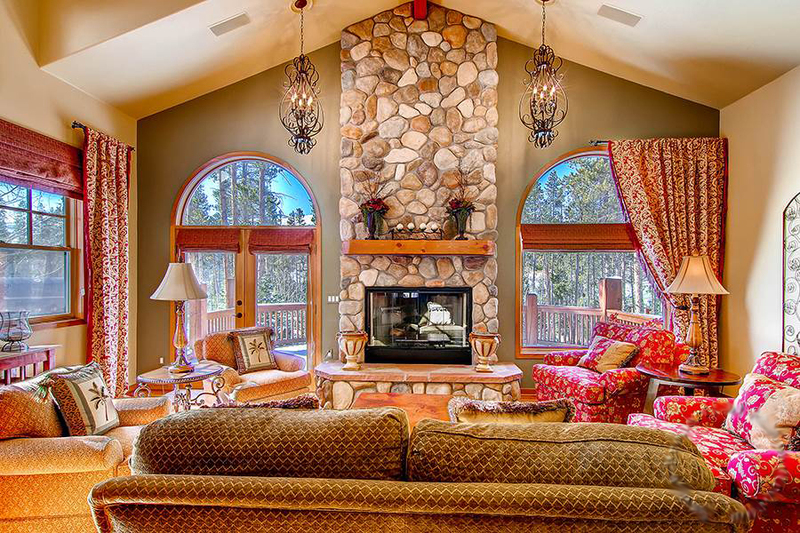 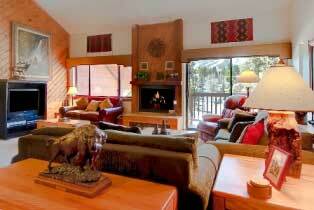 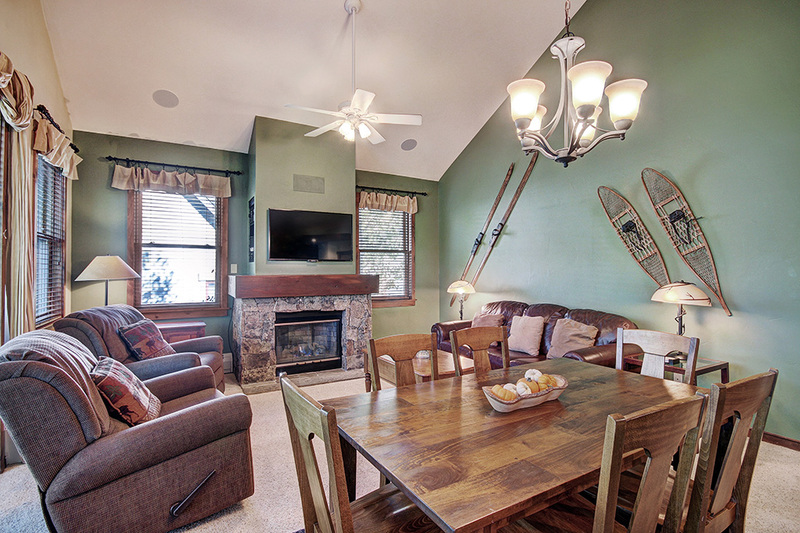 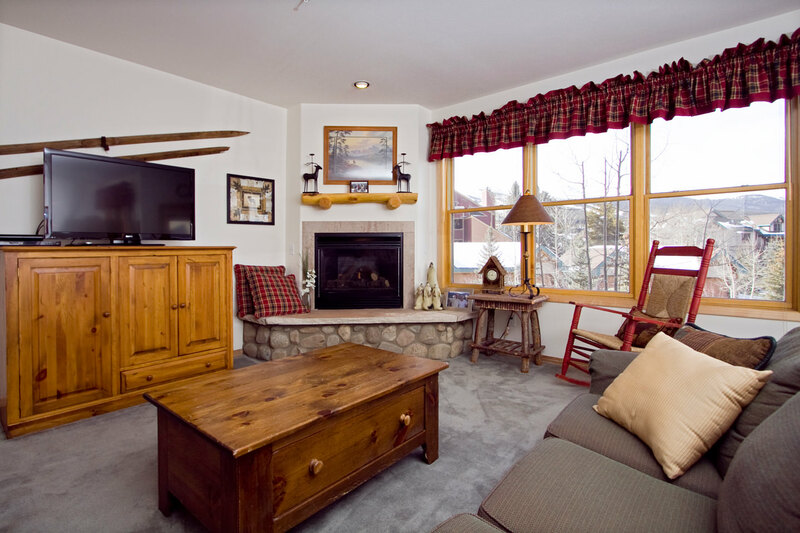 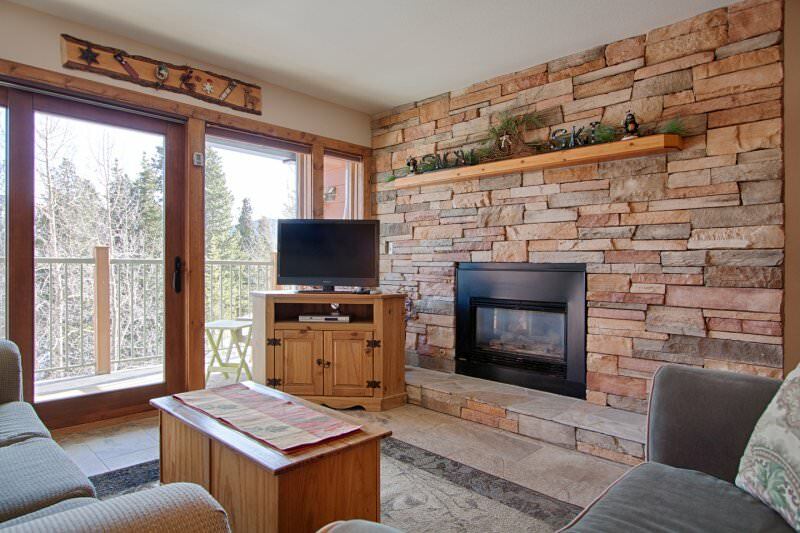 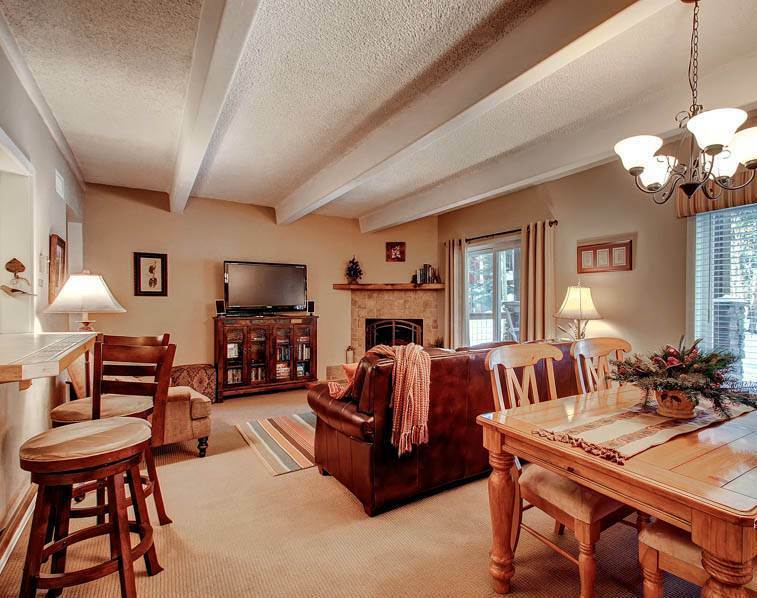 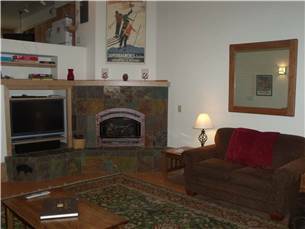 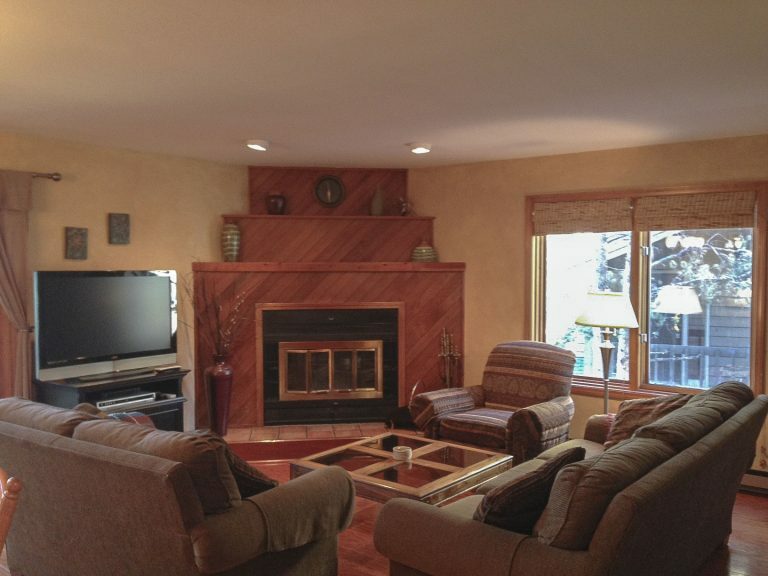 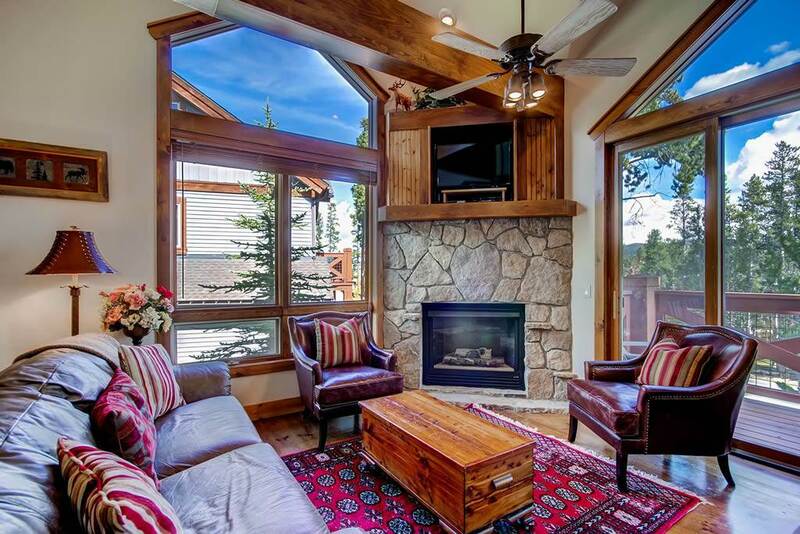 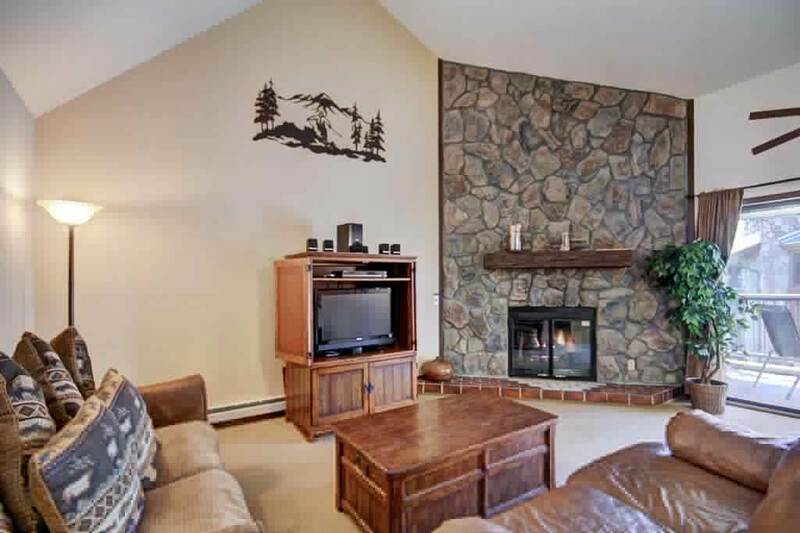 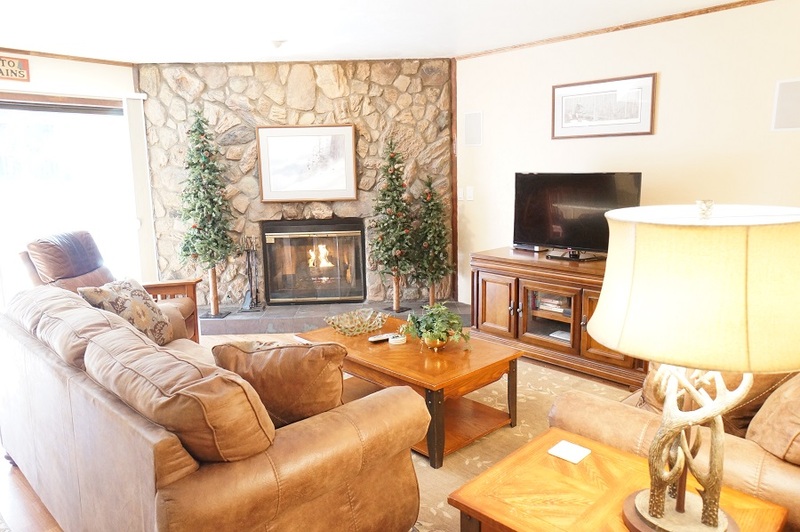 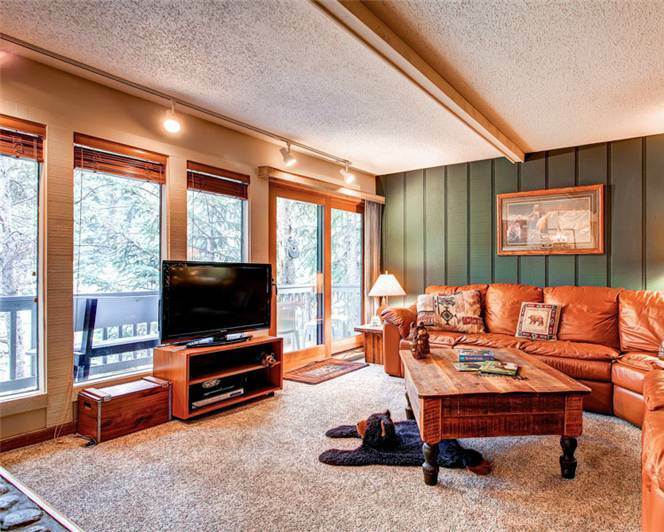 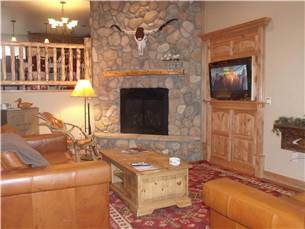 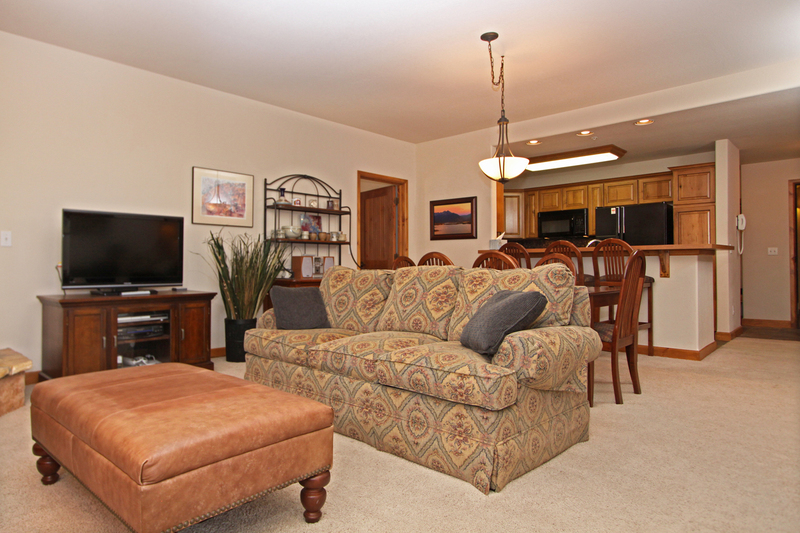 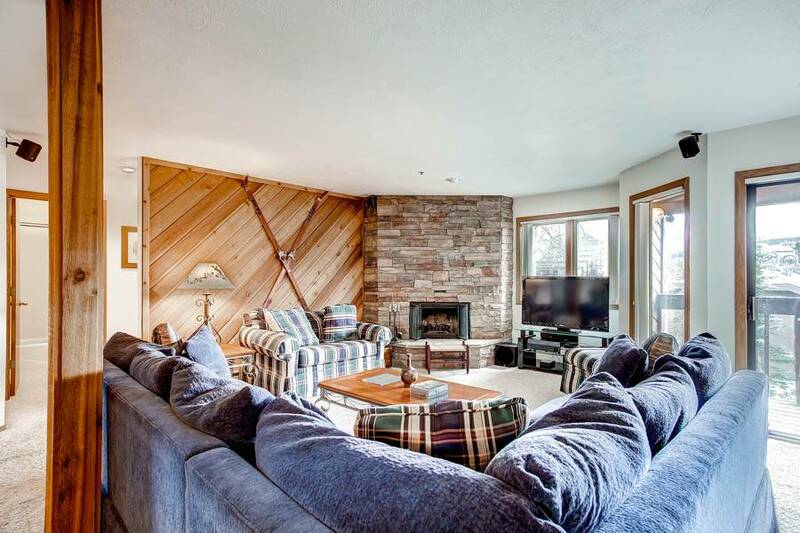 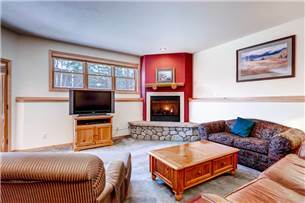 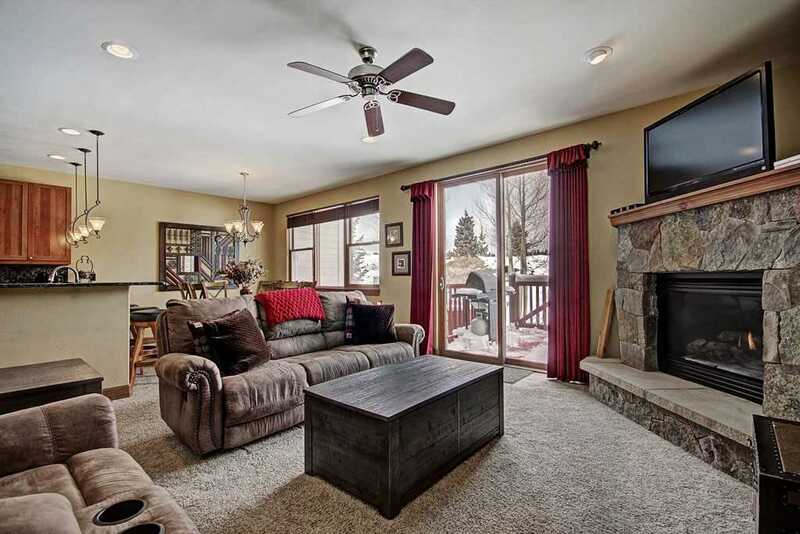 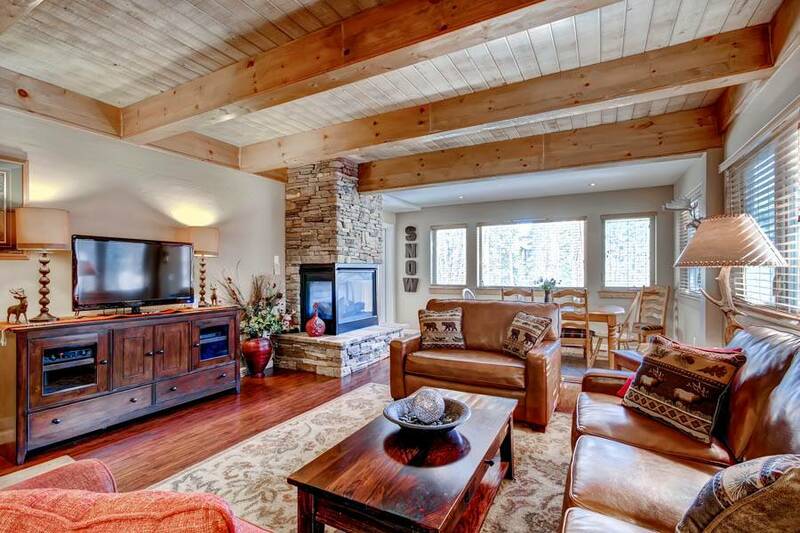 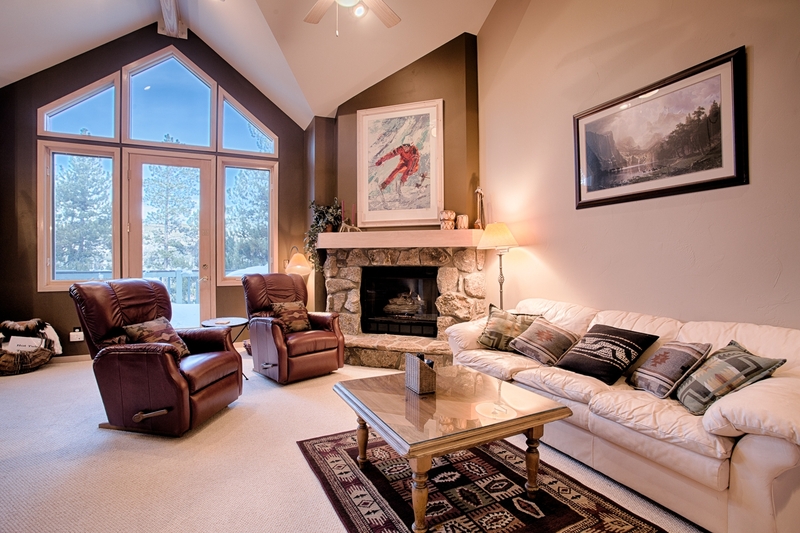 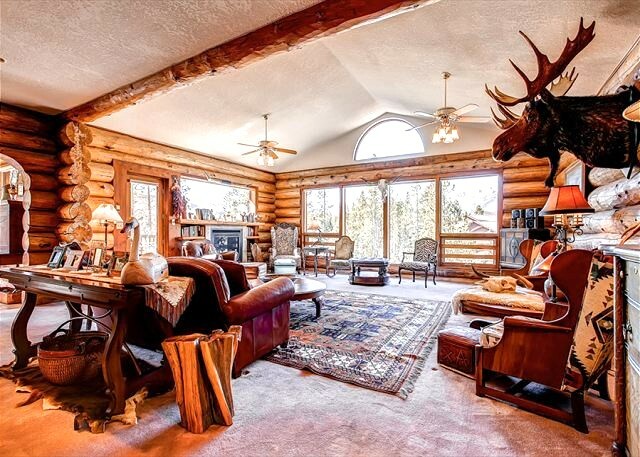 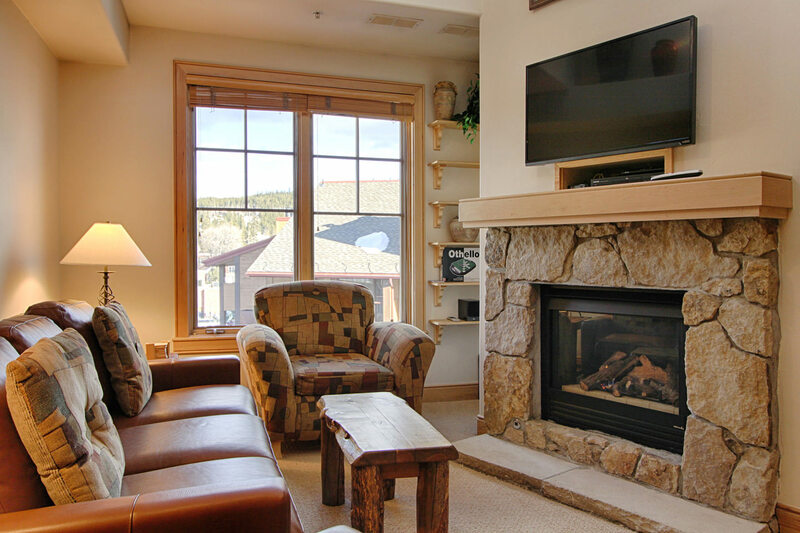 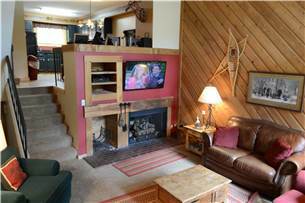 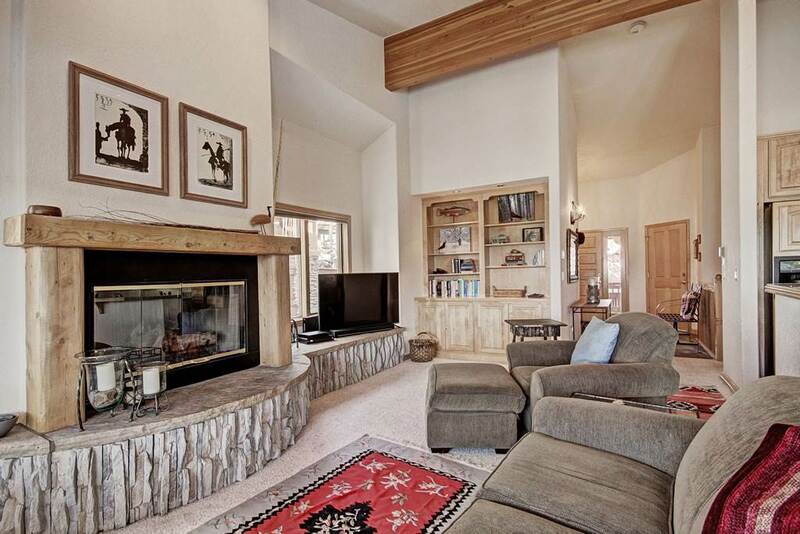 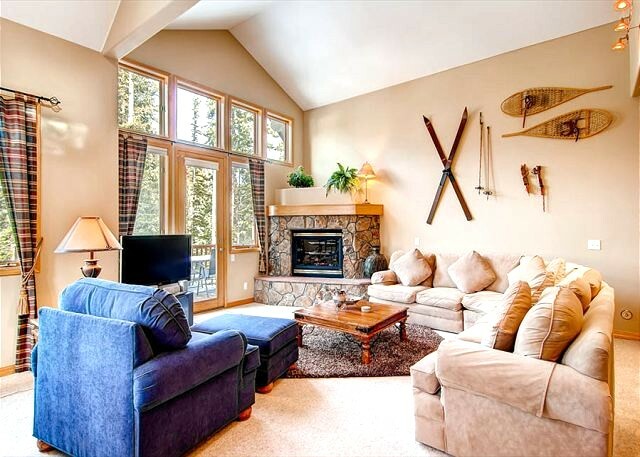 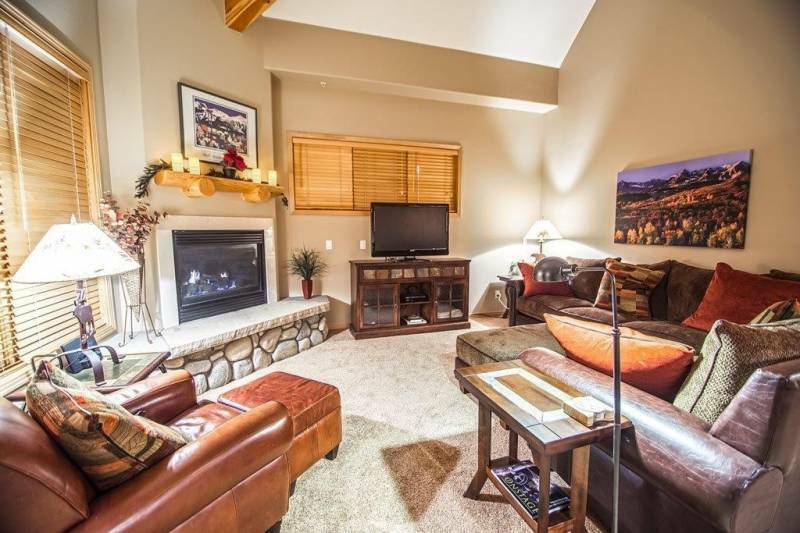 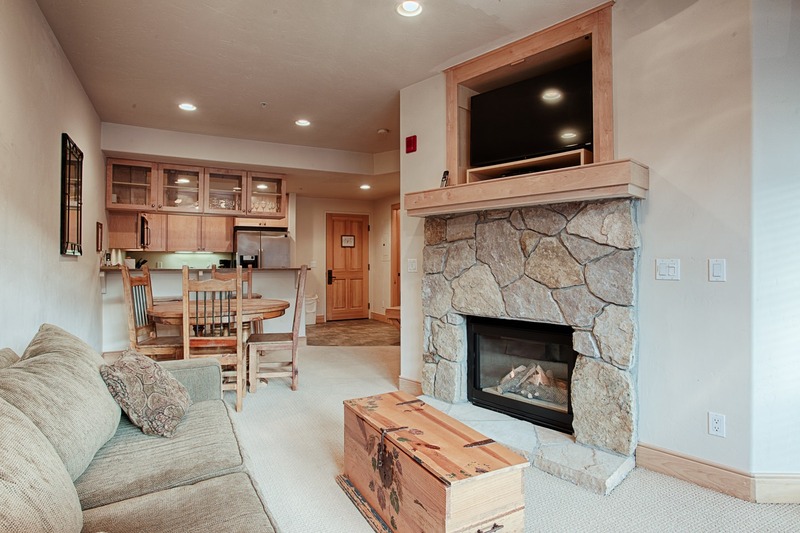 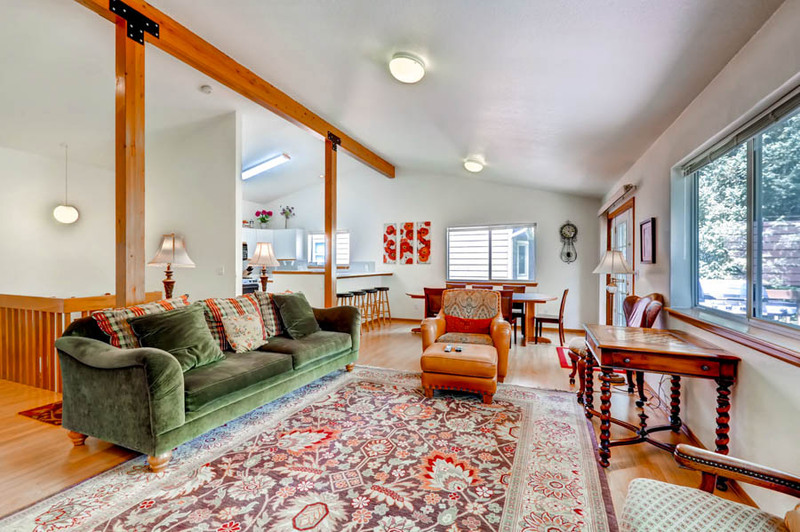 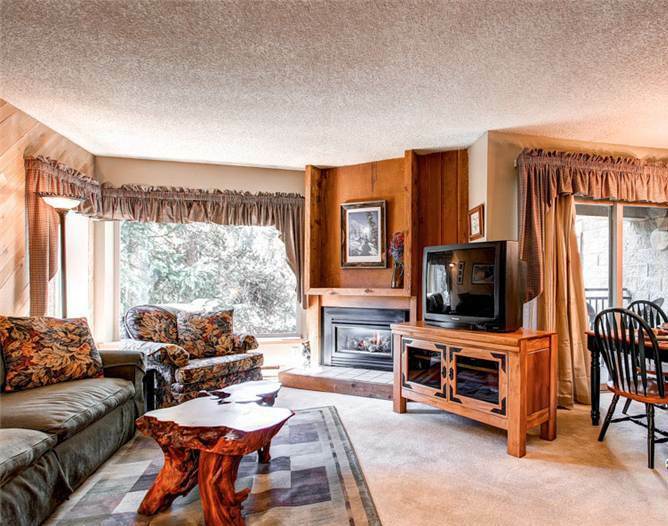 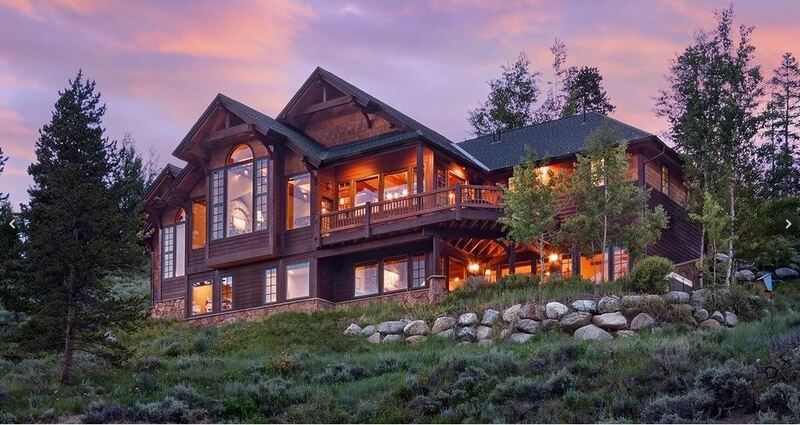 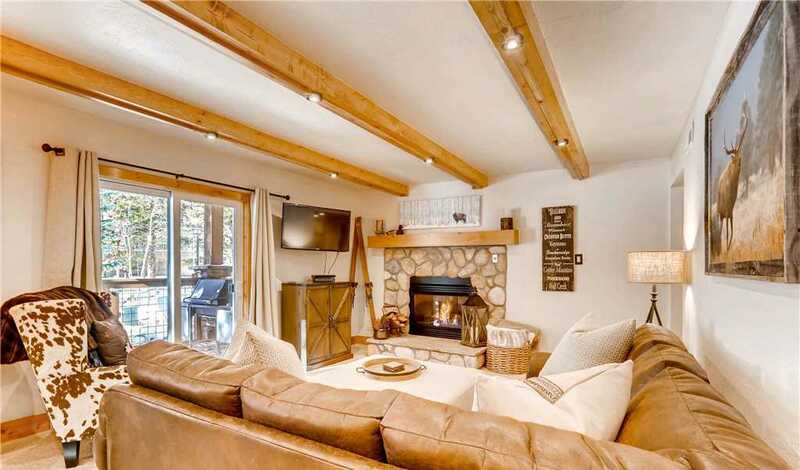 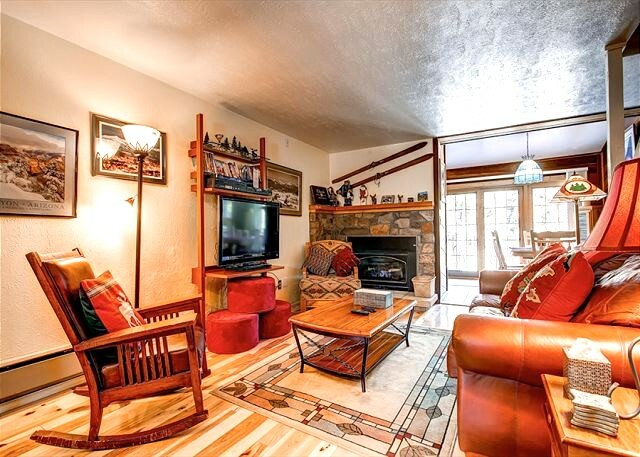 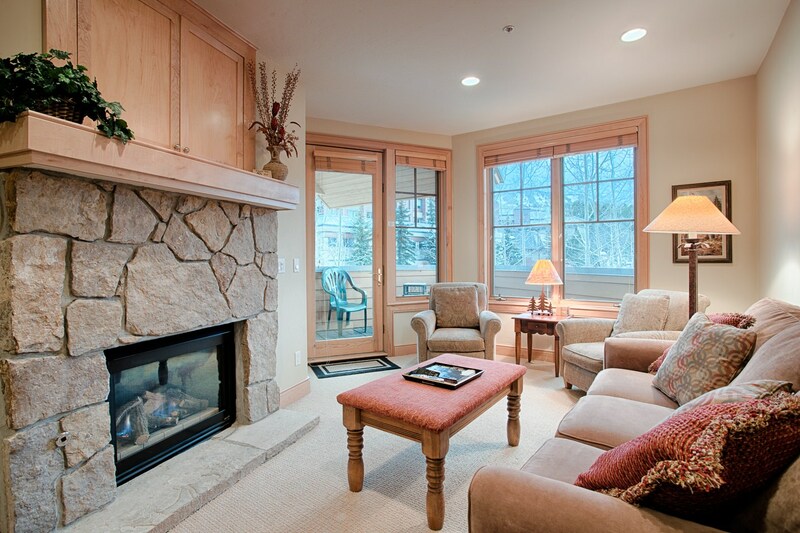 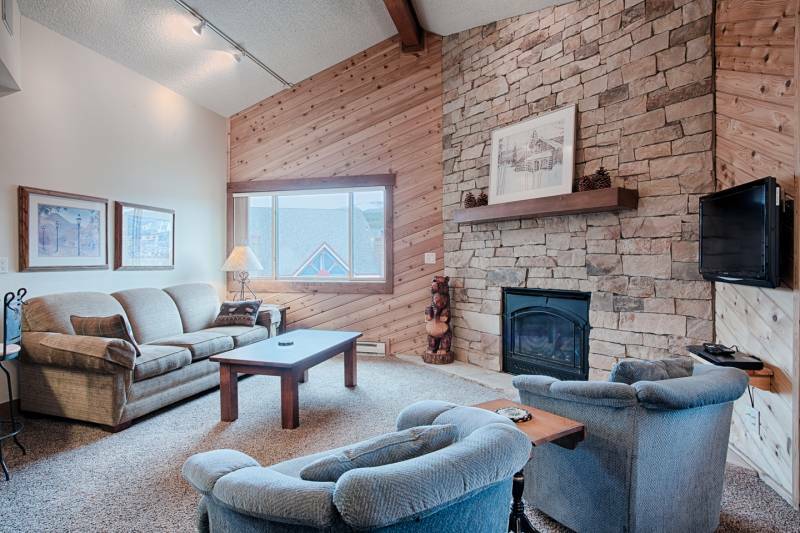 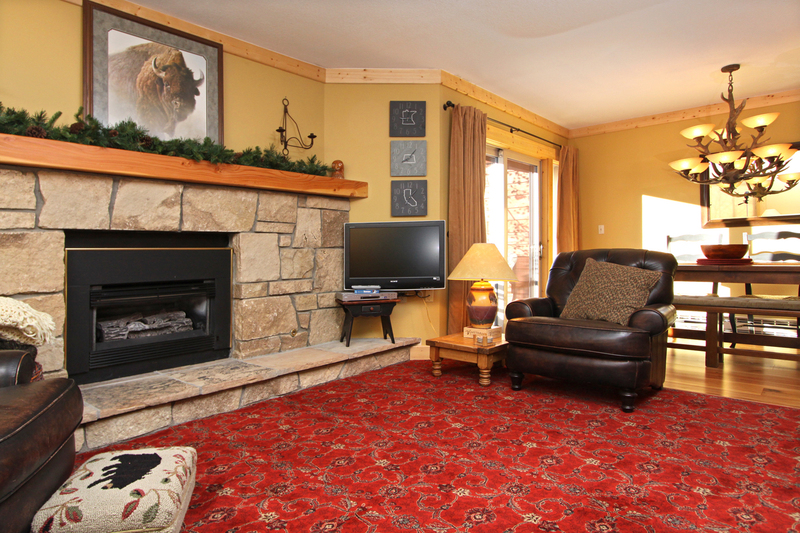 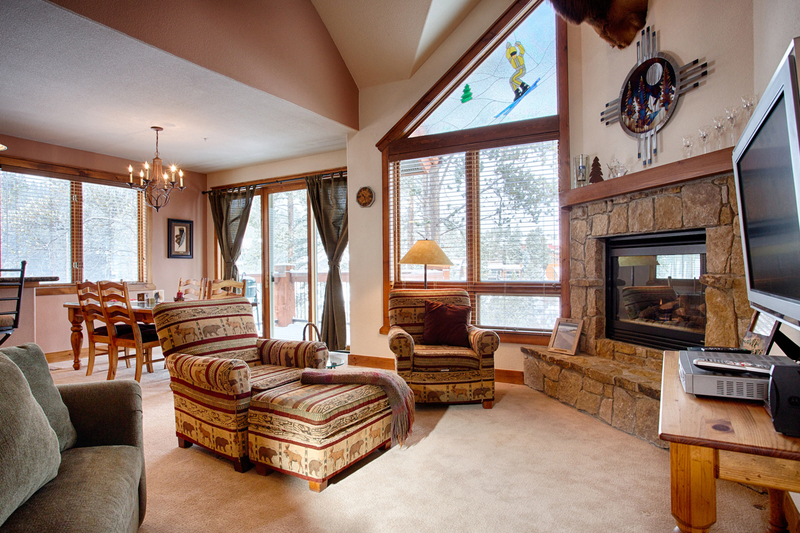 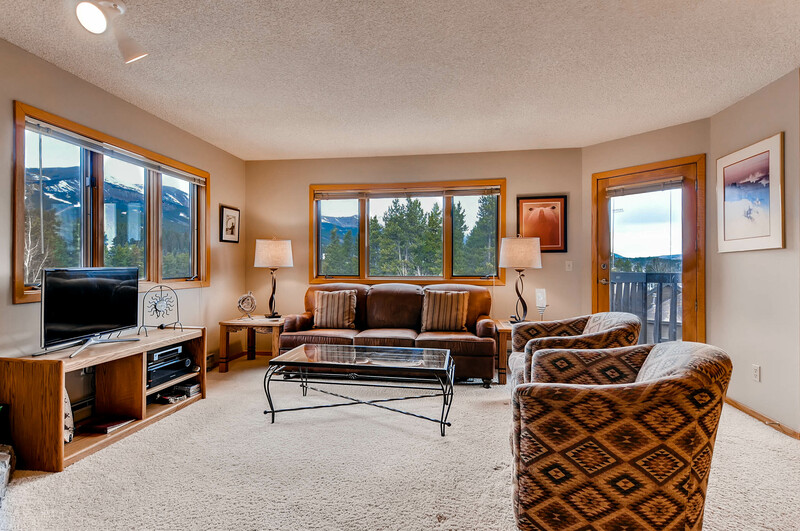 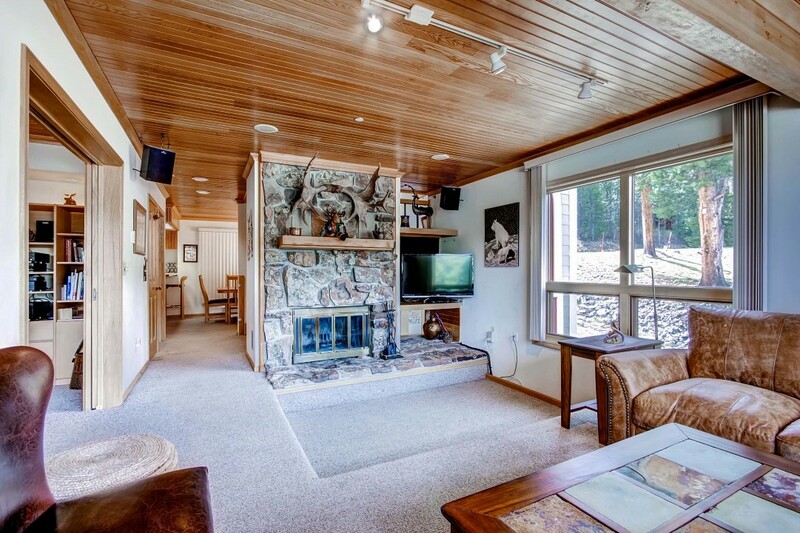 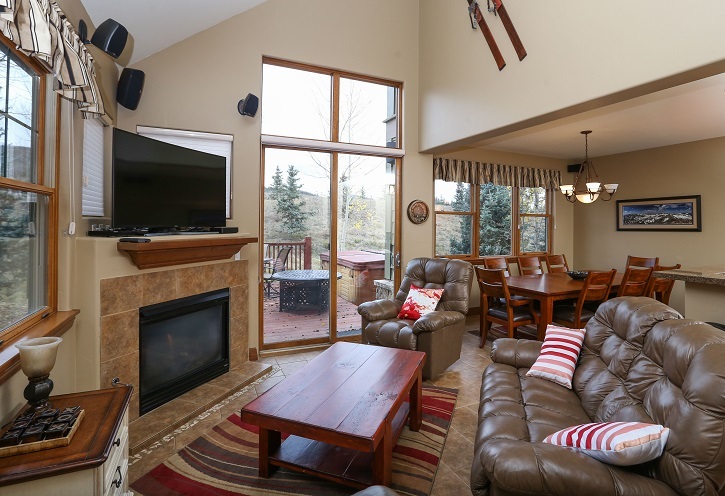 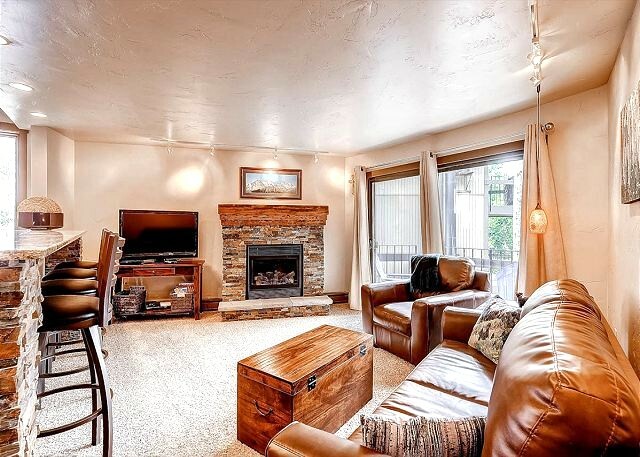 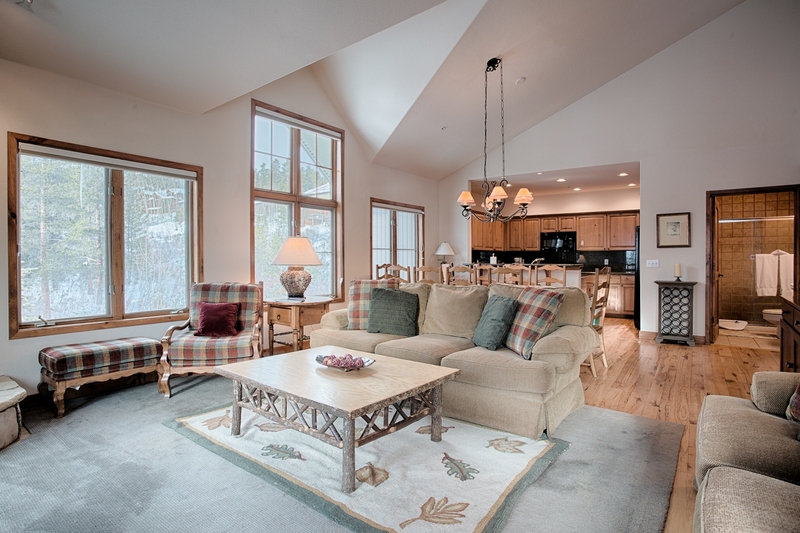 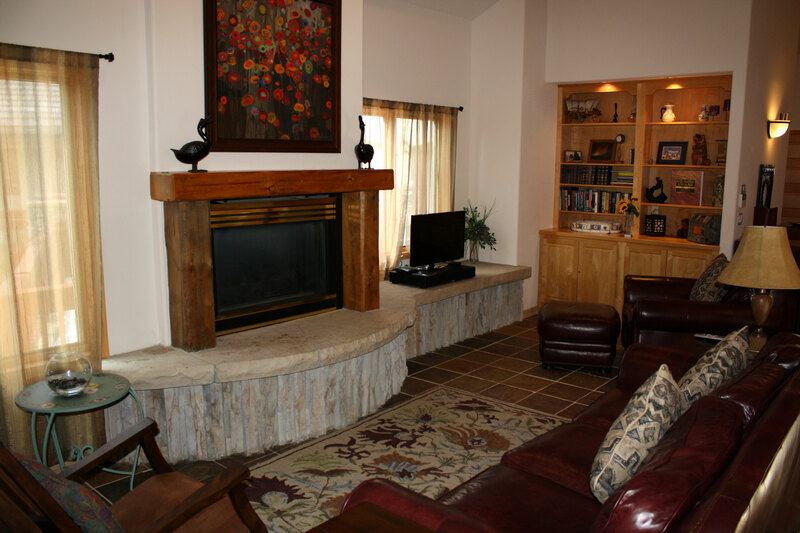 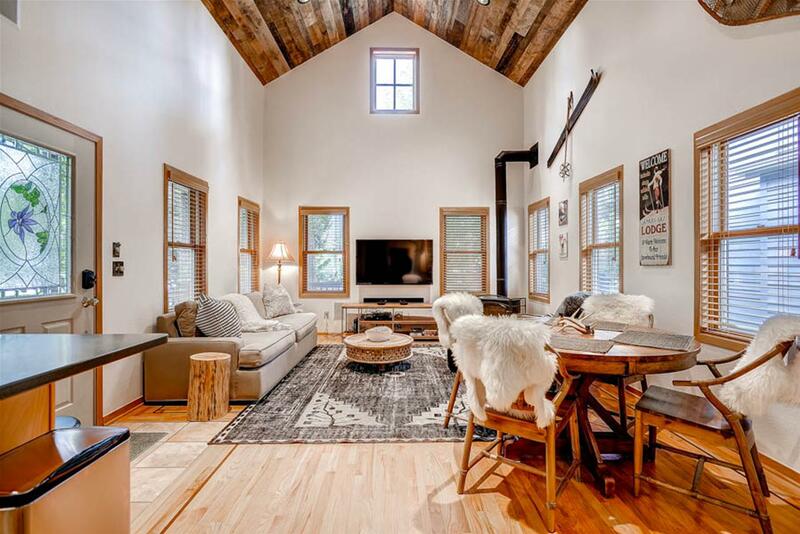 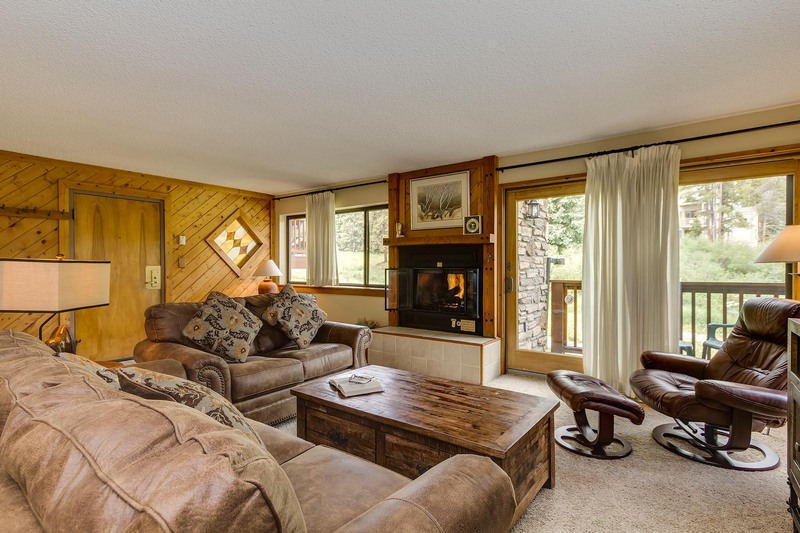 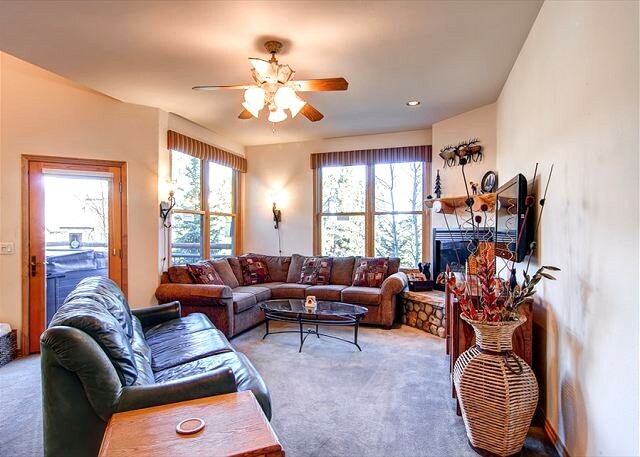 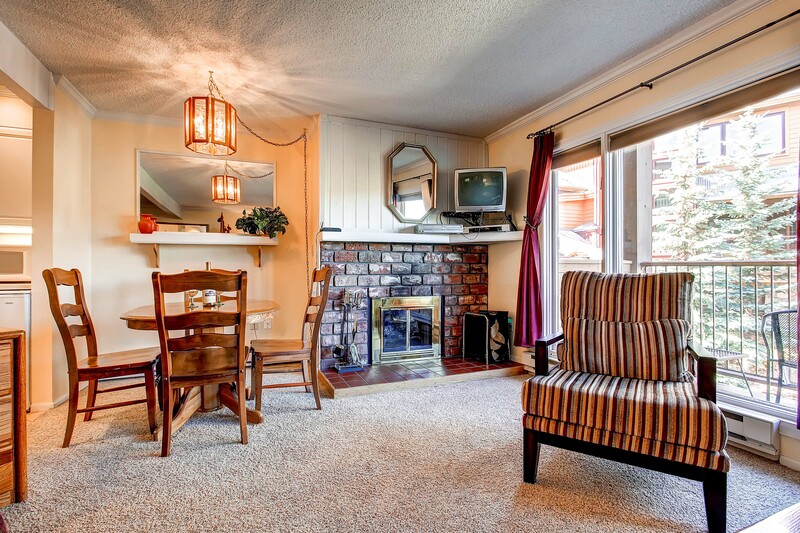 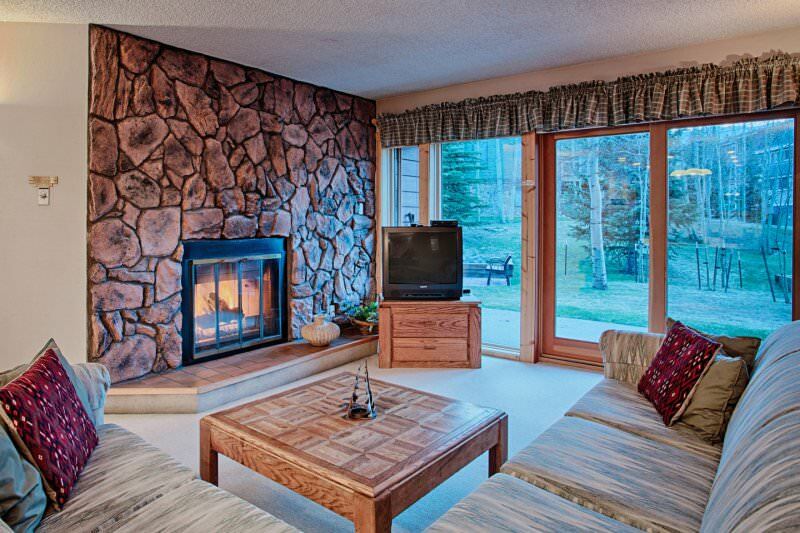 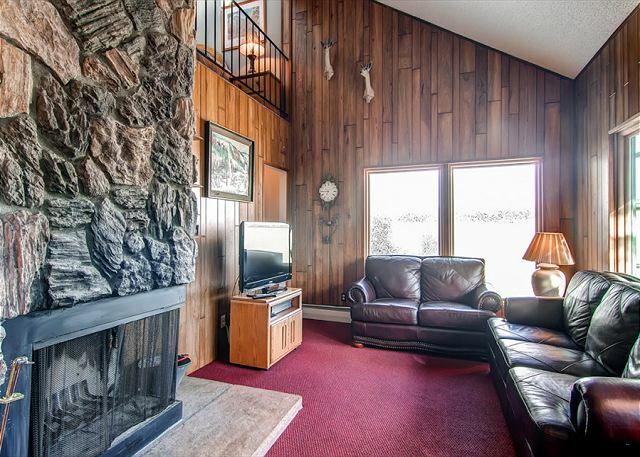 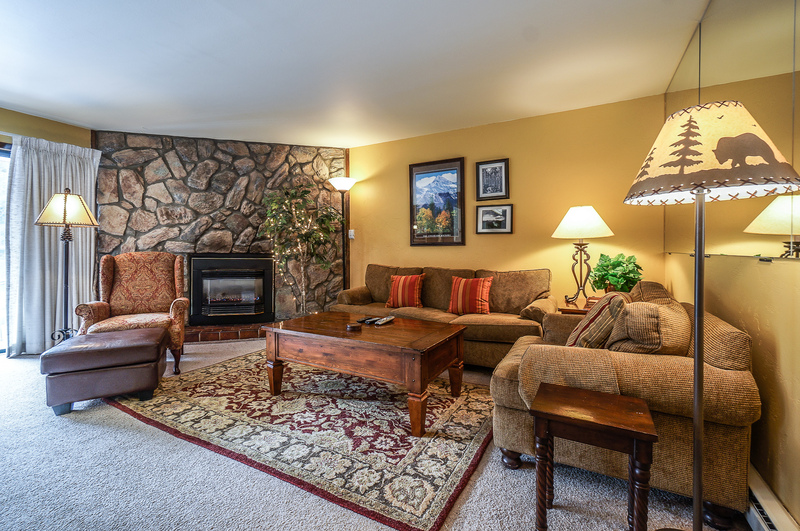 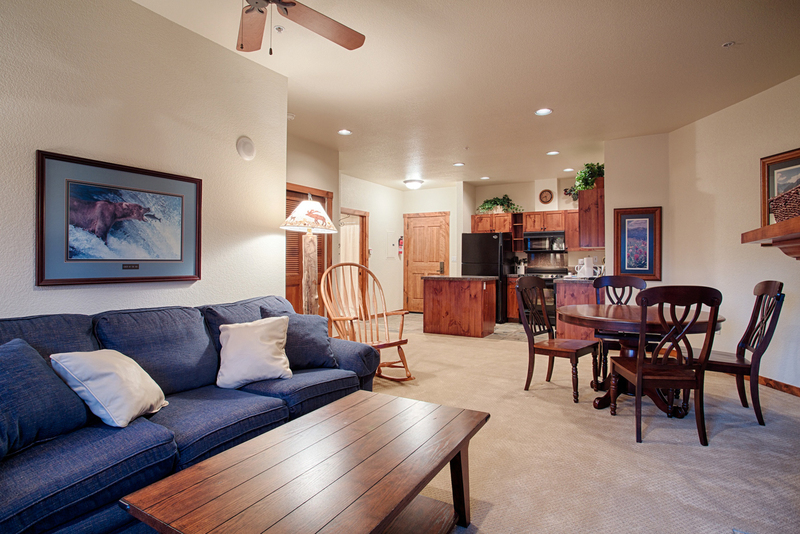 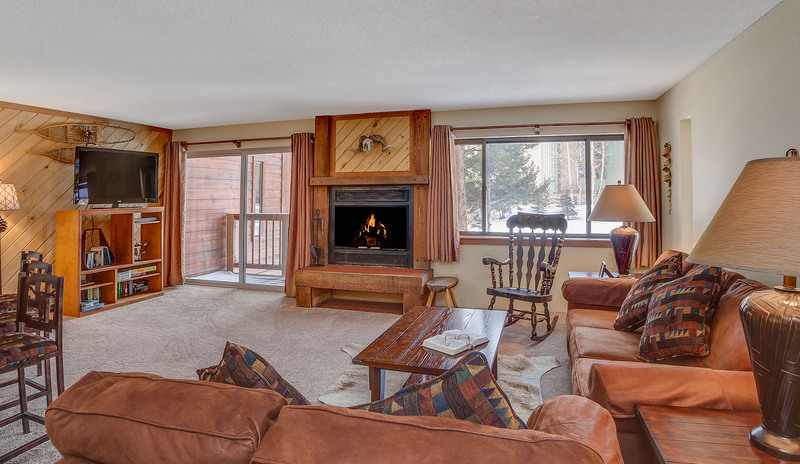 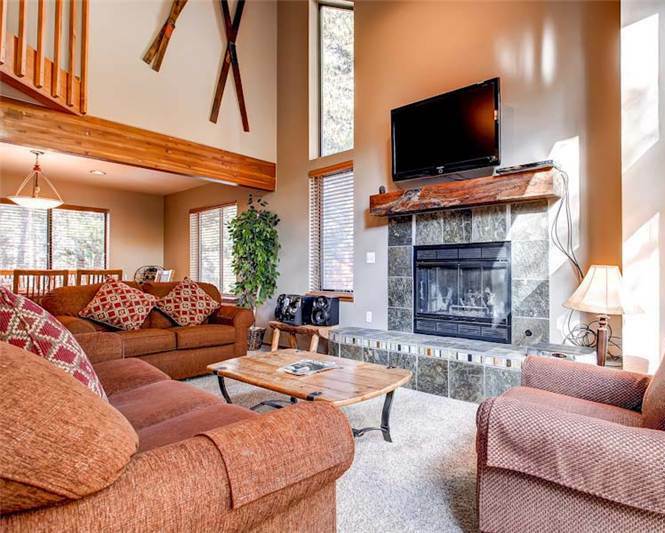 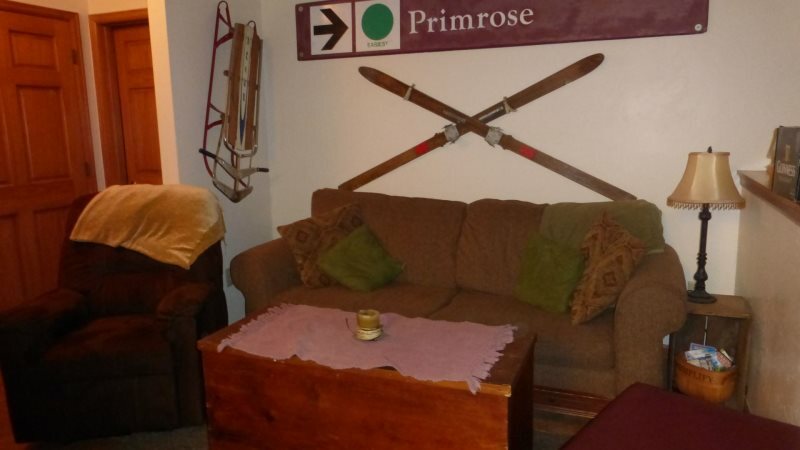 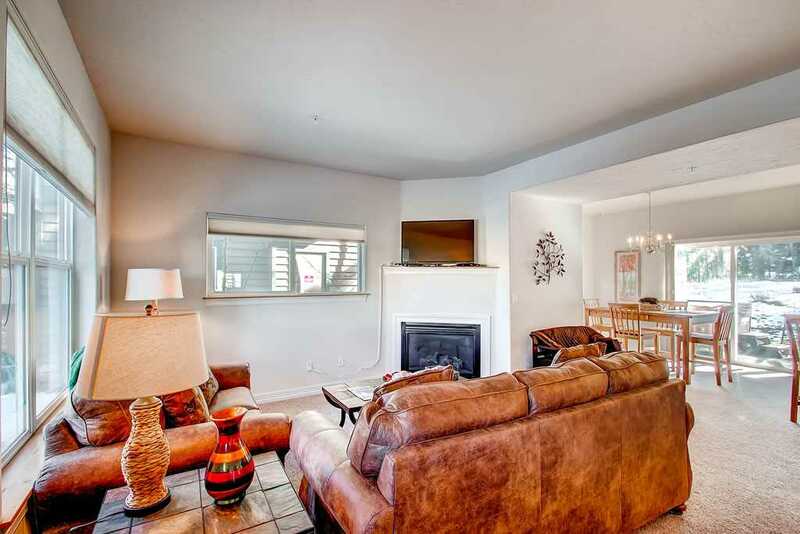 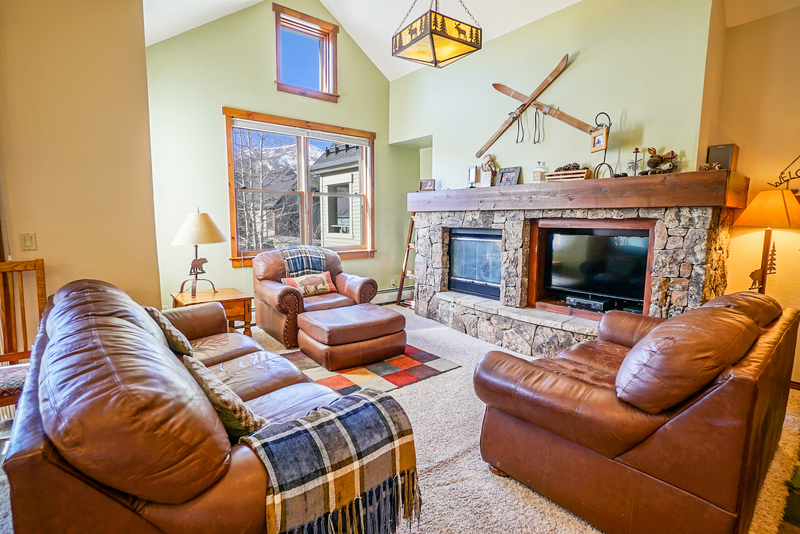 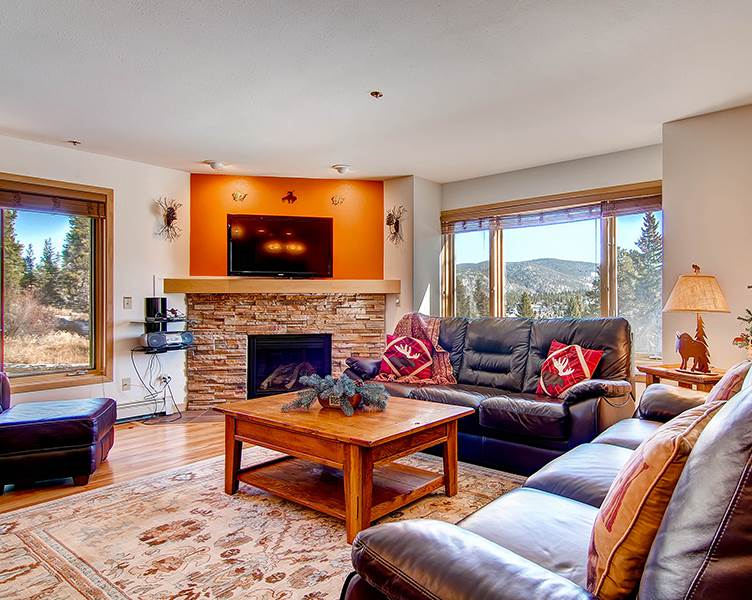 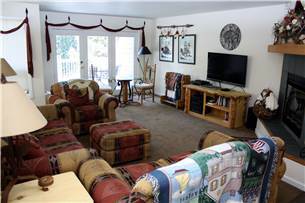 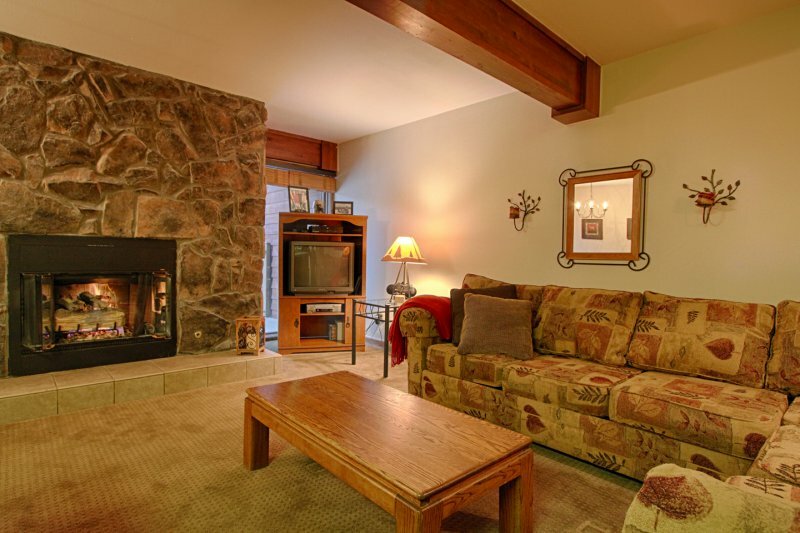 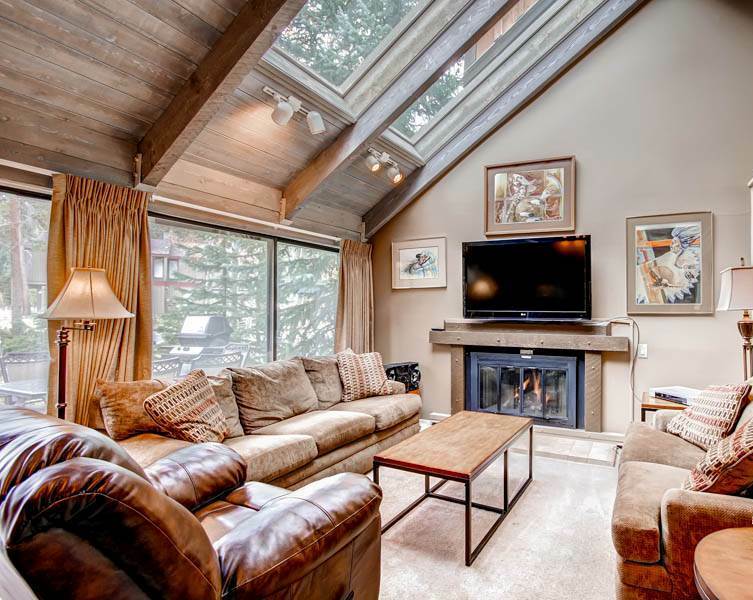 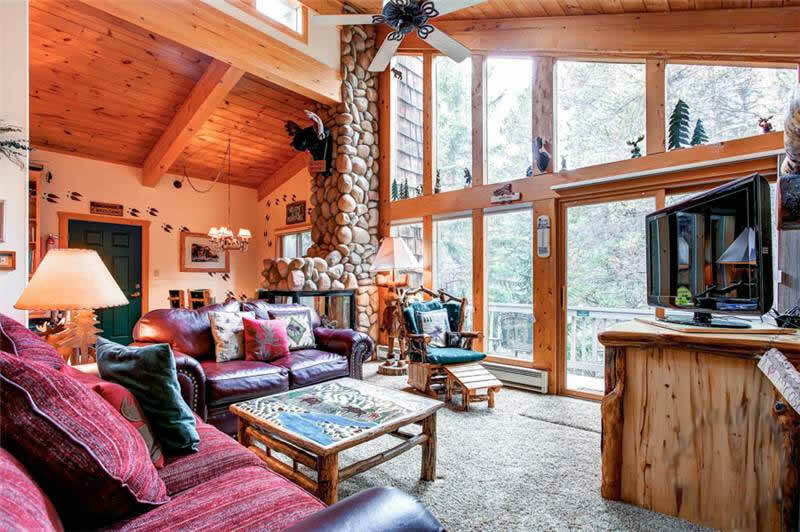 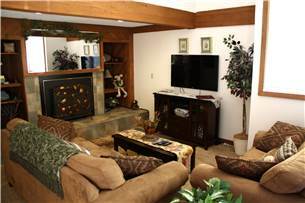 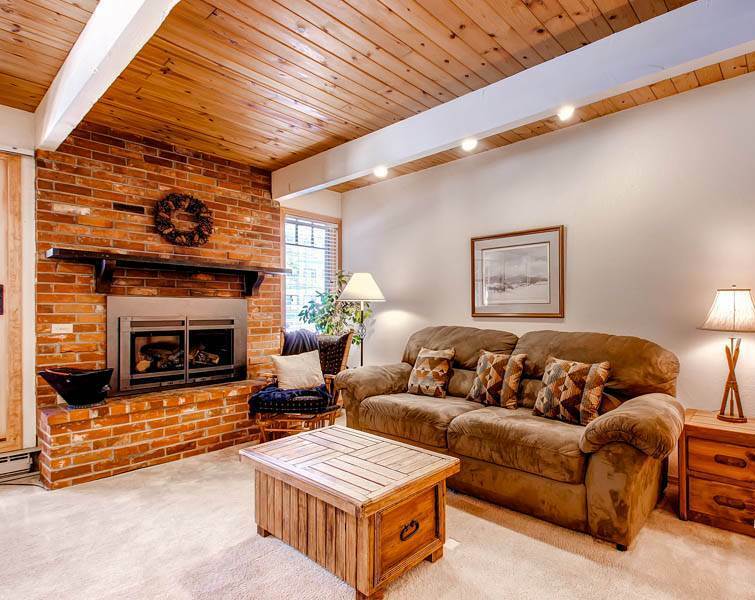 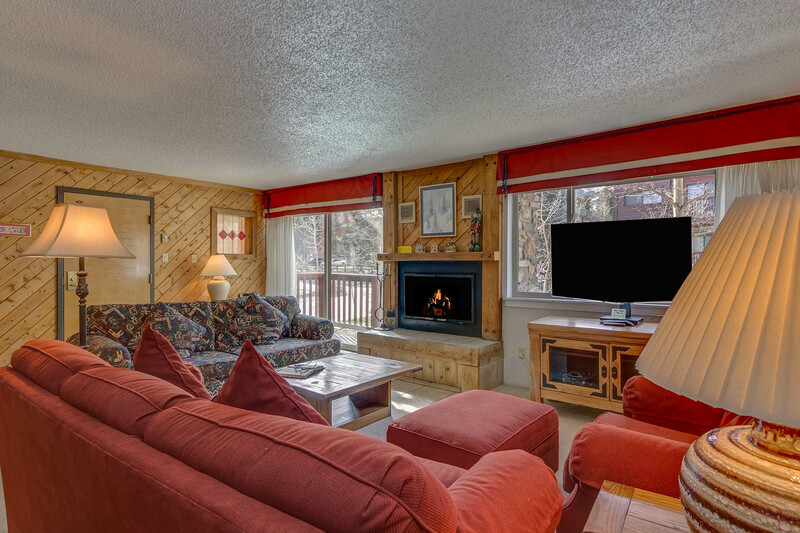 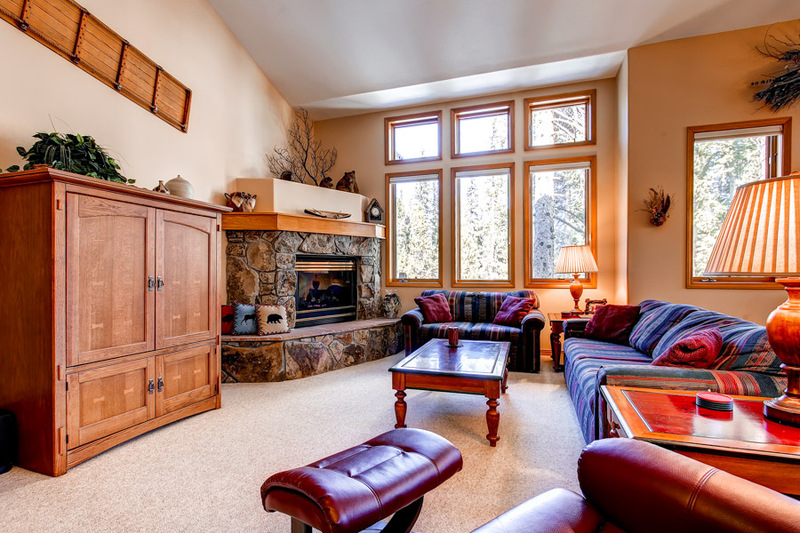 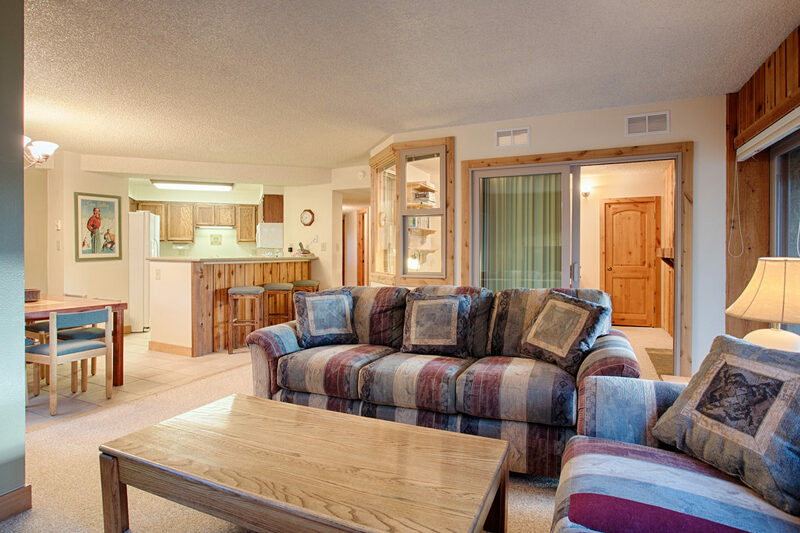 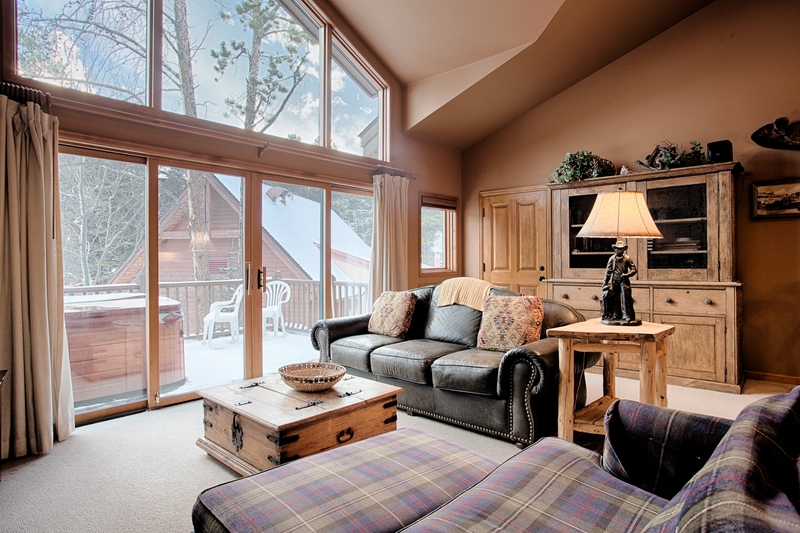 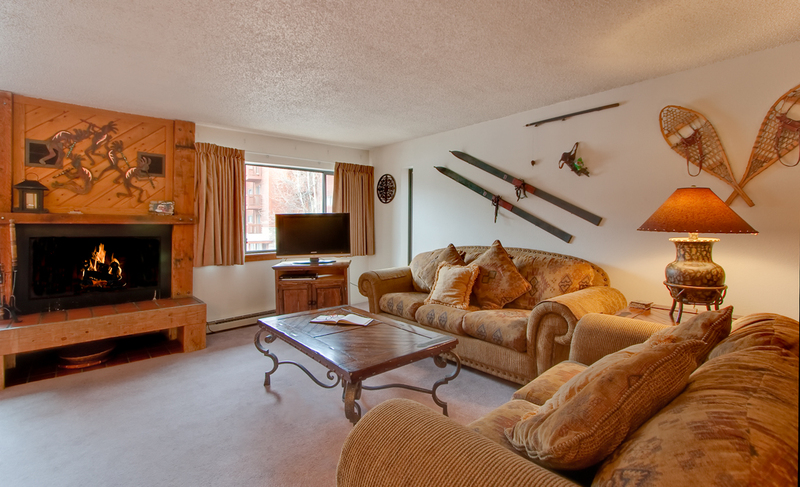 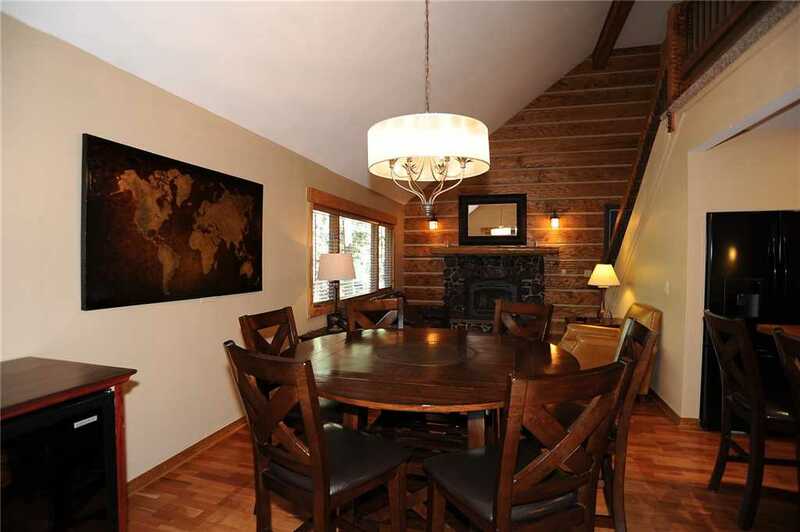 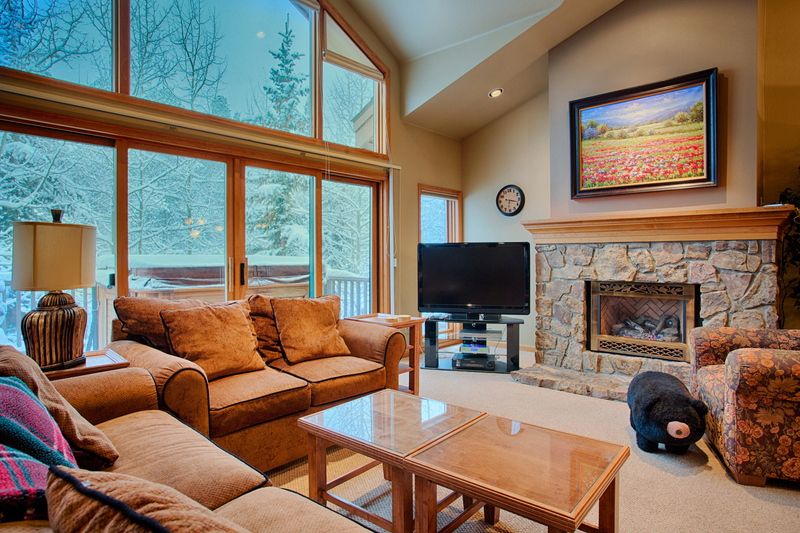 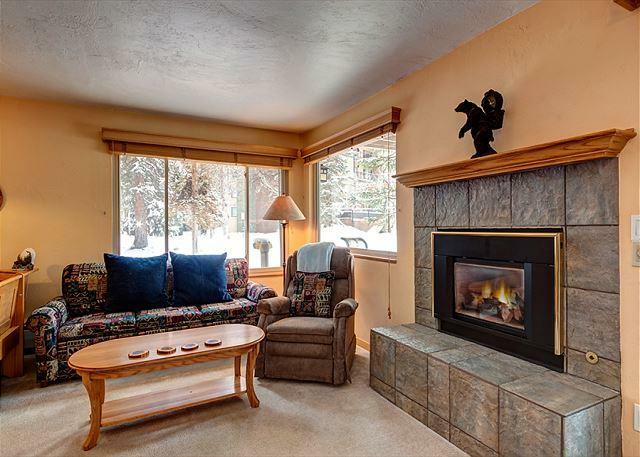 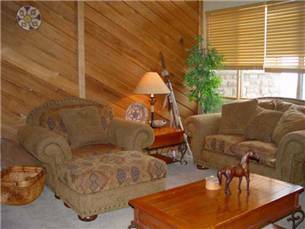 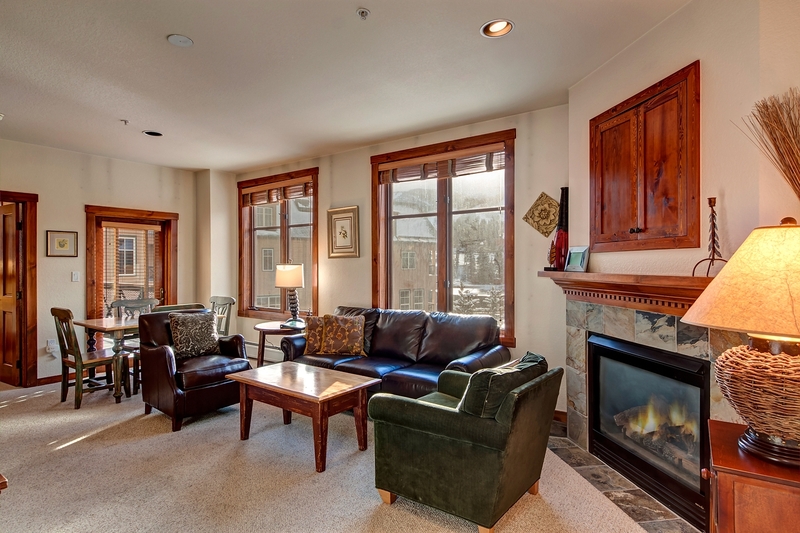 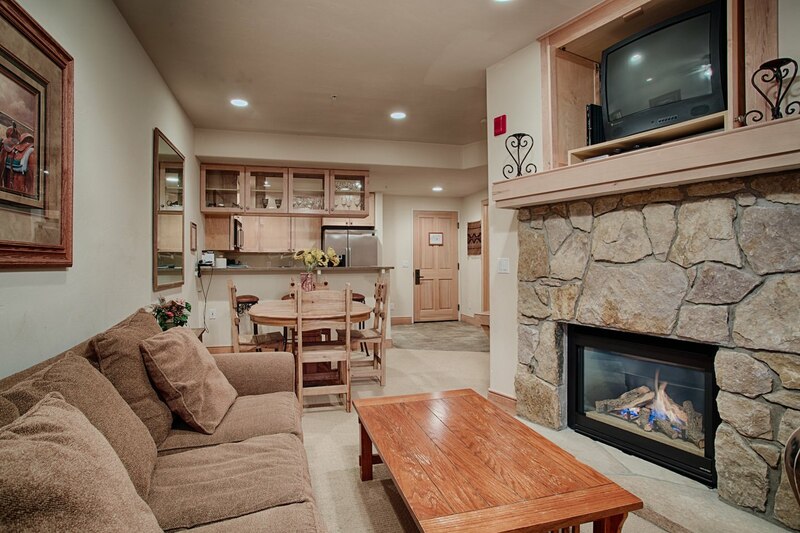 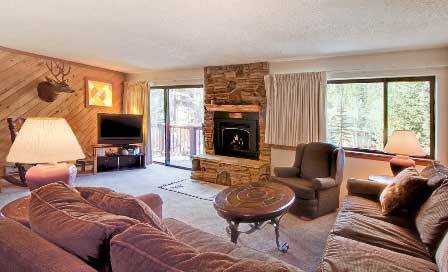 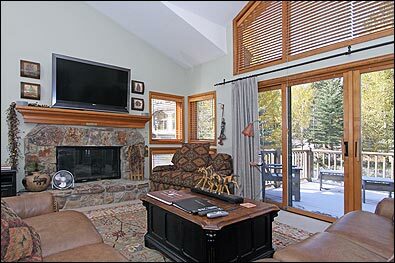 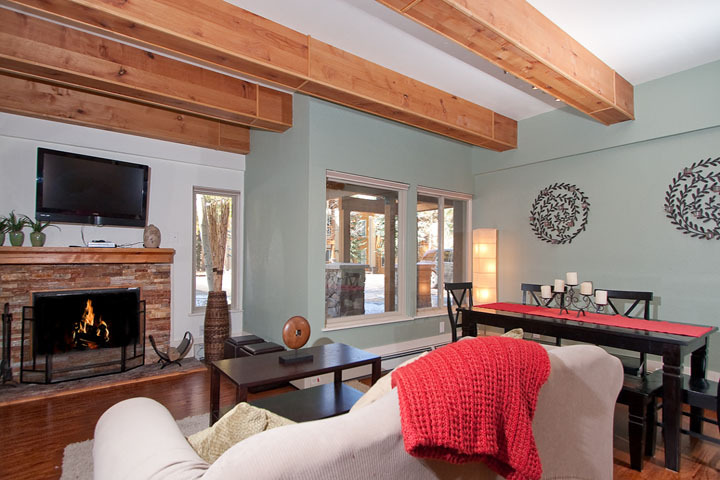 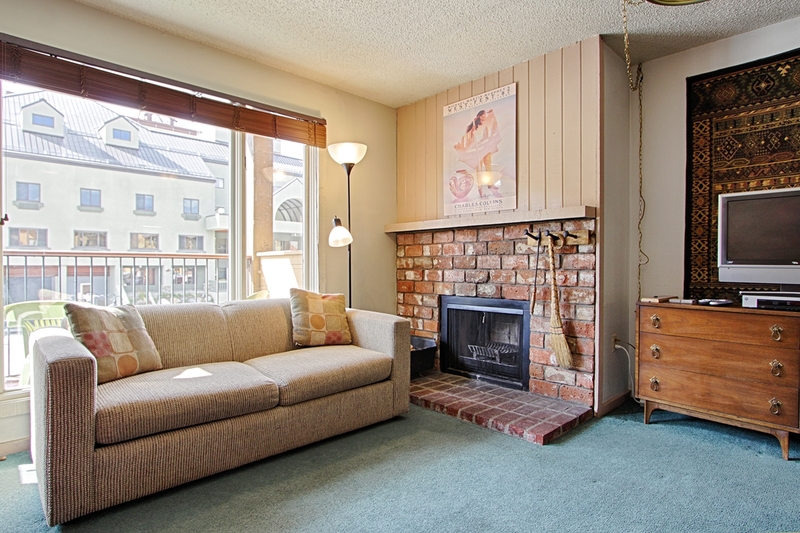 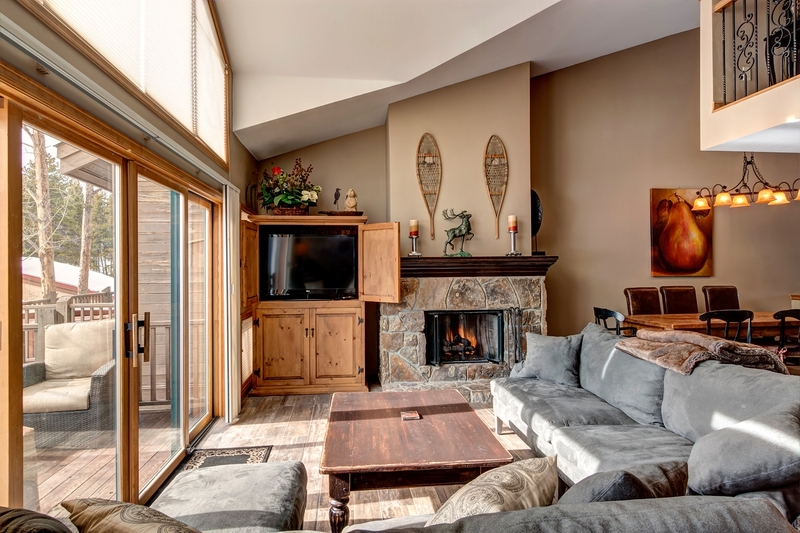 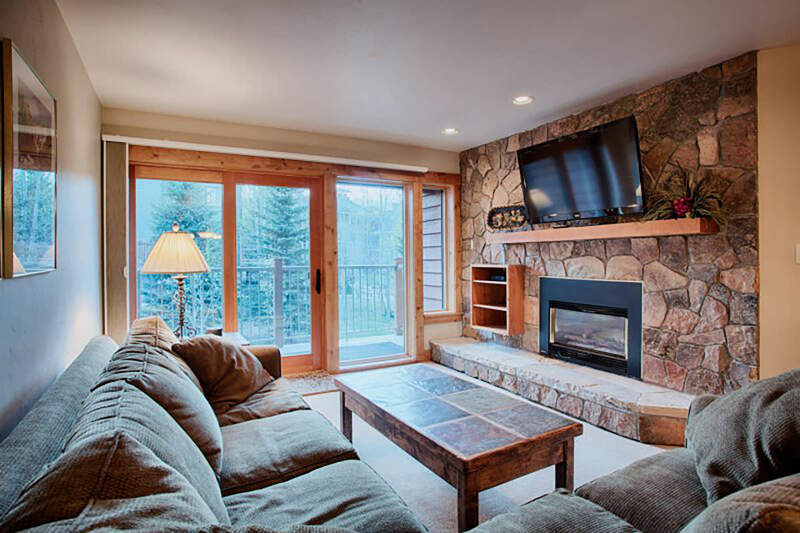 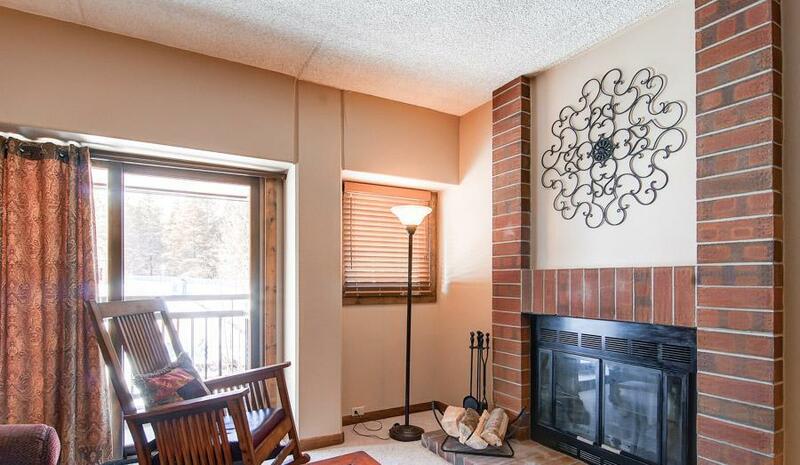 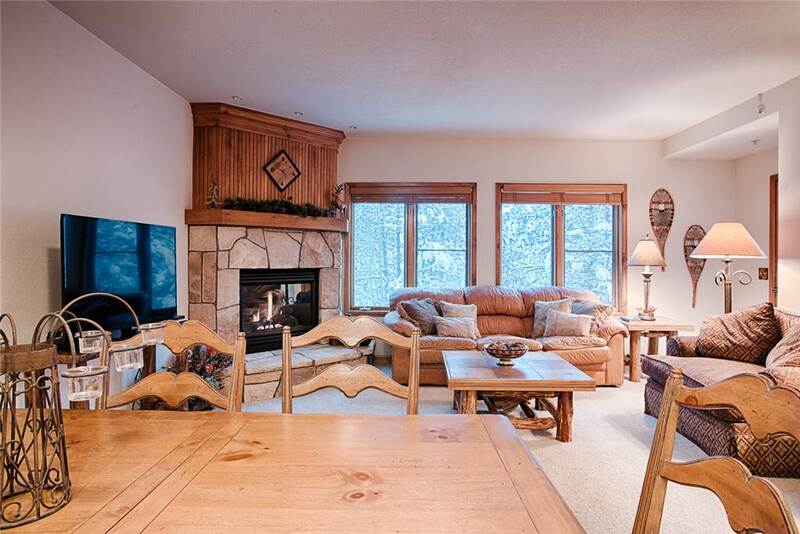 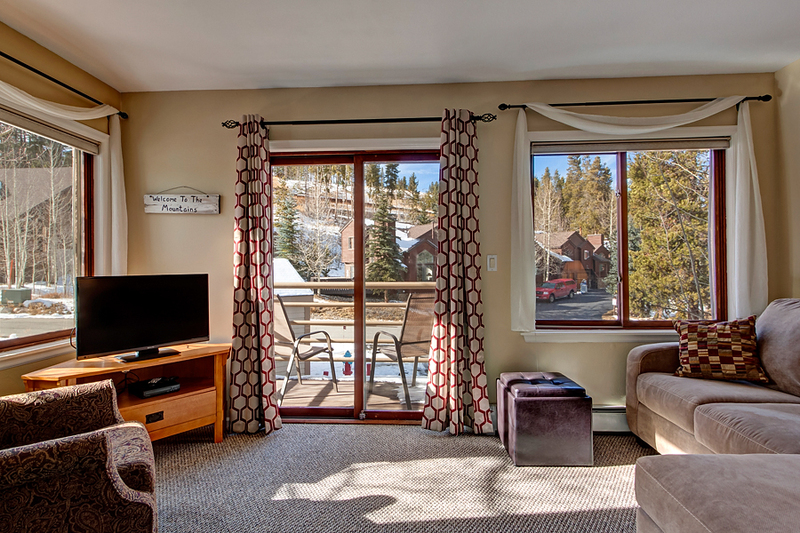 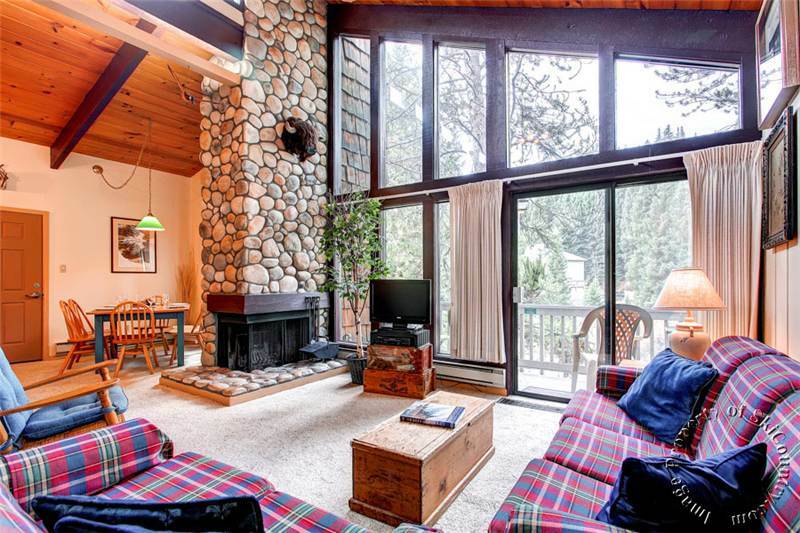 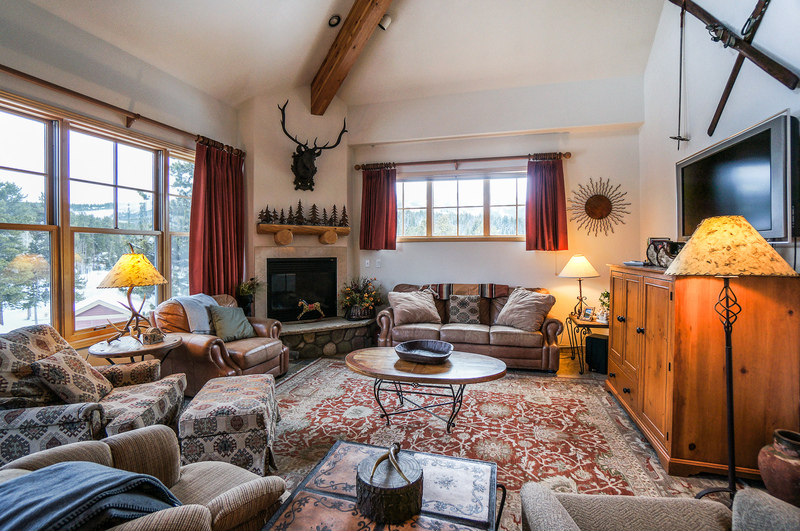 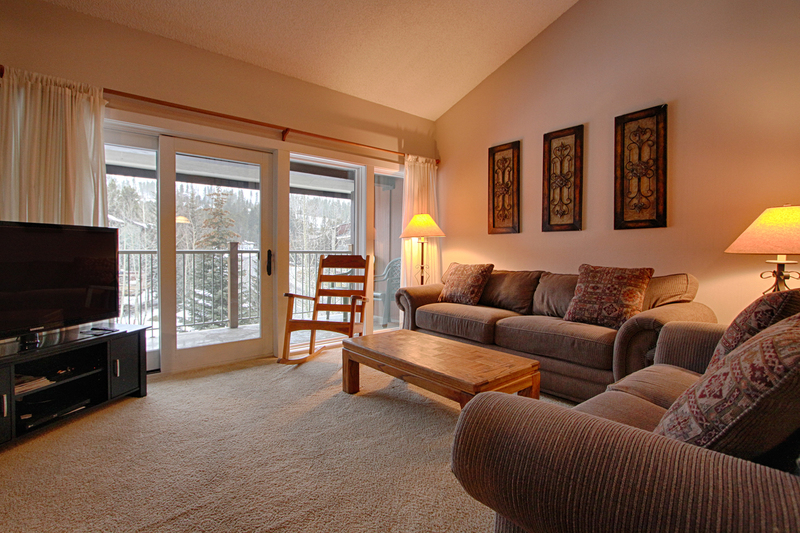 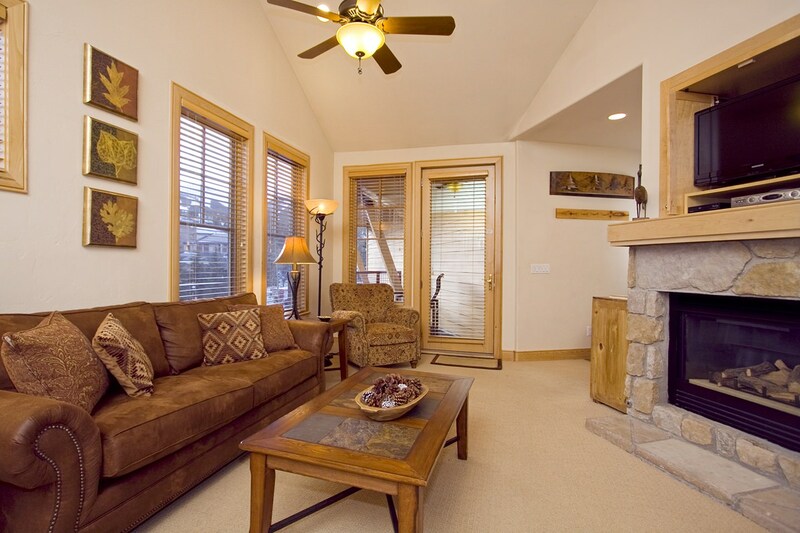 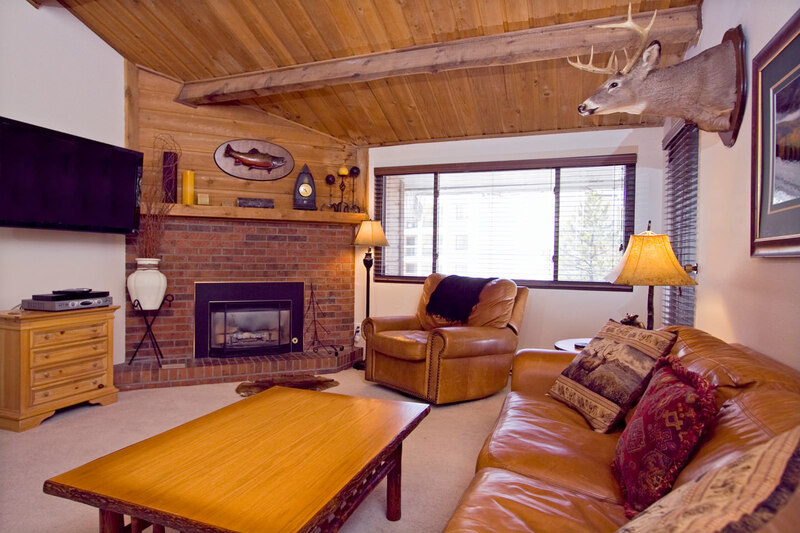 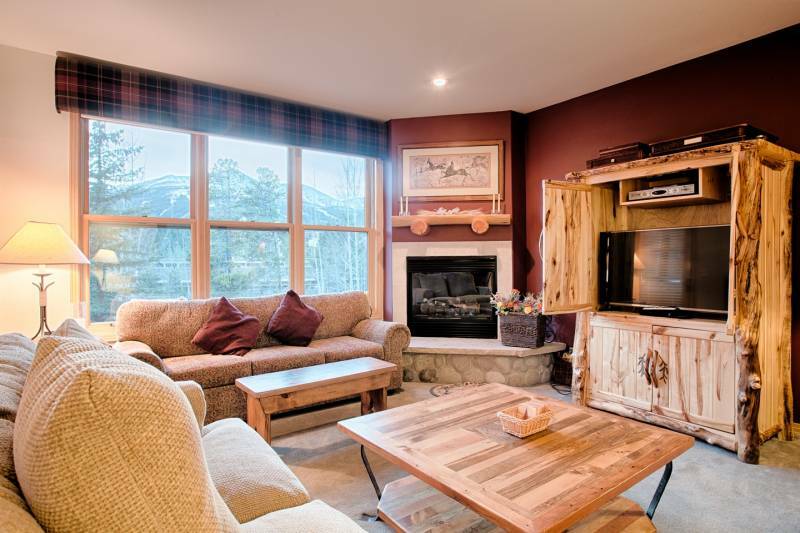 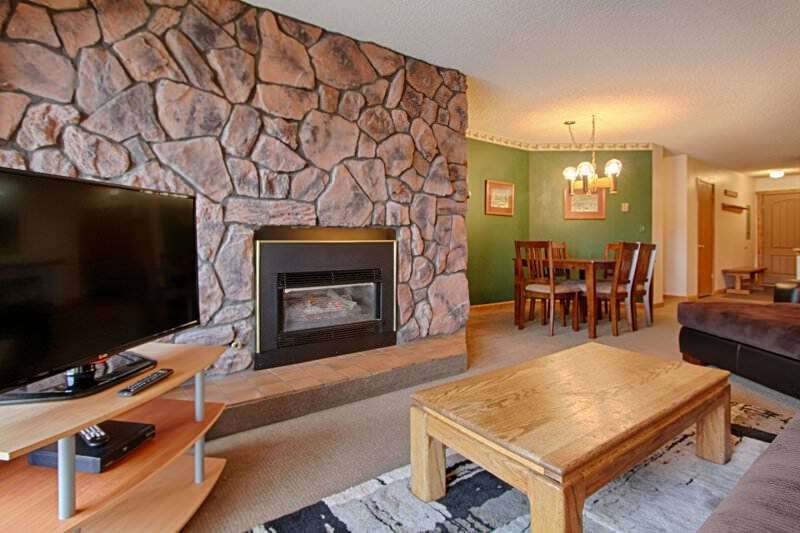 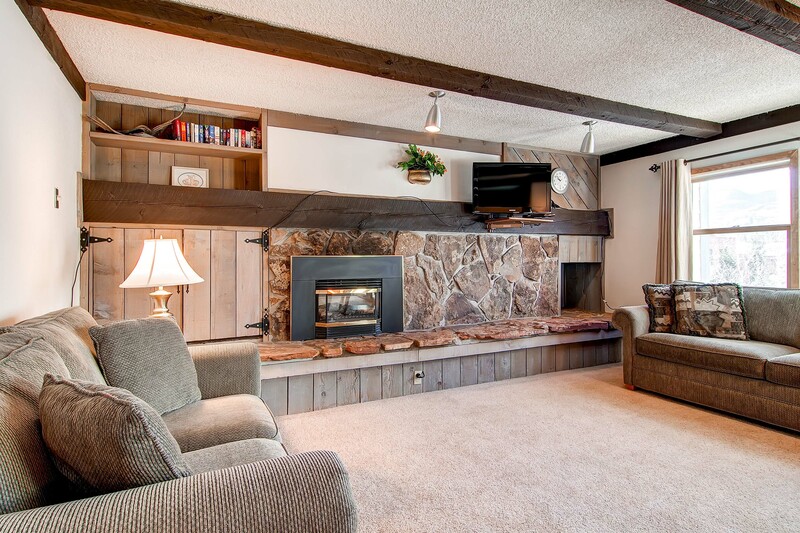 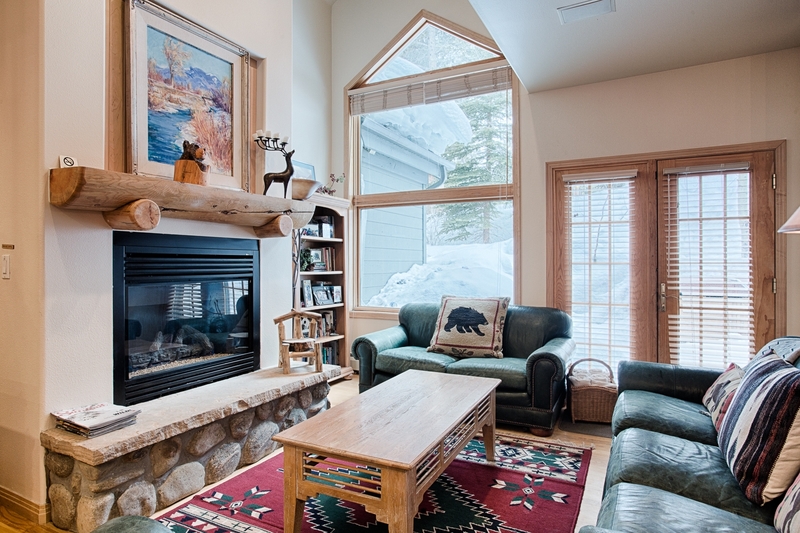 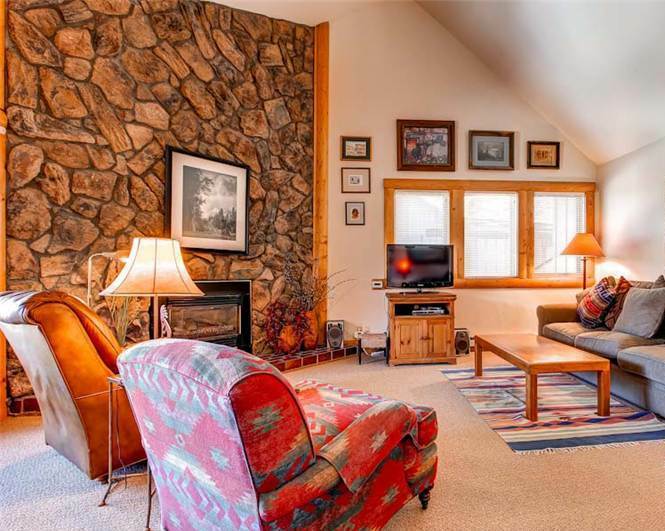 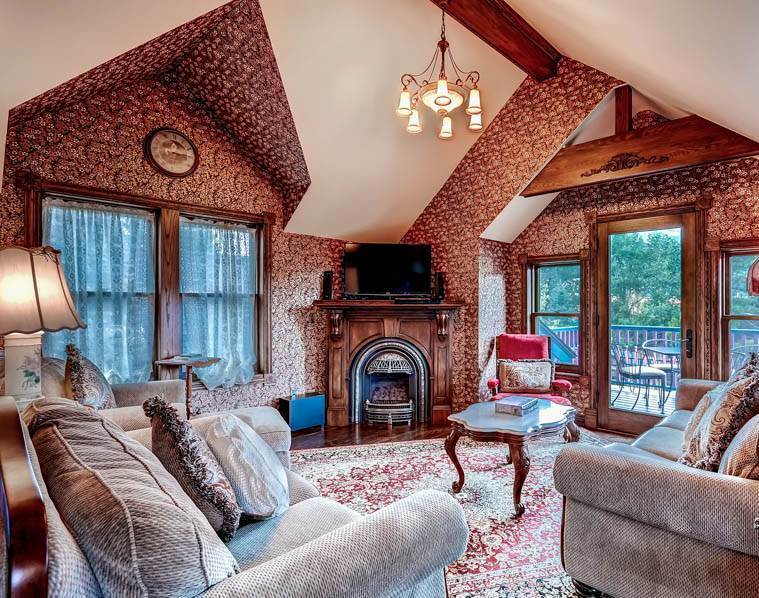 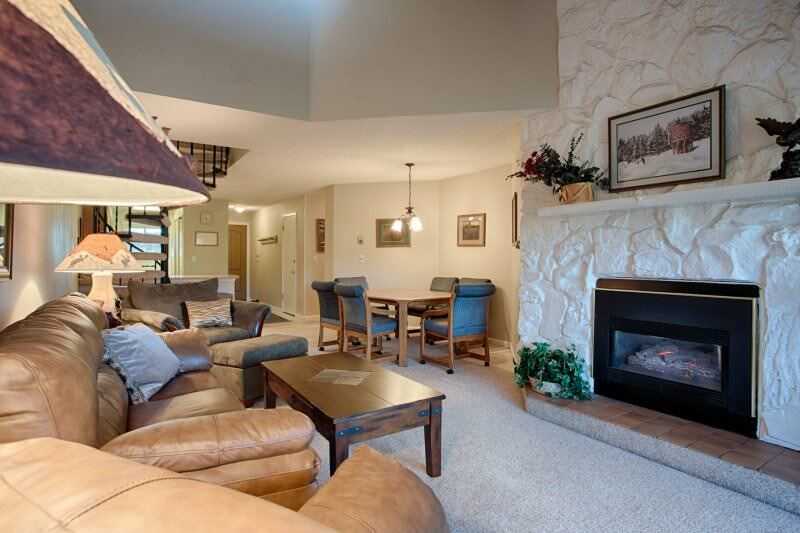 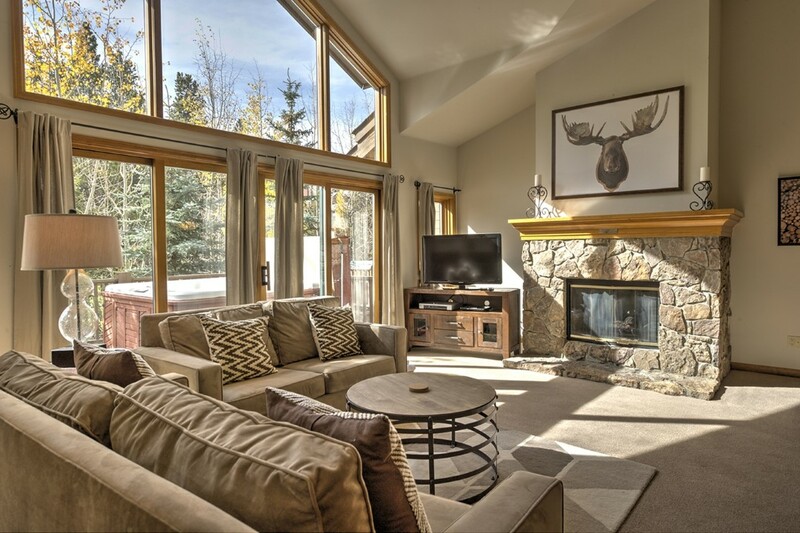 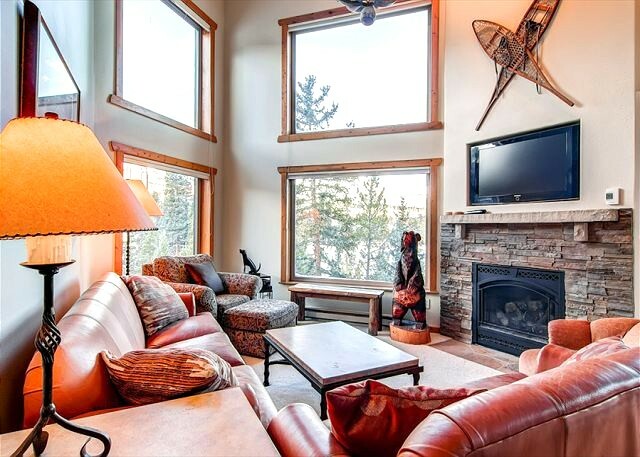 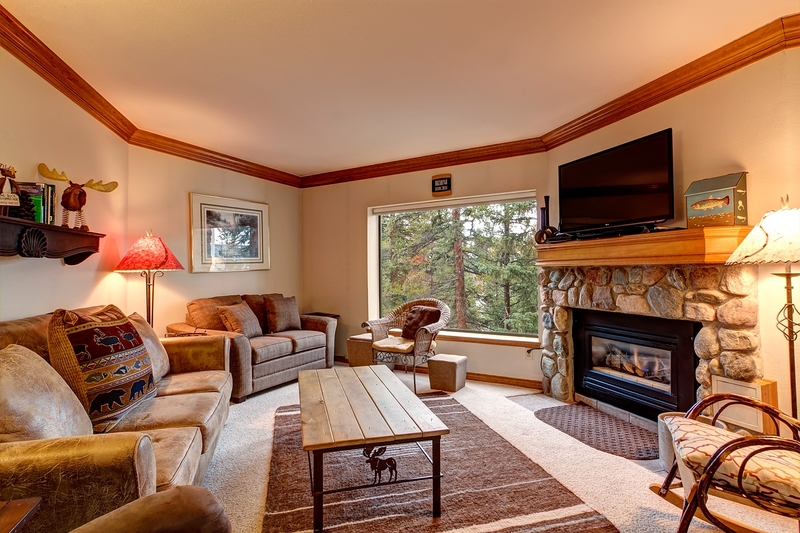 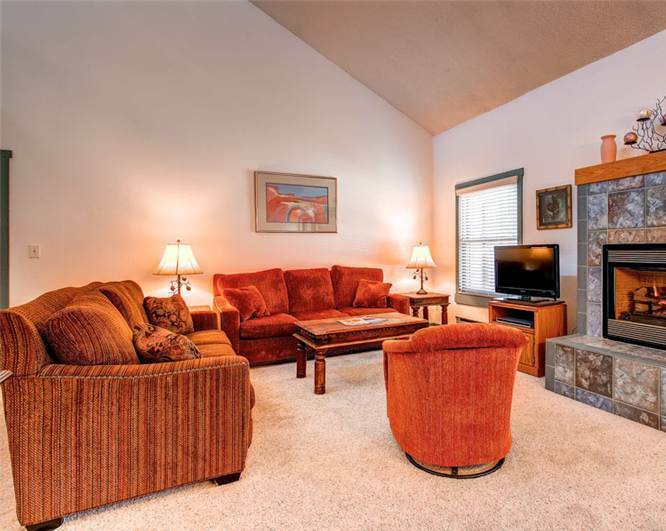 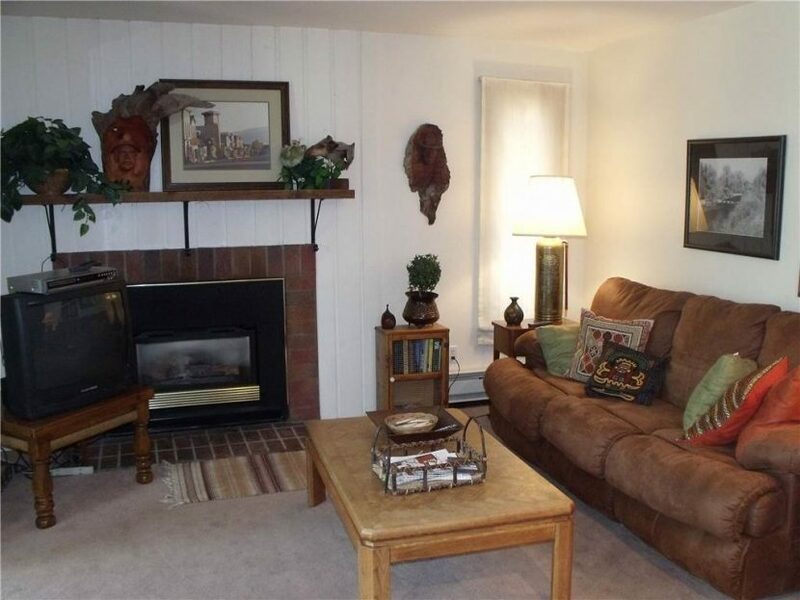 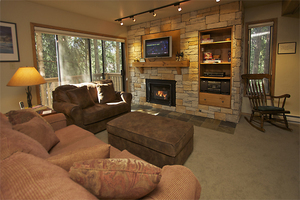 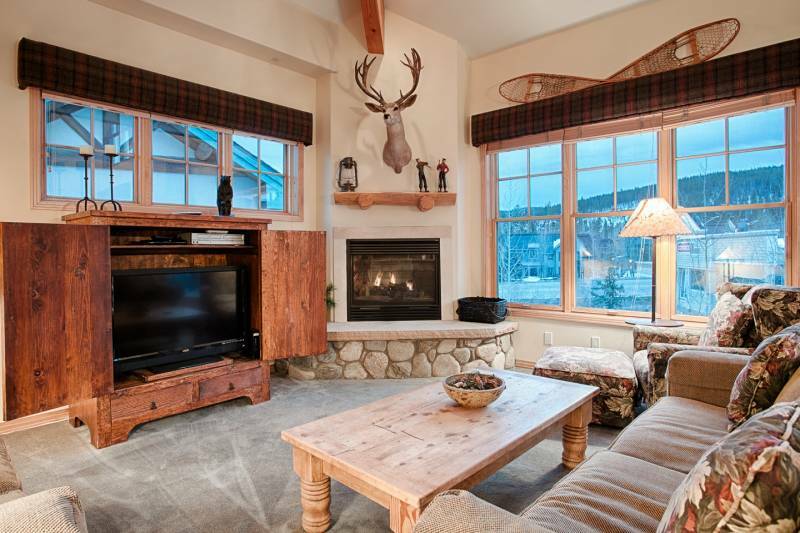 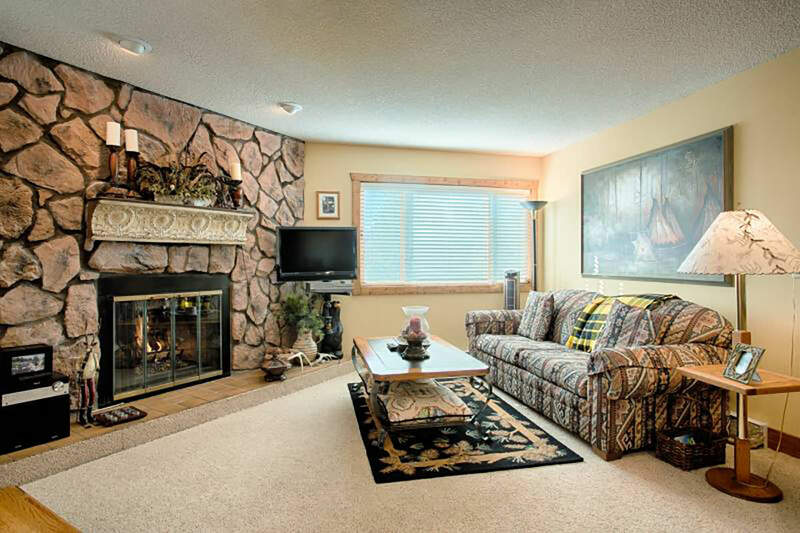 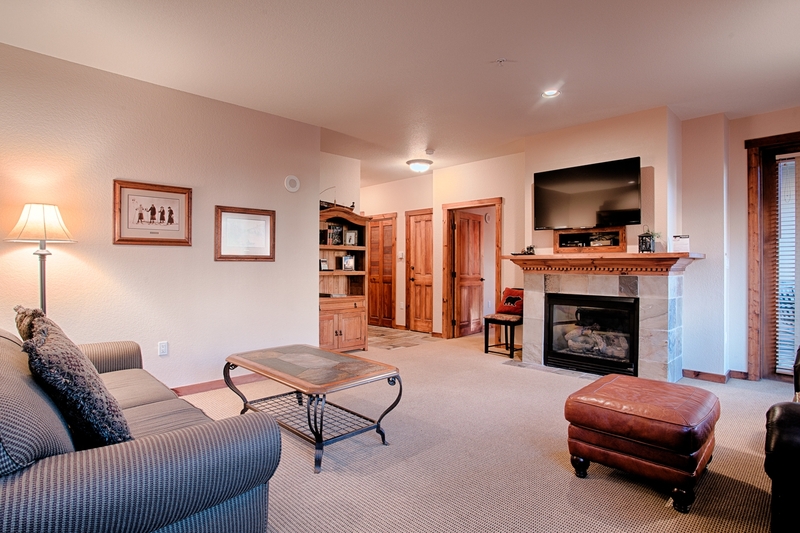 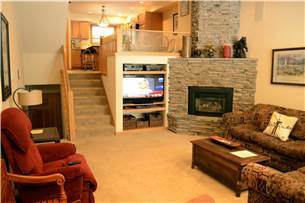 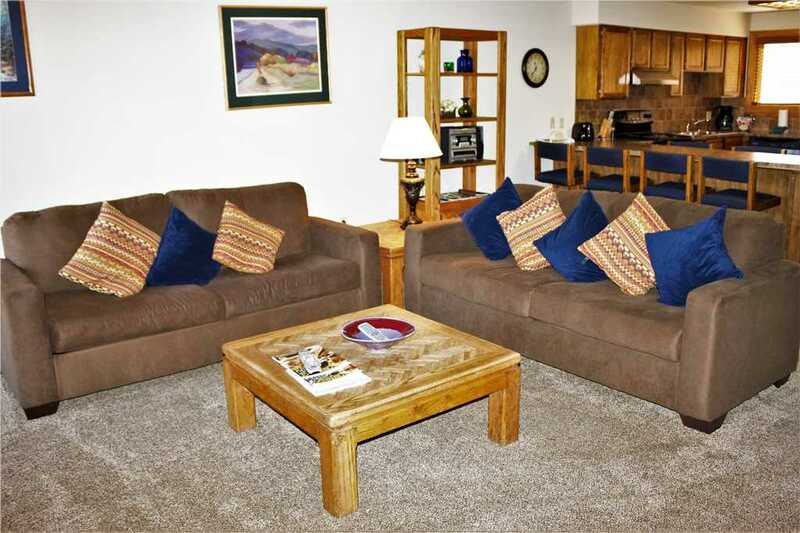 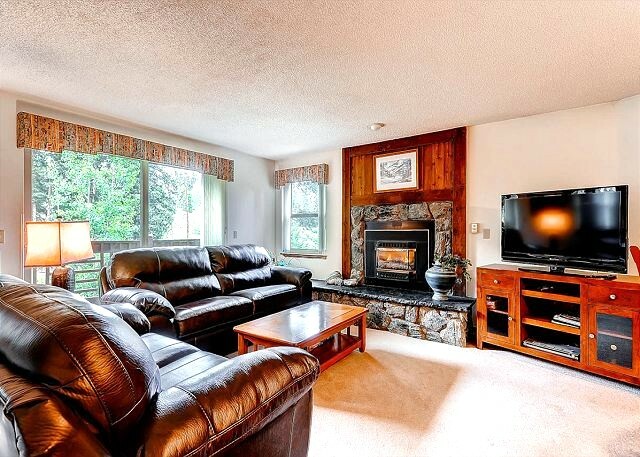 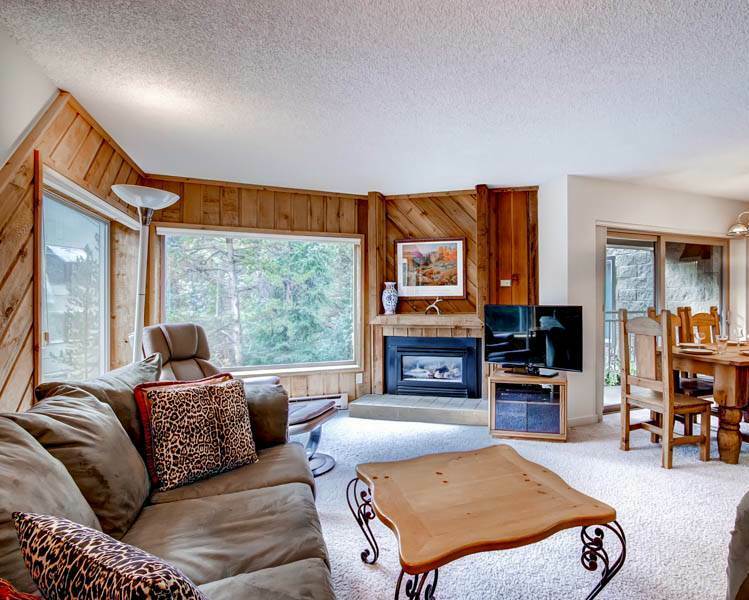 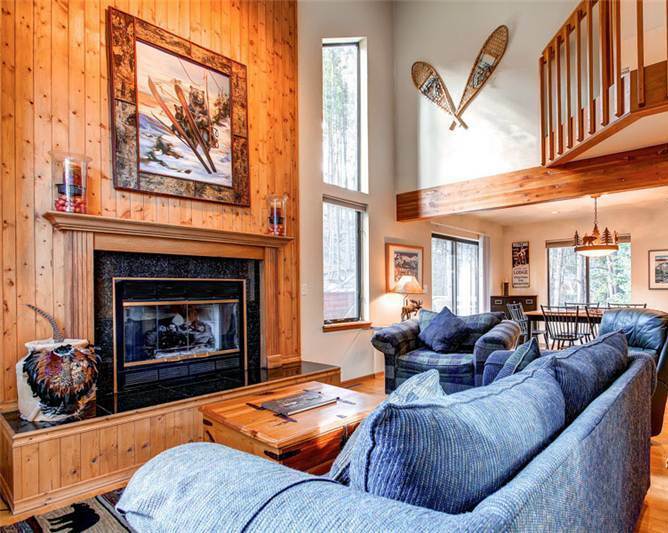 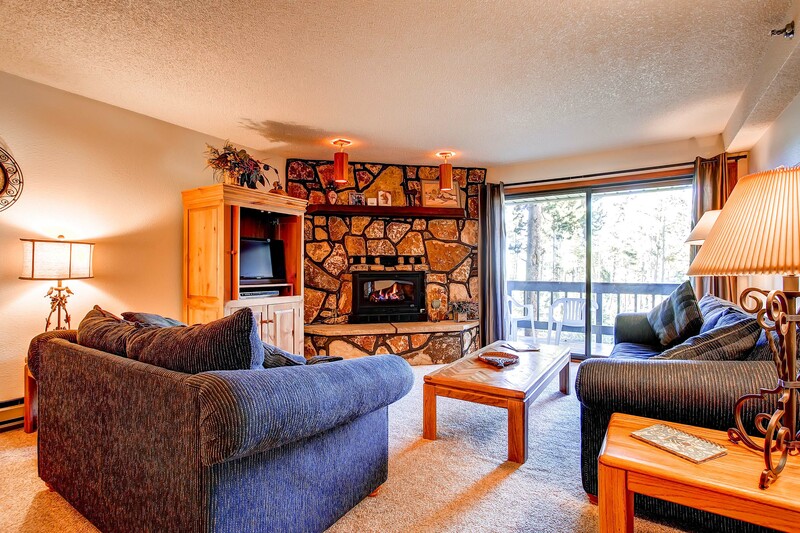 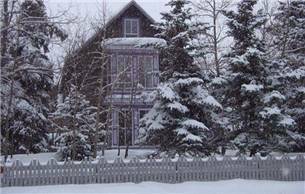 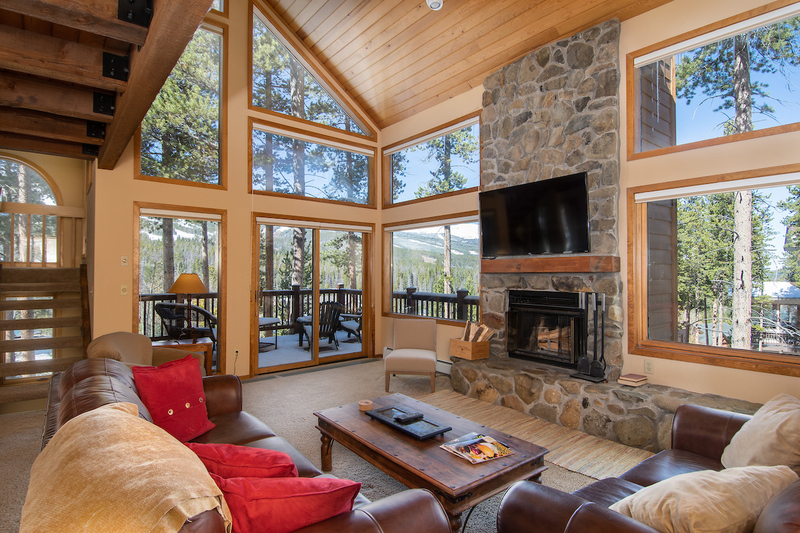 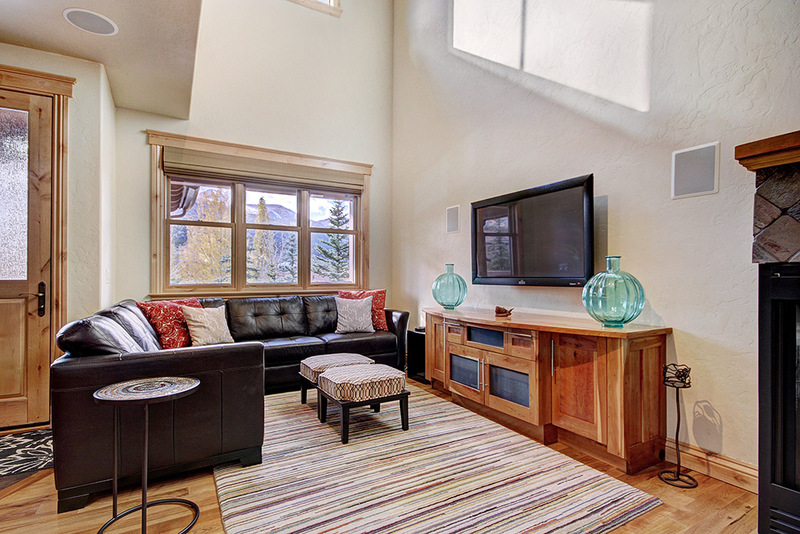 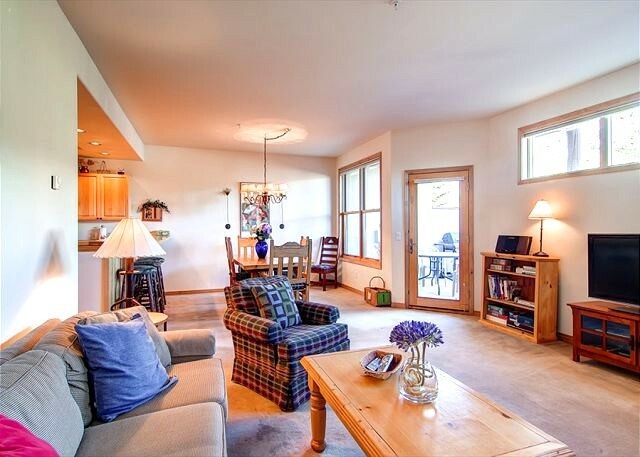 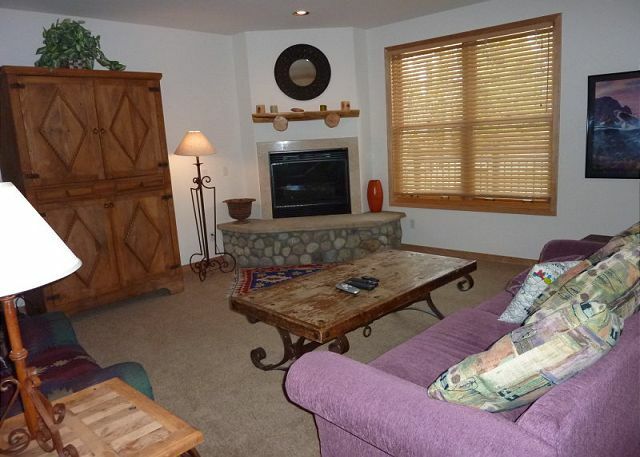 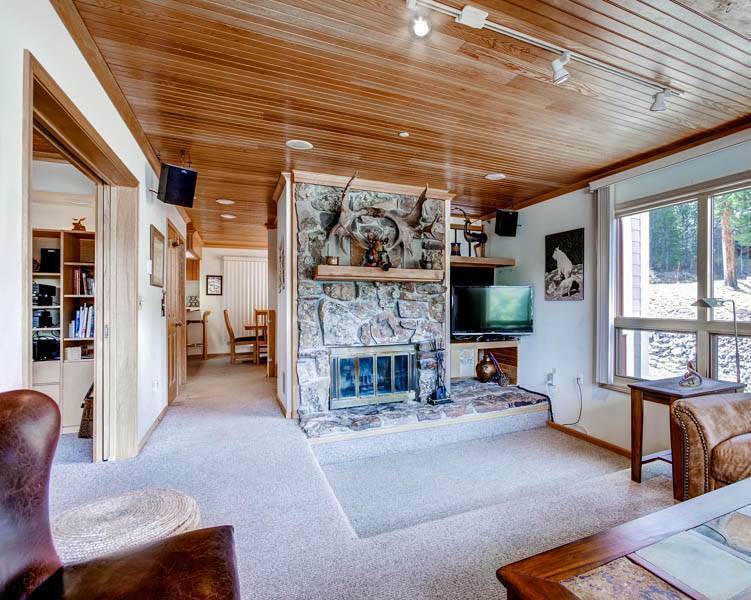 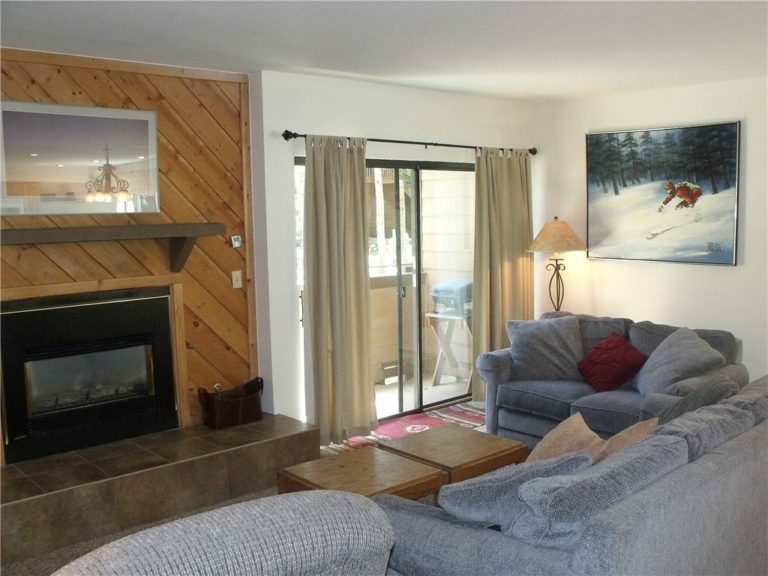 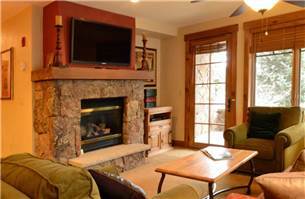 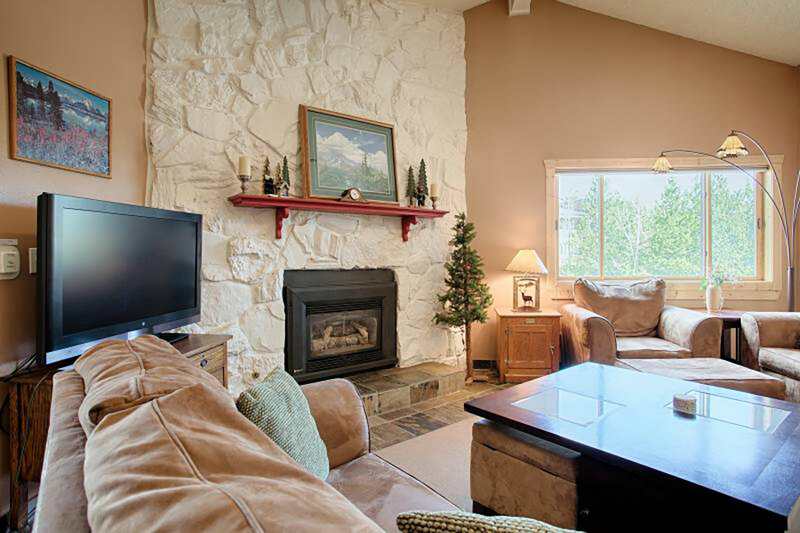 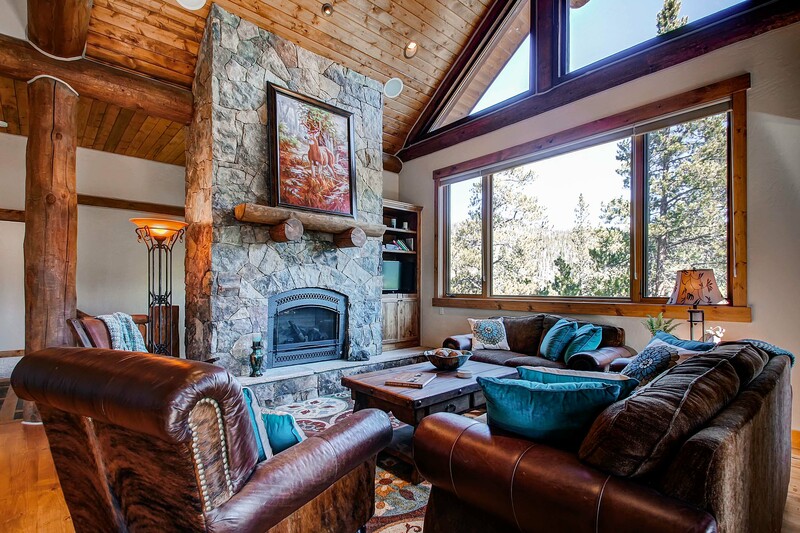 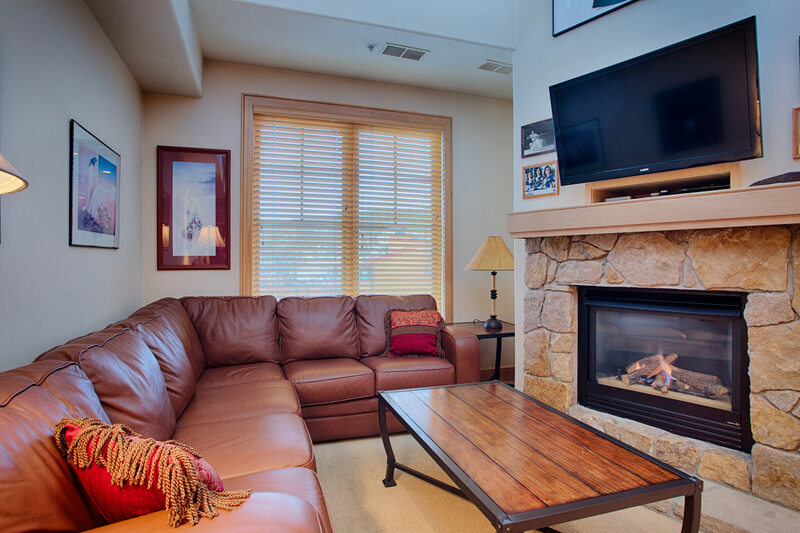 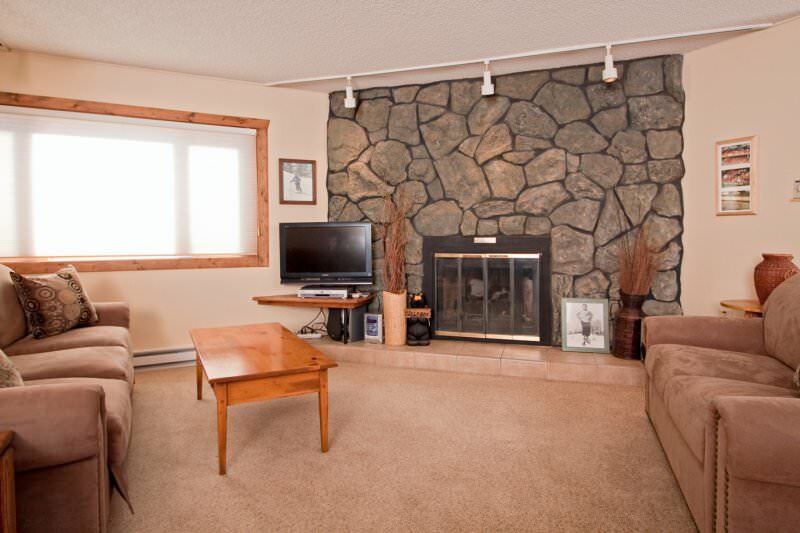 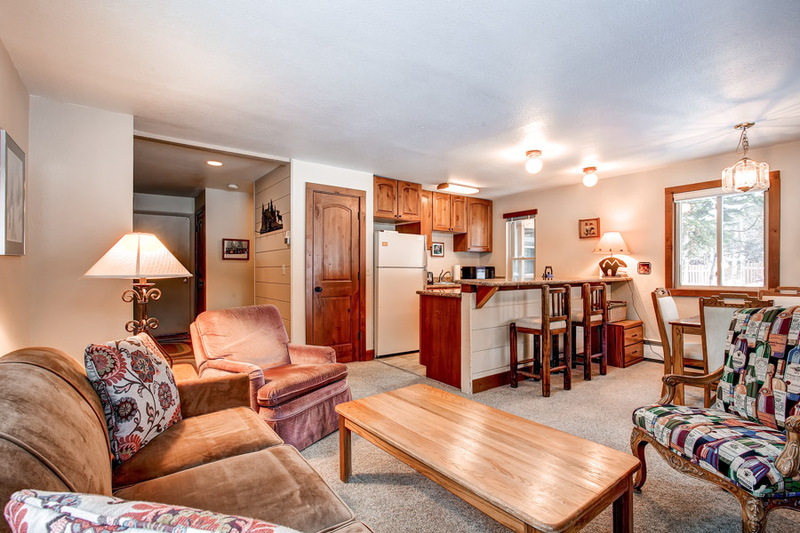 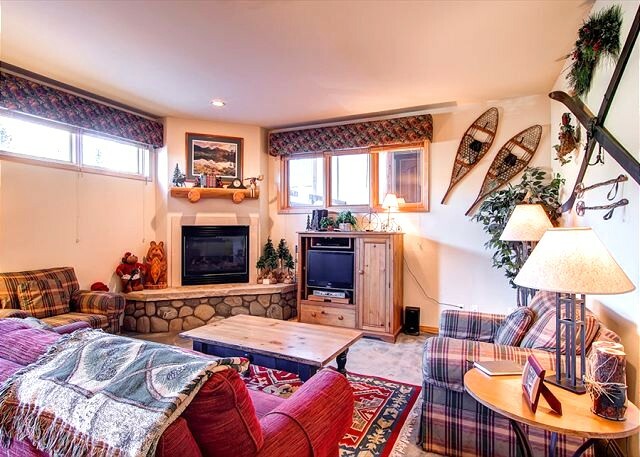 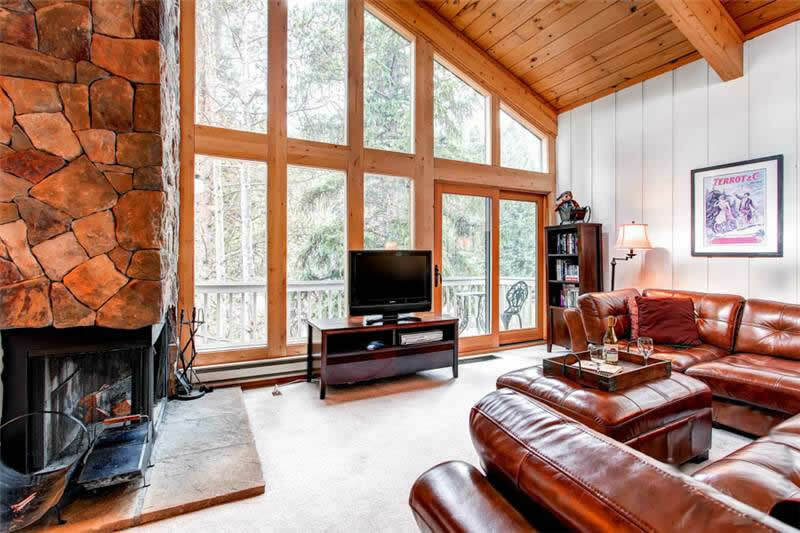 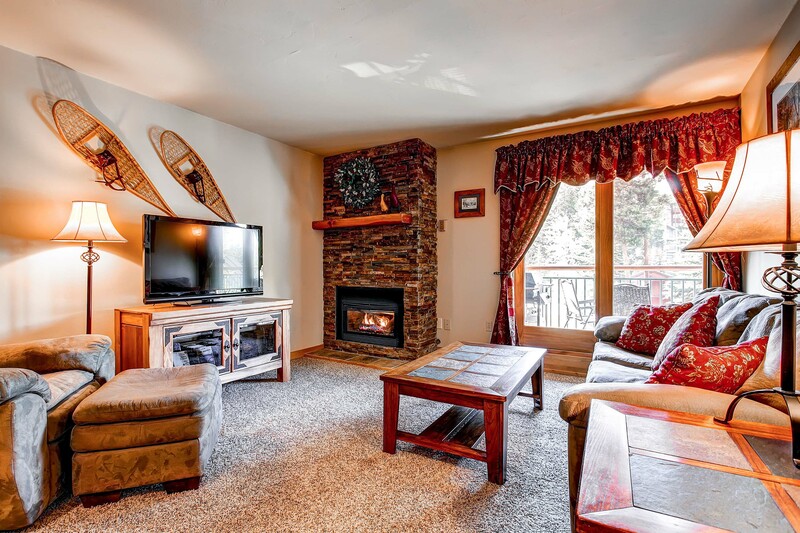 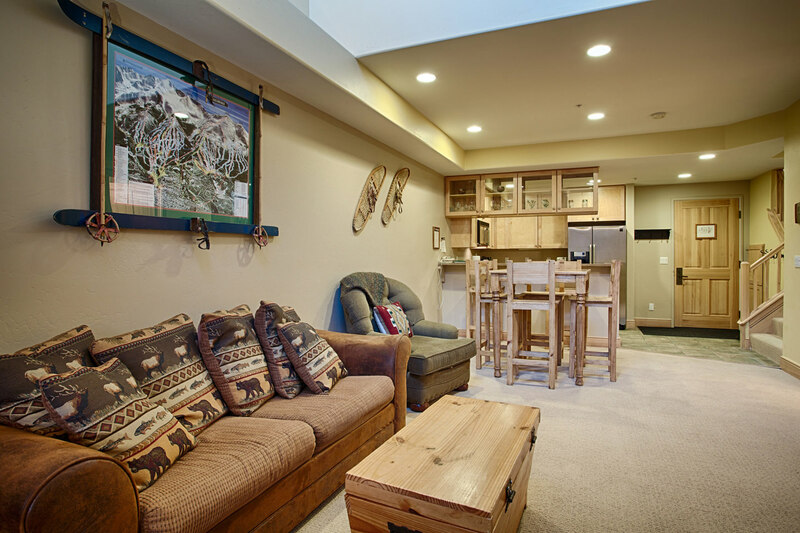 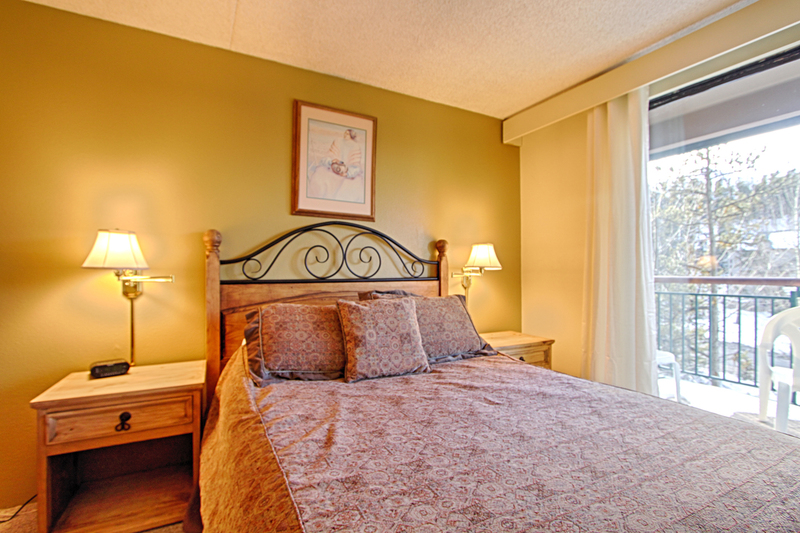 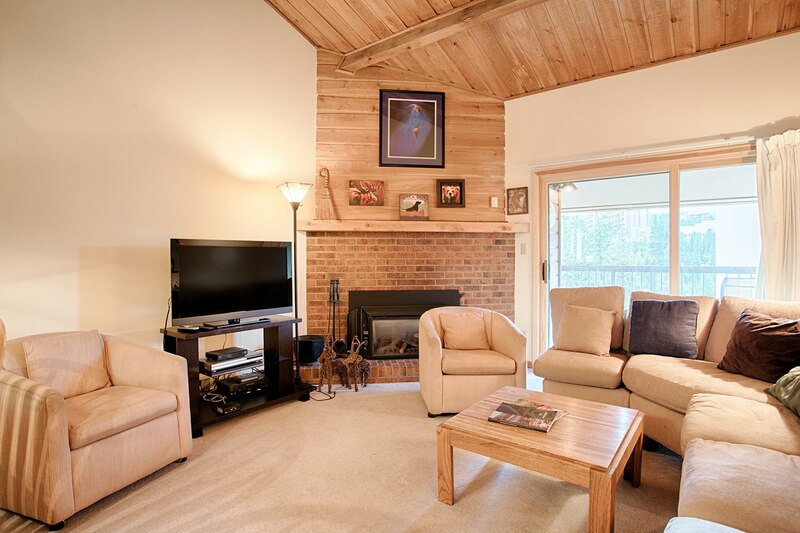 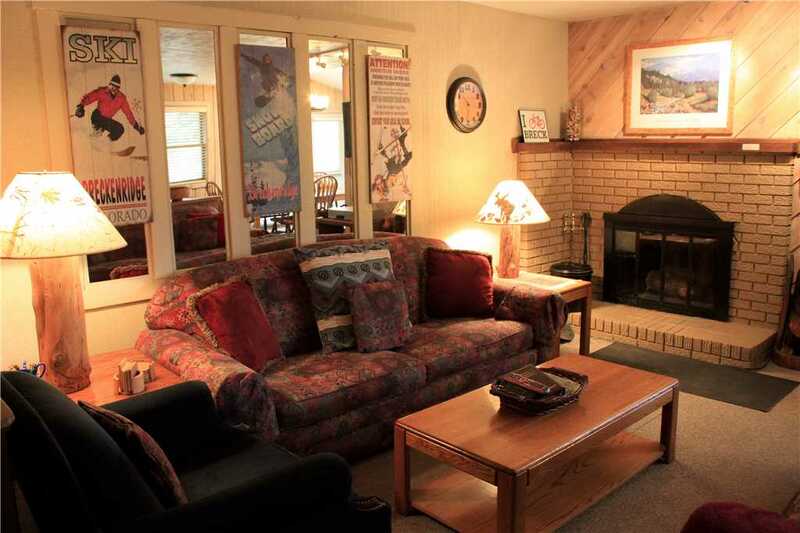 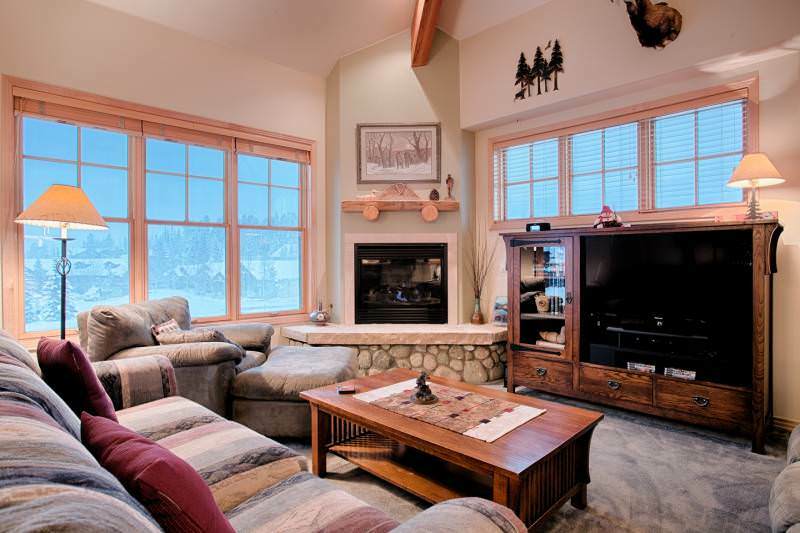 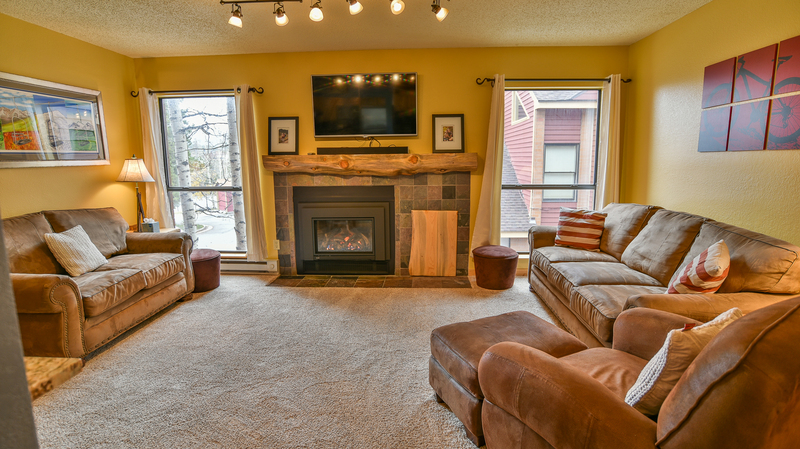 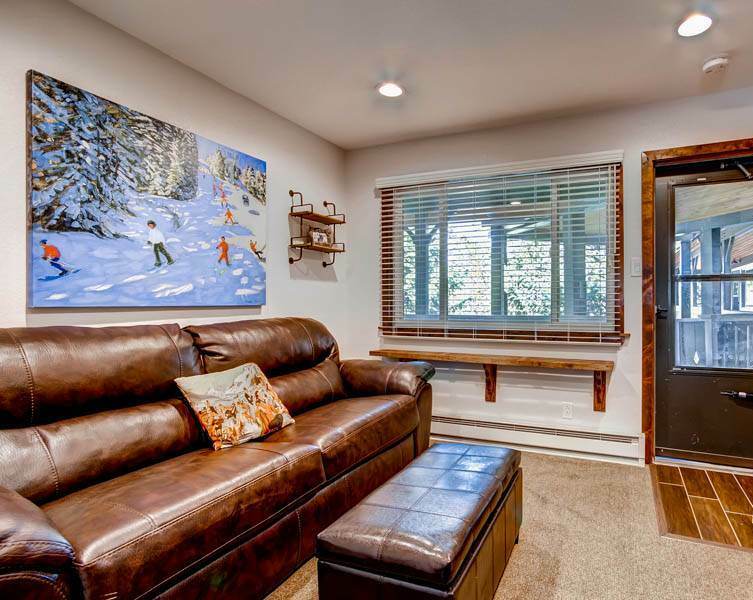 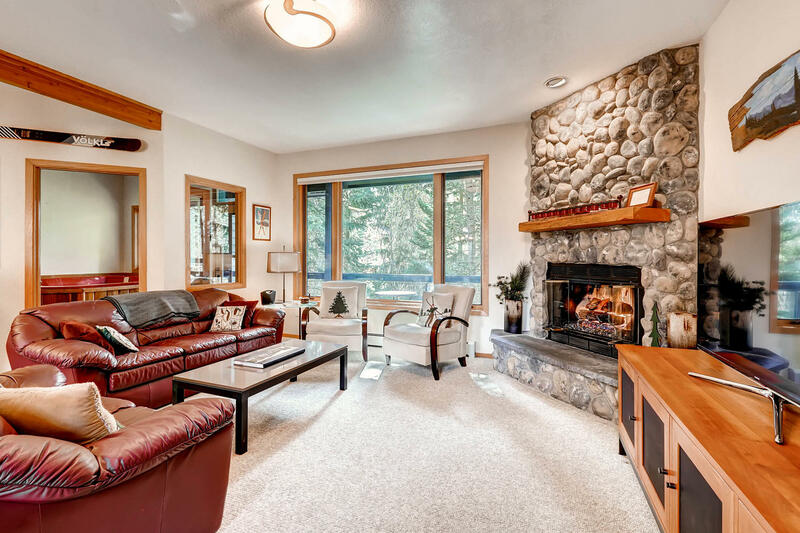 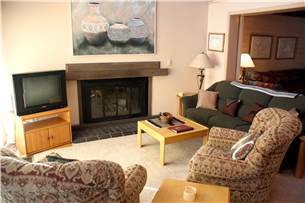 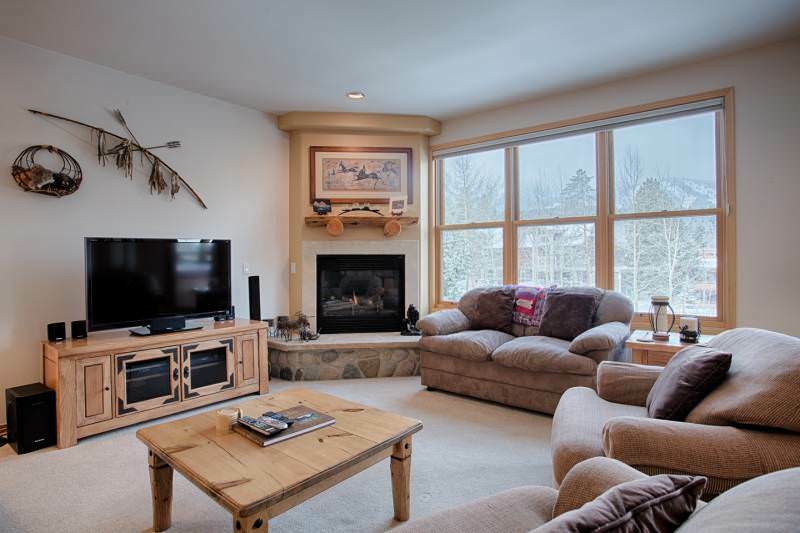 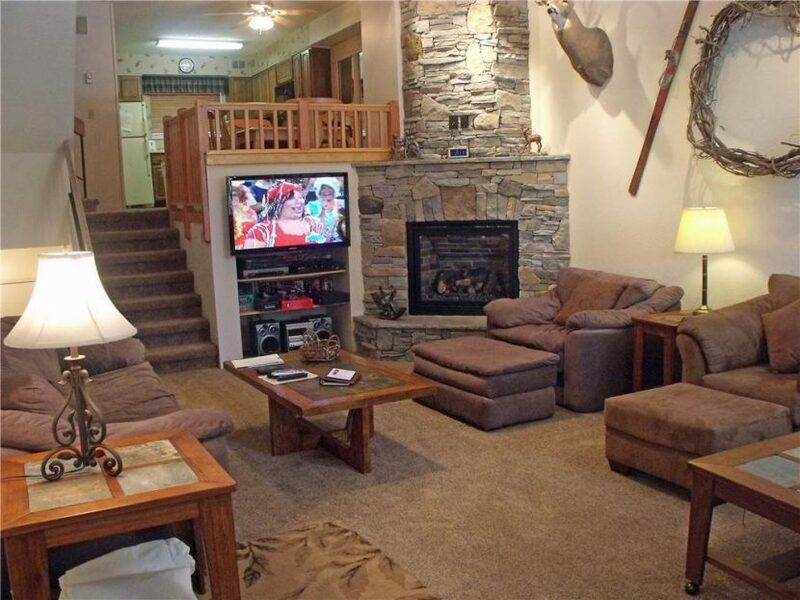 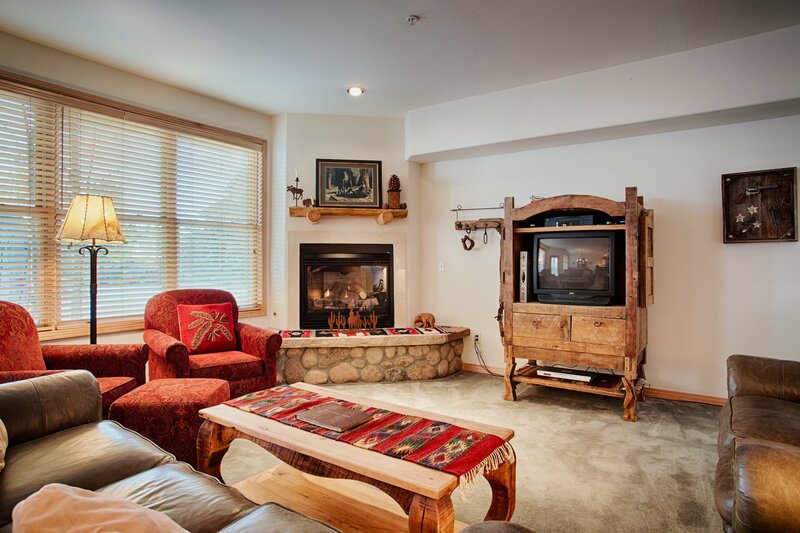 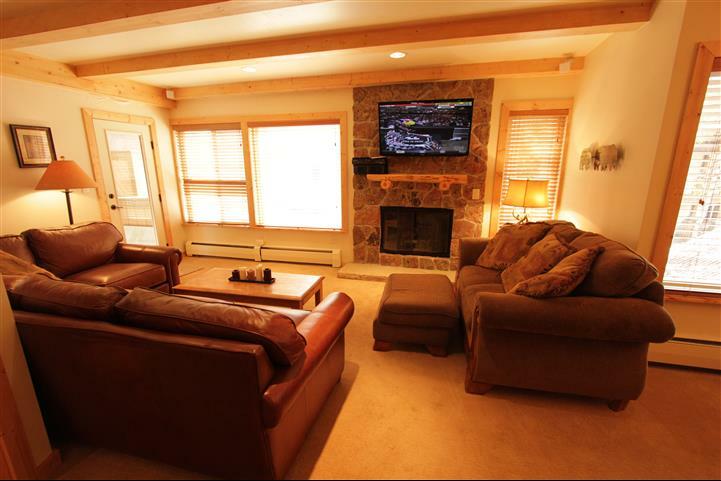 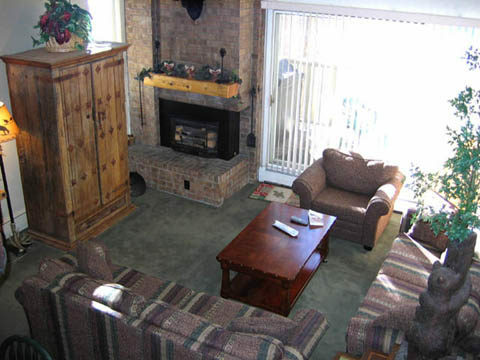 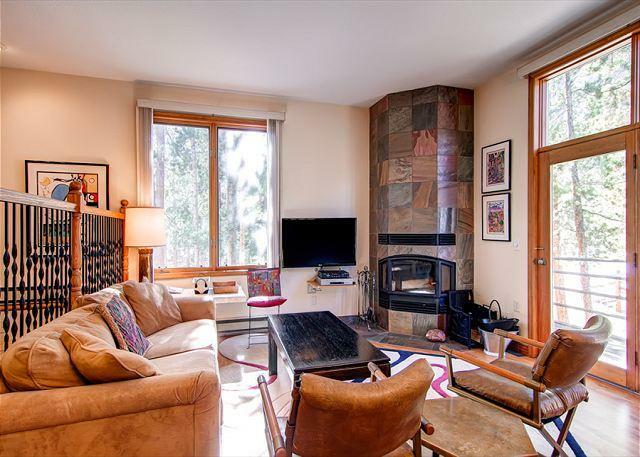 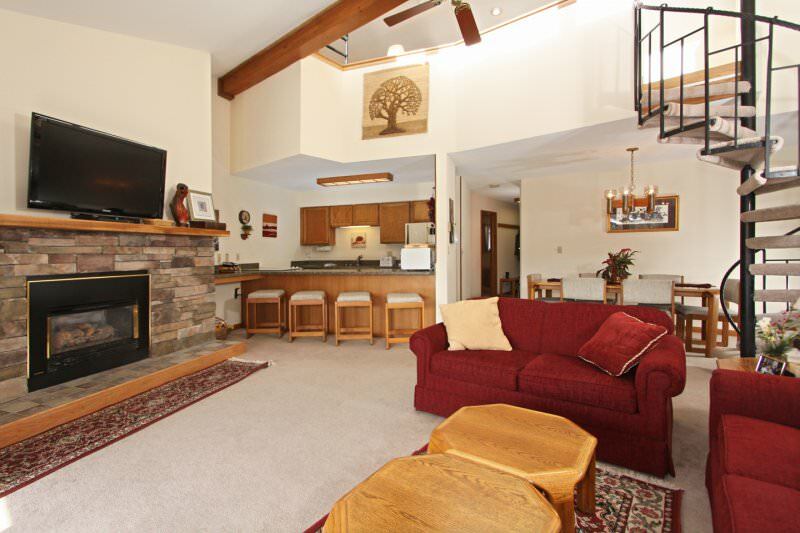 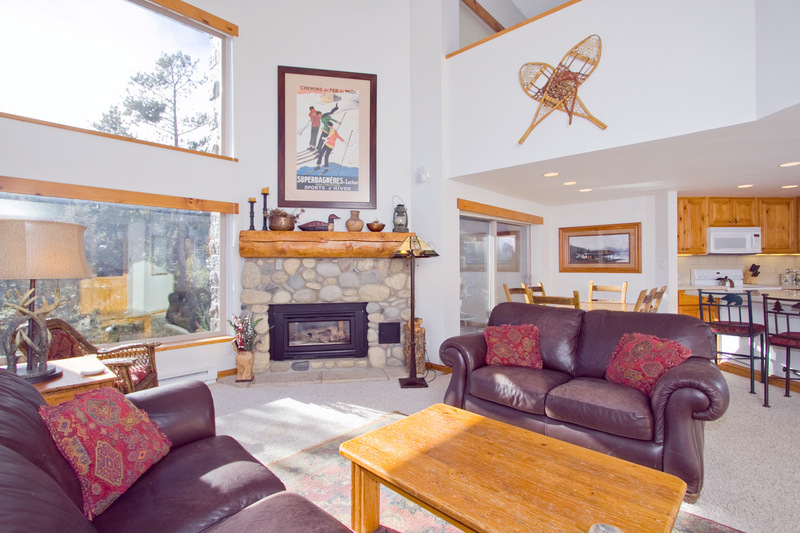 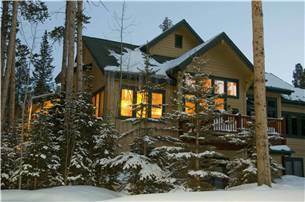 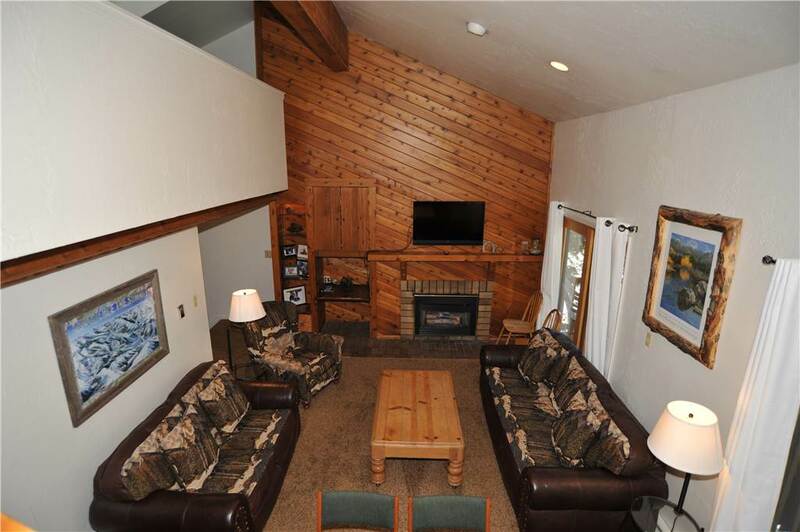 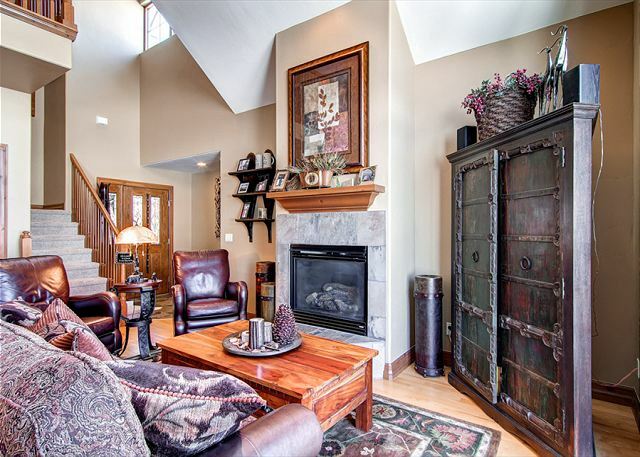 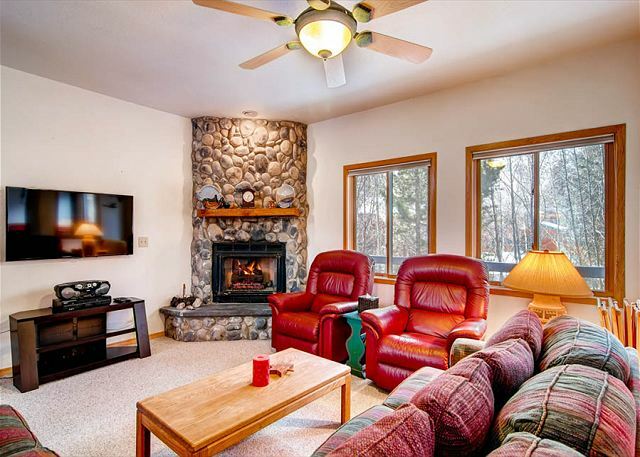 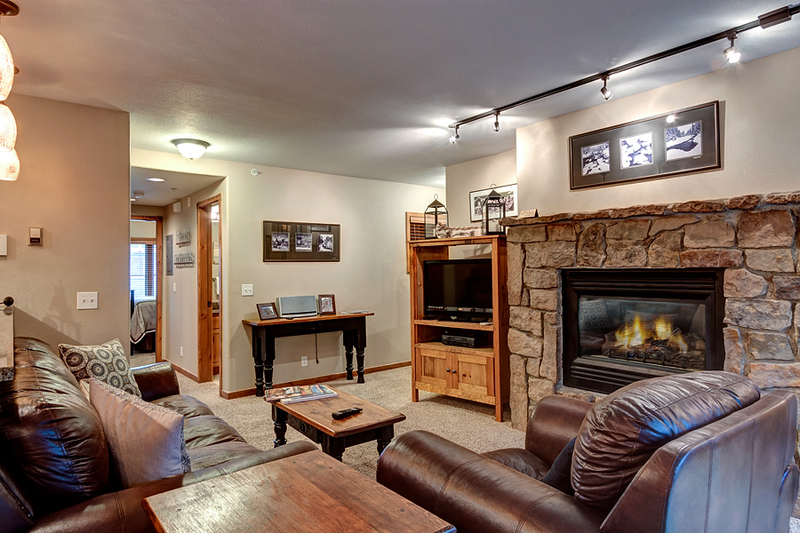 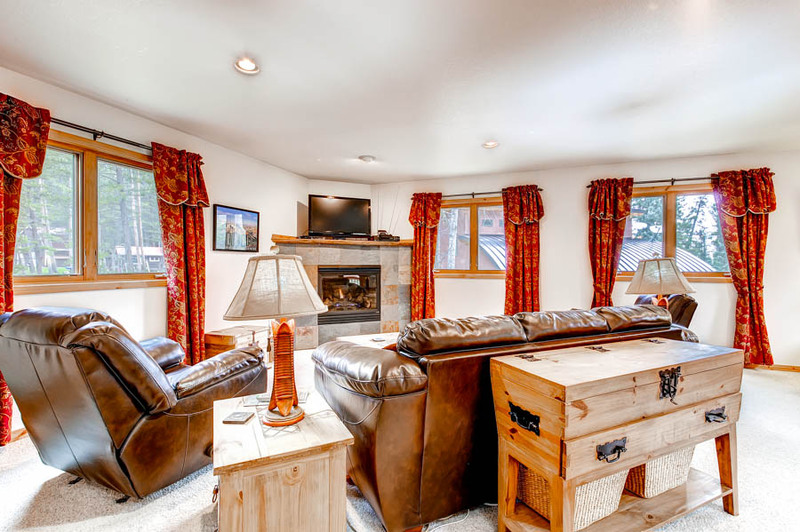 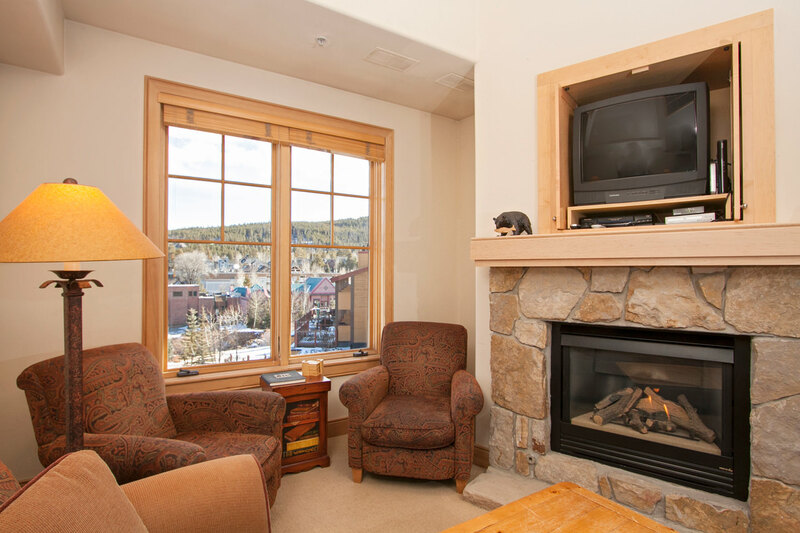 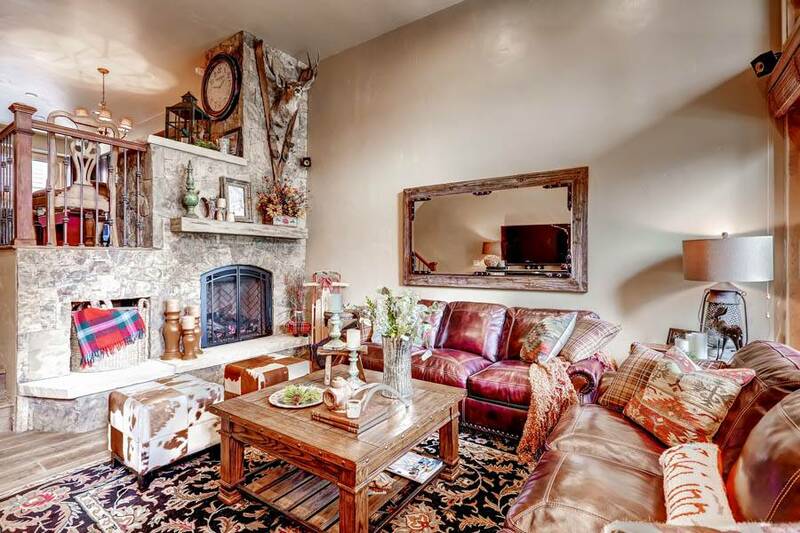 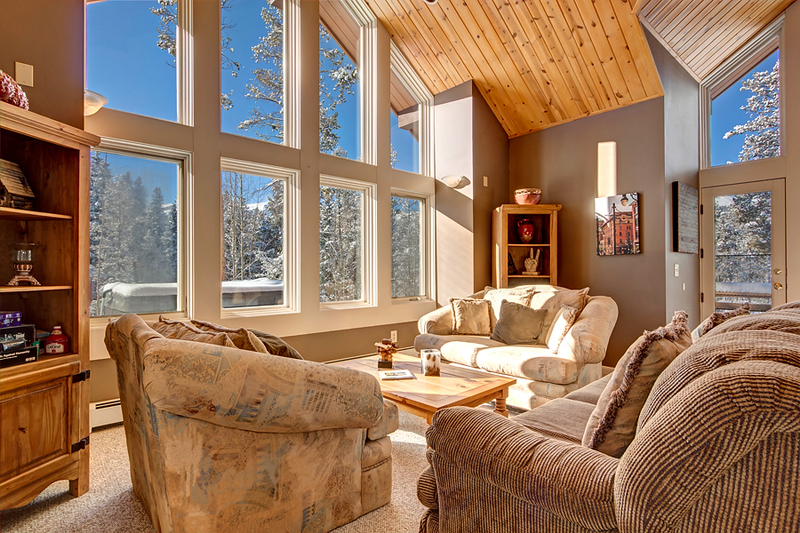 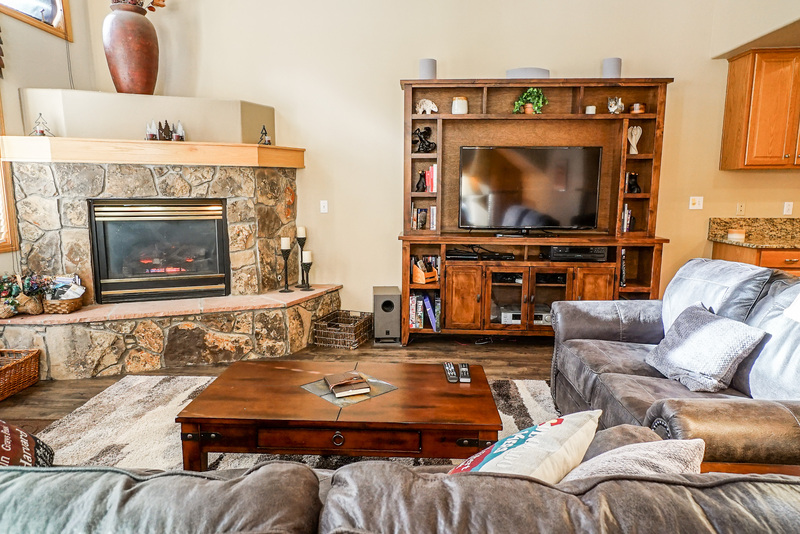 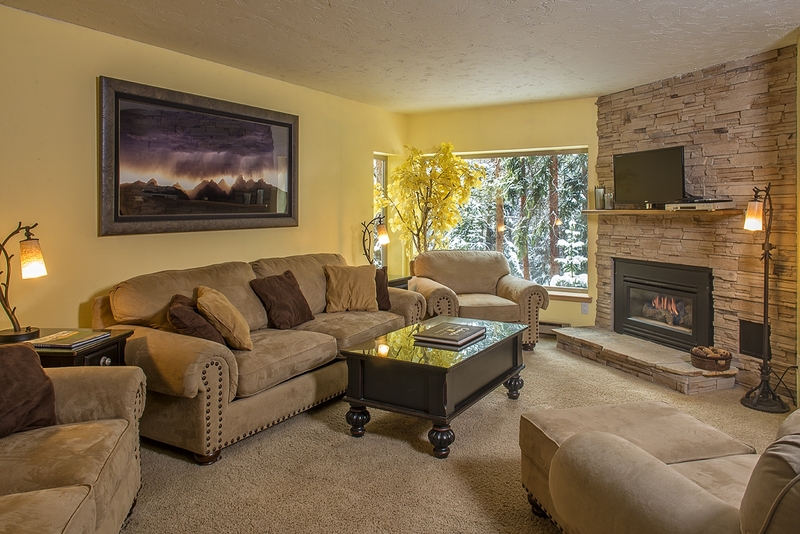 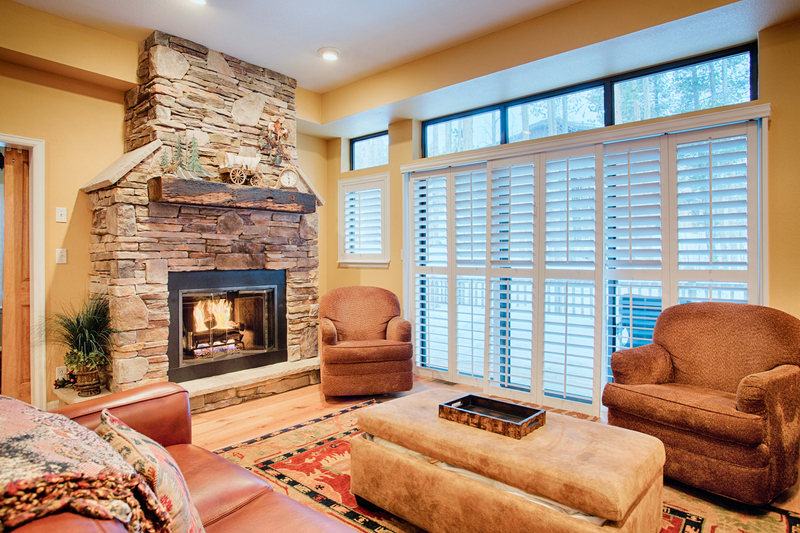 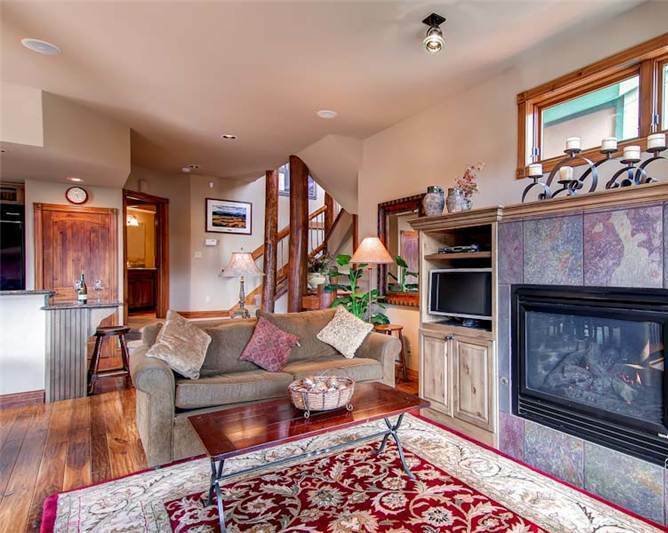 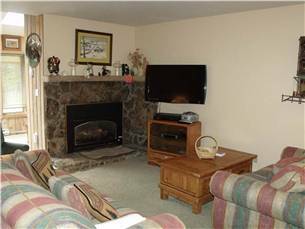 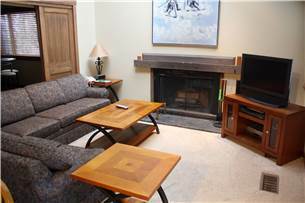 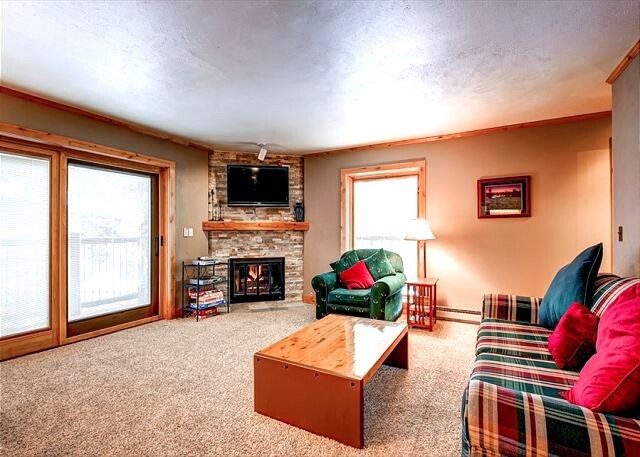 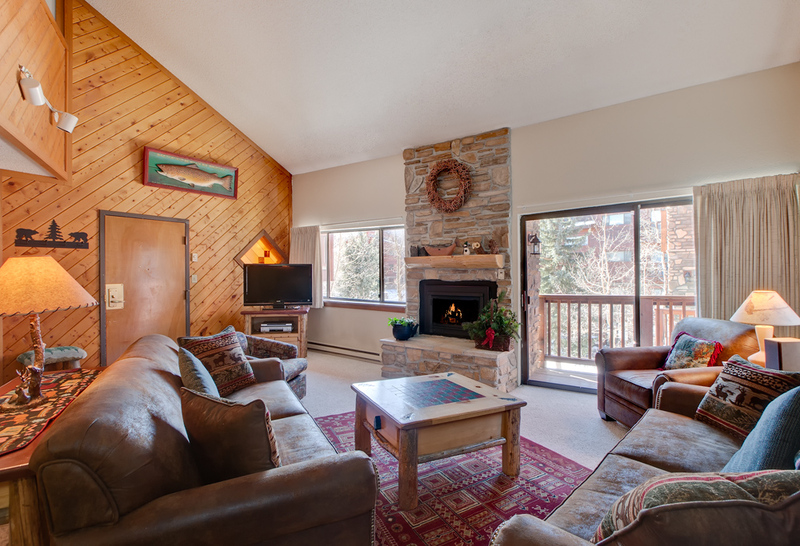 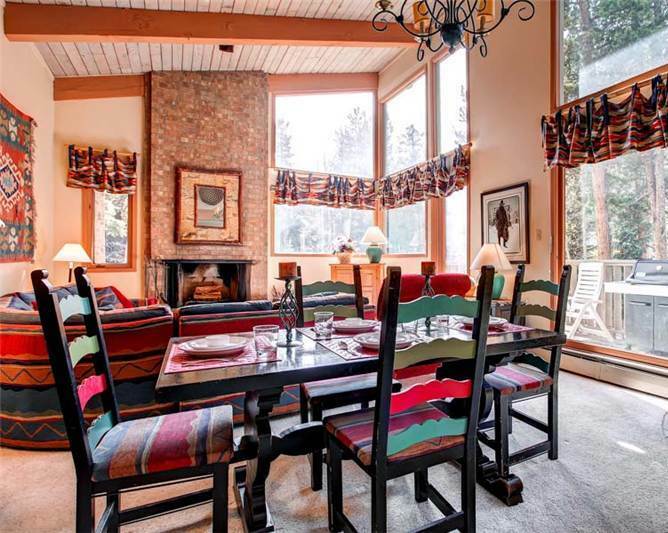 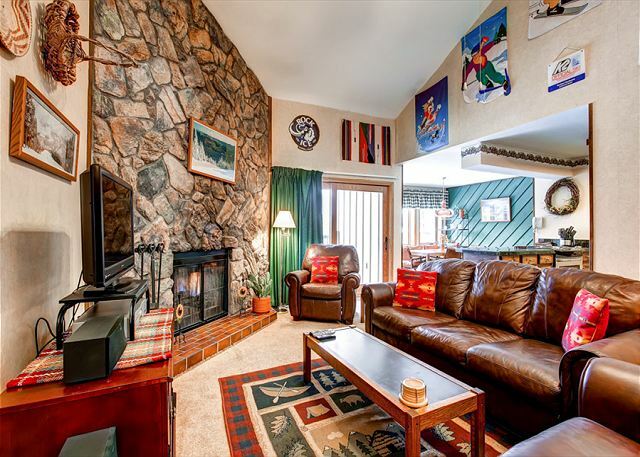 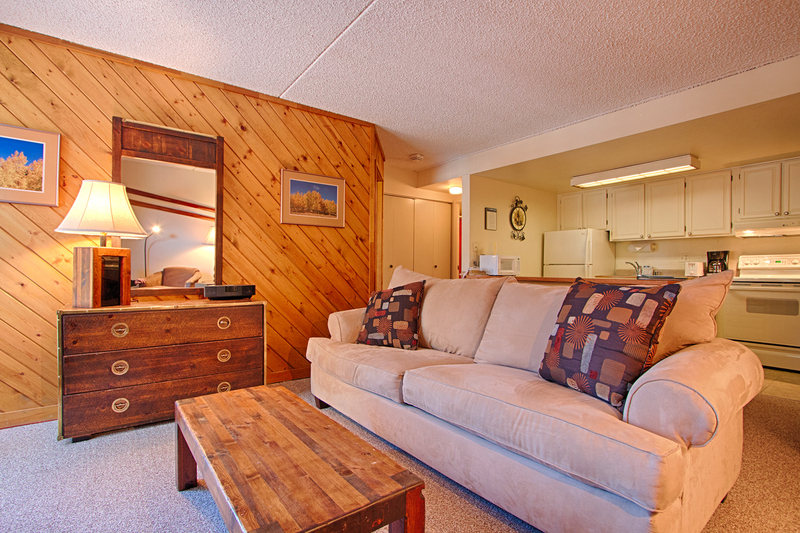 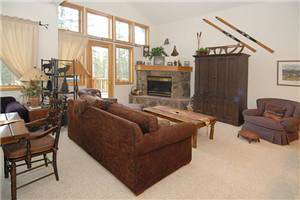 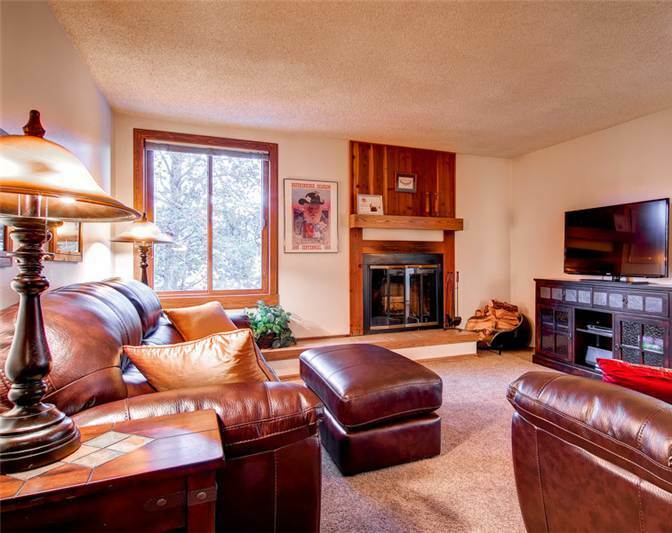 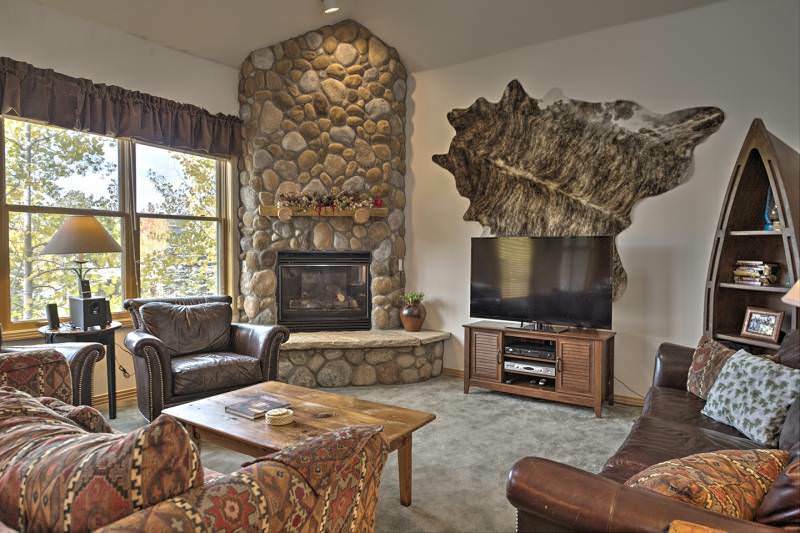 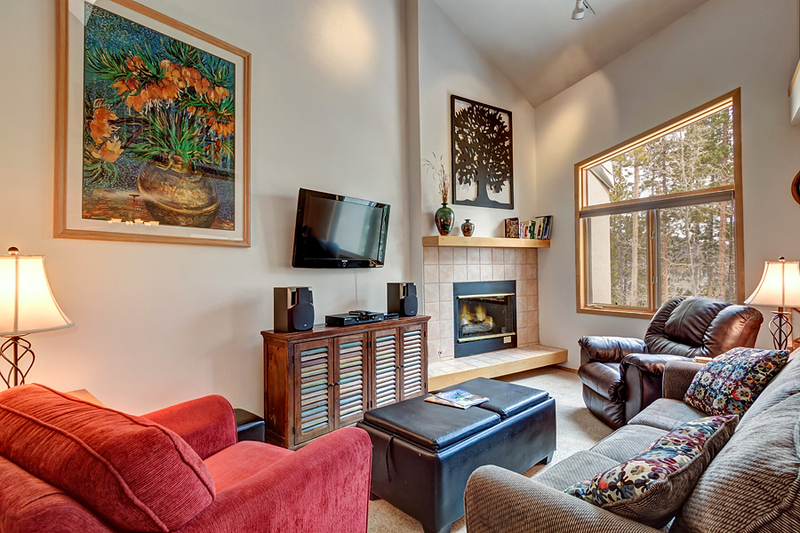 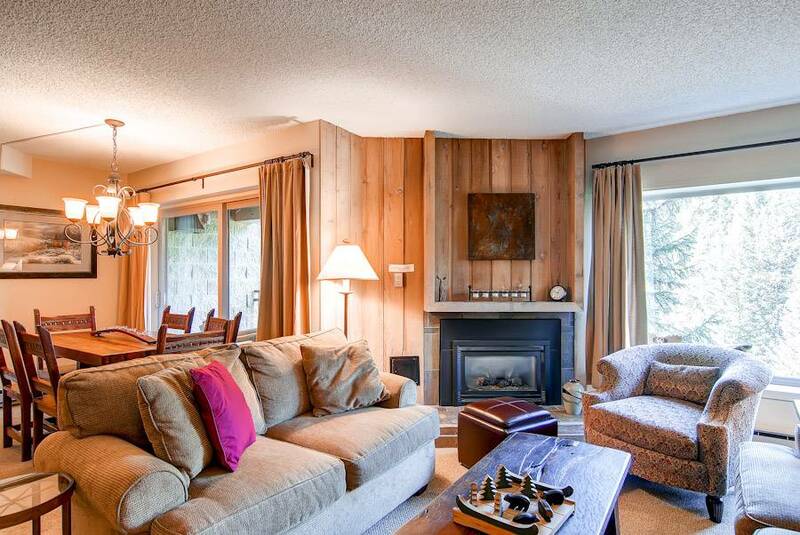 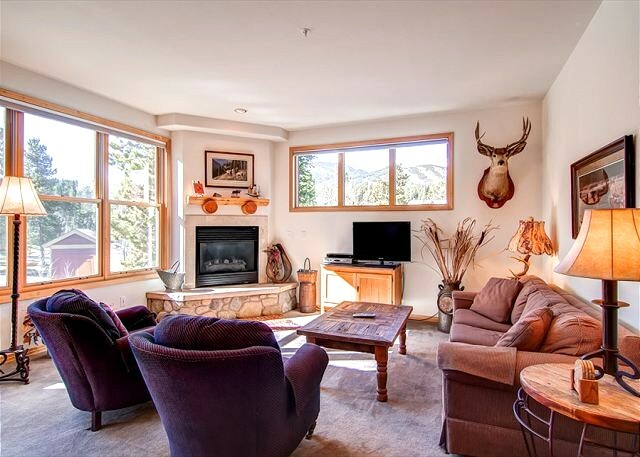 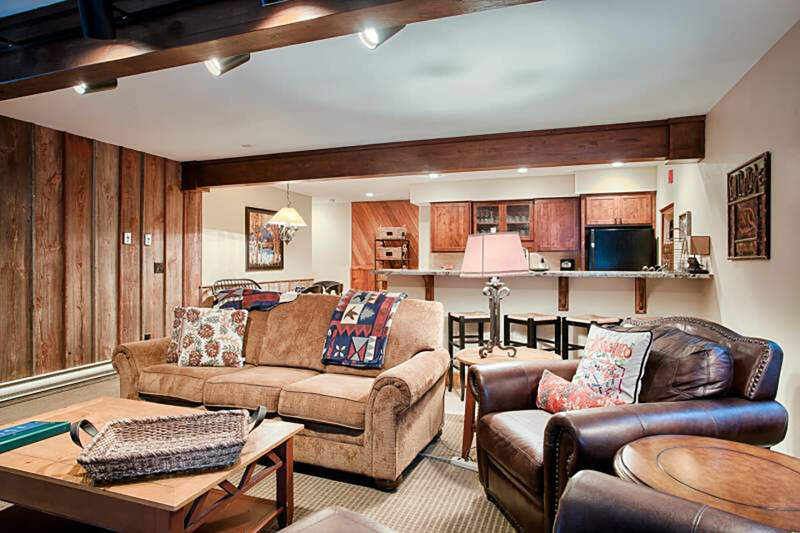 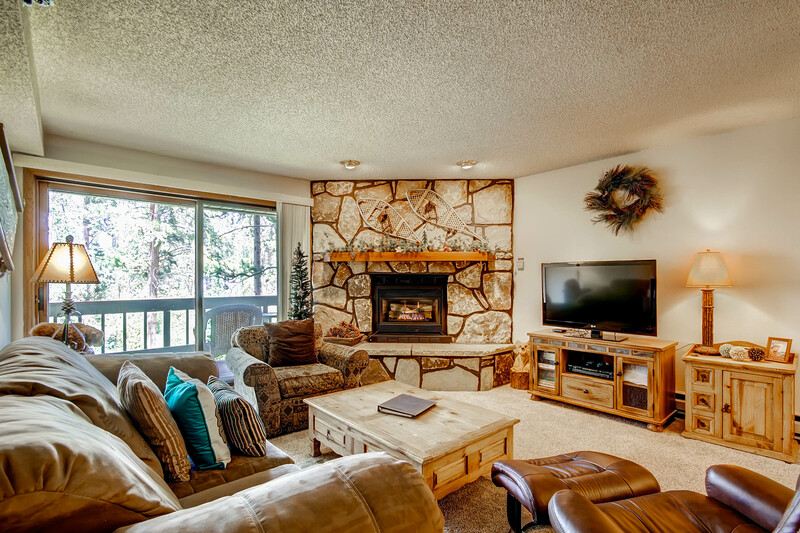 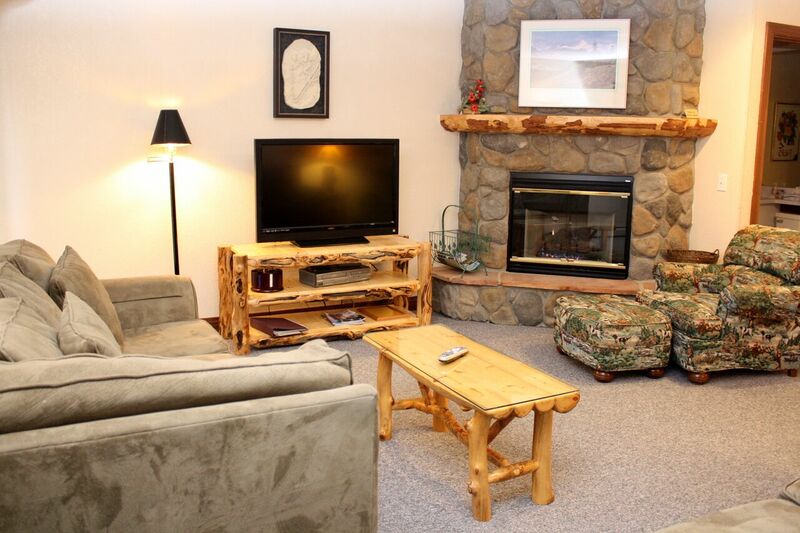 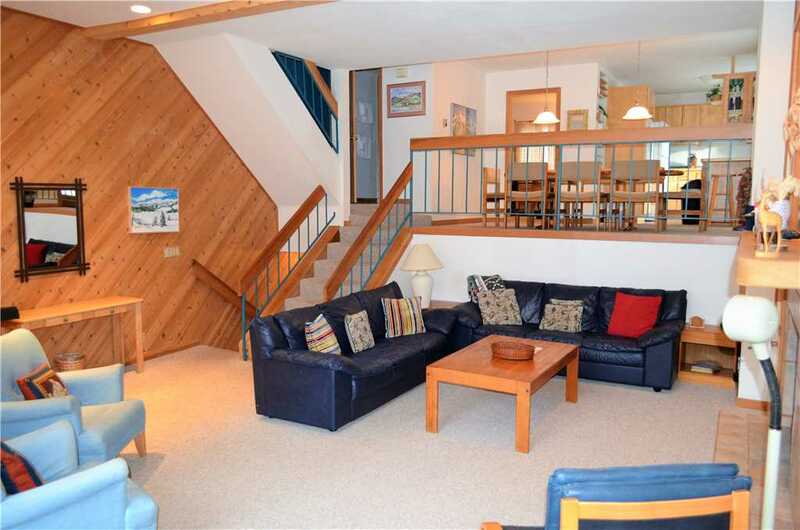 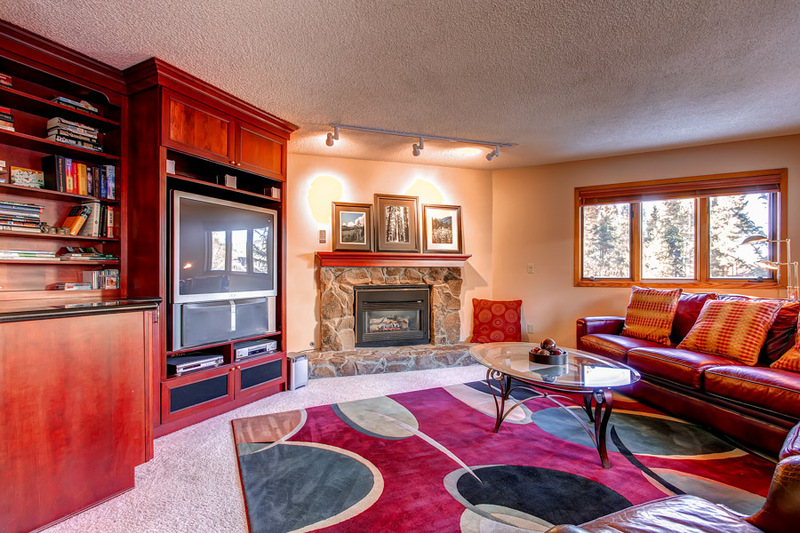 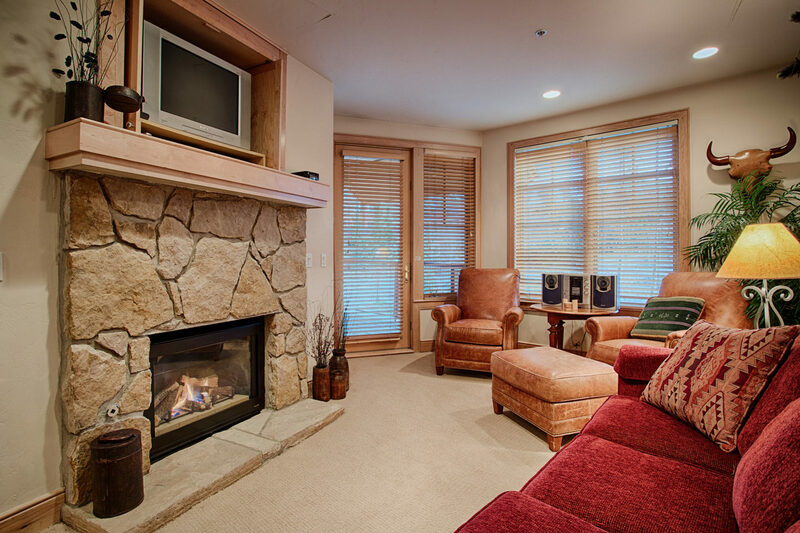 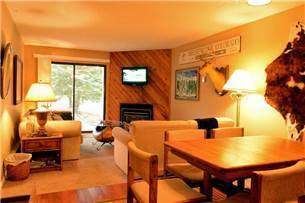 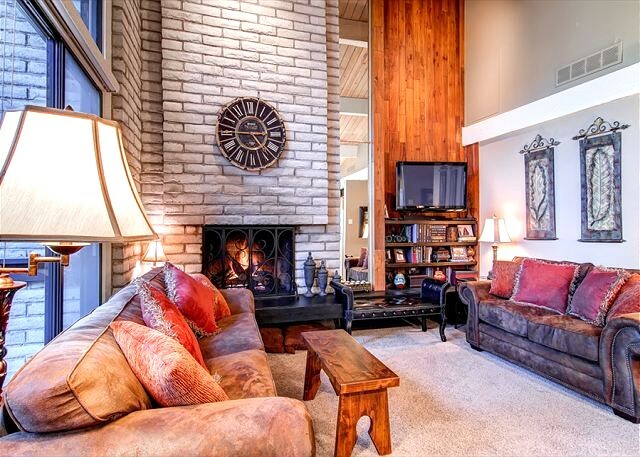 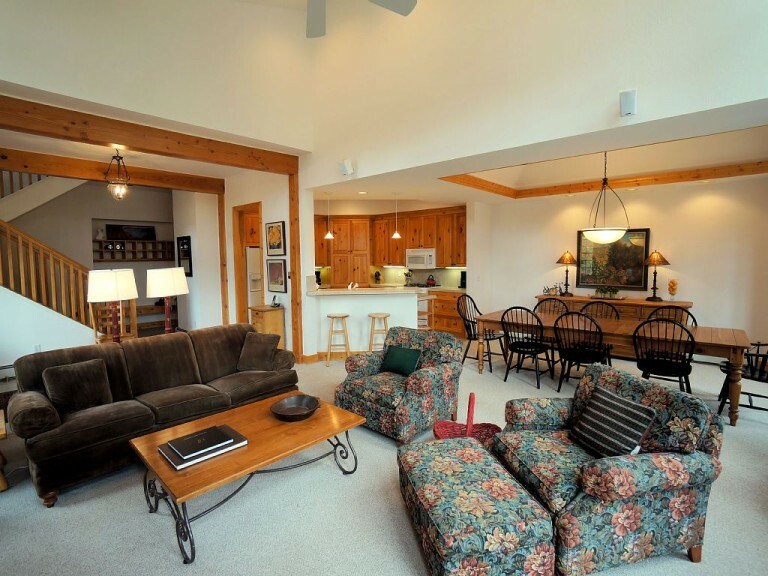 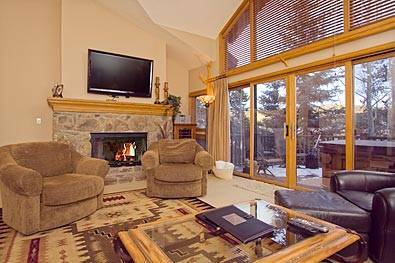 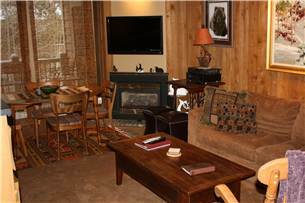 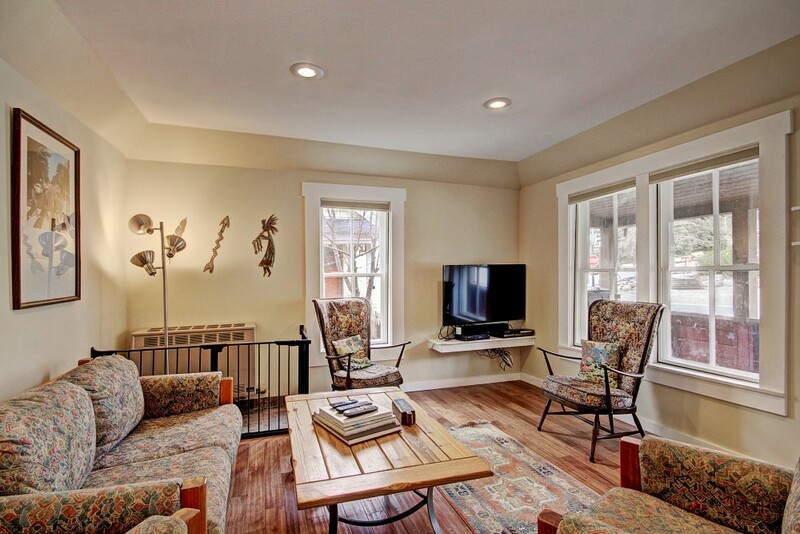 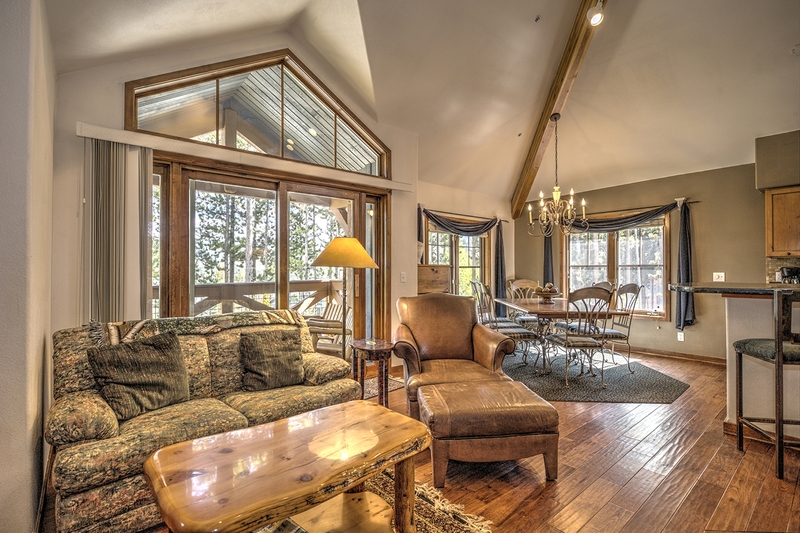 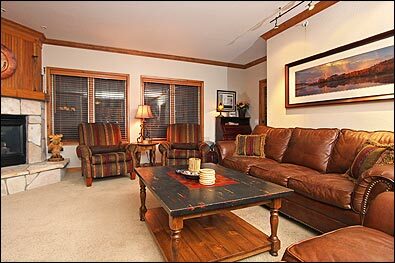 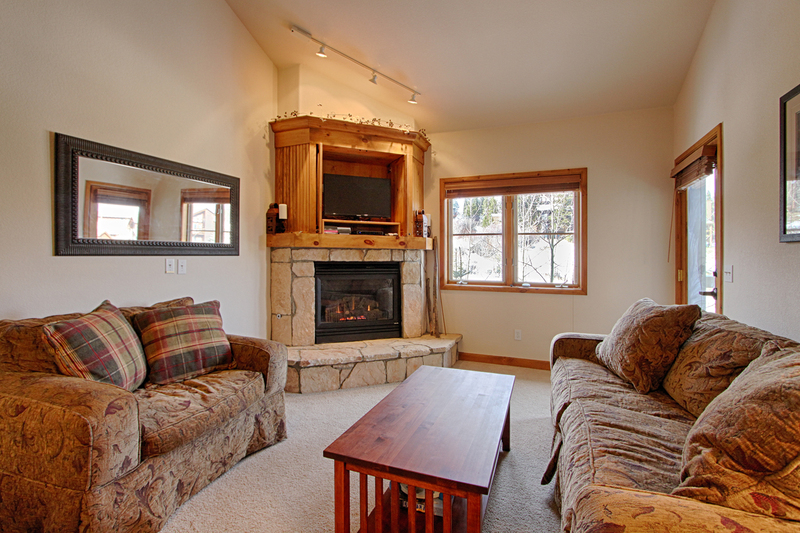 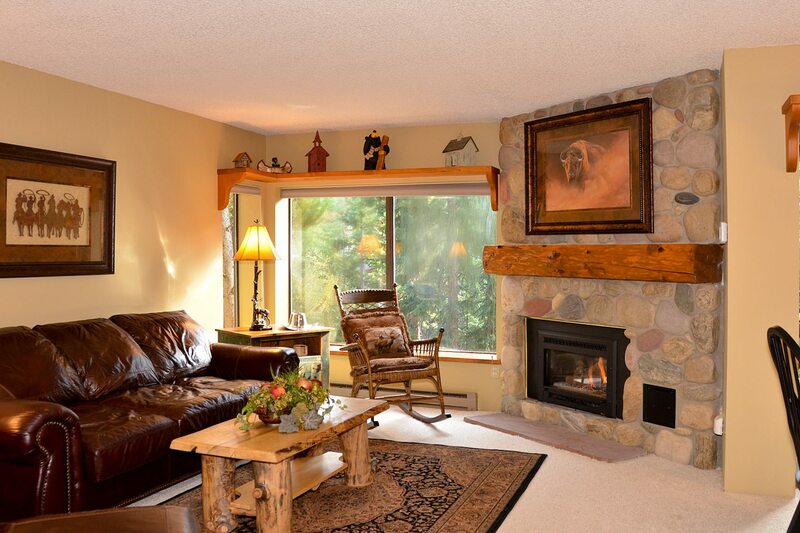 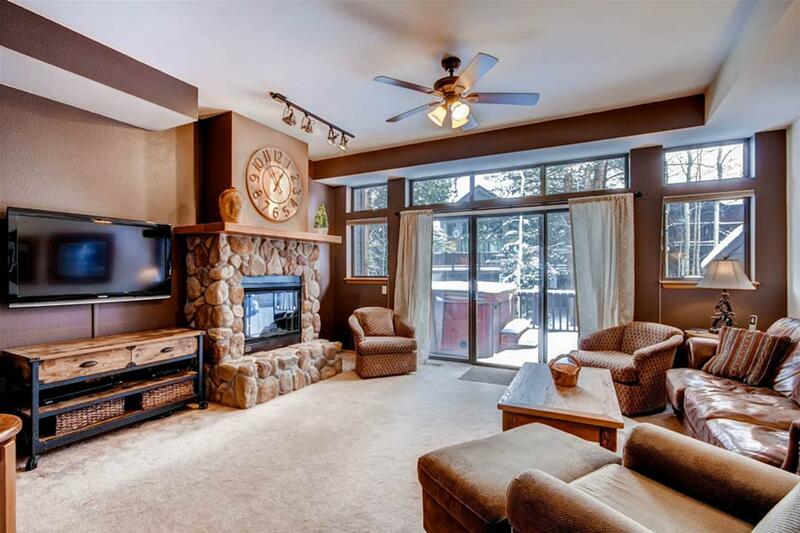 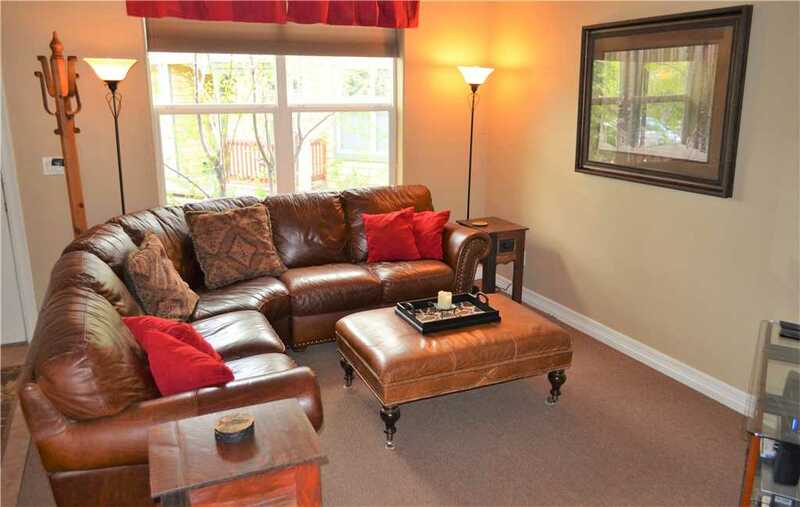 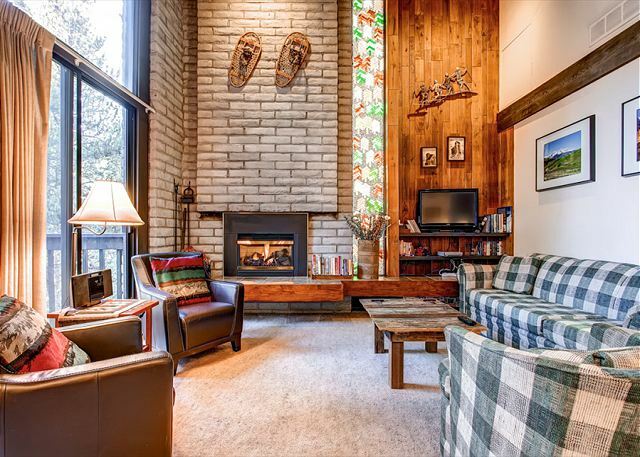 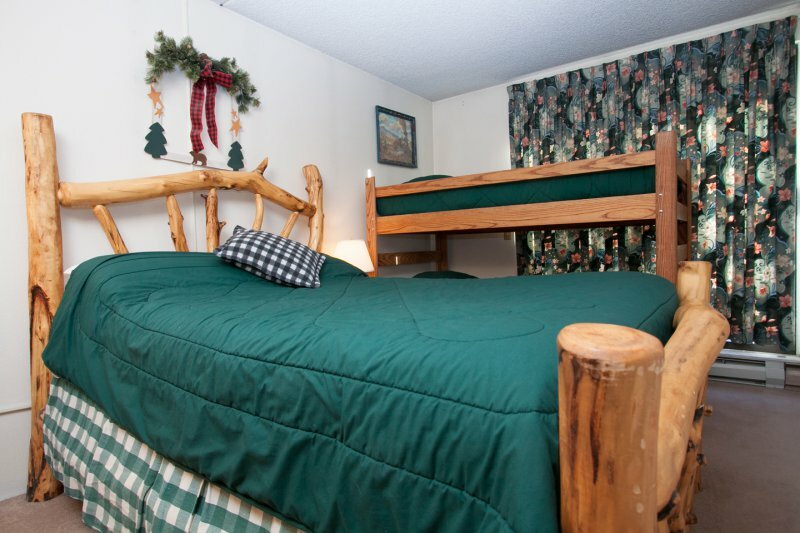 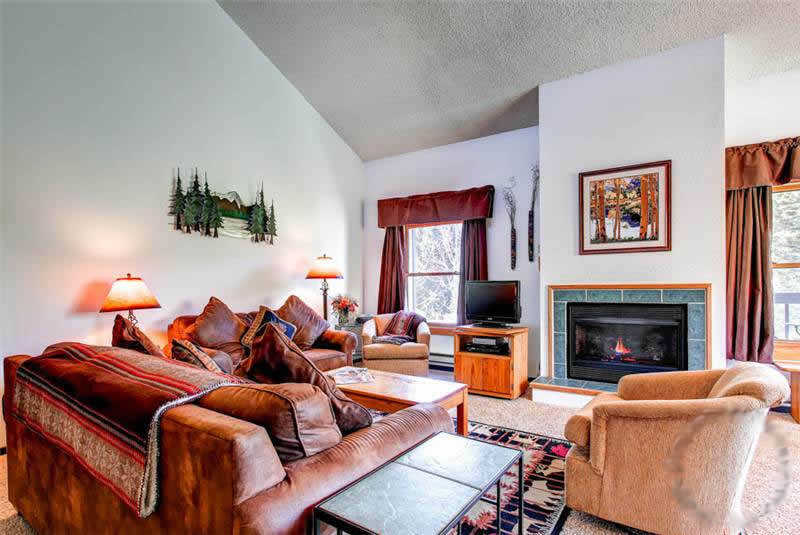 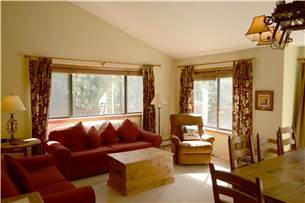 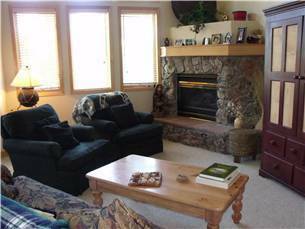 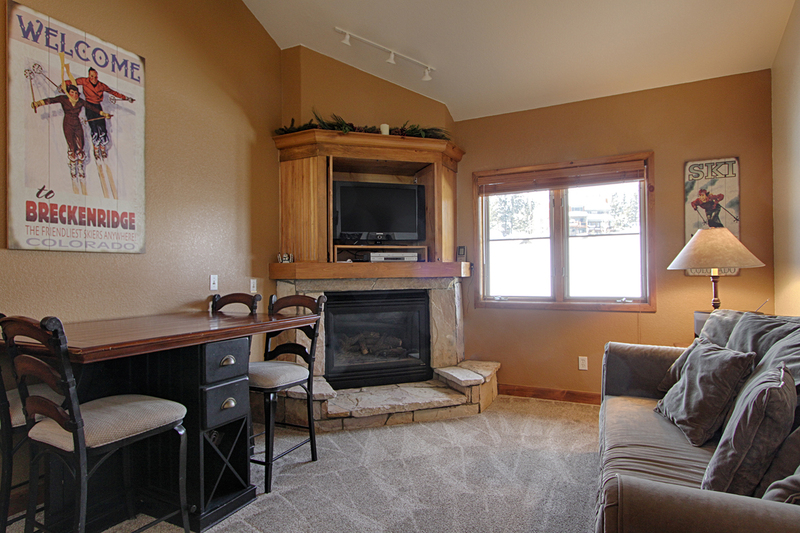 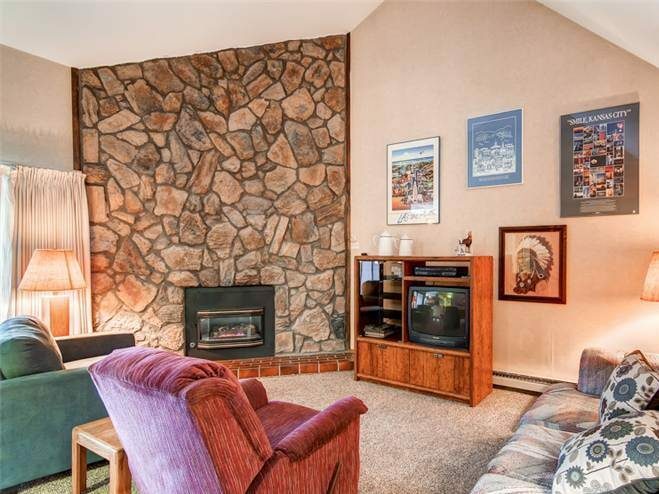 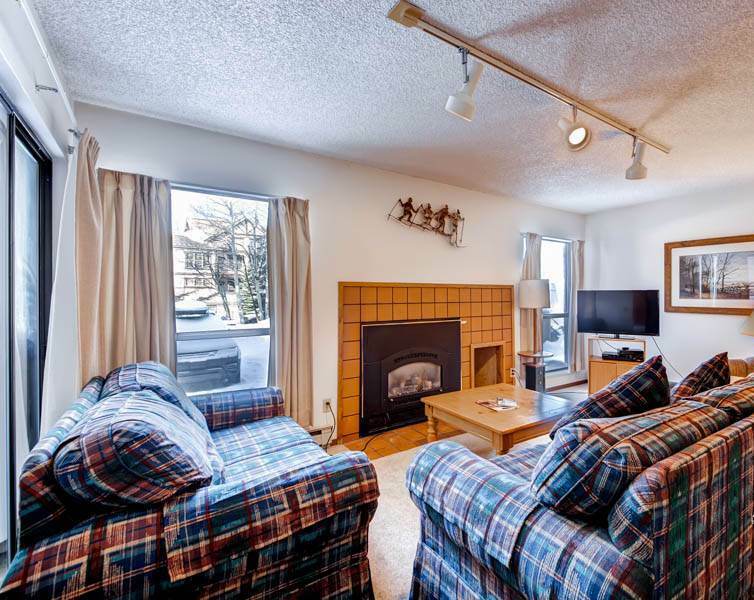 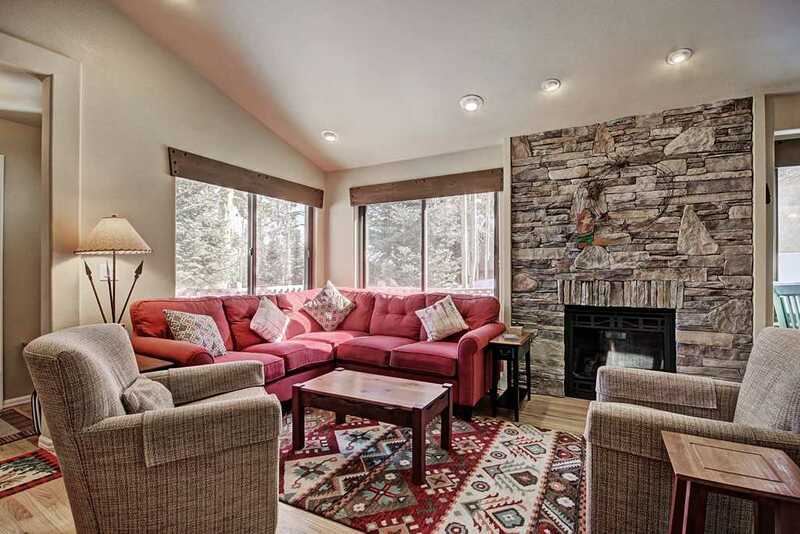 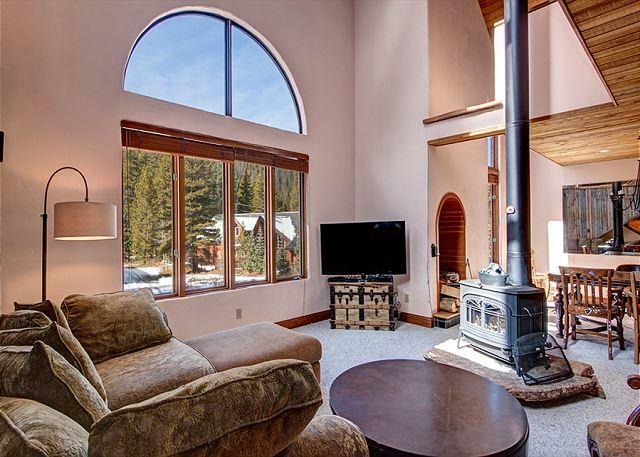 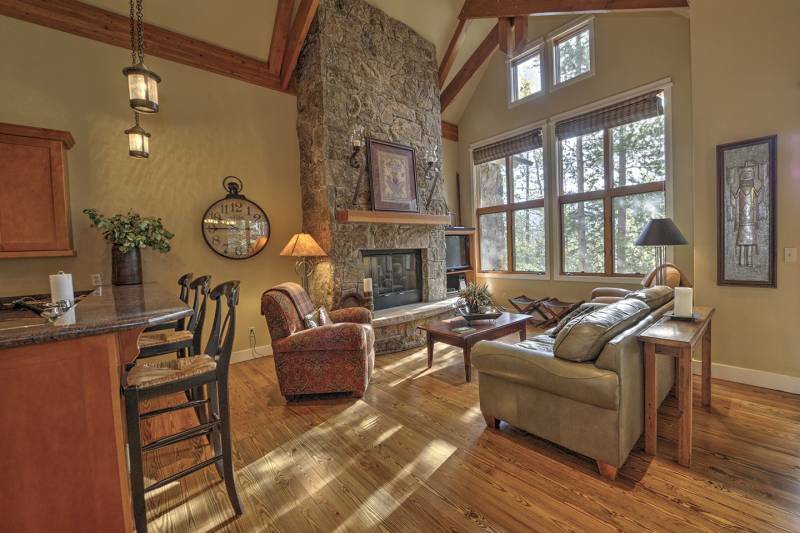 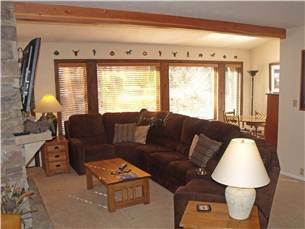 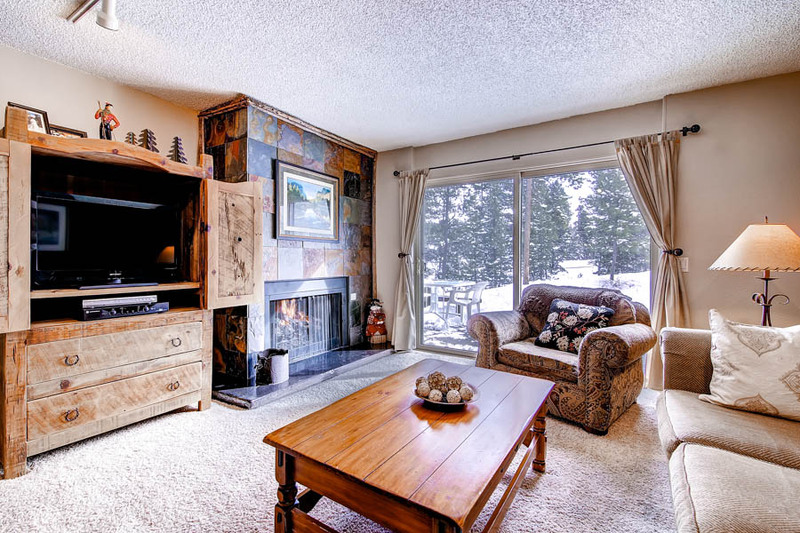 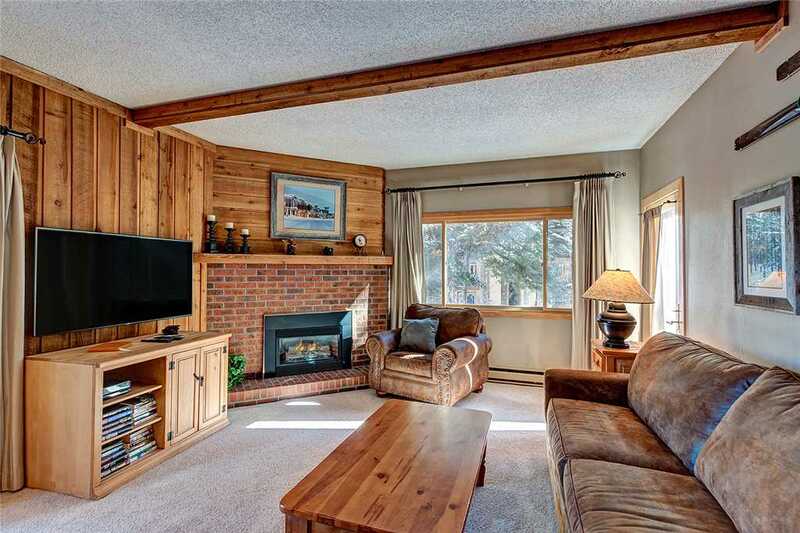 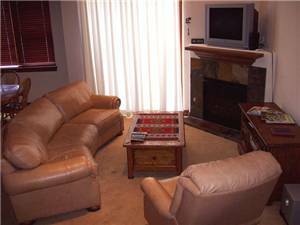 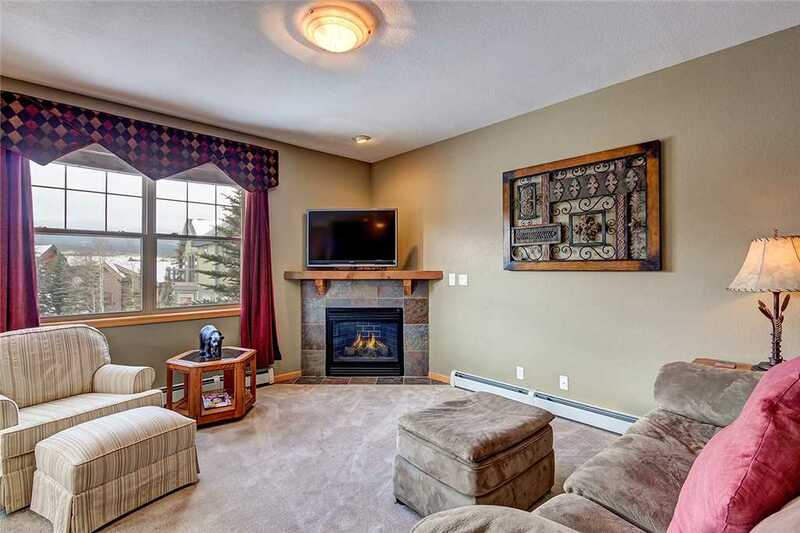 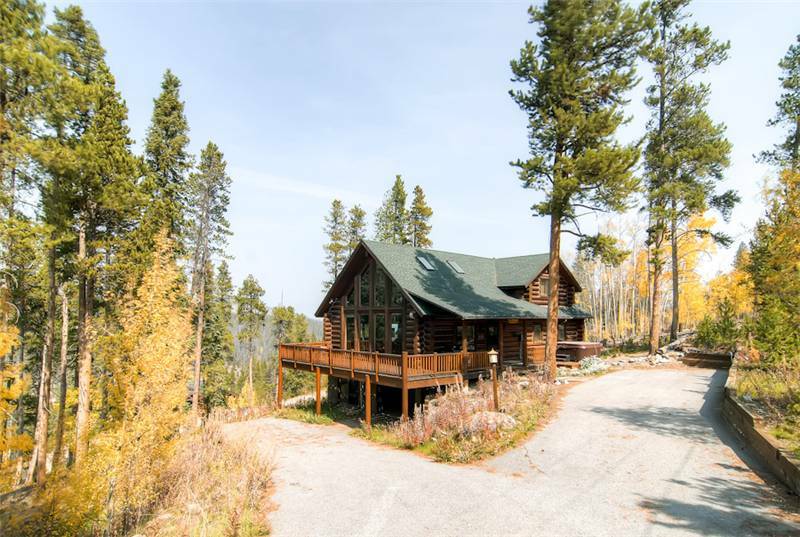 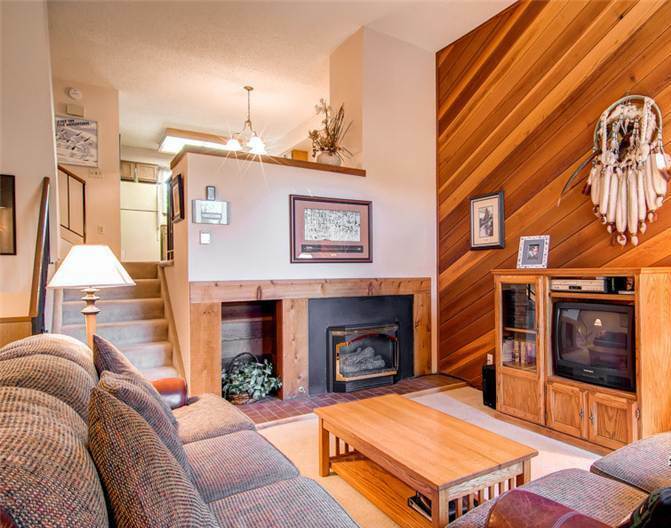 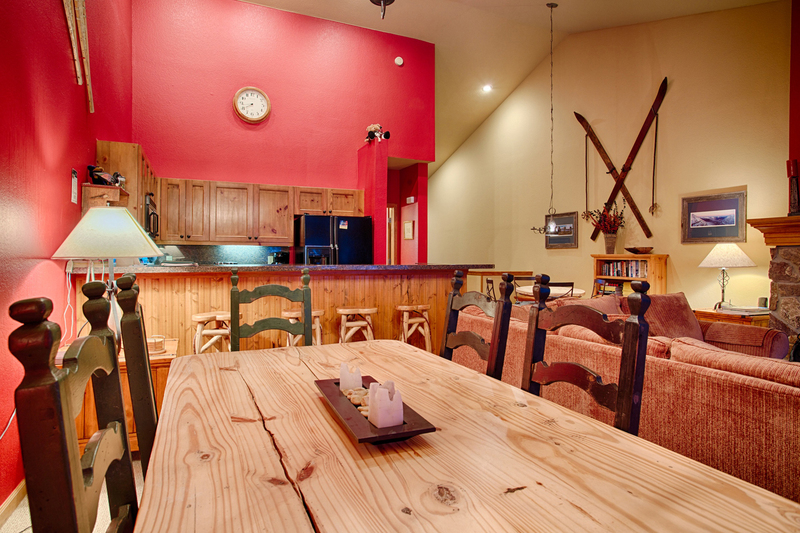 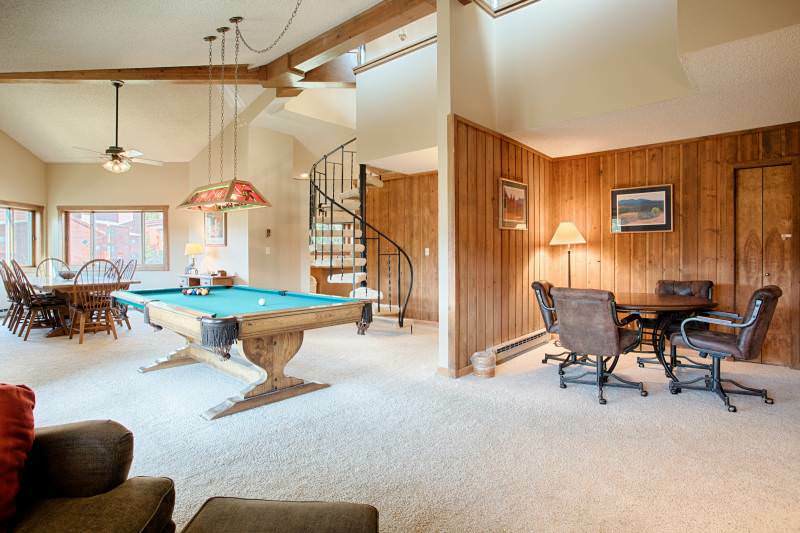 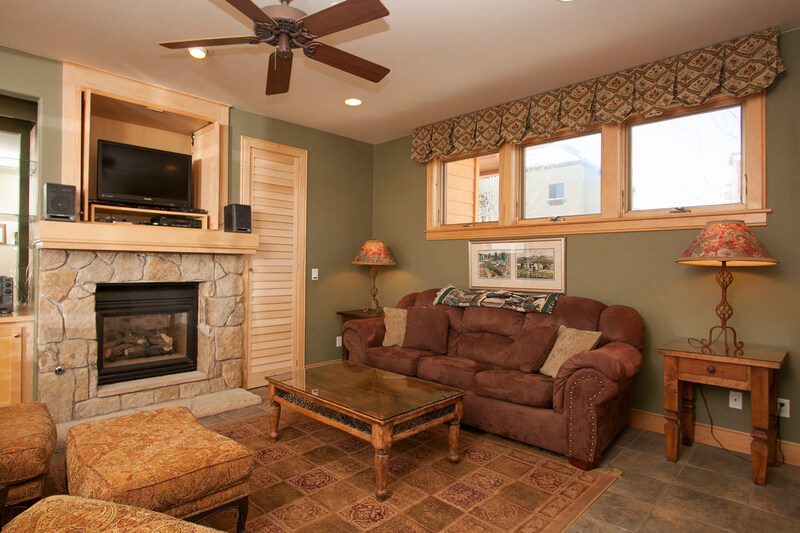 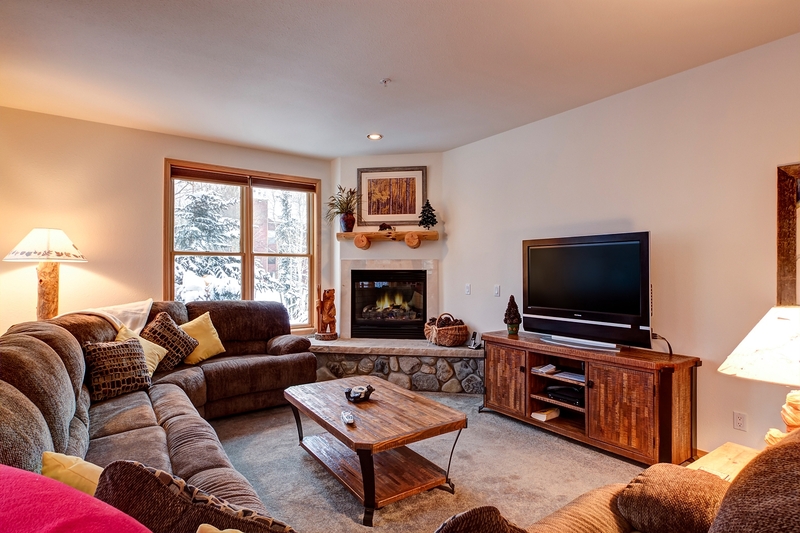 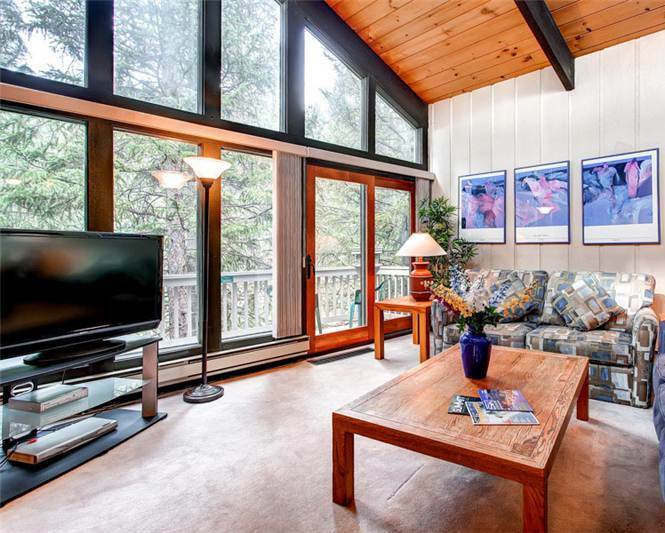 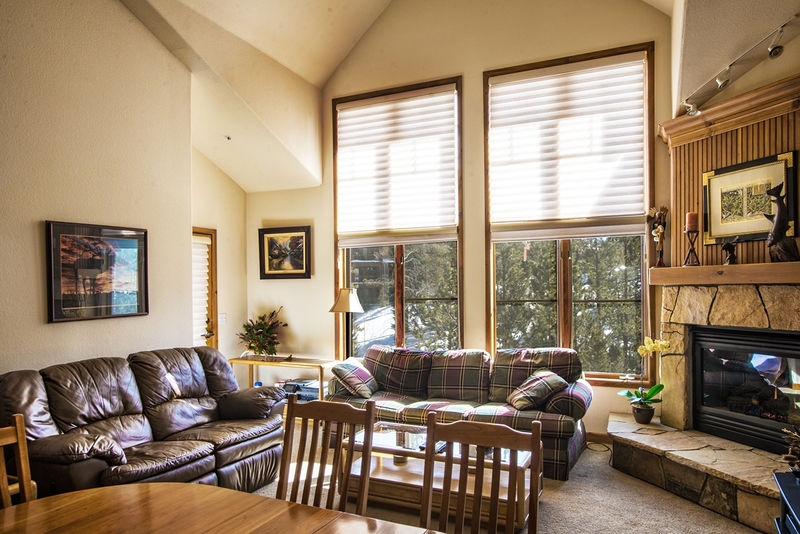 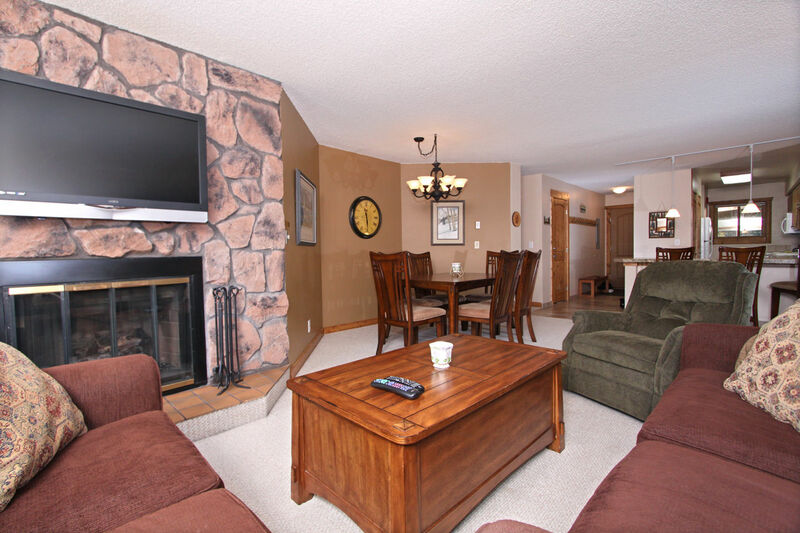 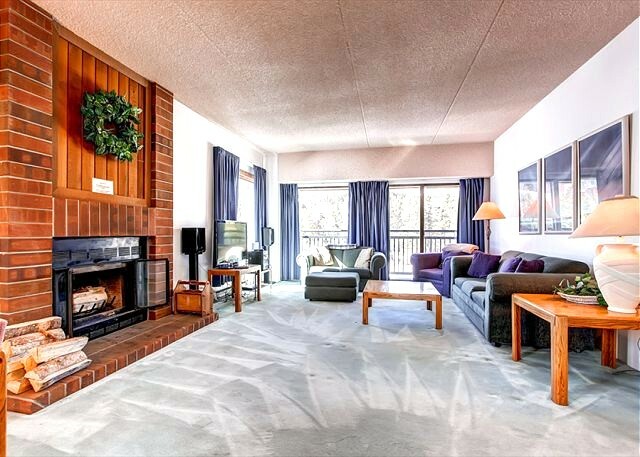 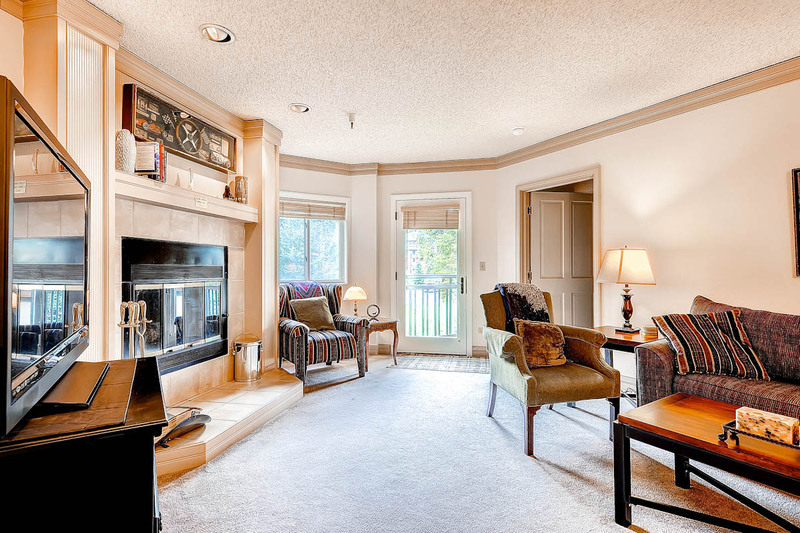 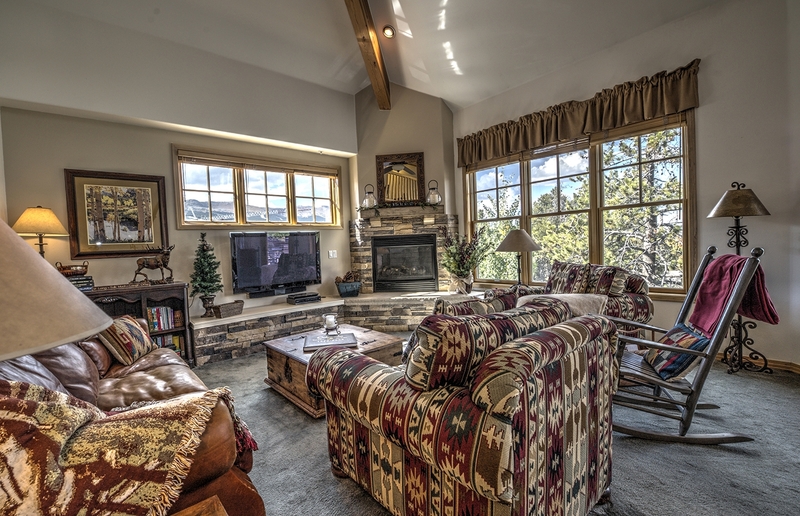 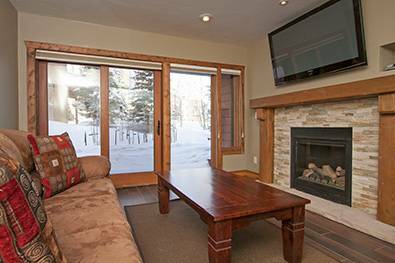 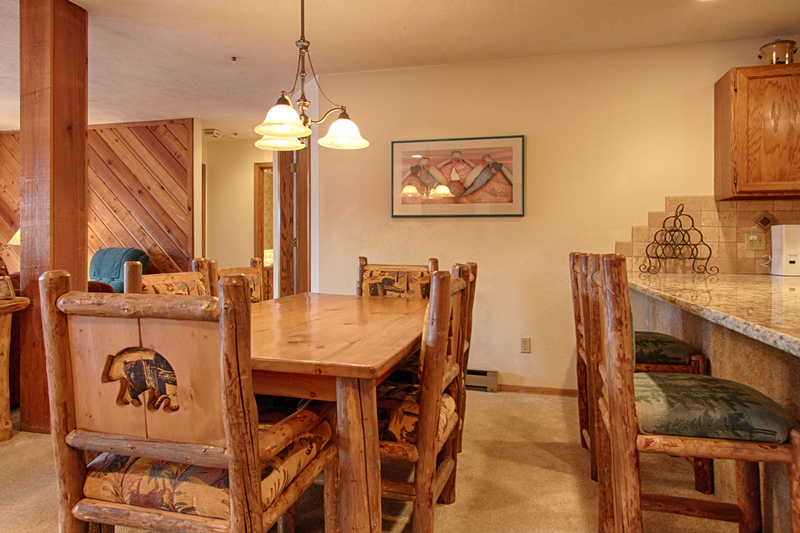 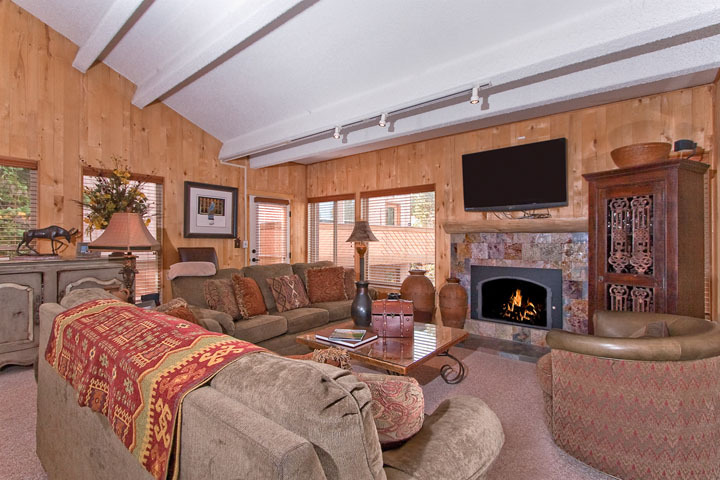 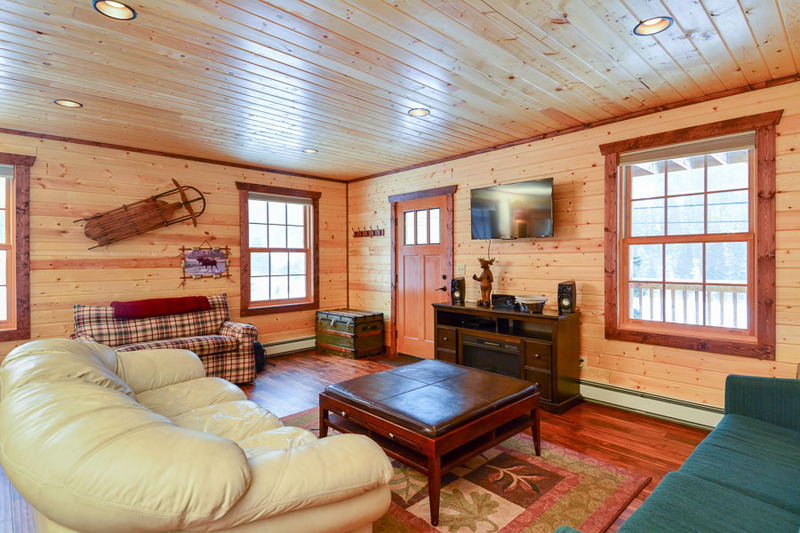 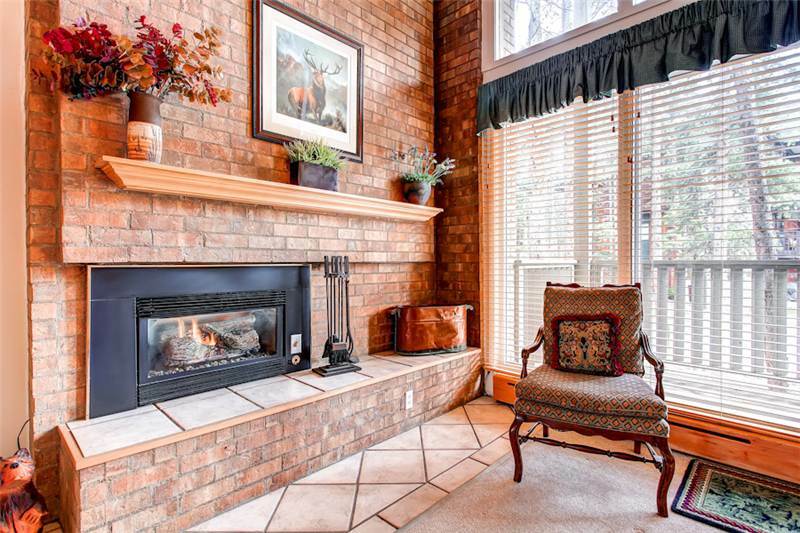 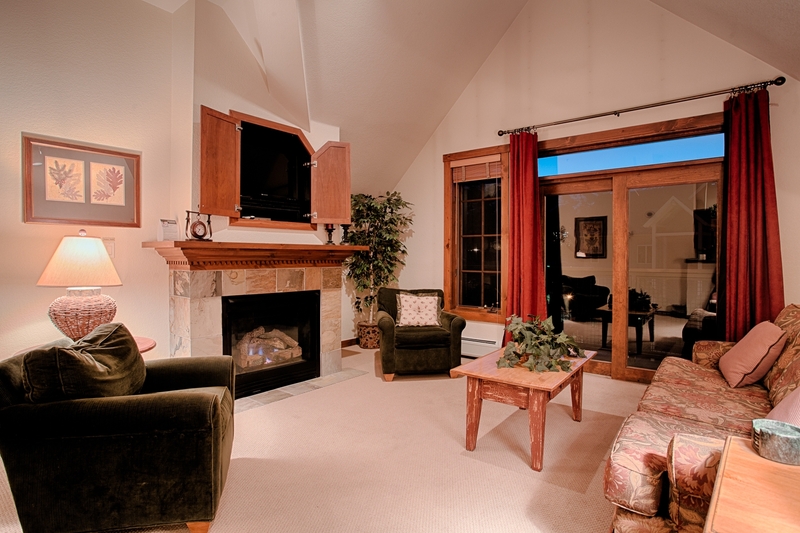 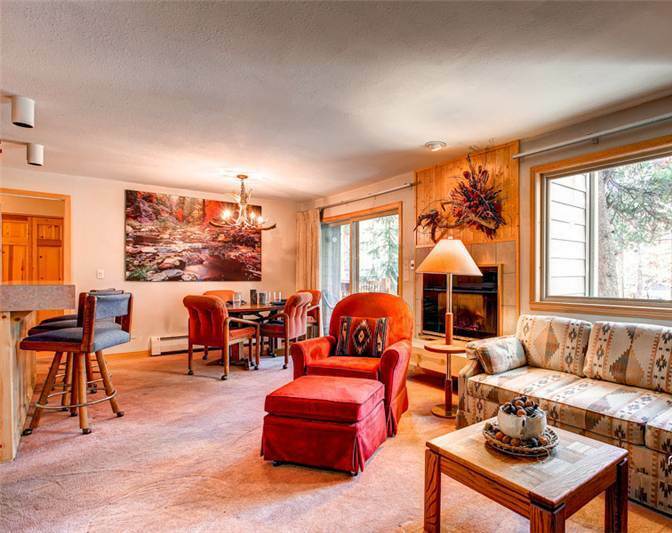 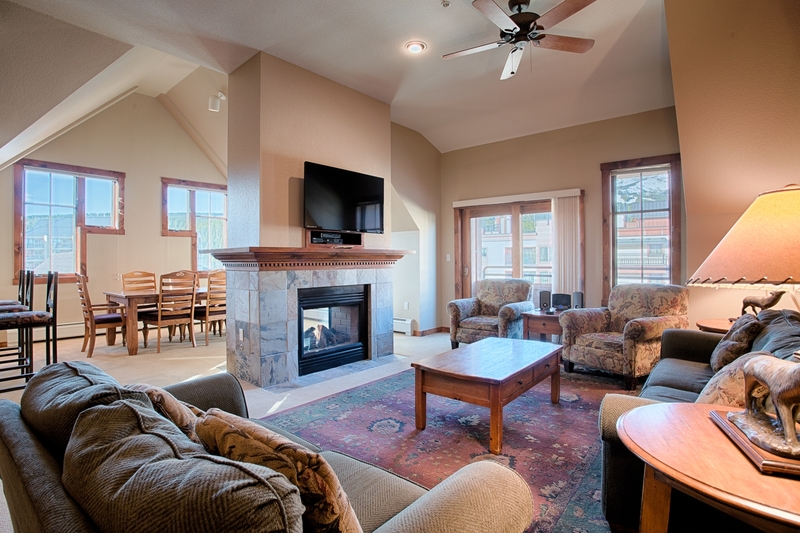 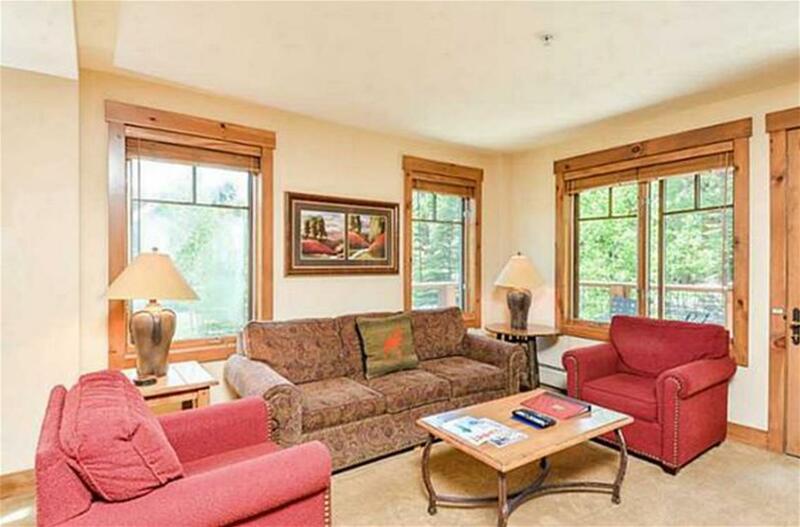 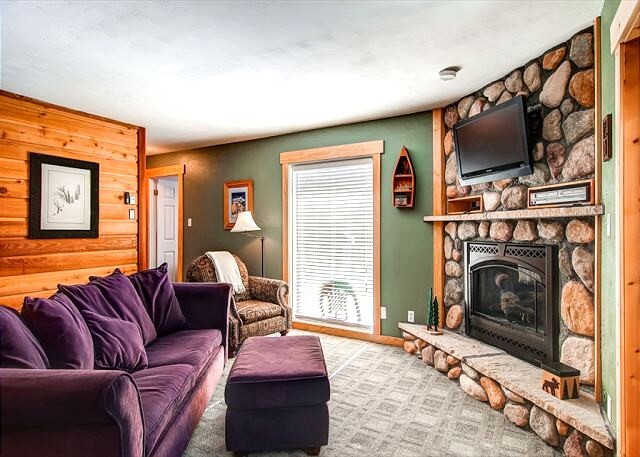 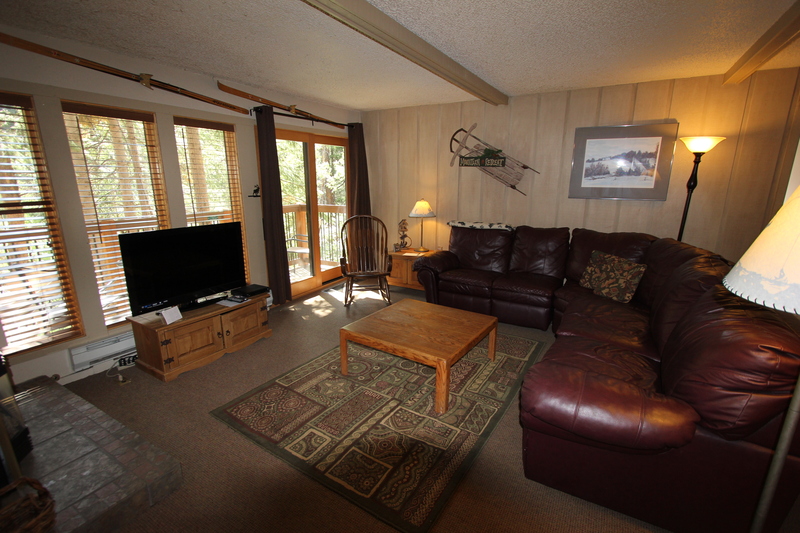 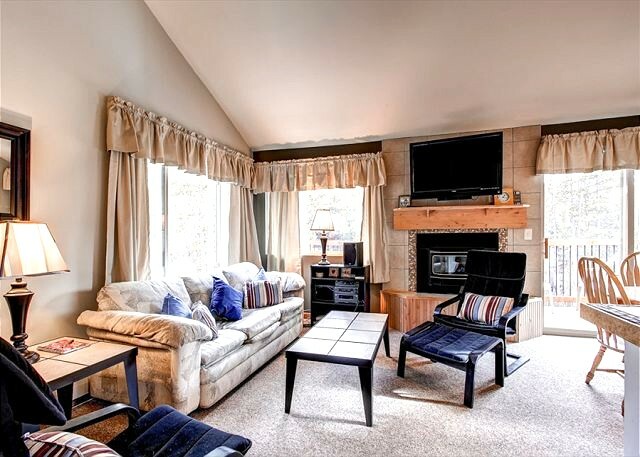 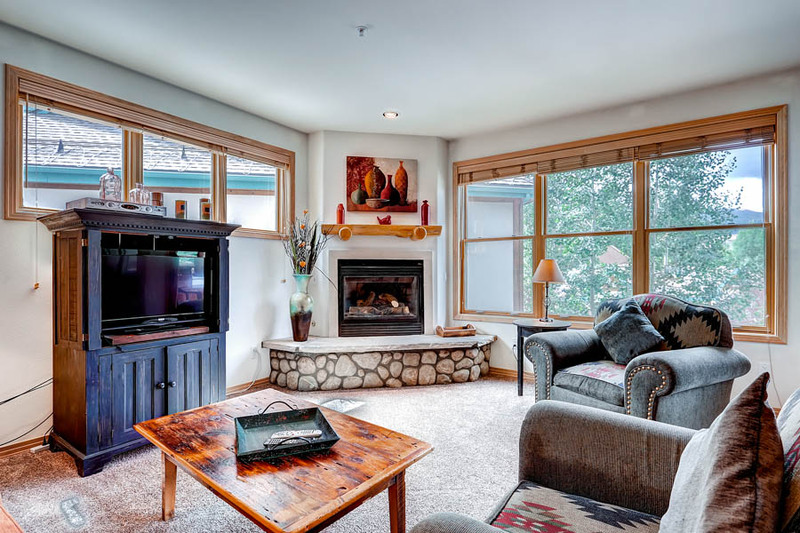 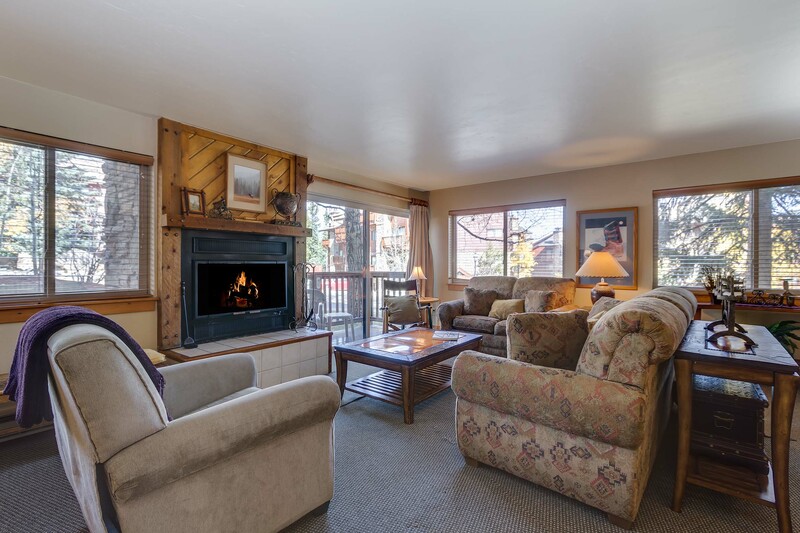 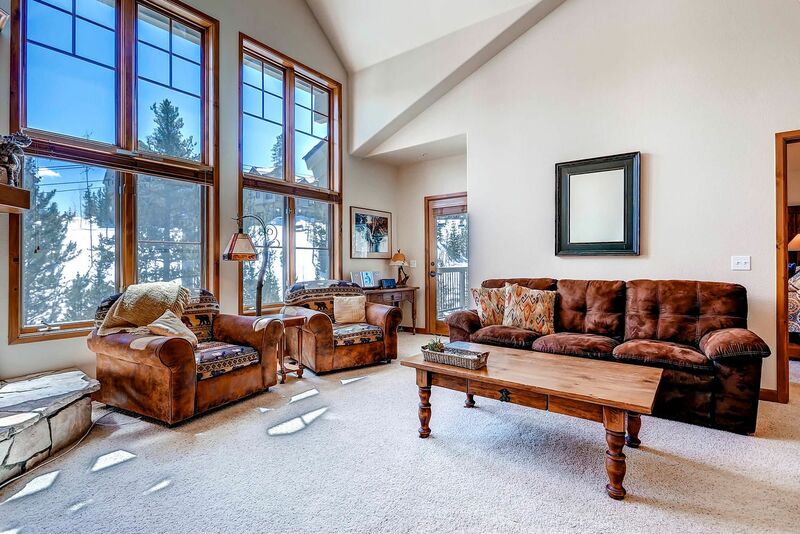 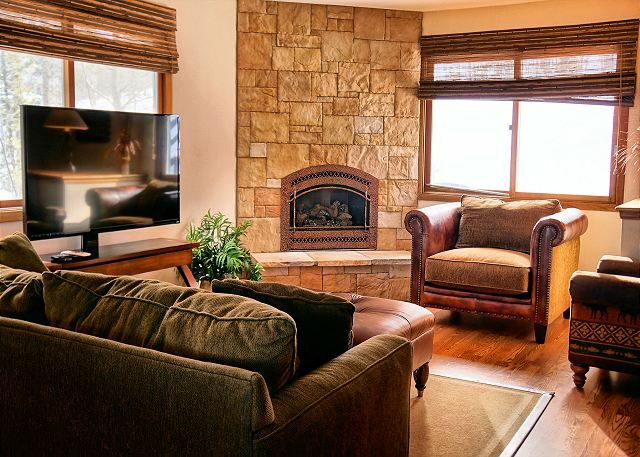 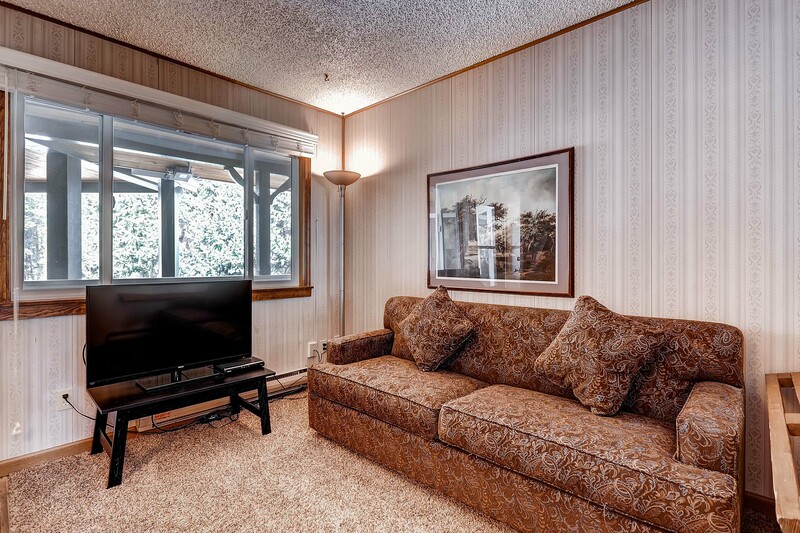 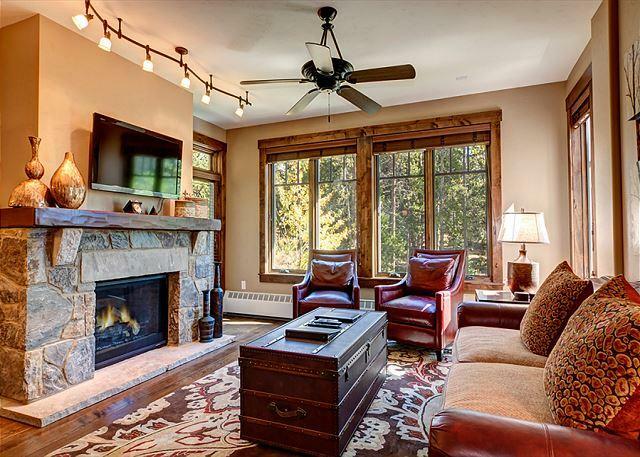 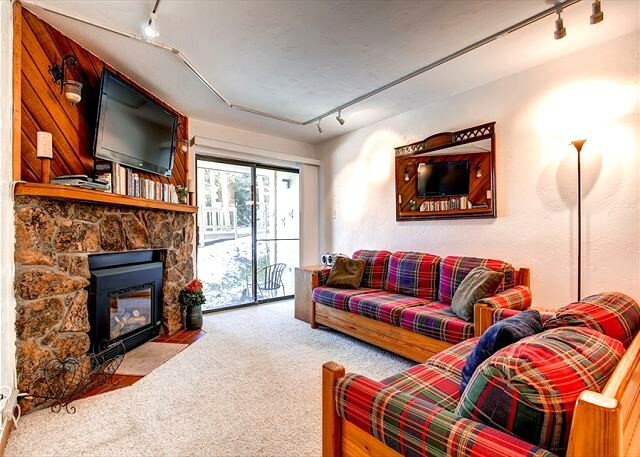 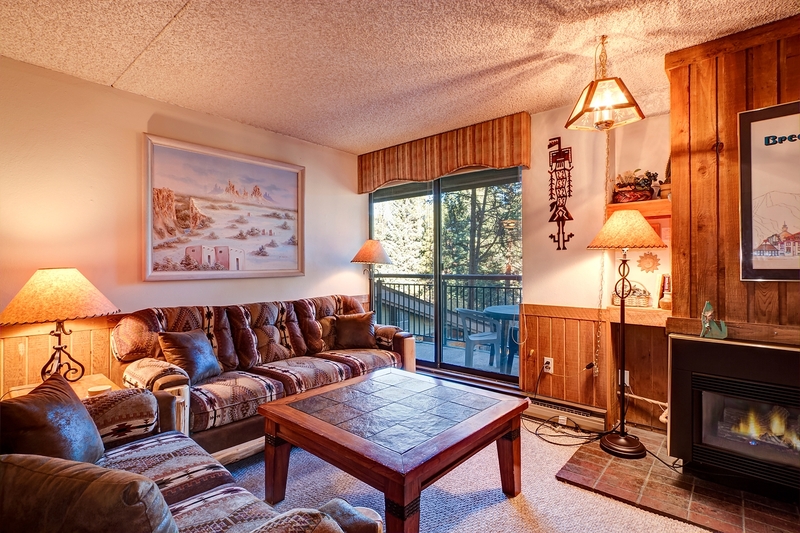 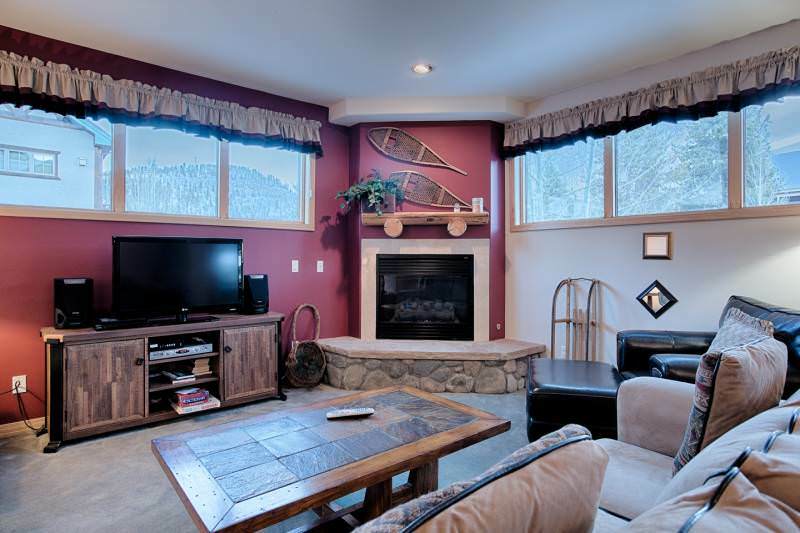 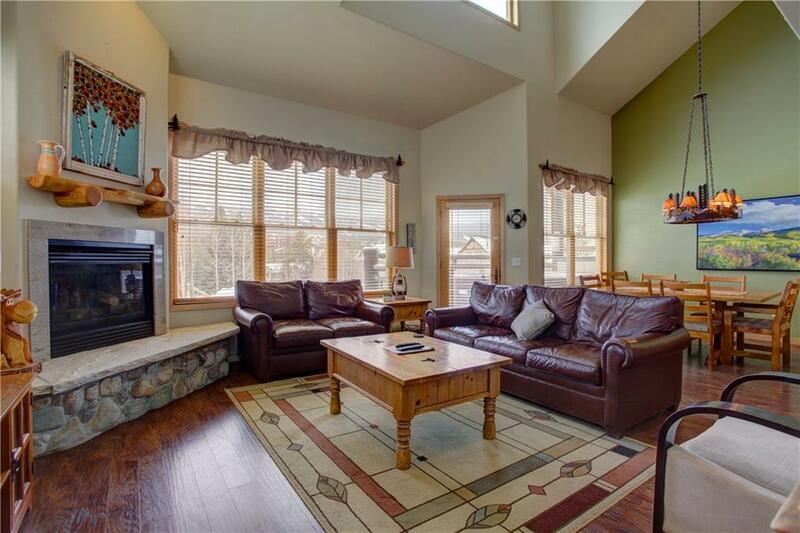 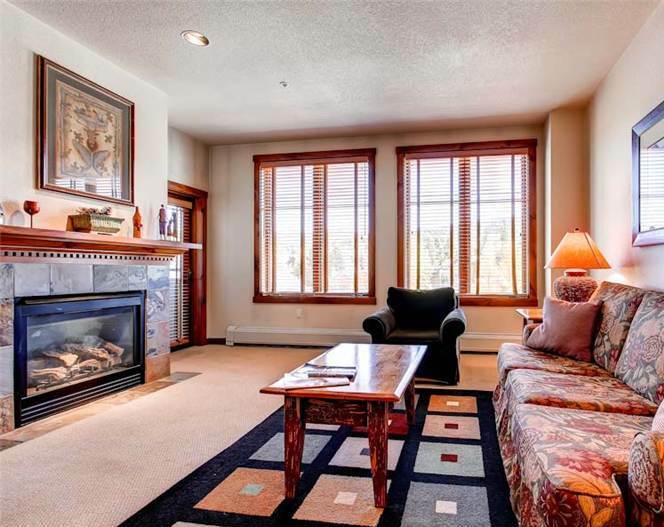 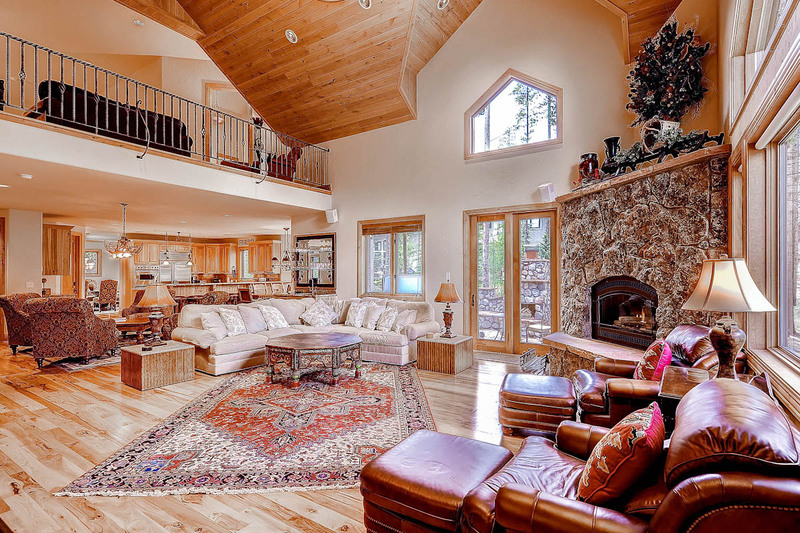 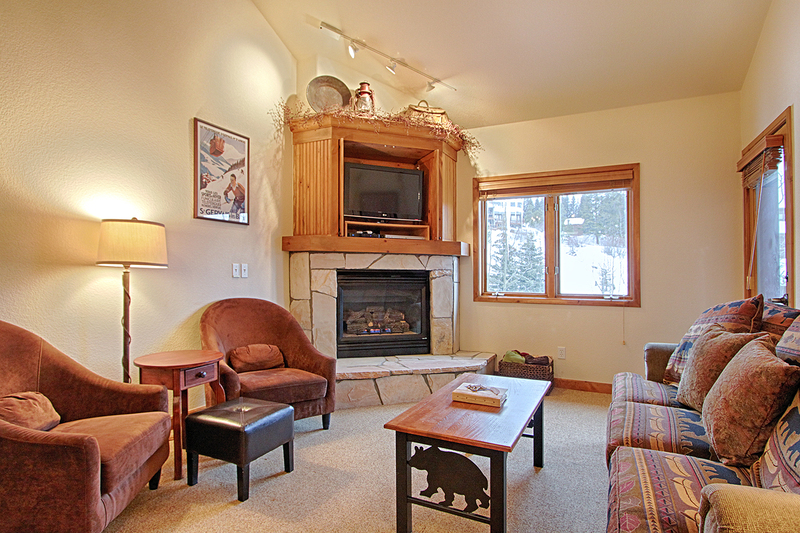 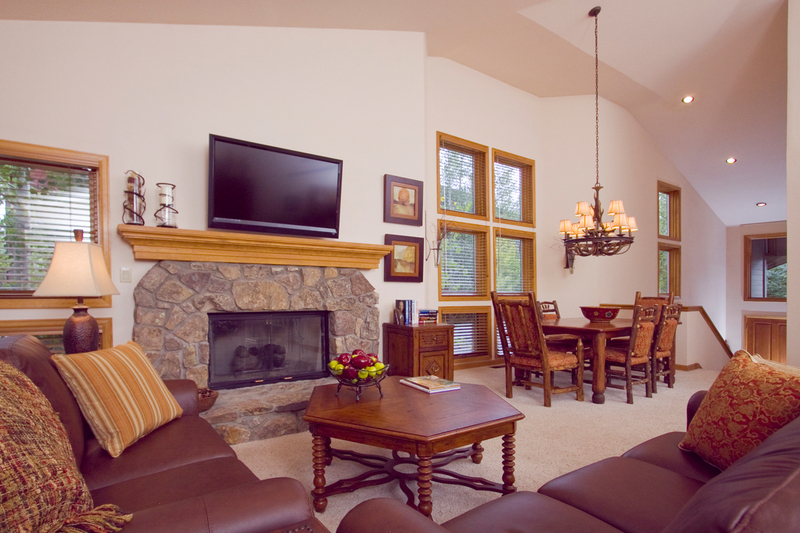 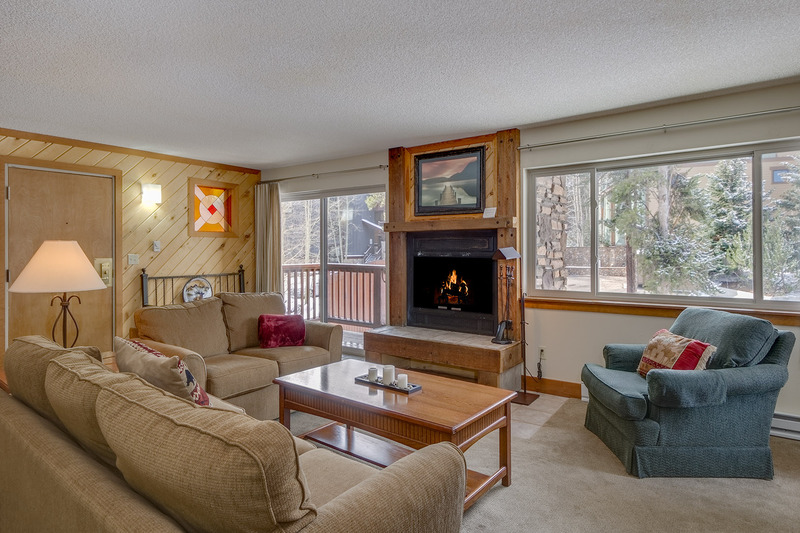 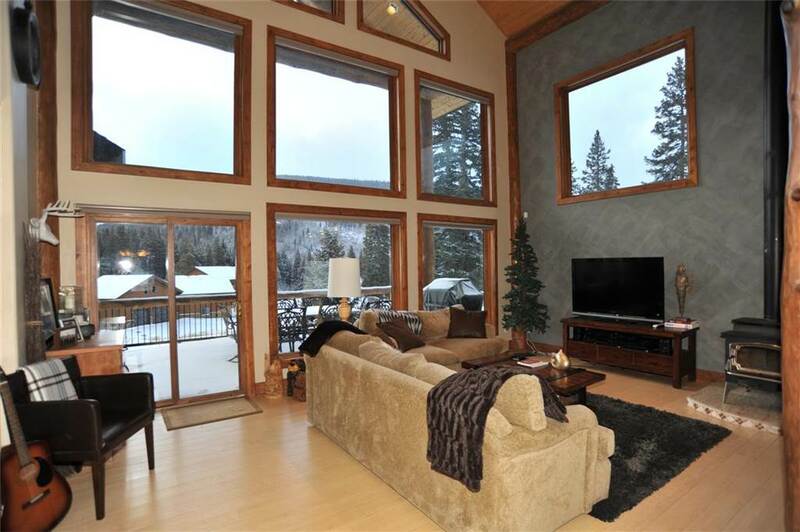 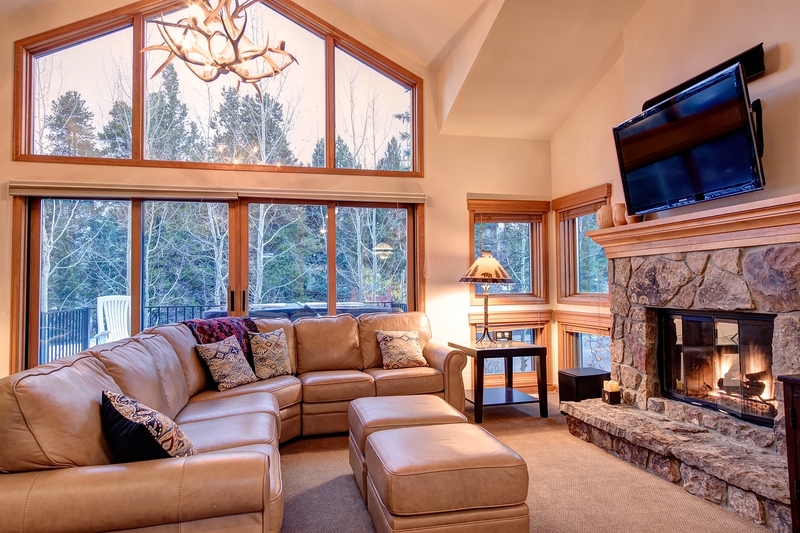 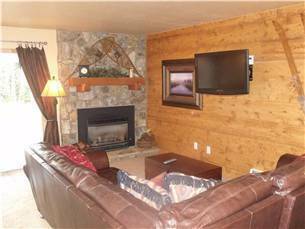 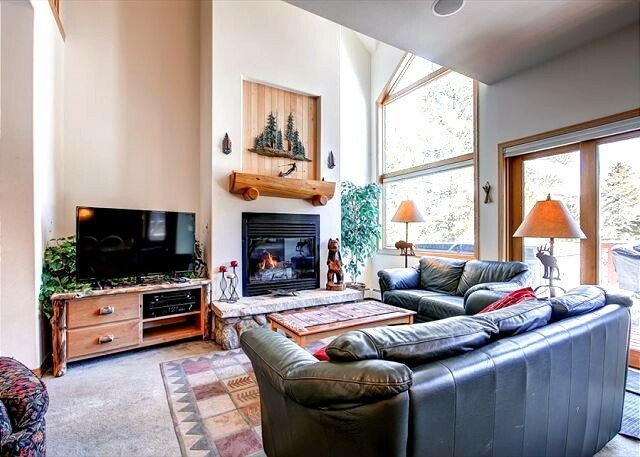 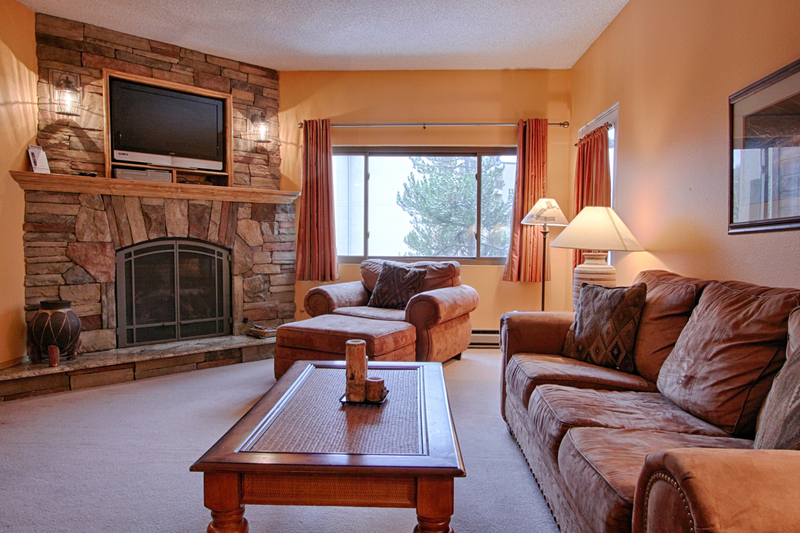 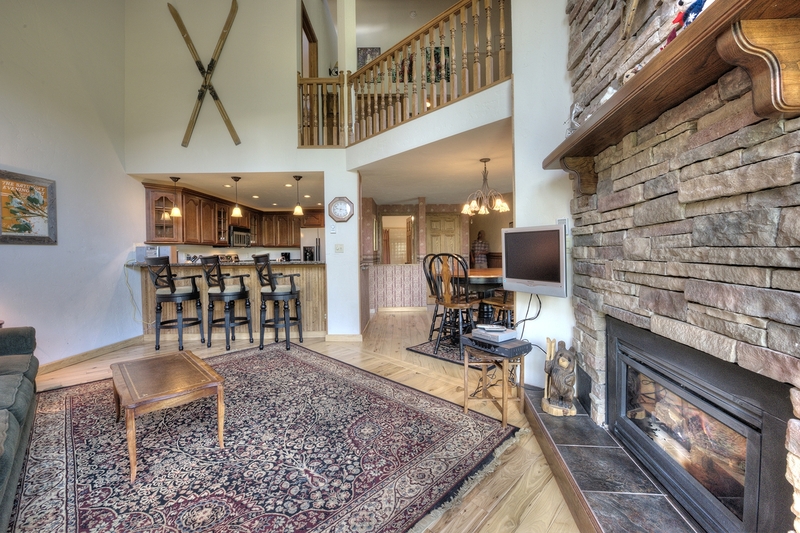 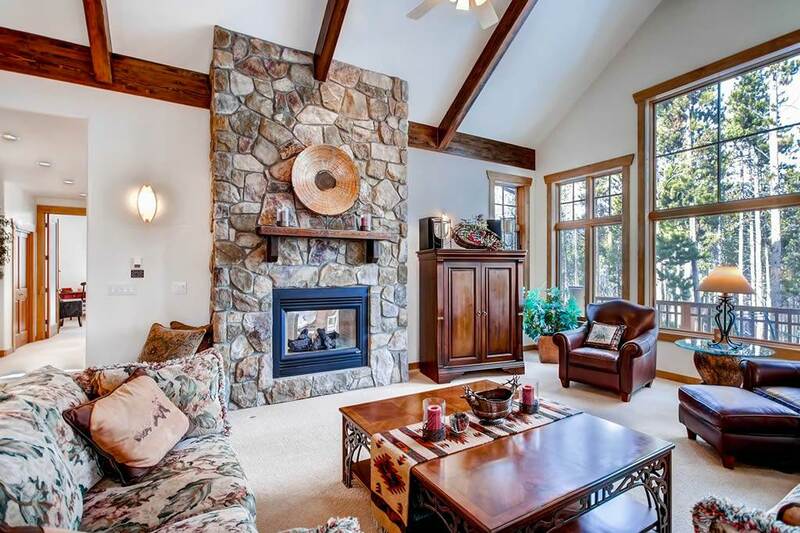 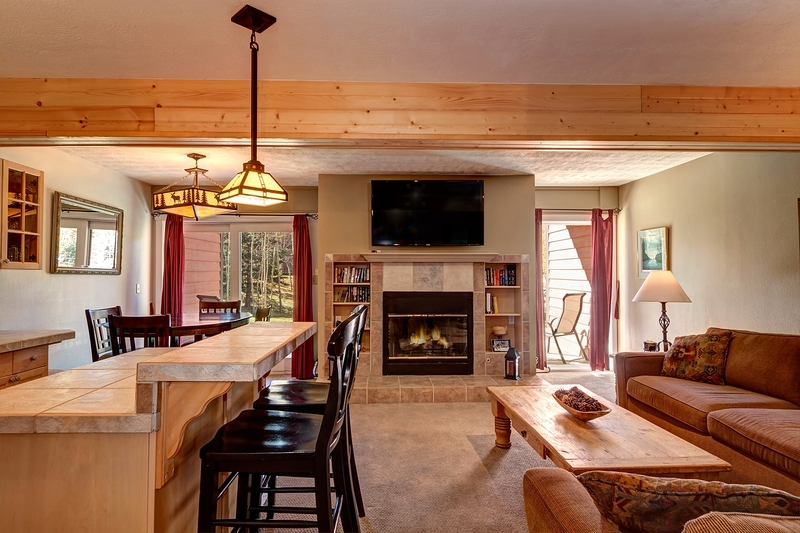 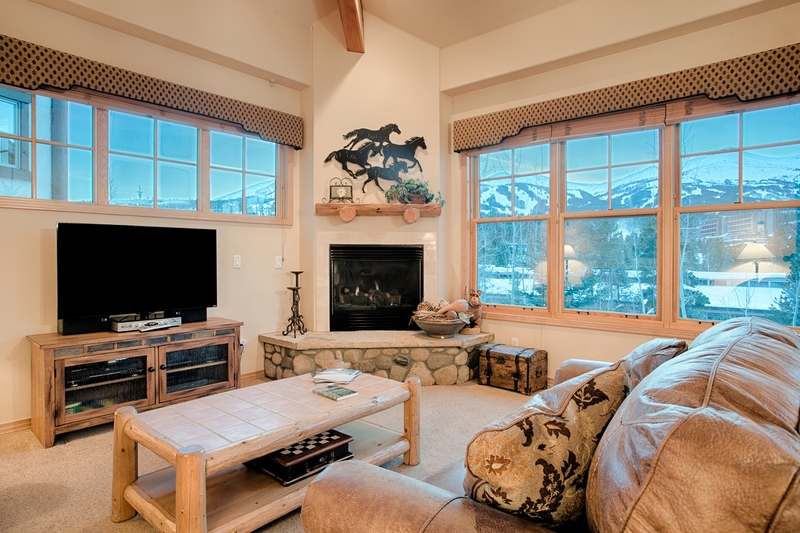 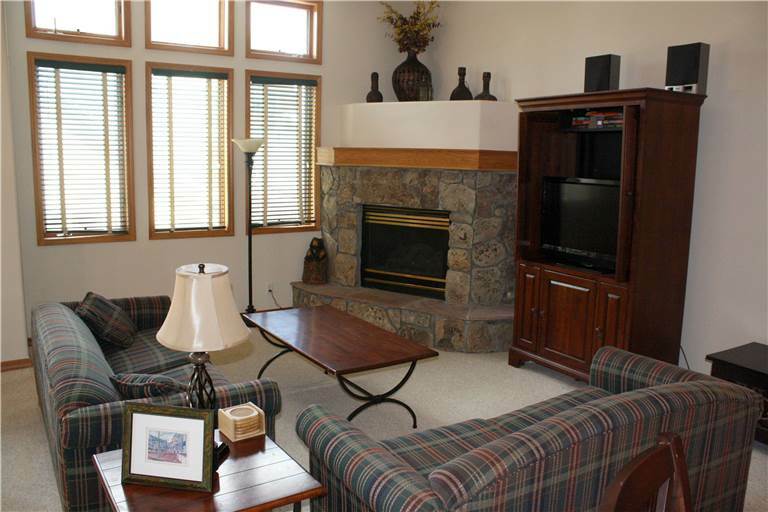 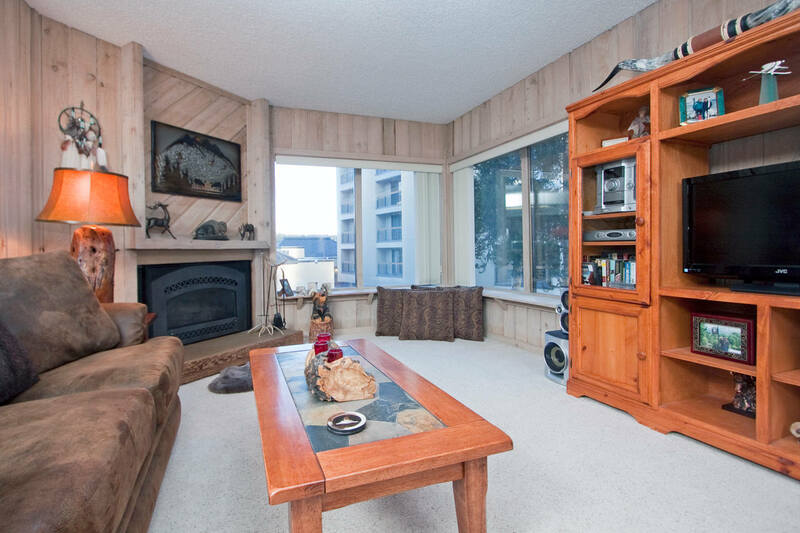 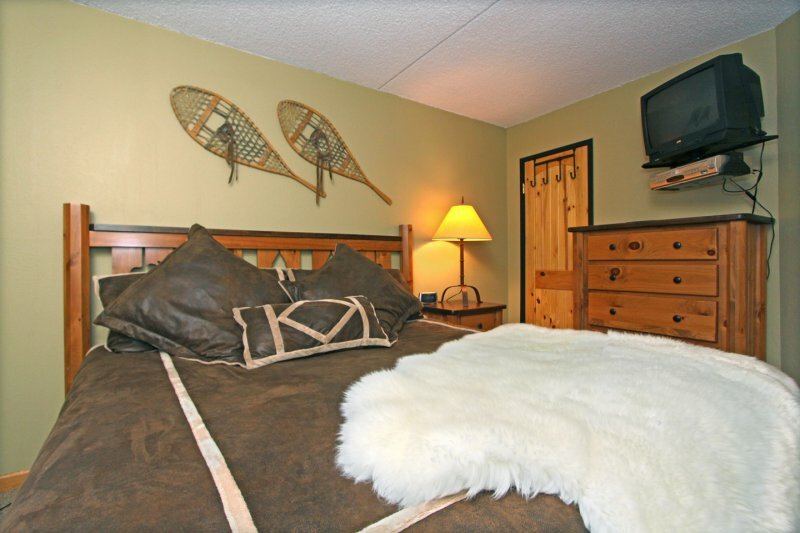 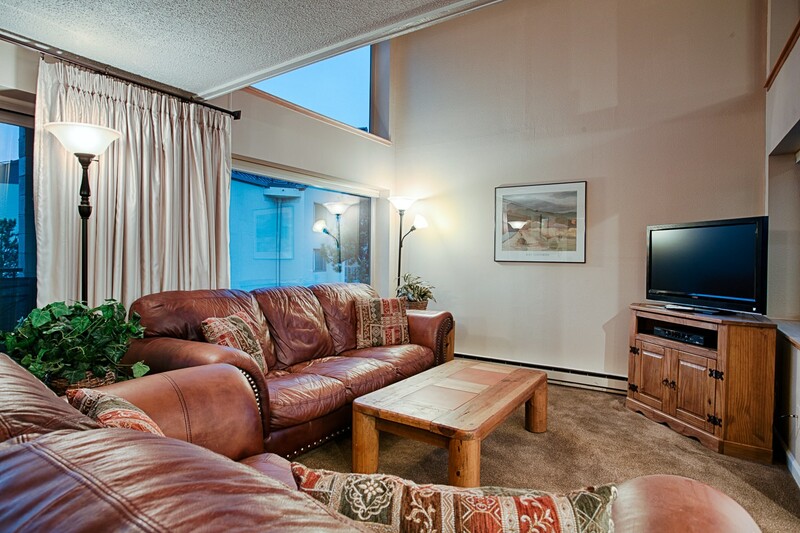 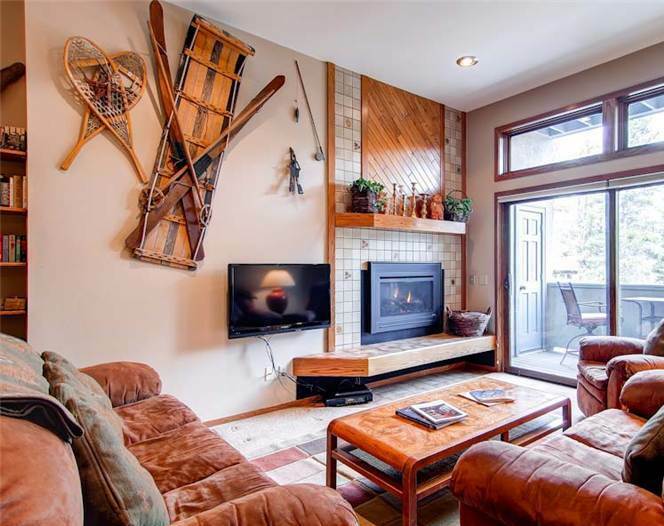 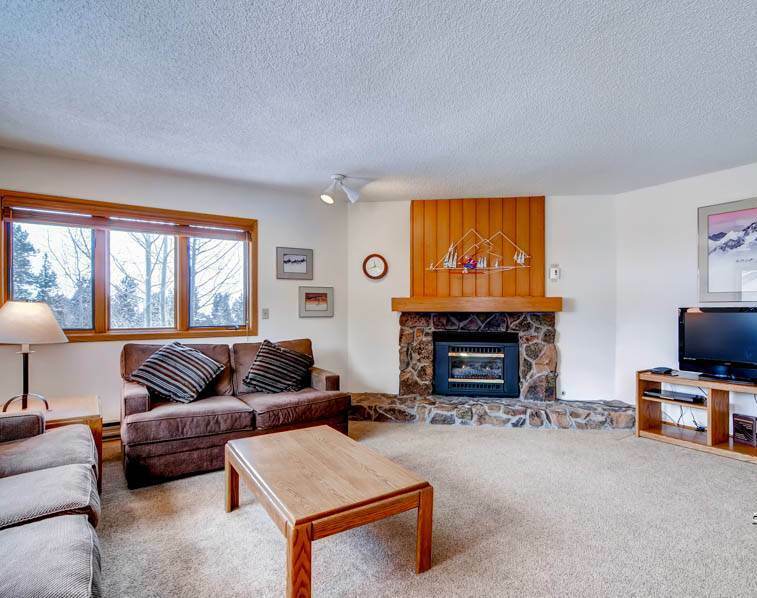 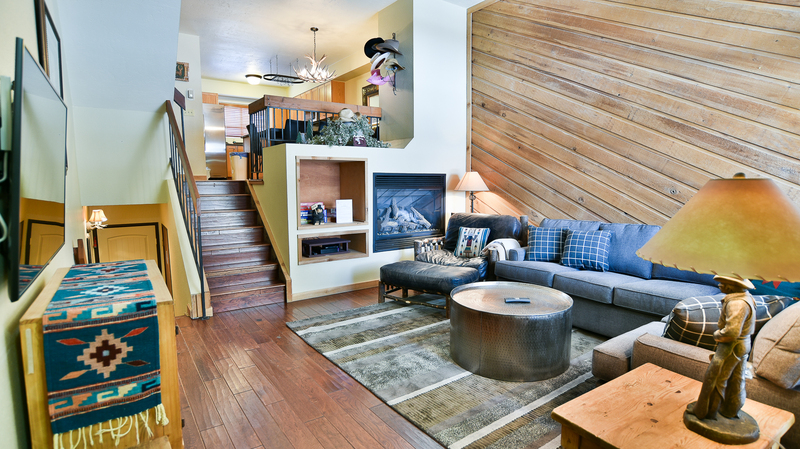 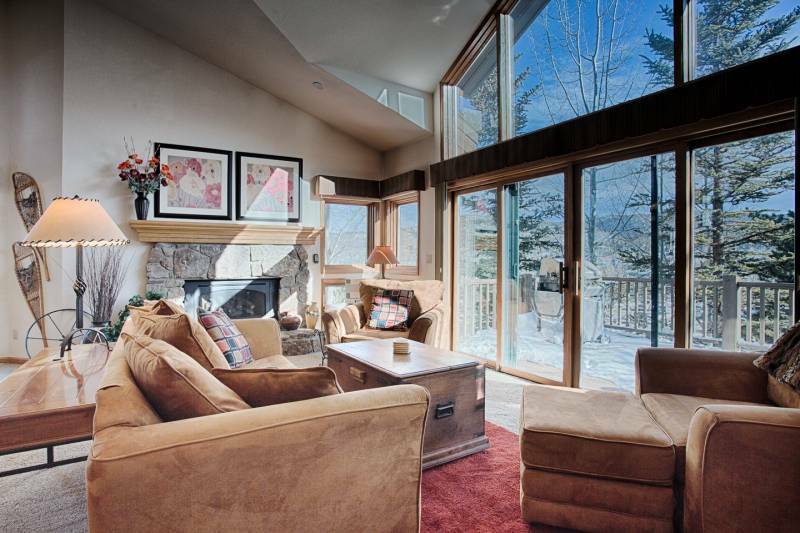 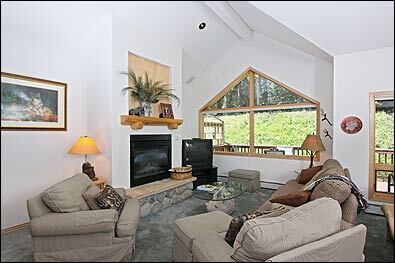 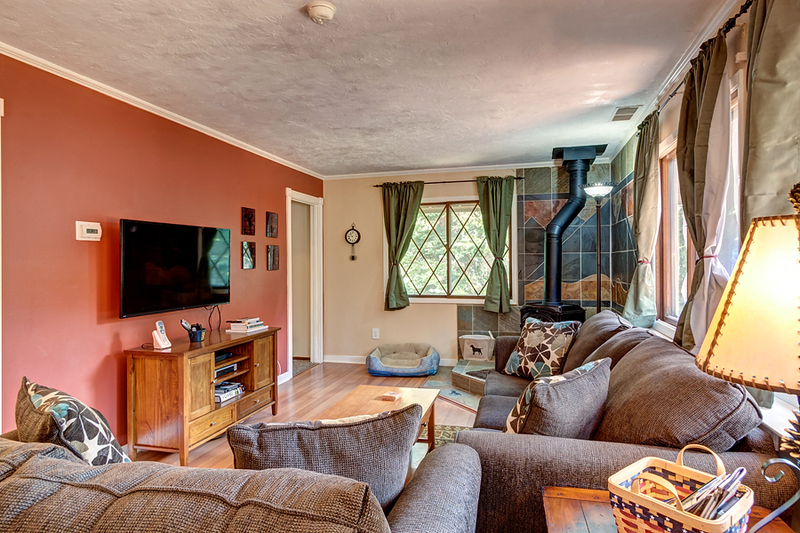 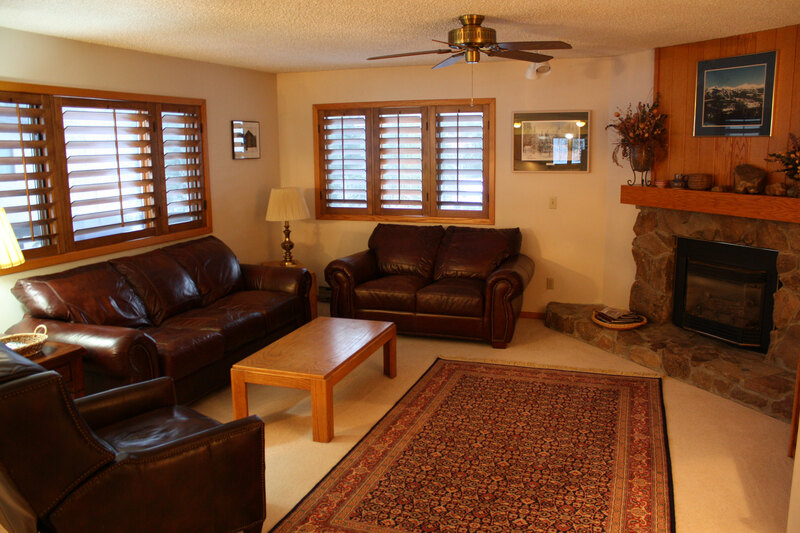 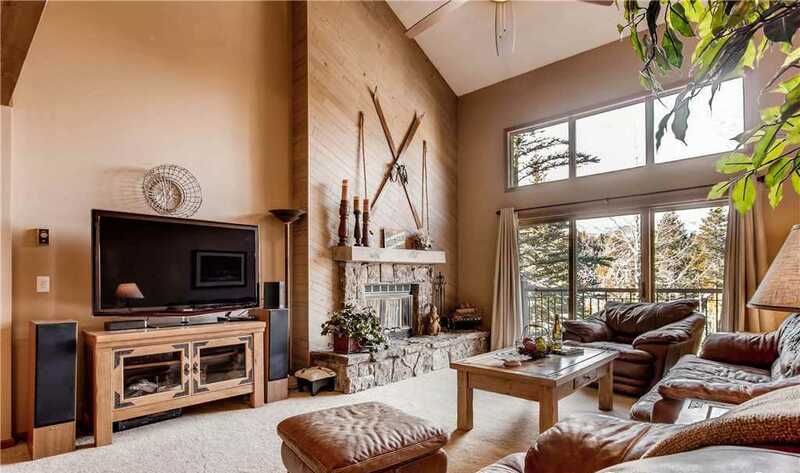 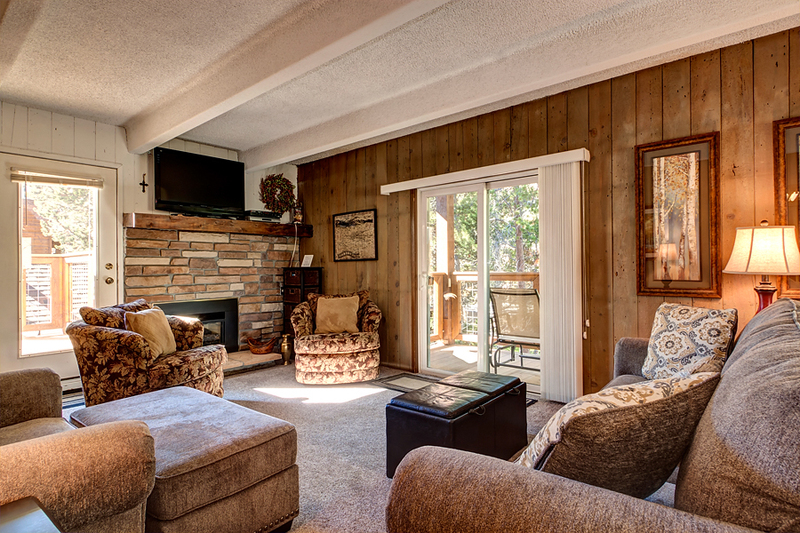 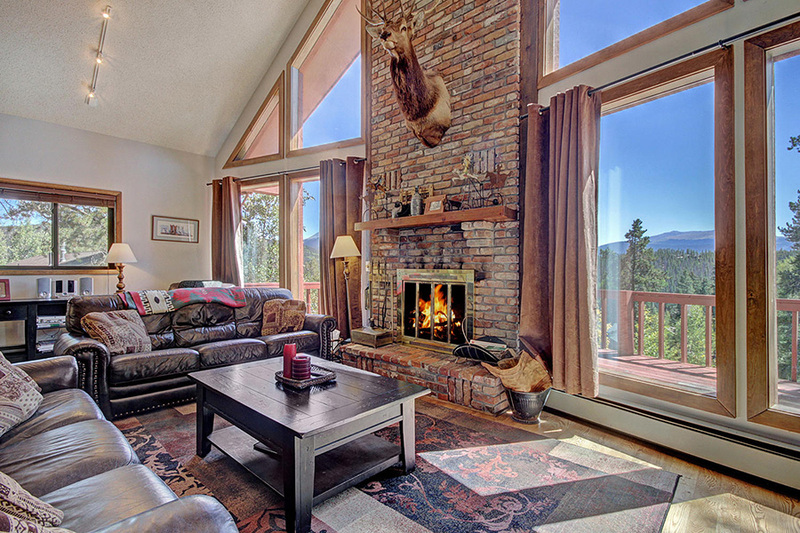 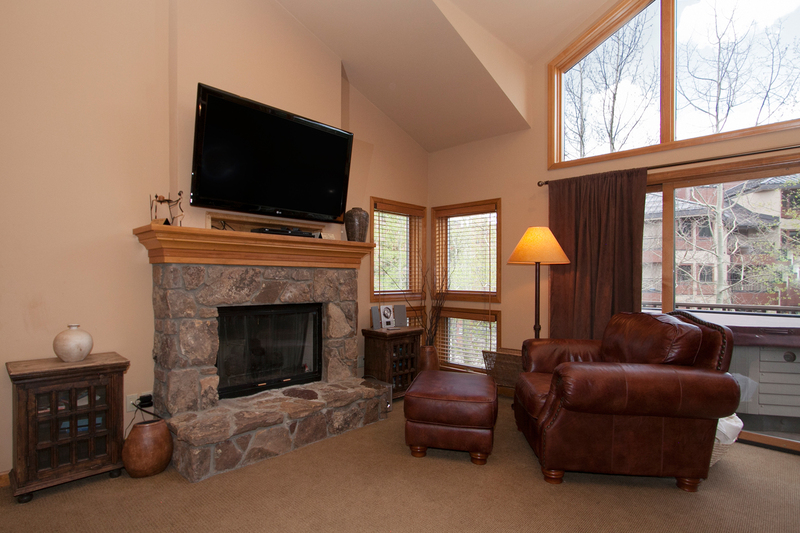 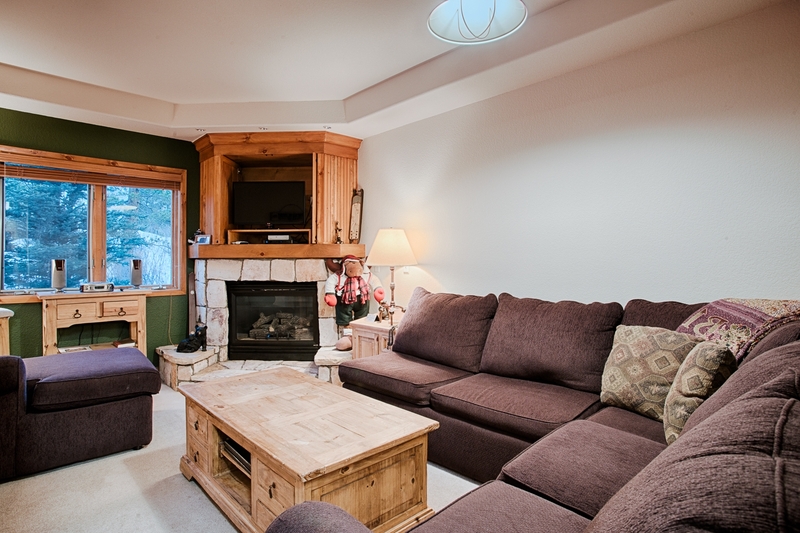 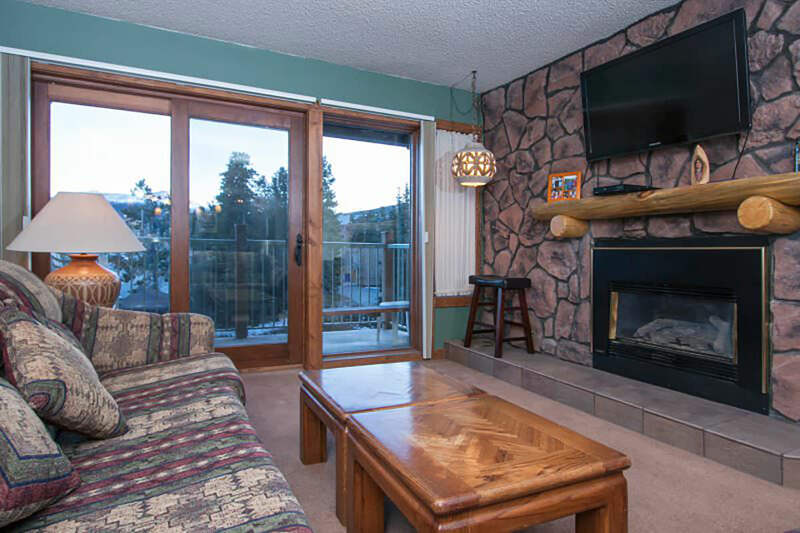 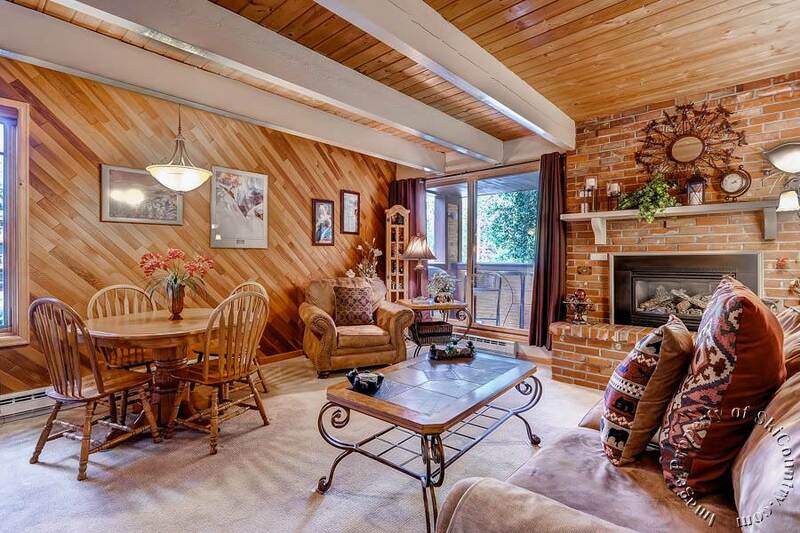 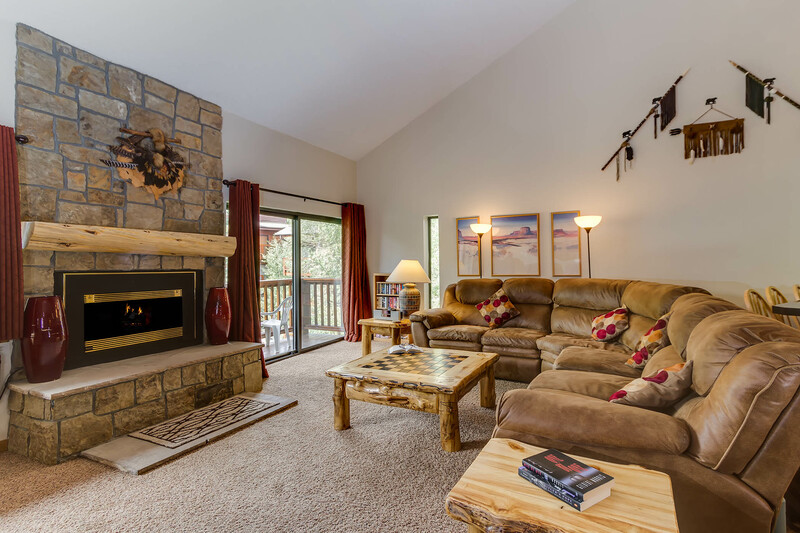 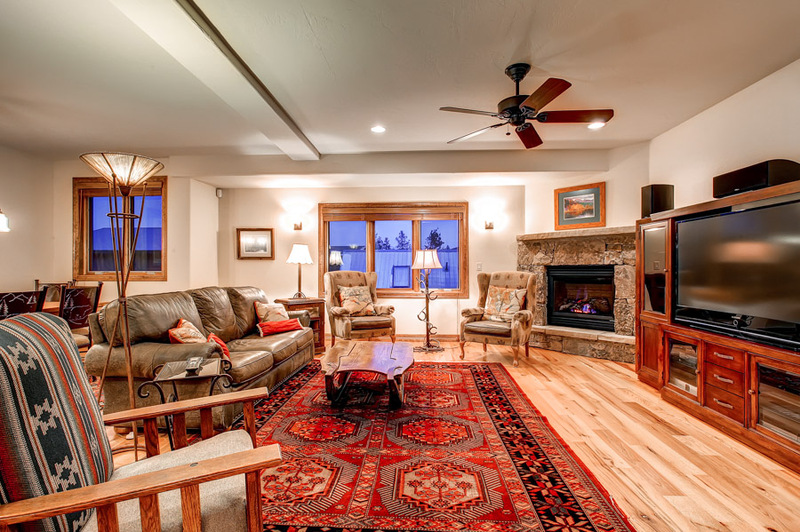 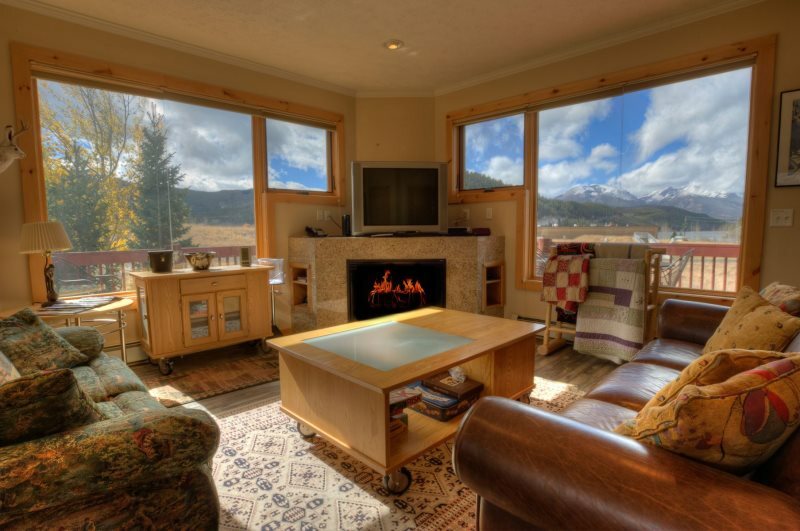 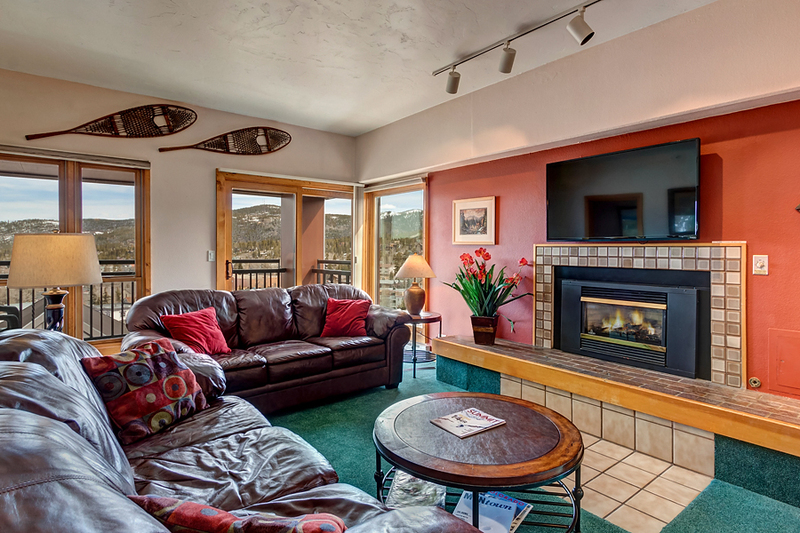 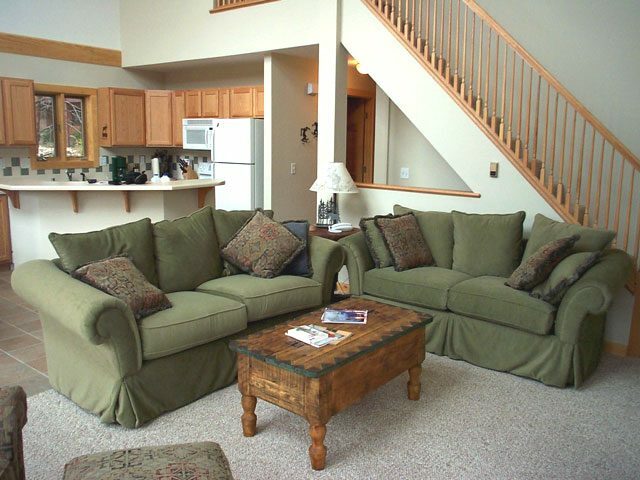 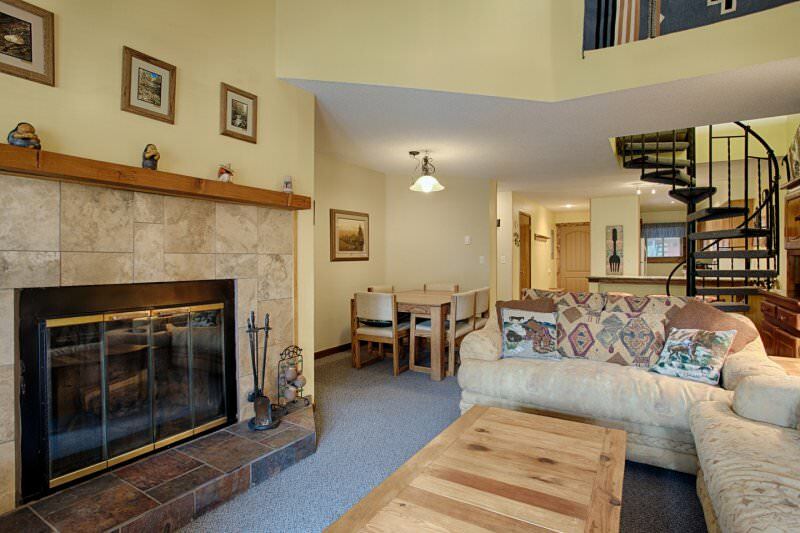 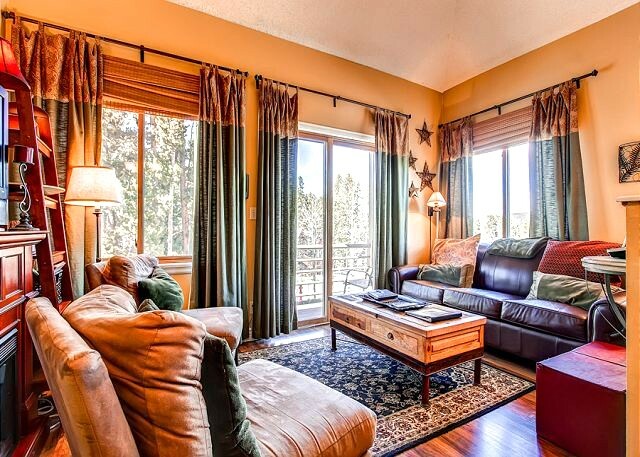 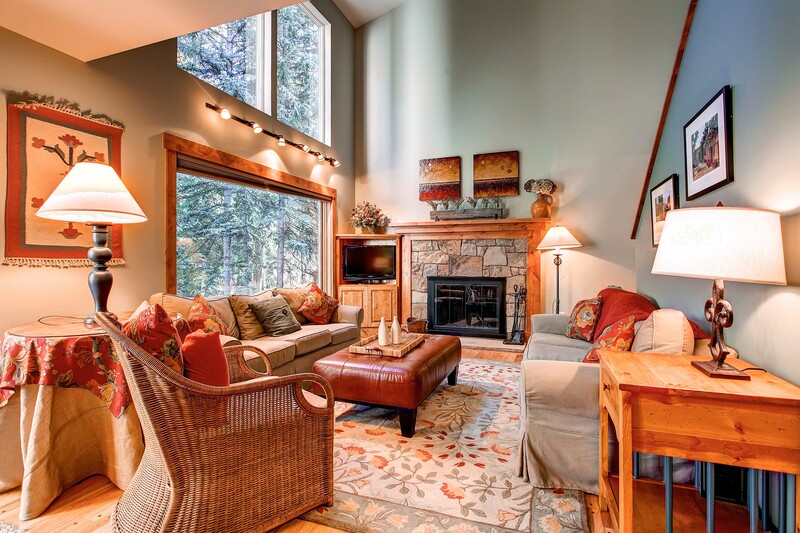 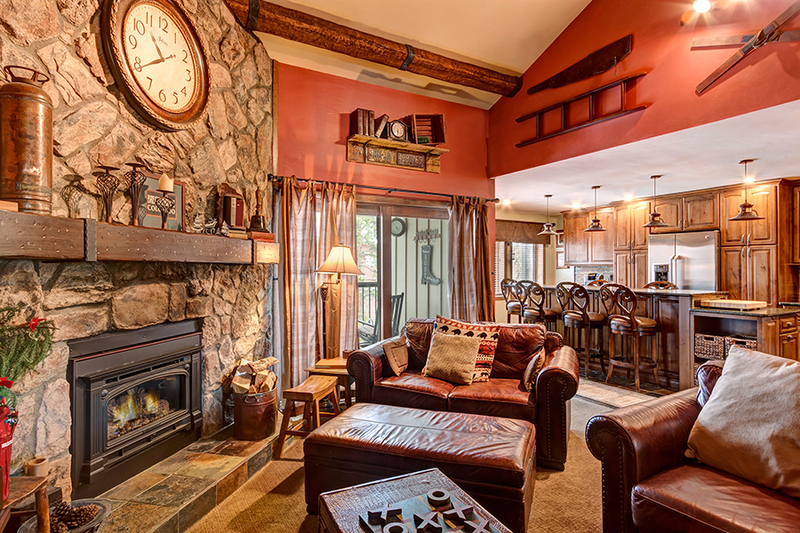 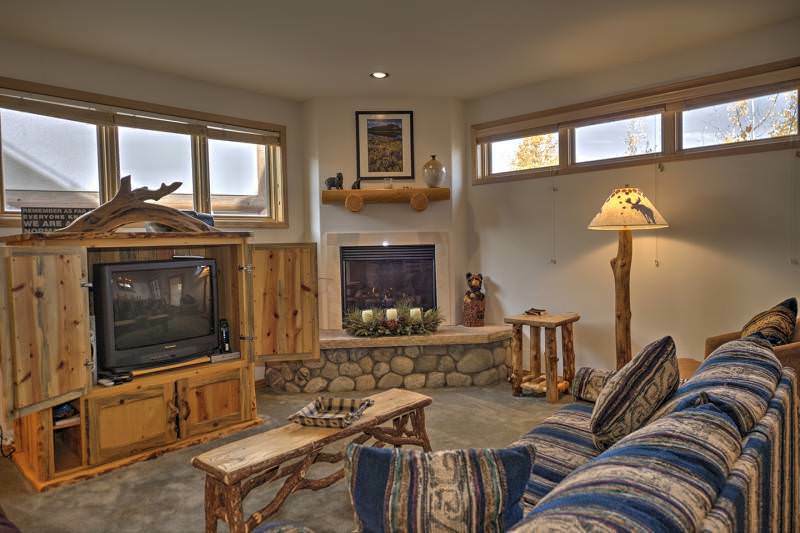 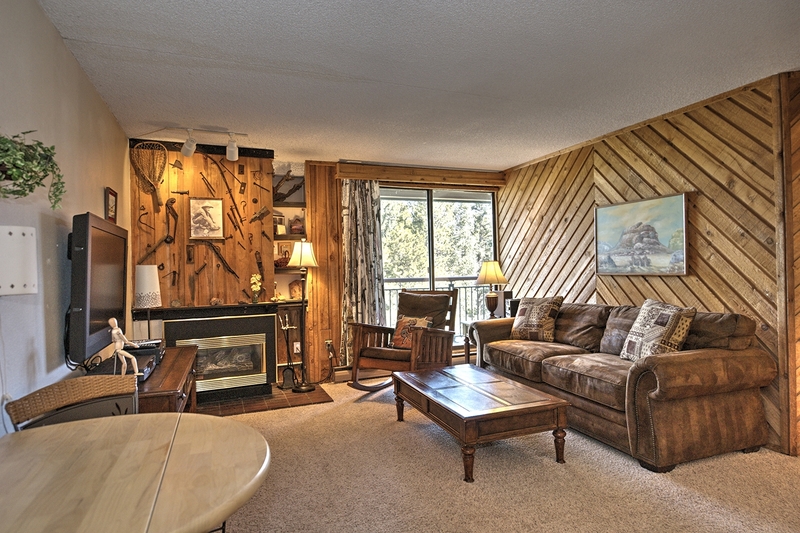 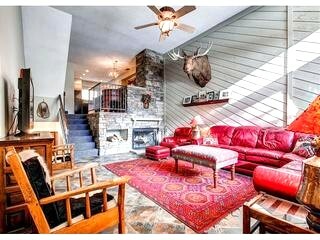 Tired skiers can relax in the living room with a fire by the fireplace or watch a movie in the evening. 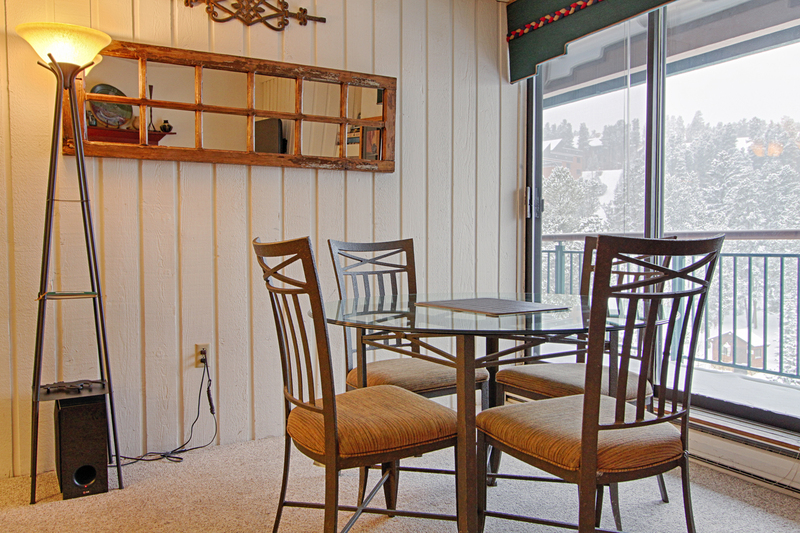 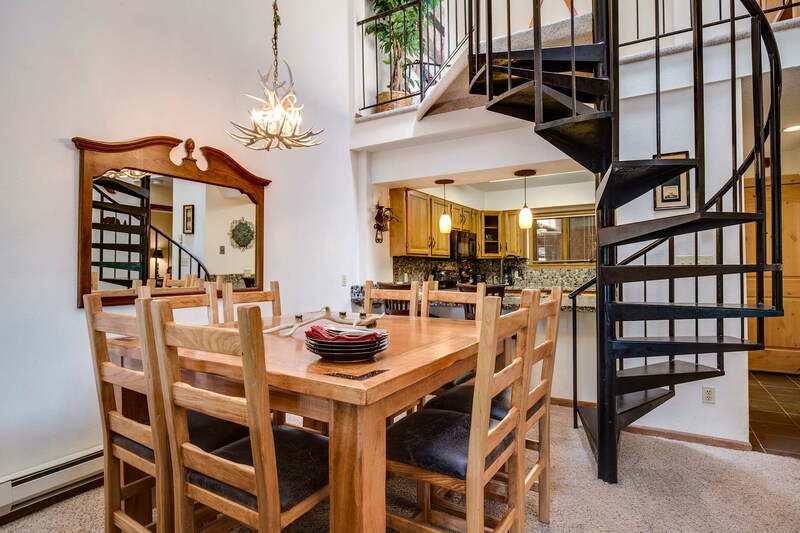 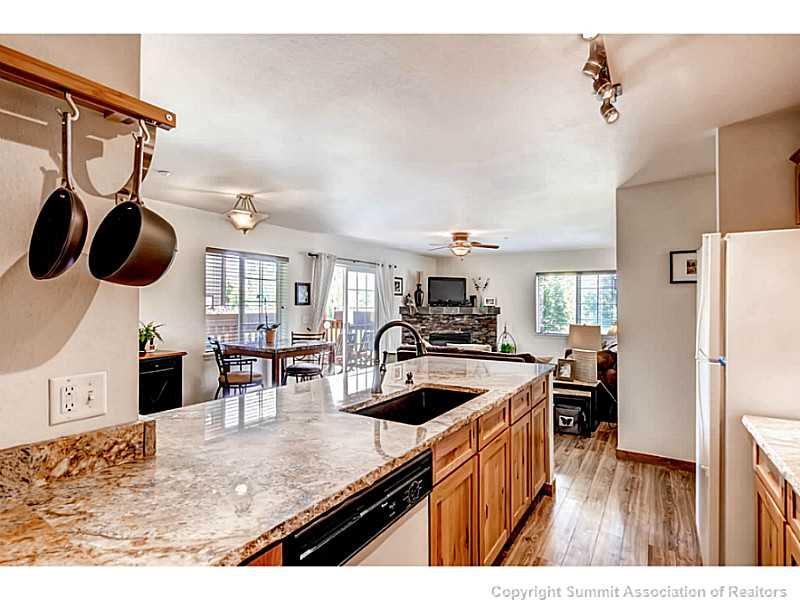 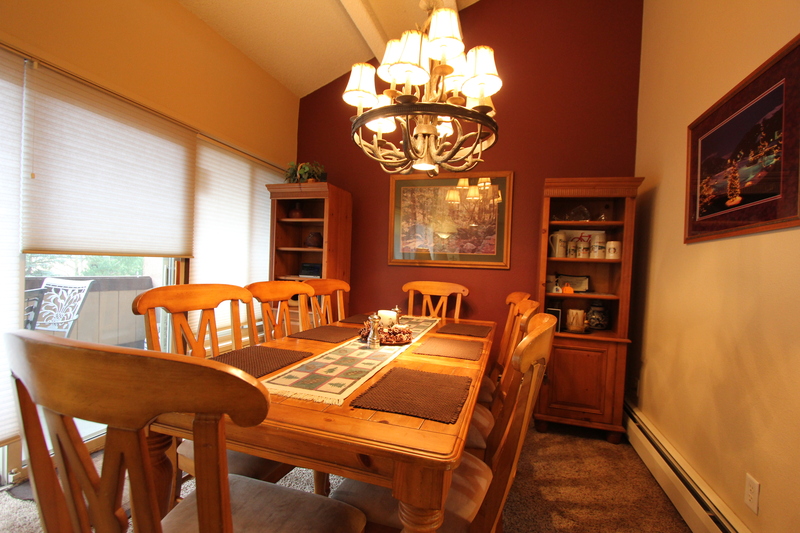 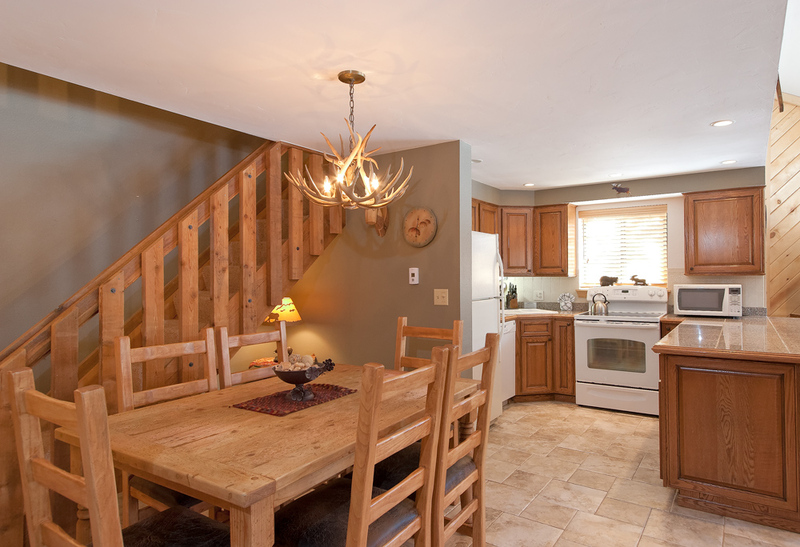 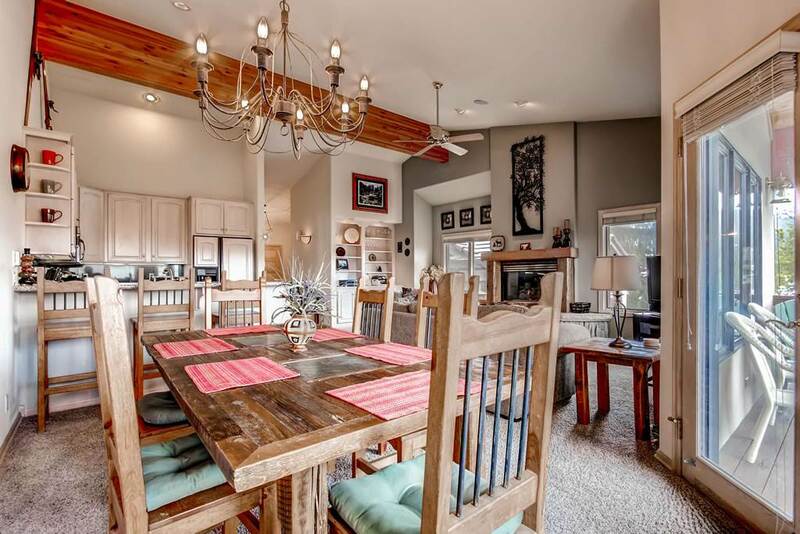 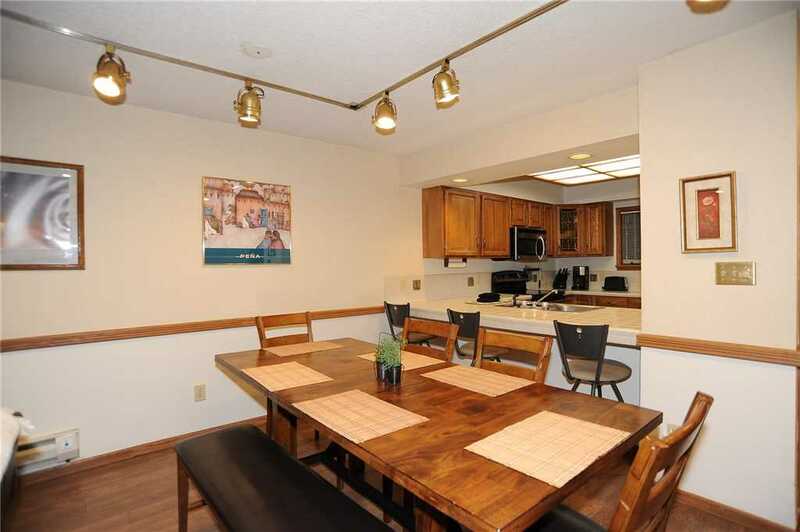 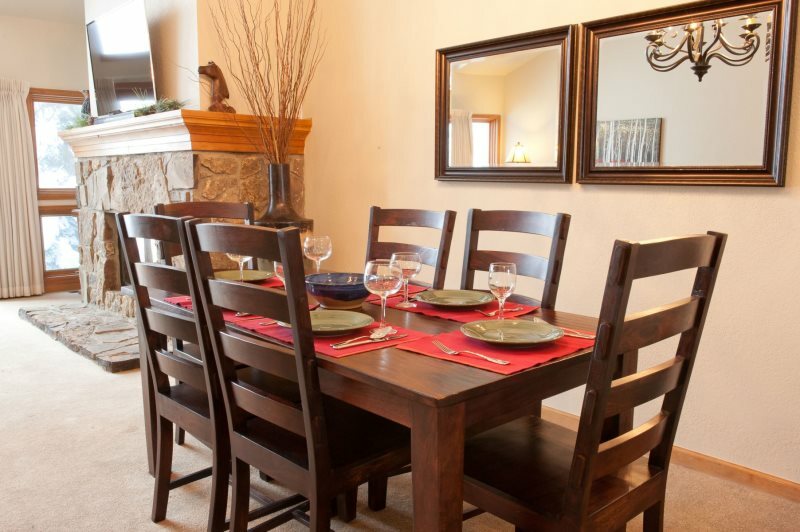 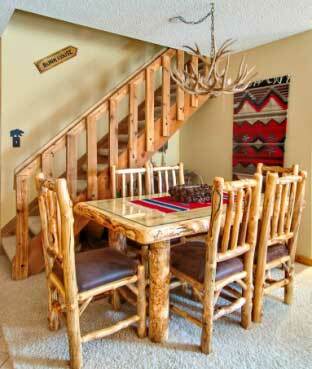 Step onto the patio to grill up some steaks on the gas grill or enjoy the views in the comfort of the patio chairs. 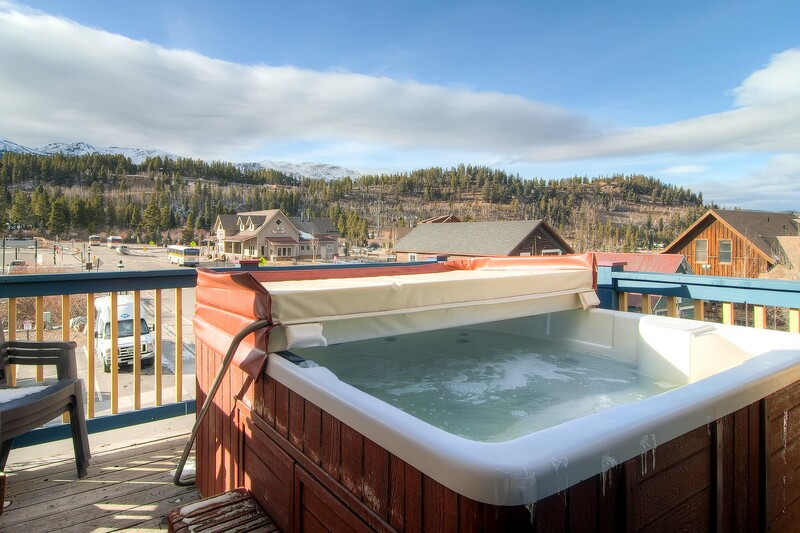 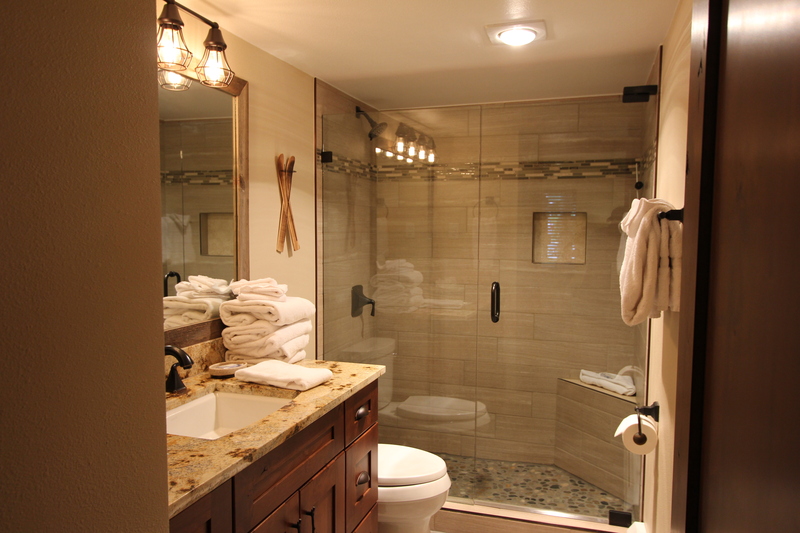 When it is time to soak in the hot tub, the Park Place complex has two on-site. 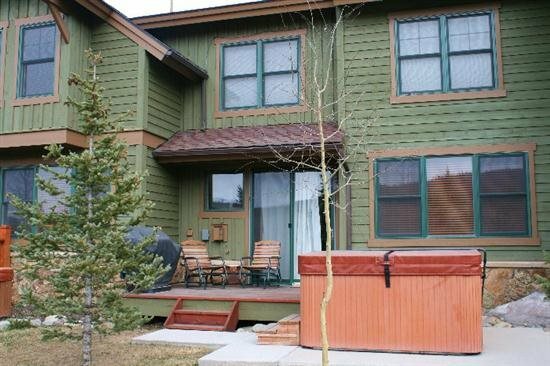 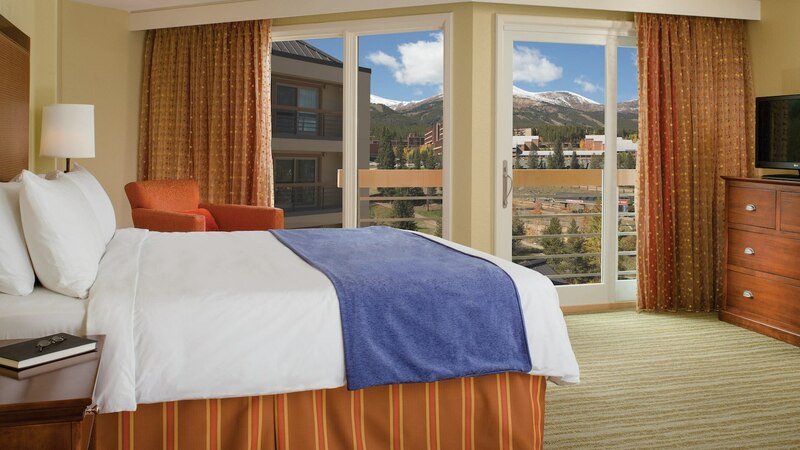 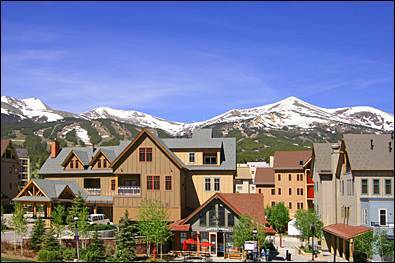 In addition, the Upper Village pool & hot tubs (off-site/seasonal) is located just a block away.